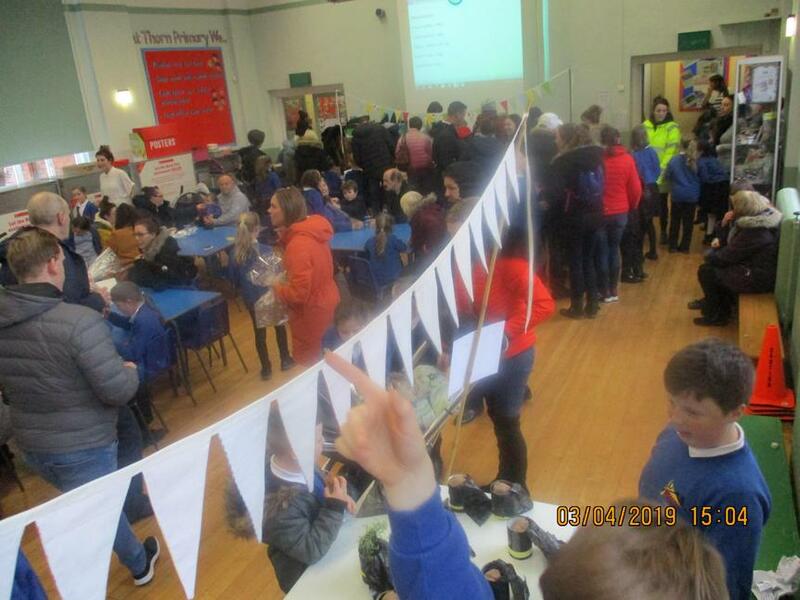 Wow what a fantastic day it was! 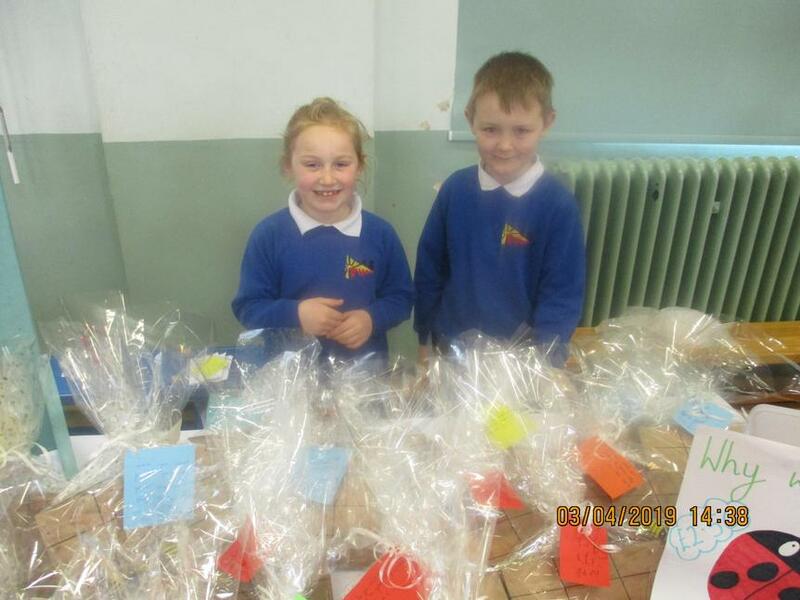 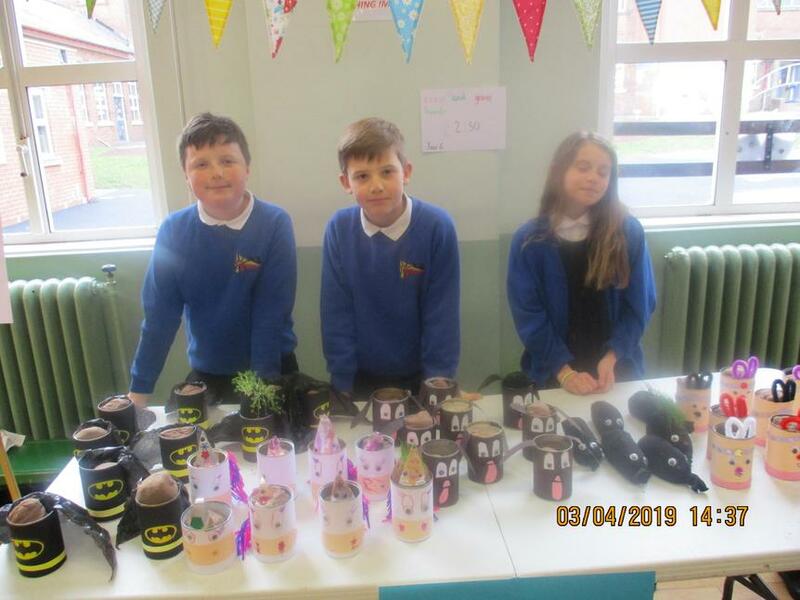 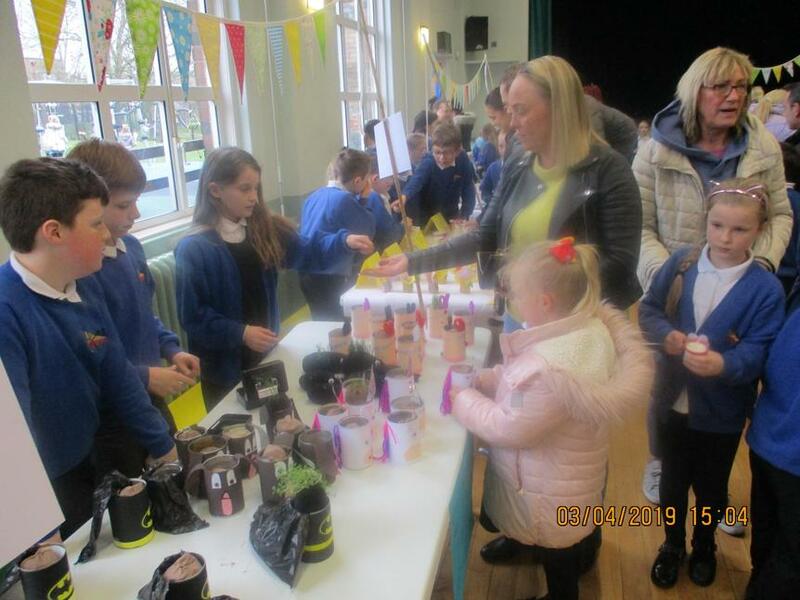 Each class worked hard to design and make their own product to sell at the craft fair. 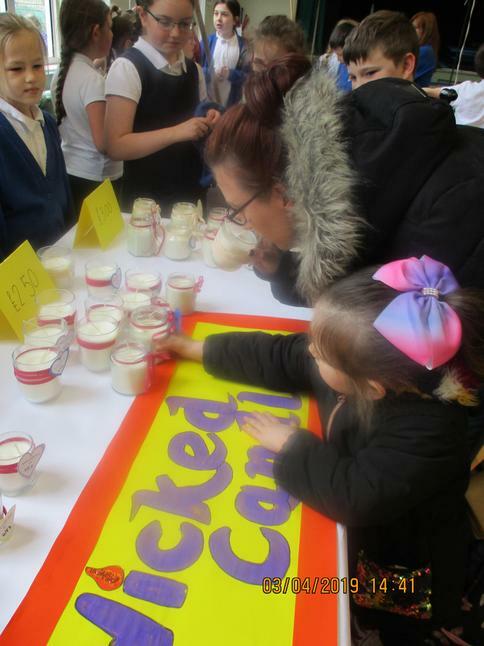 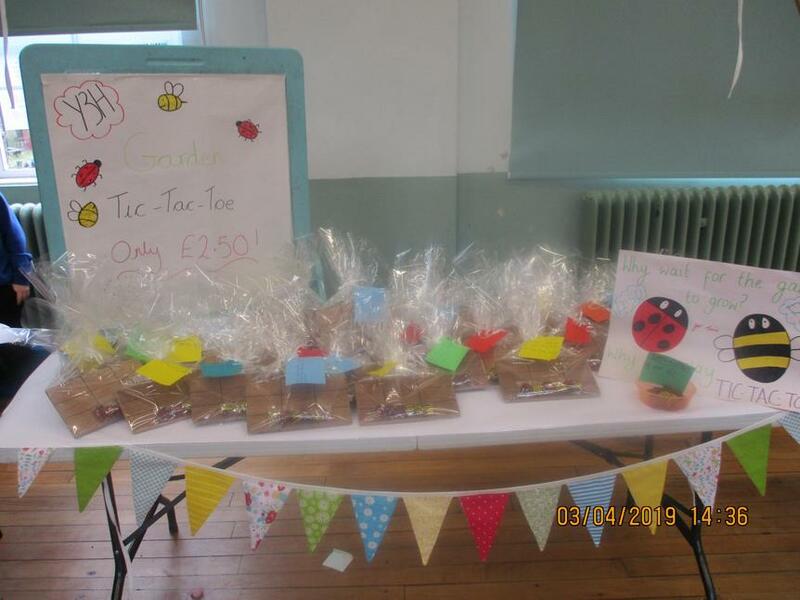 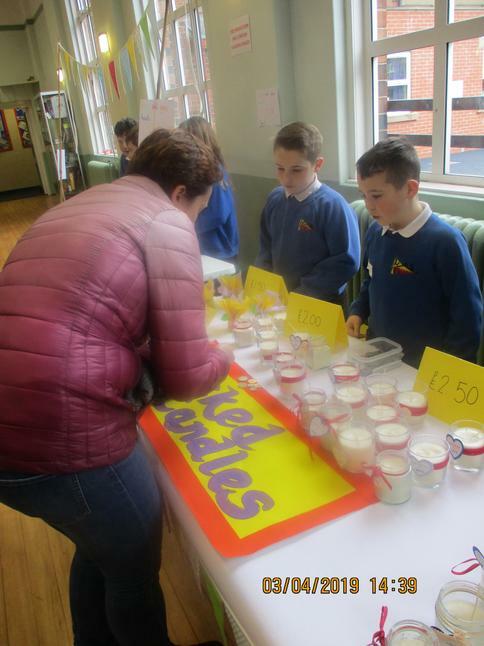 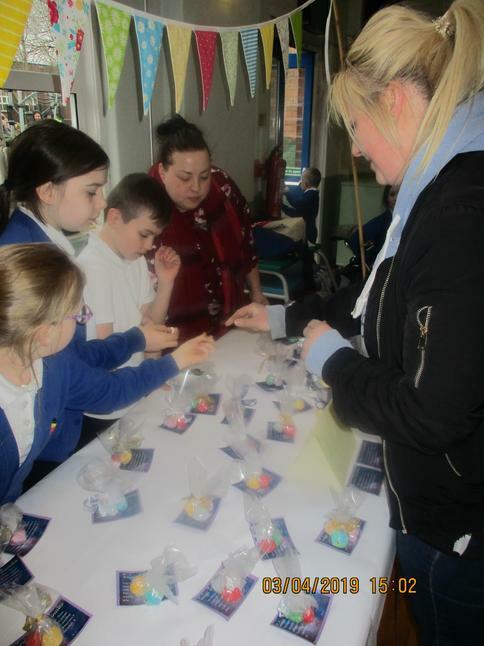 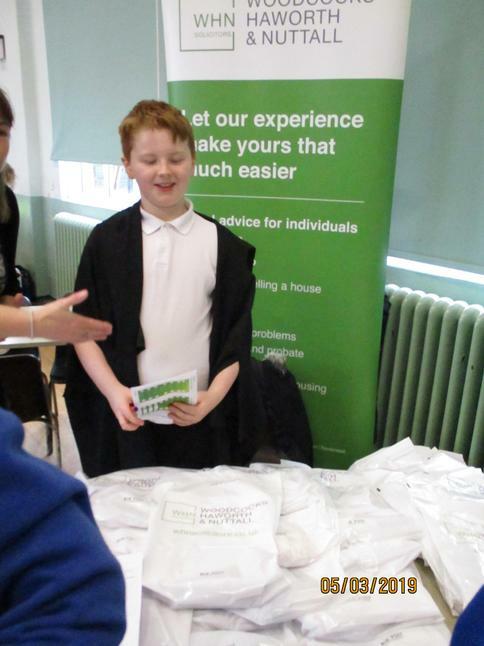 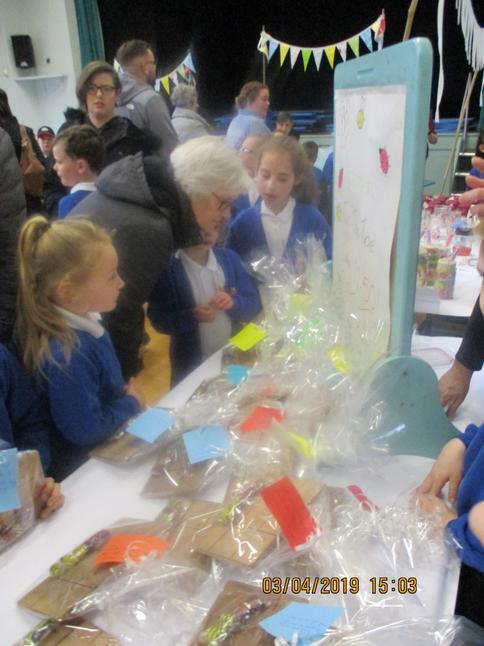 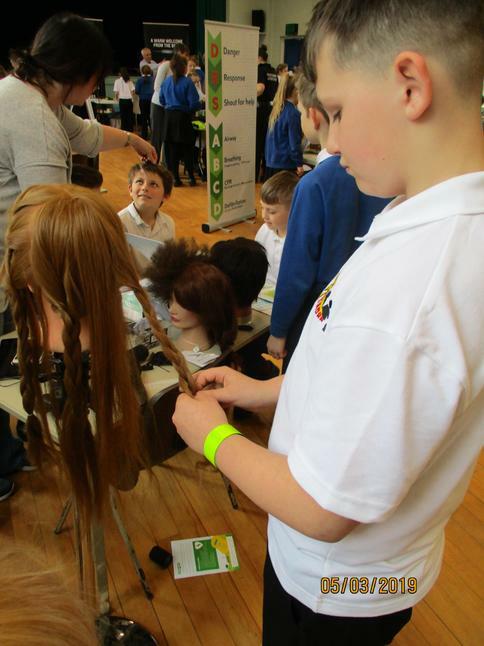 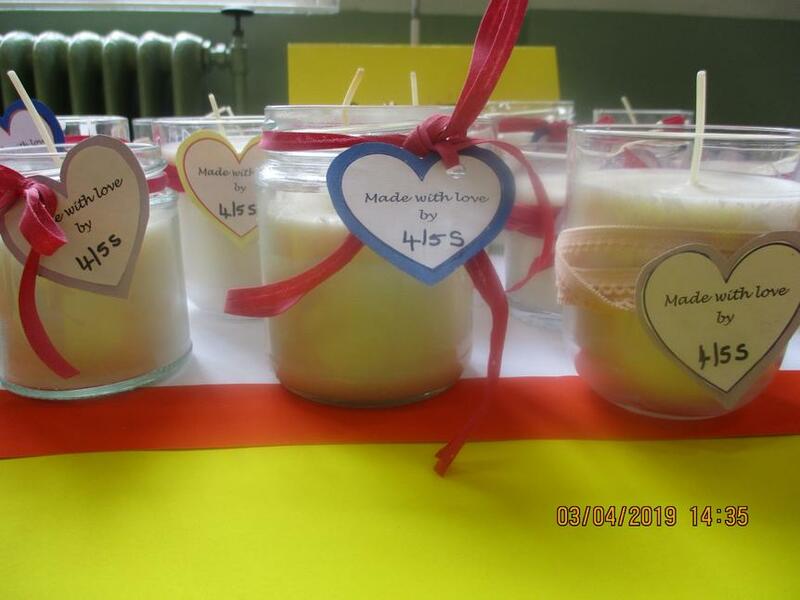 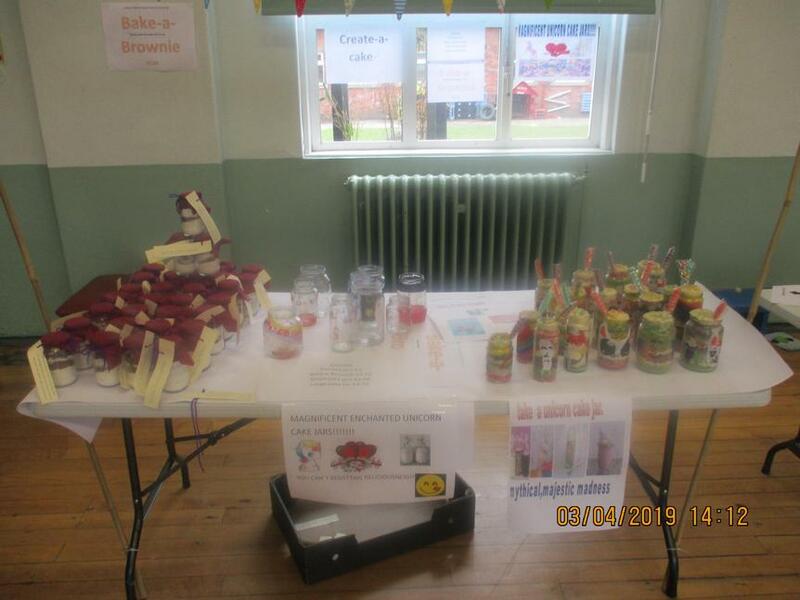 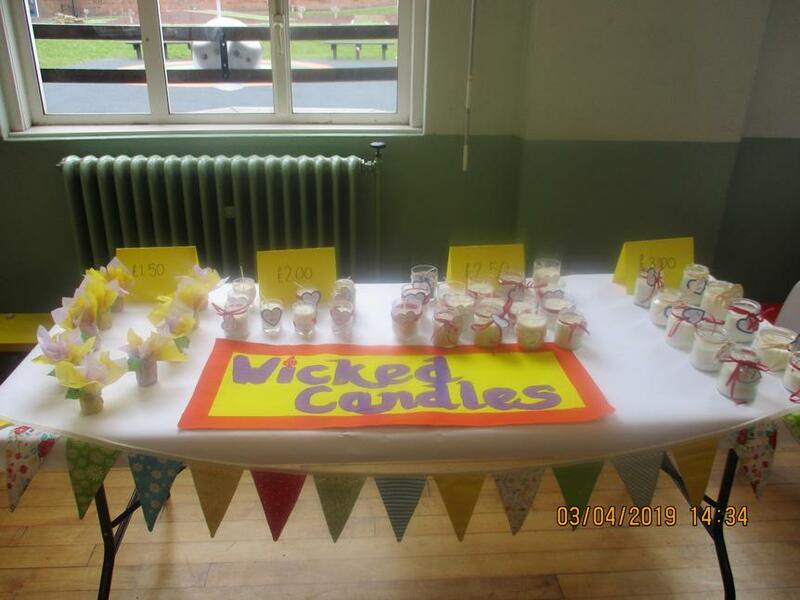 All the products were of great quality, so much so, nearly every stall was a sell out! 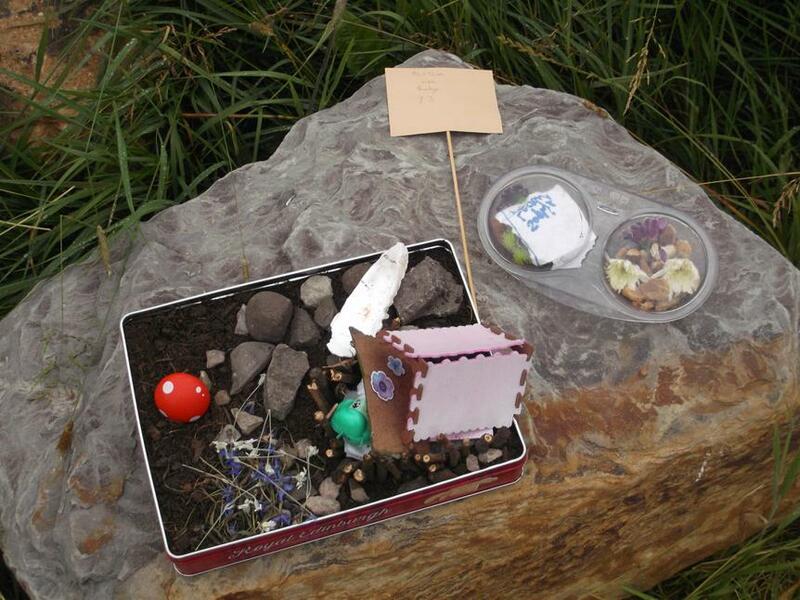 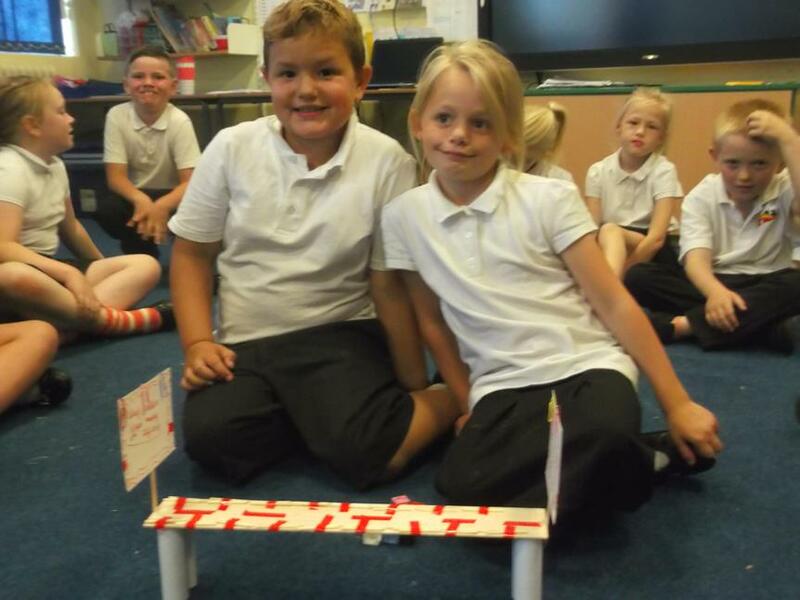 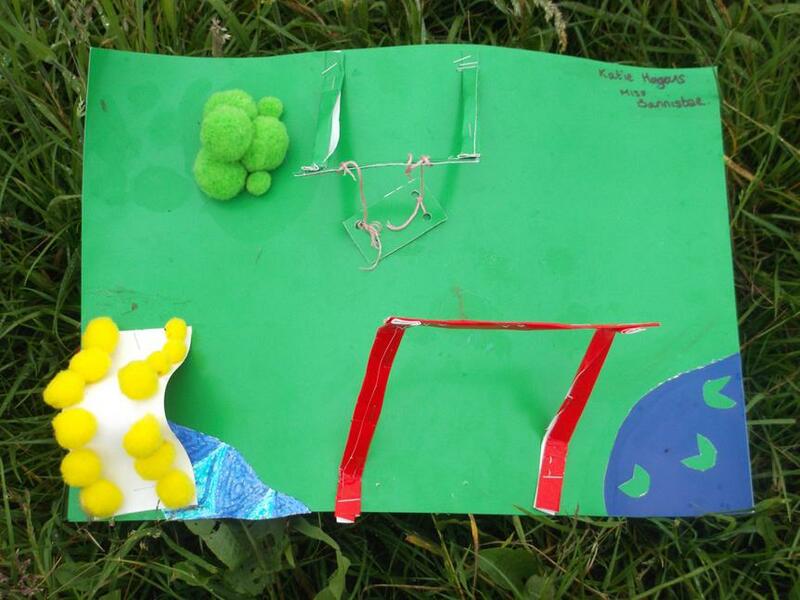 Year 3 made handmade board games from recycled materials. 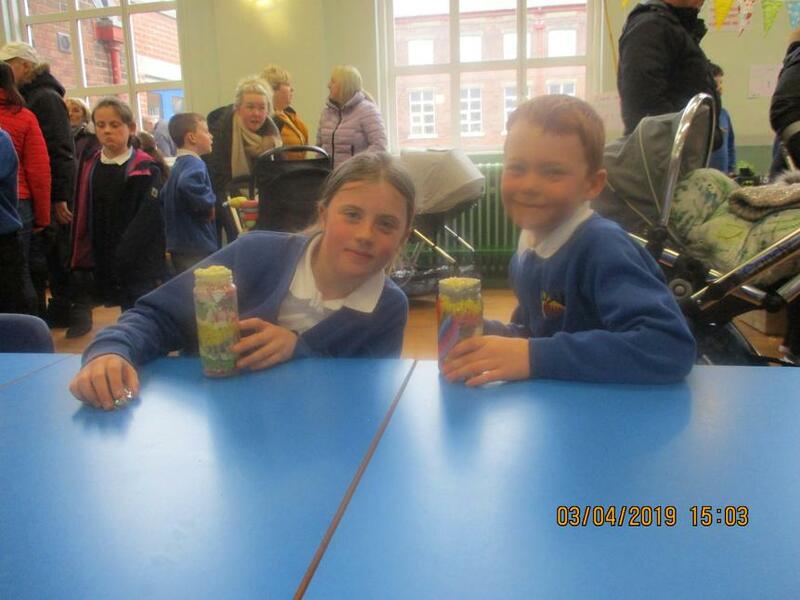 Year 3/4 made ready mix brownie jars and Unicorn cake jars. 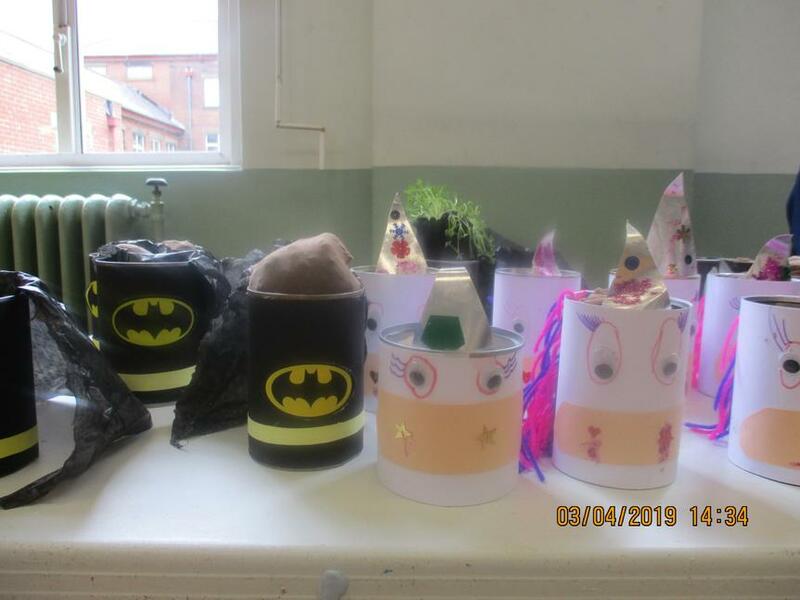 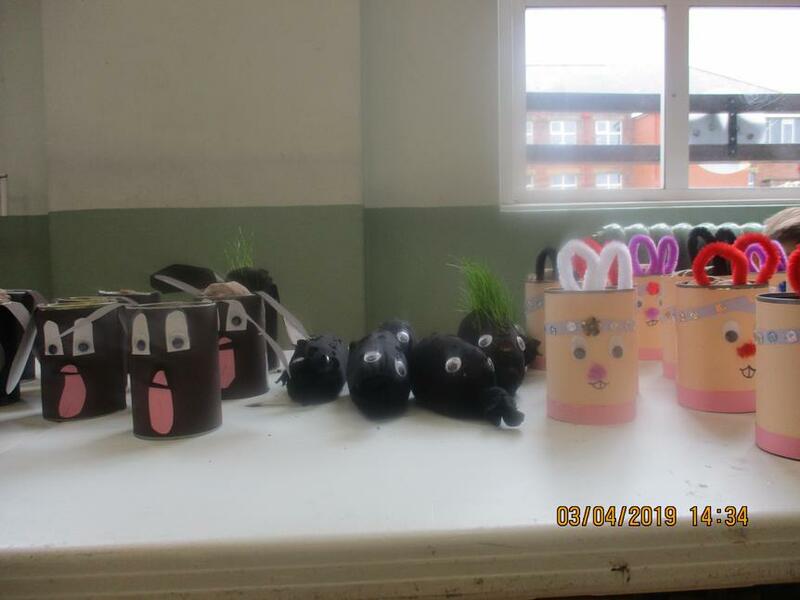 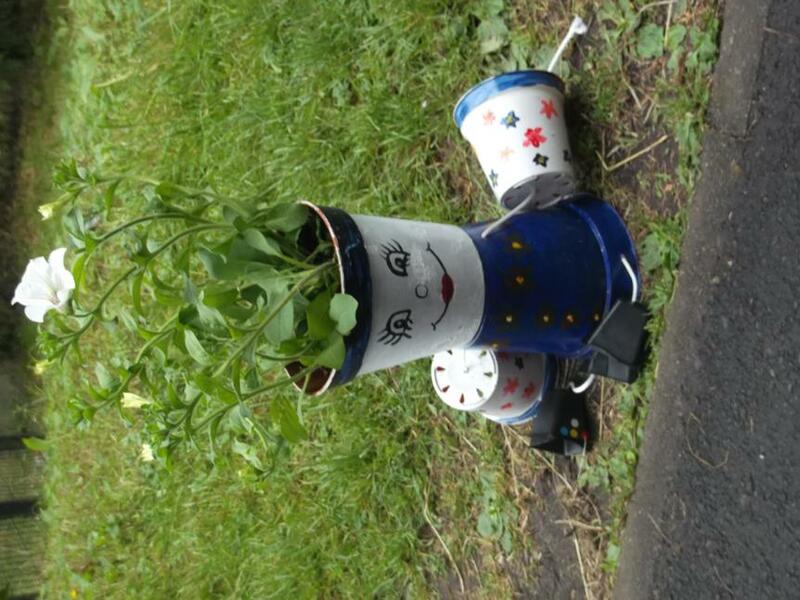 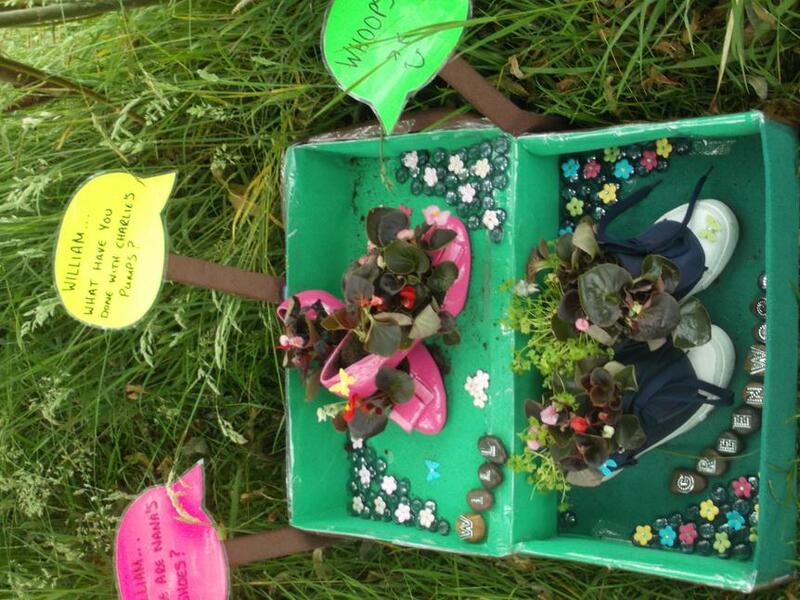 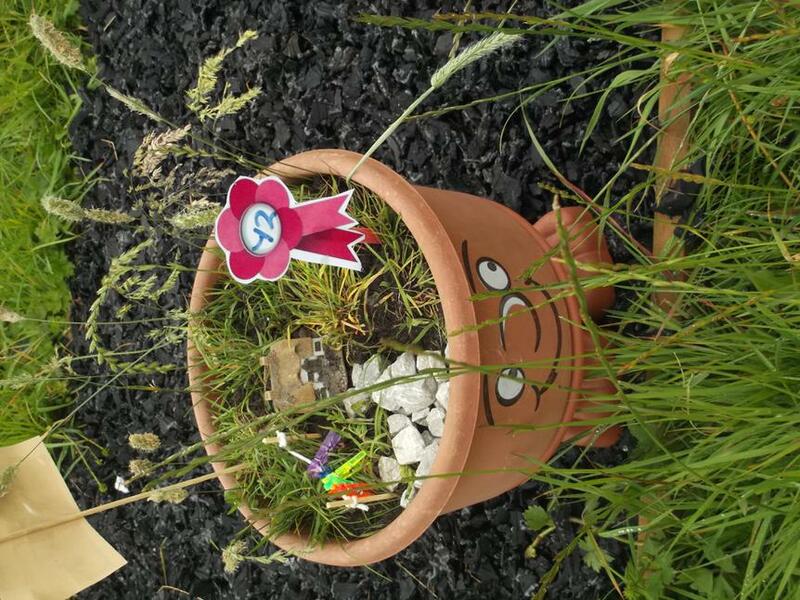 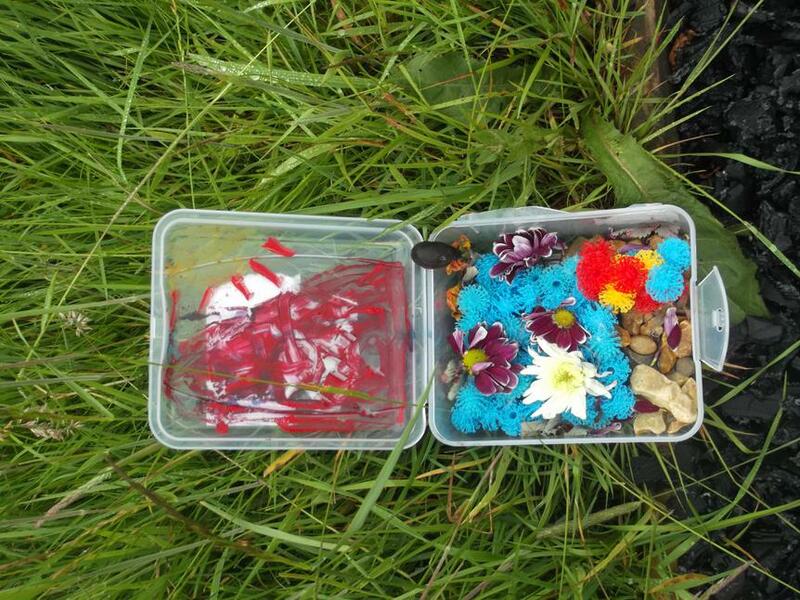 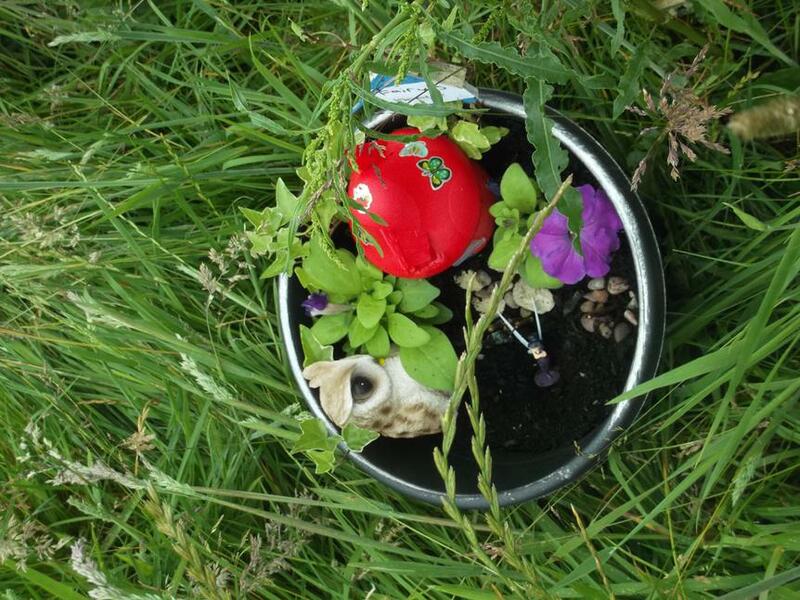 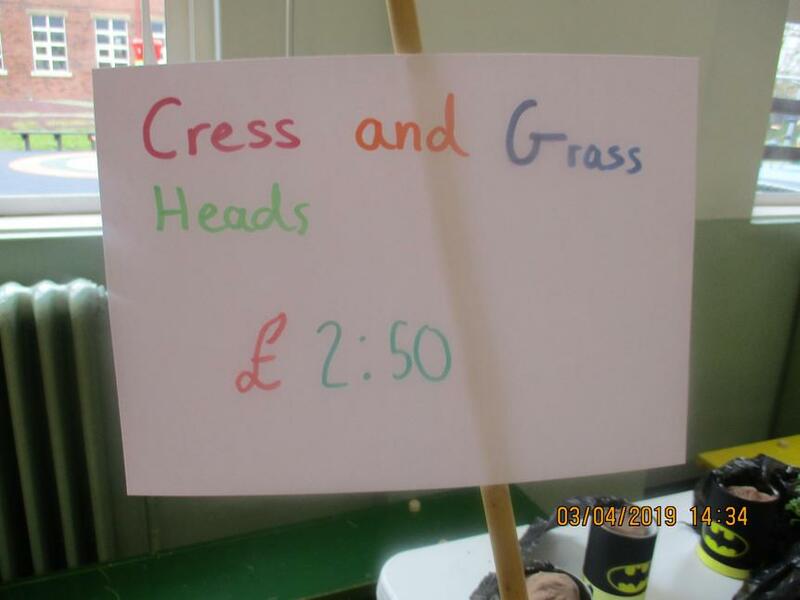 Year 6 made cress and grass heads in decorated tins. 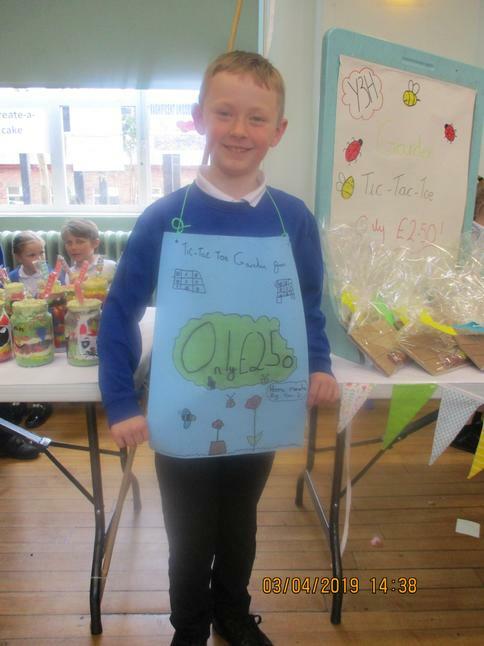 All classes made a profit and we have discovered that we most certainly have some Lord Sugars in the making!! 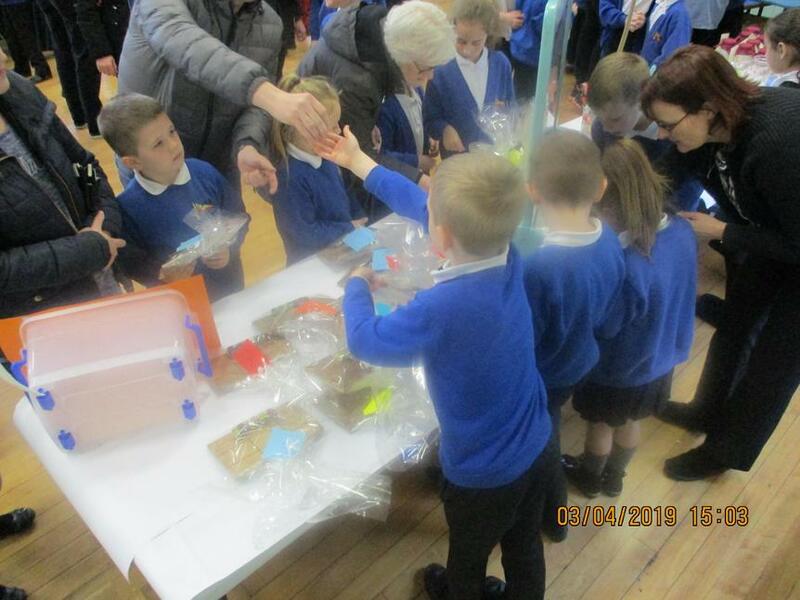 This week in school we have been learning about how to make, save and look after money. 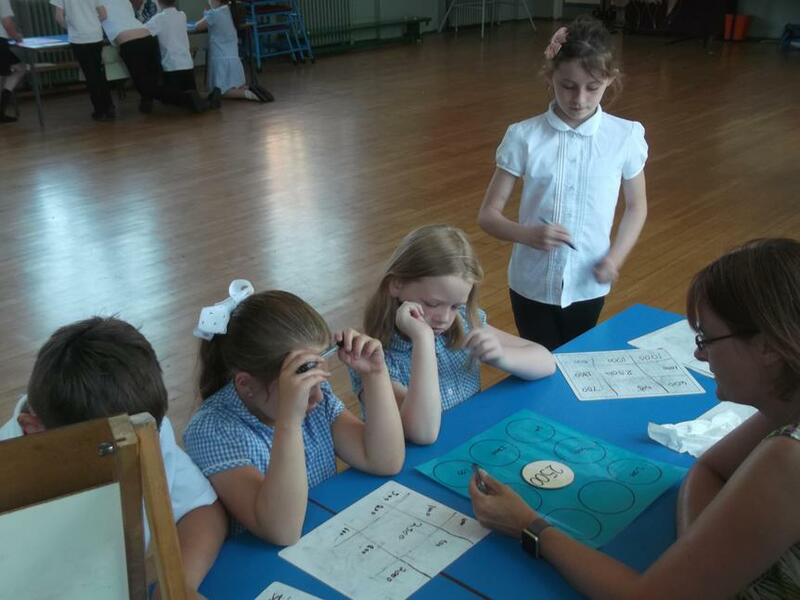 KS1 have focussed on the importance of saving. 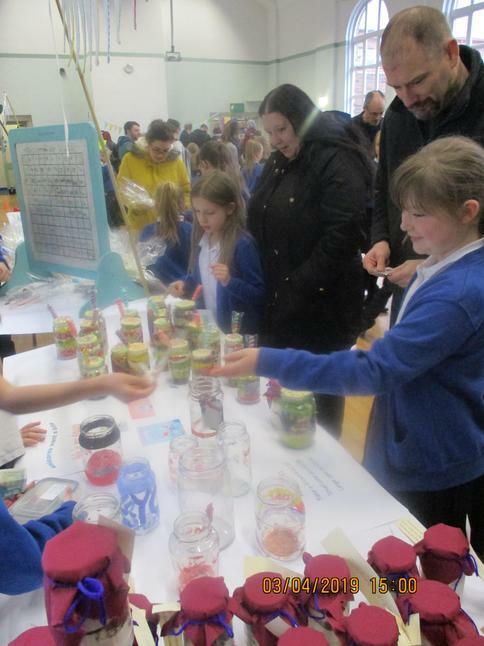 They have been challenged to save as much as they can. 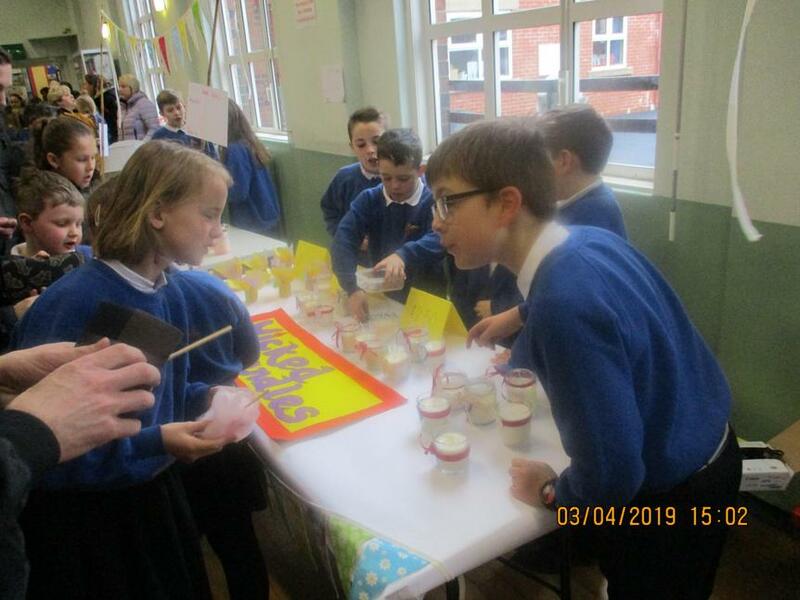 At the end of the term, all the money will be collected in and the class will be able to buy themselves something they want. 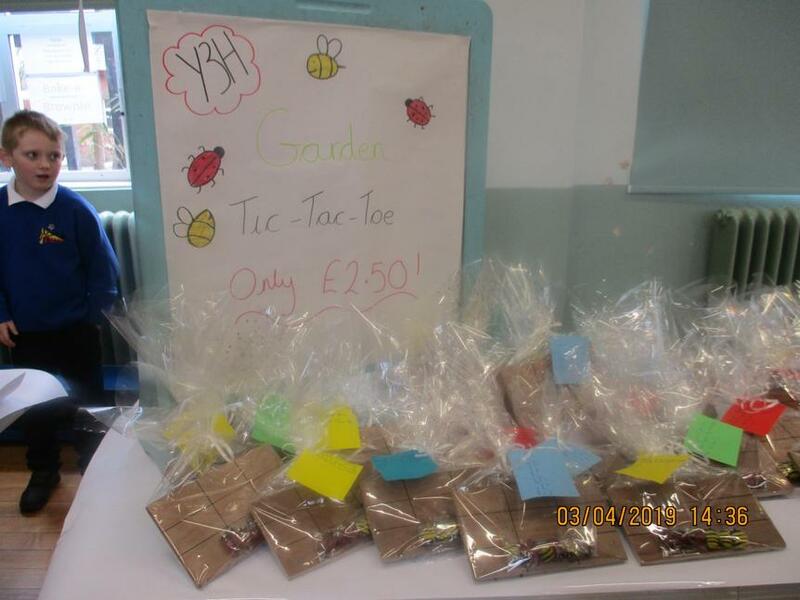 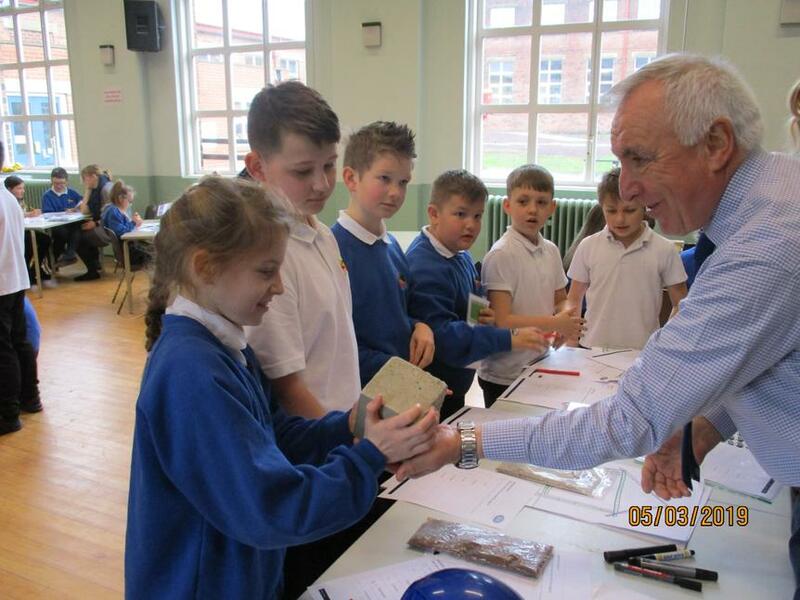 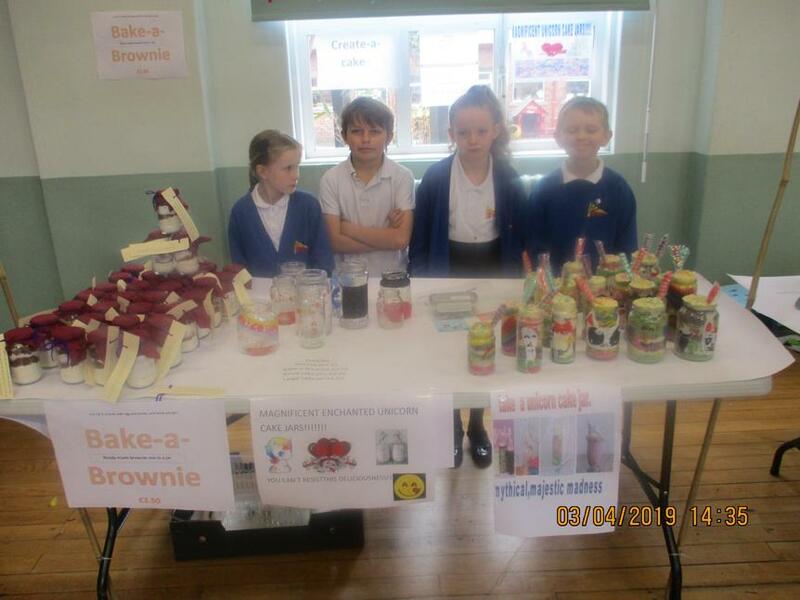 KS2 have been set a young enterprise challenge. 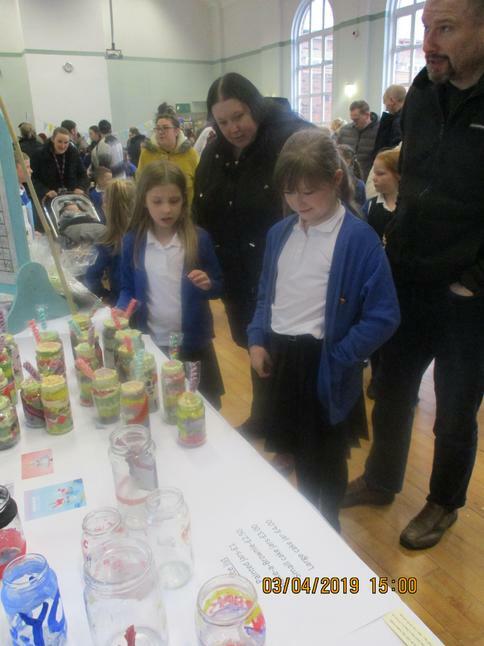 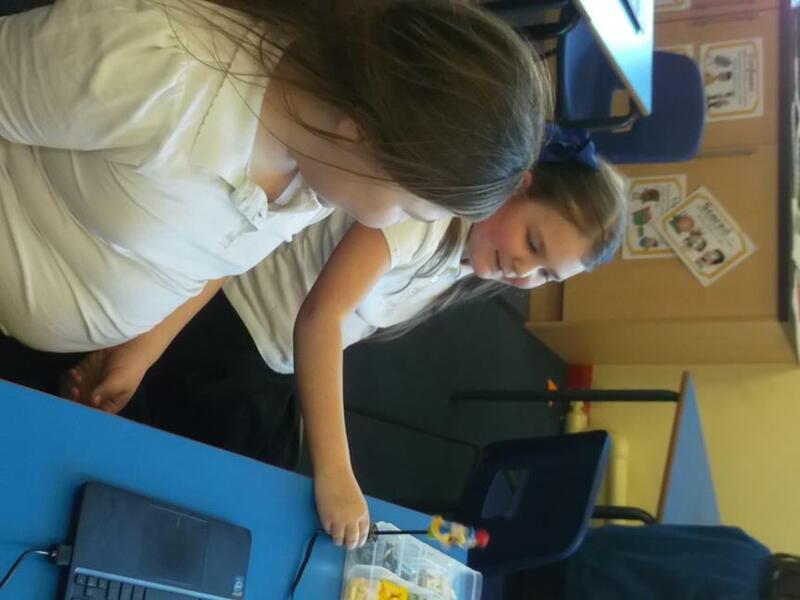 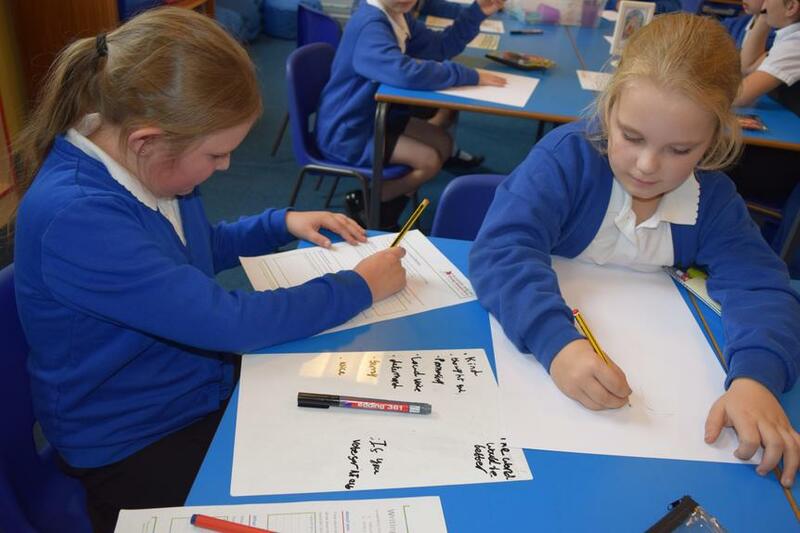 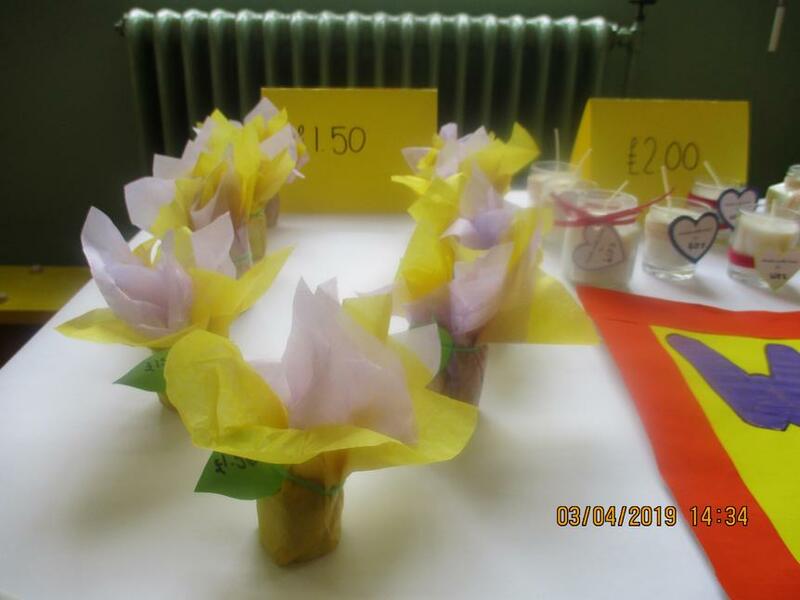 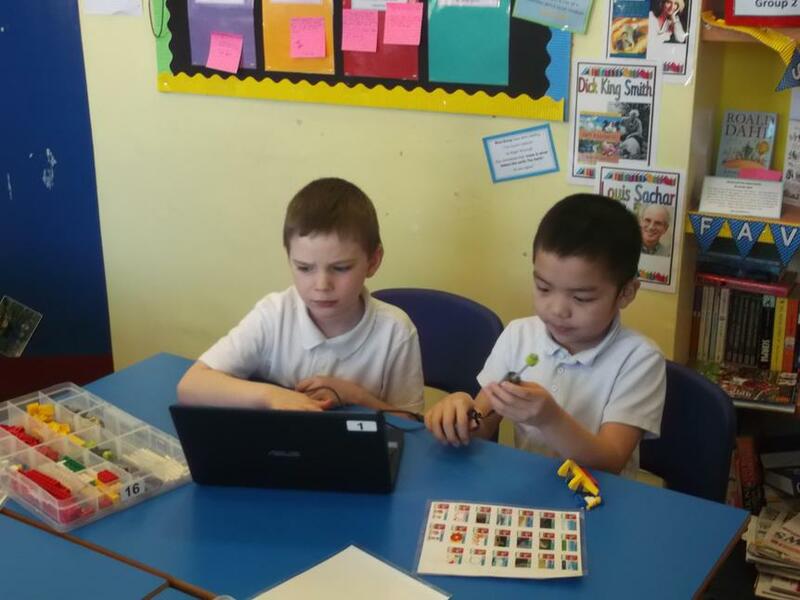 Each class has been given a budget of £50 and have to design and plan a product to be sold at our annual Spring fair. 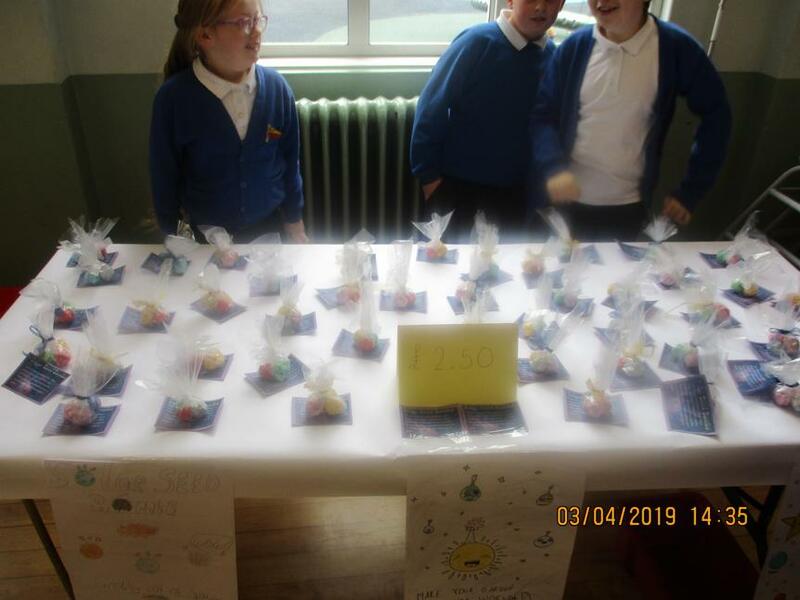 The class that makes the most profit overall will get to keep all the profit made by KS2 and use the money for whatever they wish. 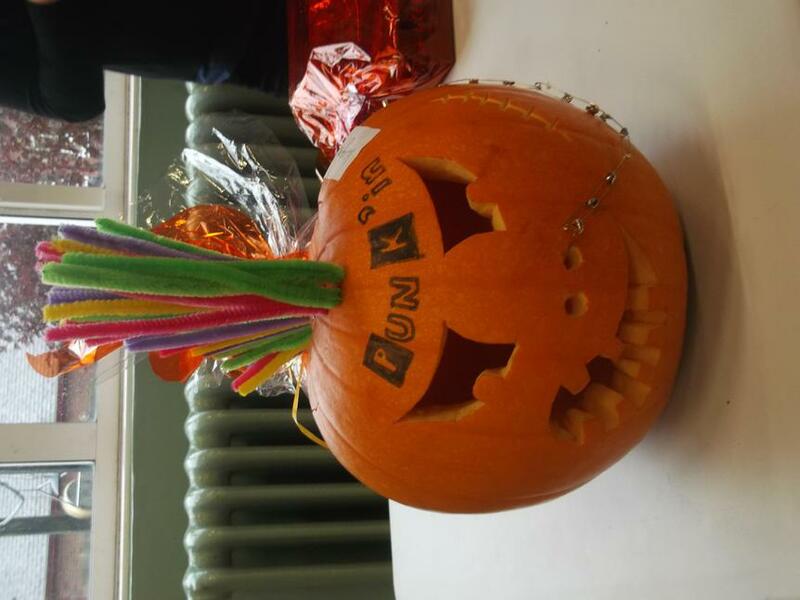 Keep a look out for the announcement of the winner. 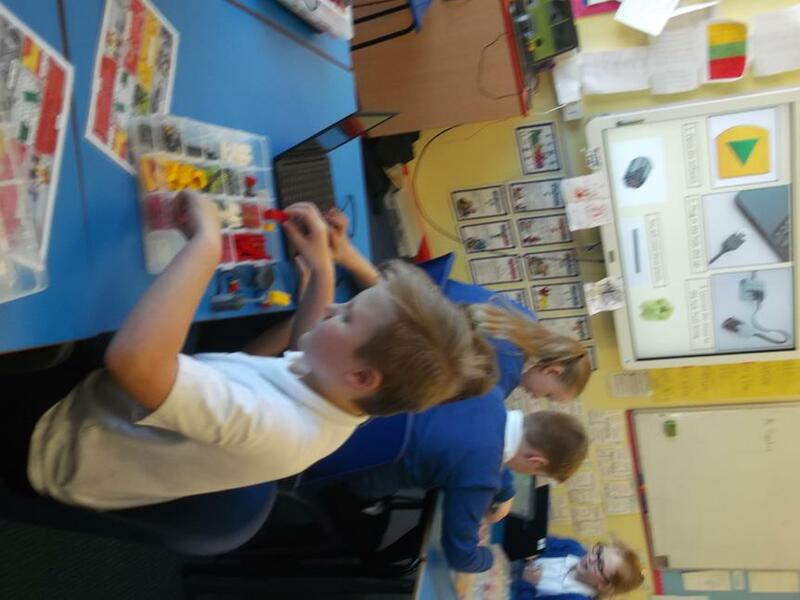 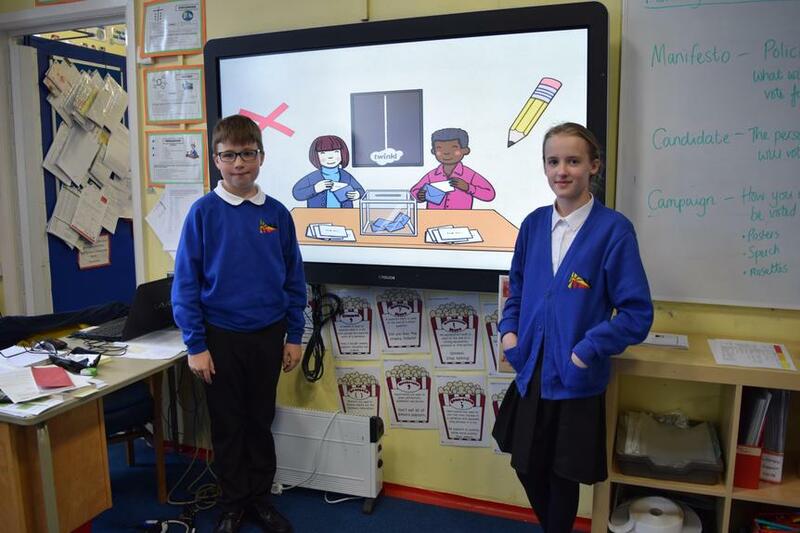 3/4T and 3H were lucky enough to have Theresa from the Bacup Credit Union come into school to discuss how they could save for themselves, they discussed interest, debt and why saving is important for their future. 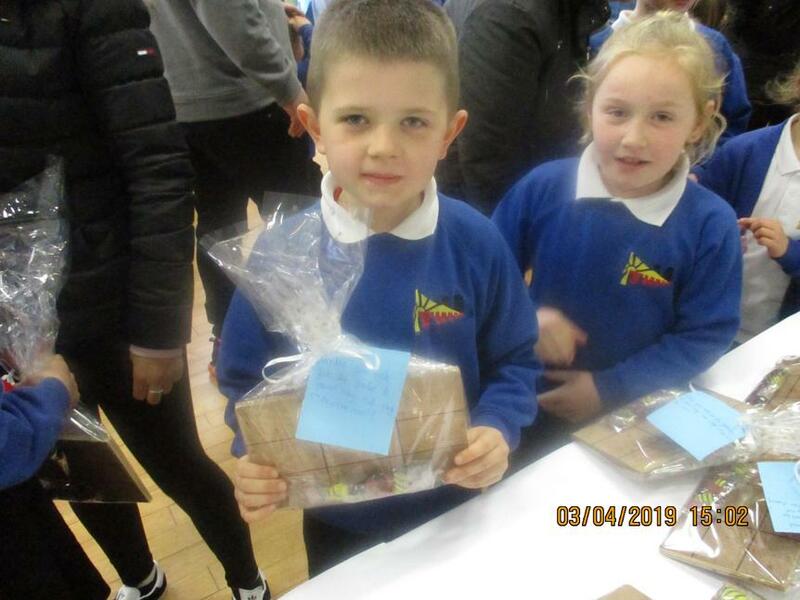 Hopefully, we will have more children join the saving scheme following this. 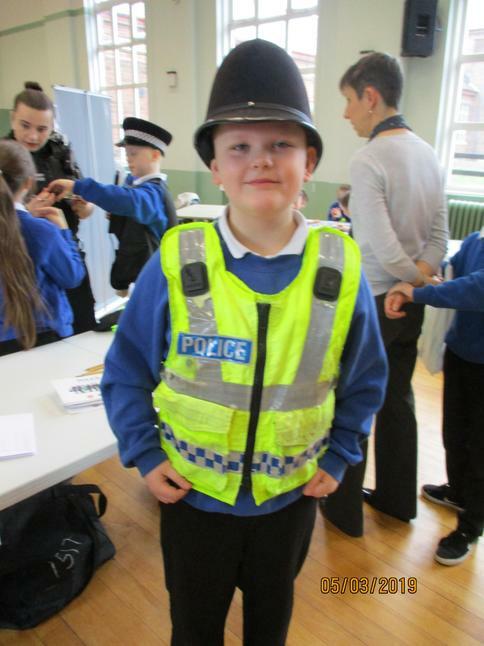 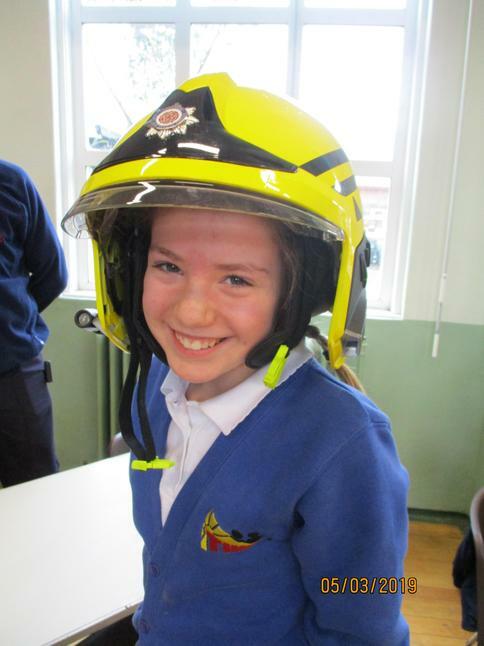 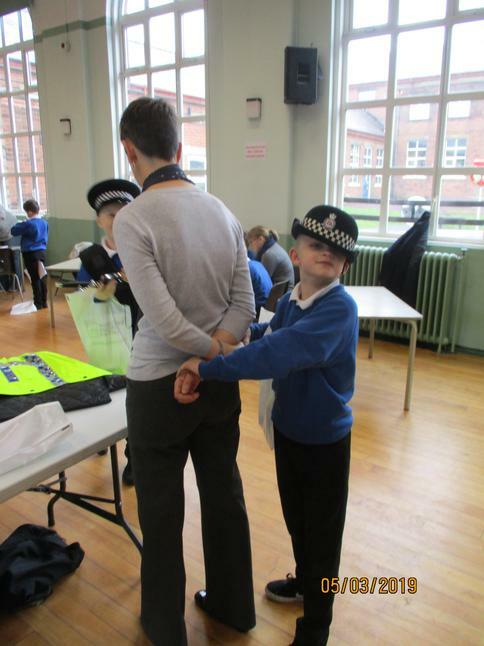 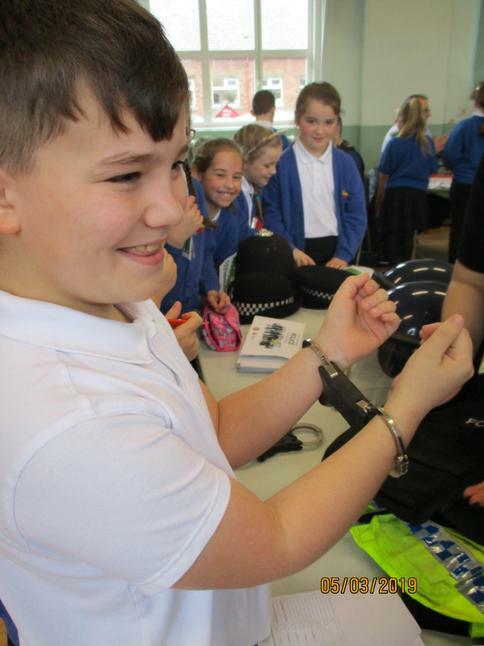 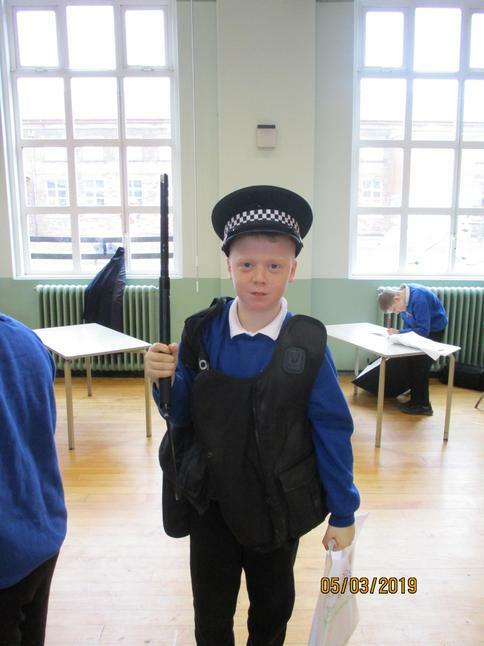 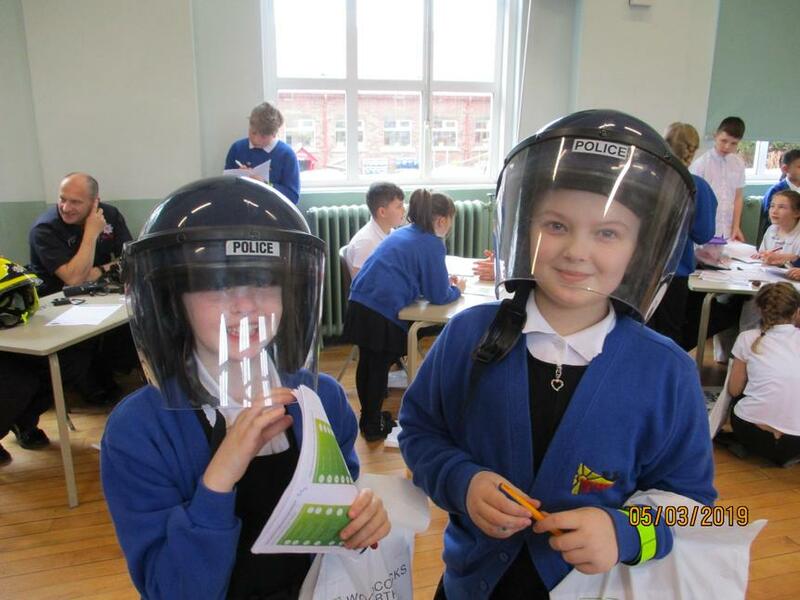 Another focus of this week has been for our children to consider what career they would like to do when they are older. 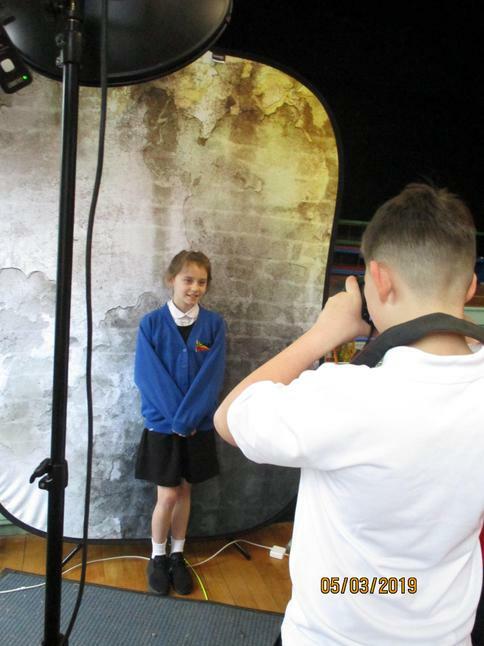 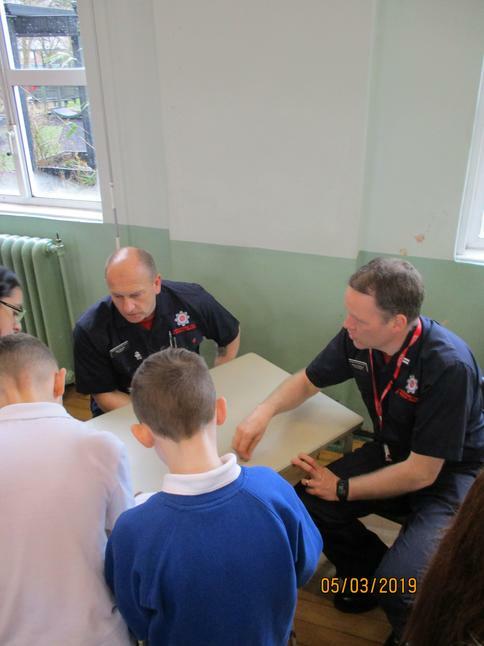 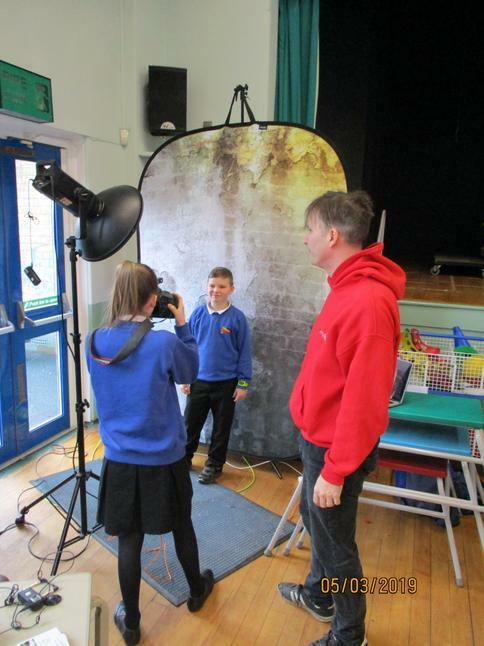 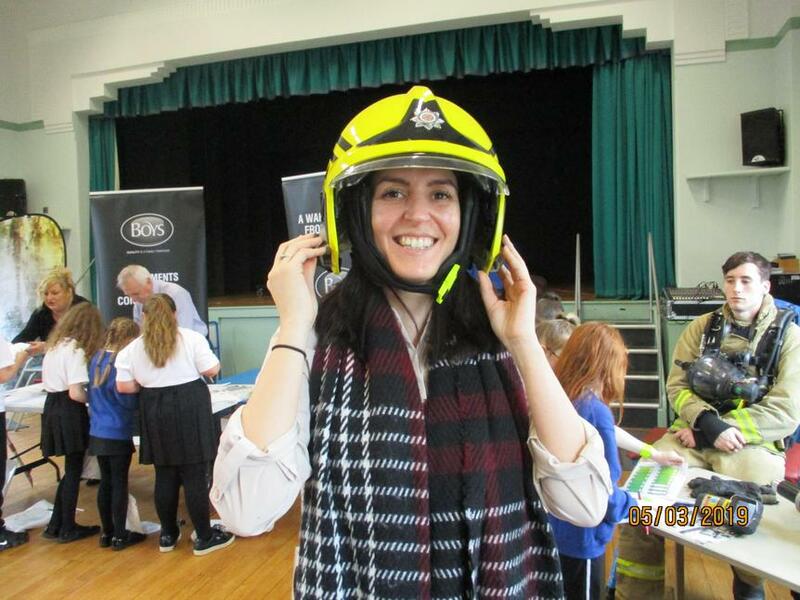 We held our annual careers convention and were lucky enough to have local business, such as photographers and the fire service, visit us and share their experiences of their job. 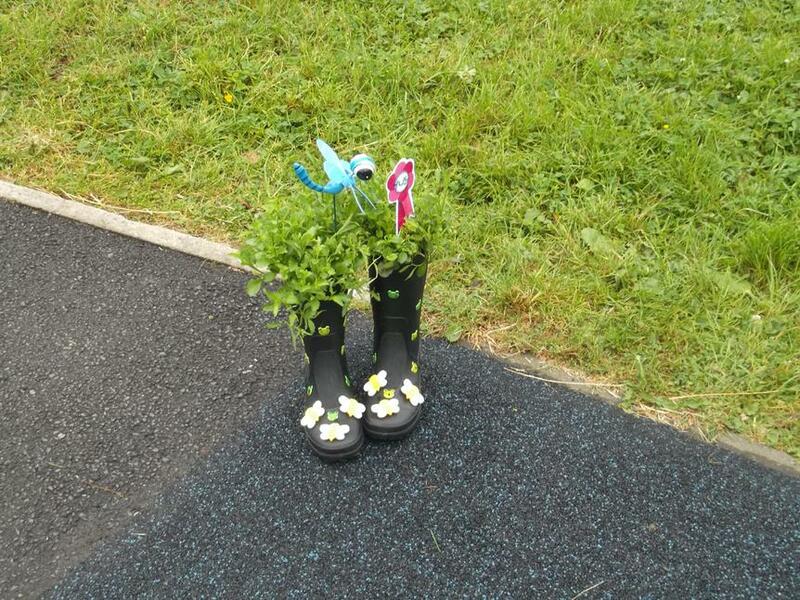 This year we wore odd-socks to raise awareness for anti-bullying. 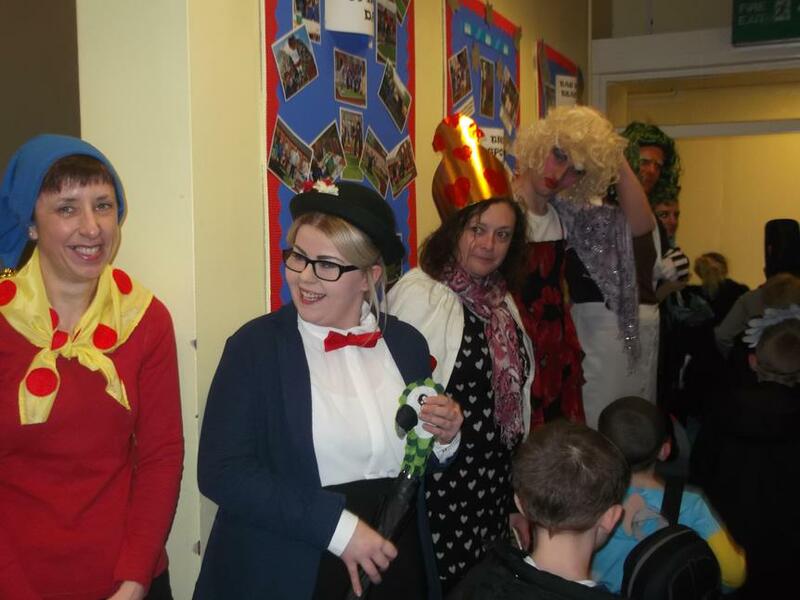 We had some special visitors in school to enrich our learning experience. 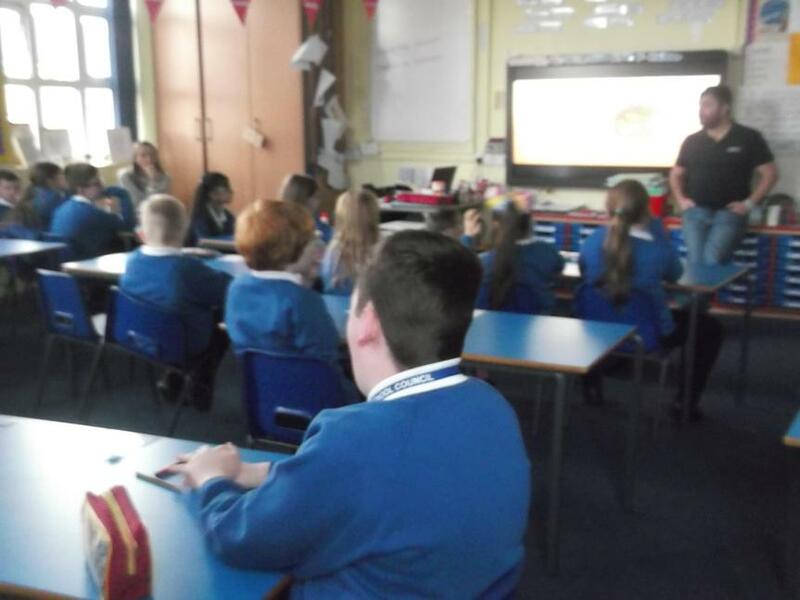 Tim from 'every action has consequences' came in and spoke to year 5/6 about the importance of thinking before you act and taking responsibility for our actions. 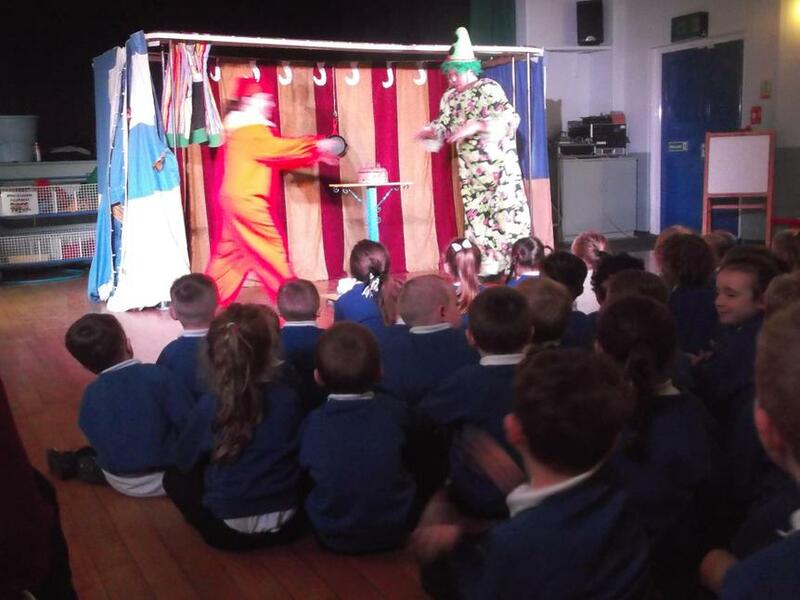 Reception, year 1, 2, 3 and 4 were lucky enough to watch an anti-bullying show that taught us what bullying is and how to help ourselves and others who are being bullied. 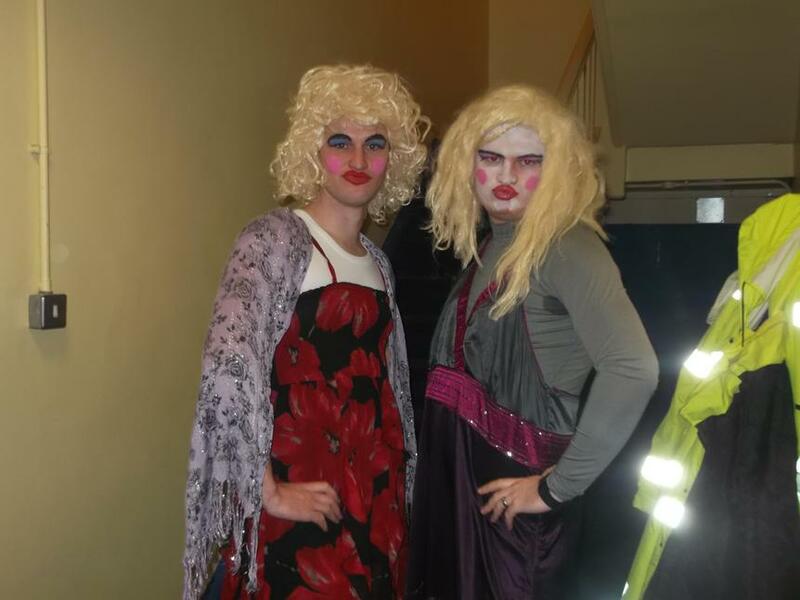 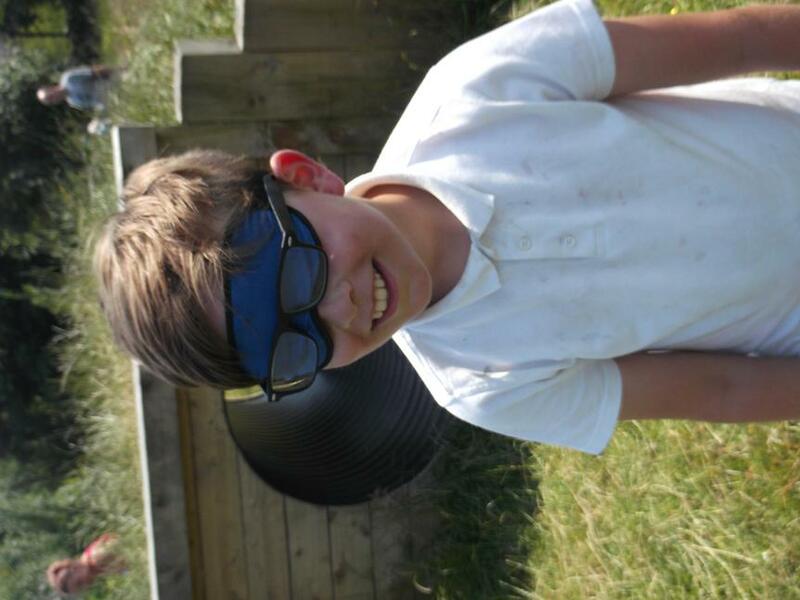 If you wish to learn more about Tim and his brother Adam's story click on the following link. 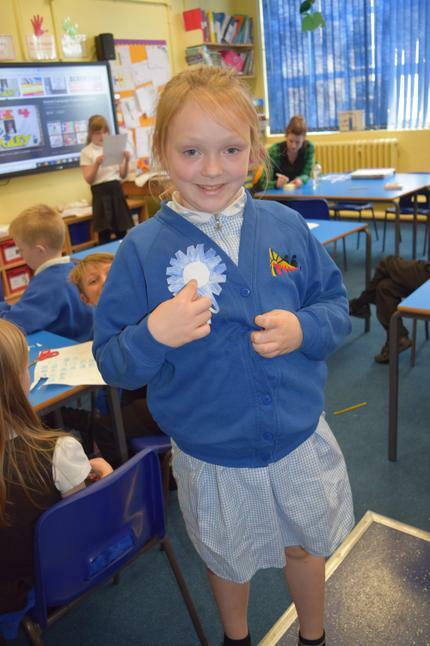 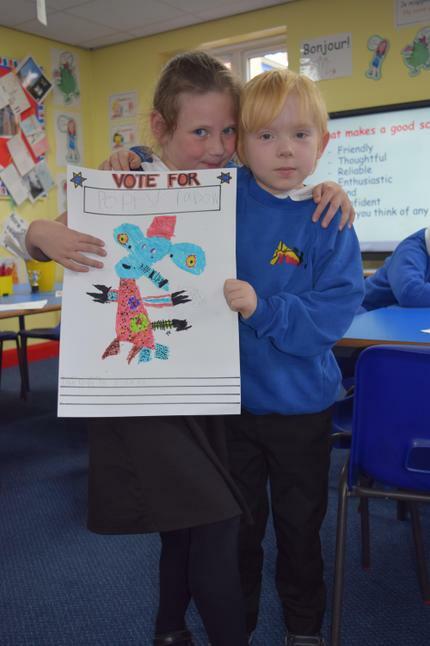 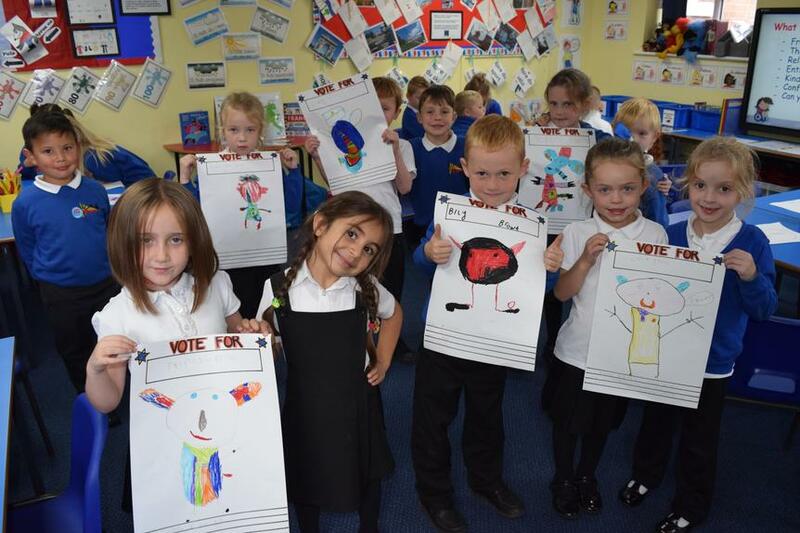 This year the children at Thorn took part in a mock election to elect their new school council members. 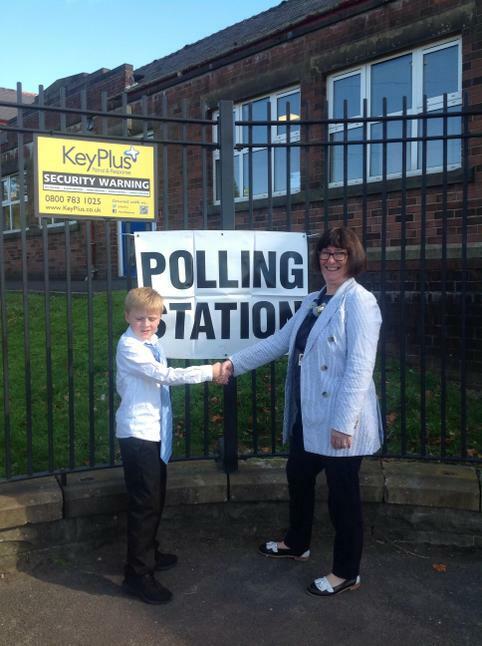 Cllr Barbara Ashworth labour councillor came into school to talk to the children about the importance of voting and having their say. 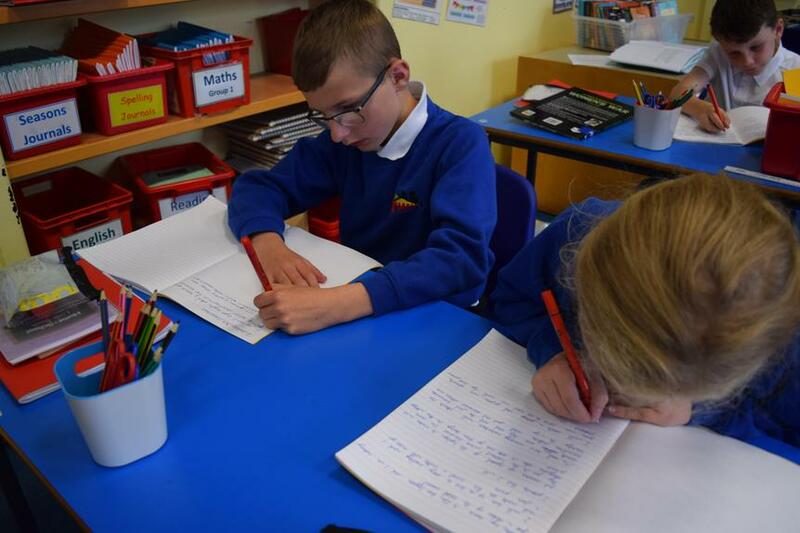 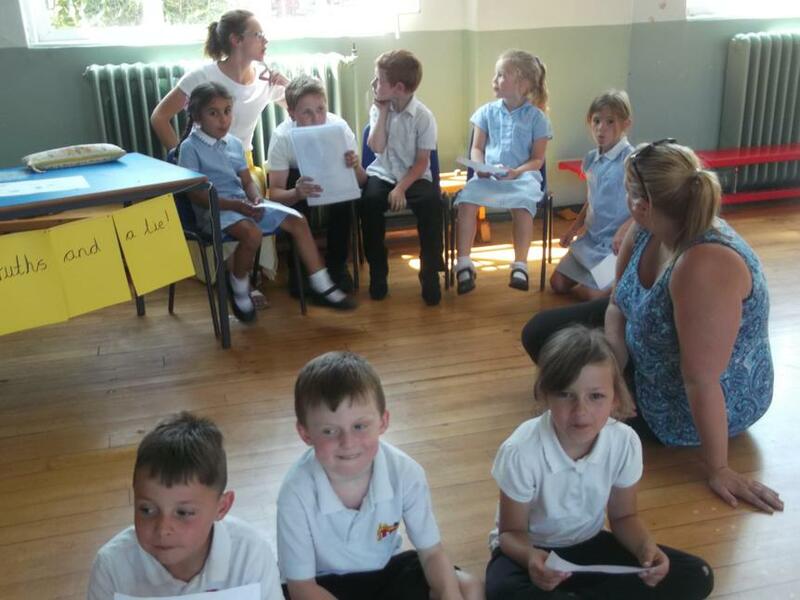 In KS2, each candidate had to write a manifesto and present a speech about why they should be chosen. 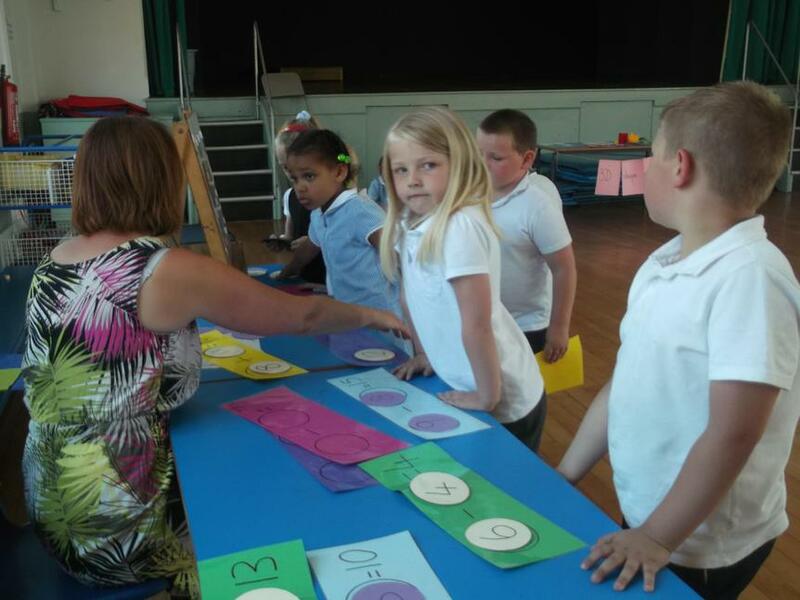 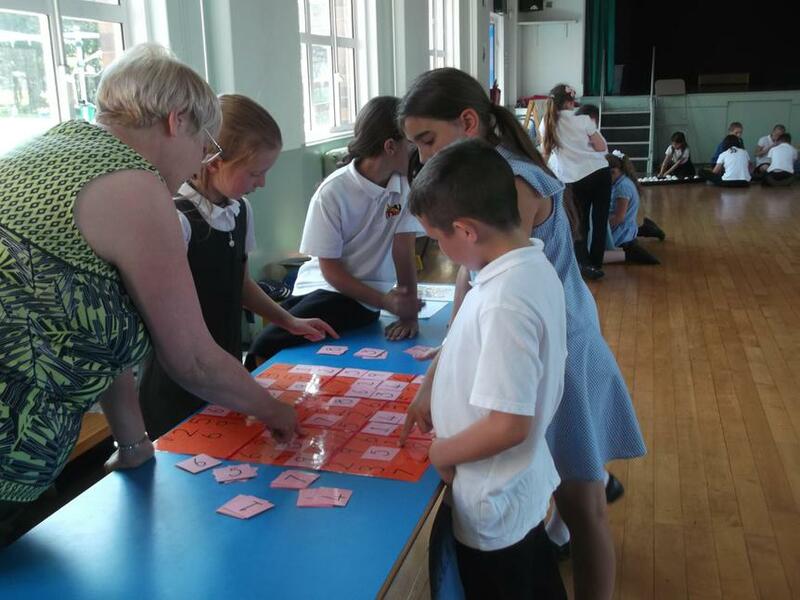 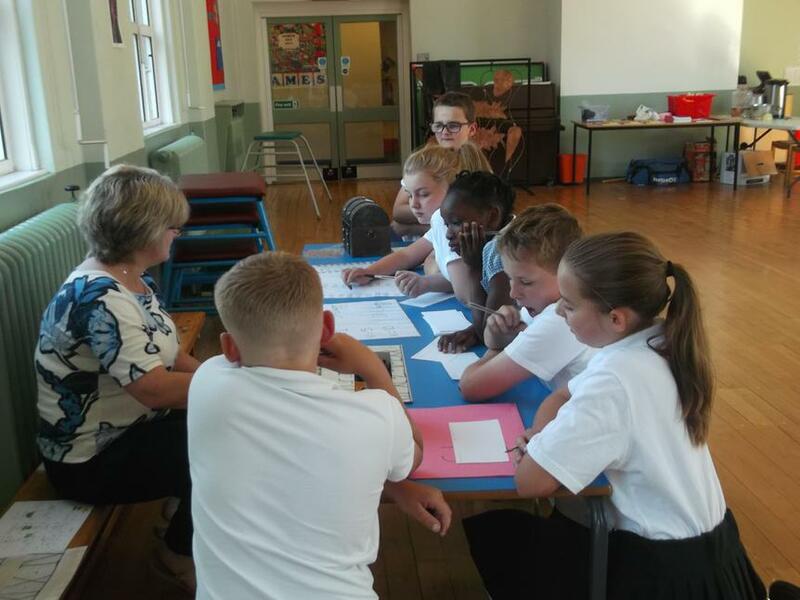 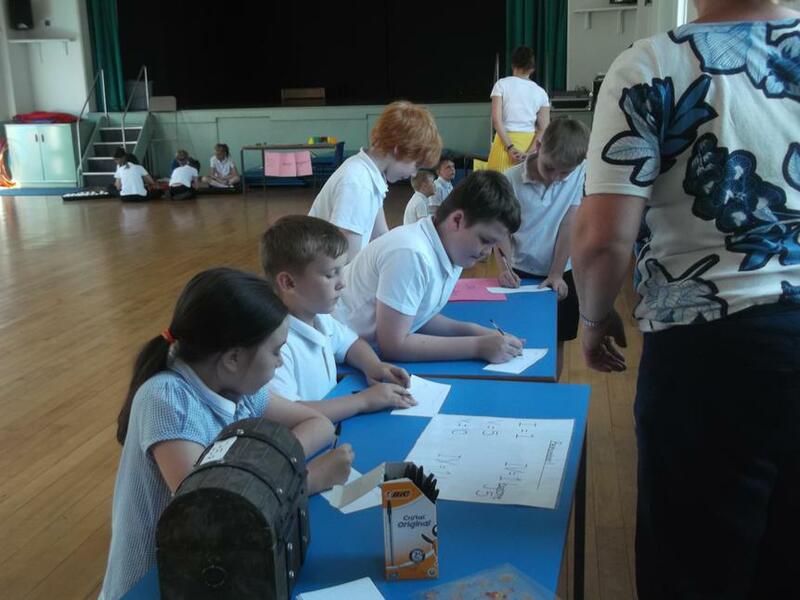 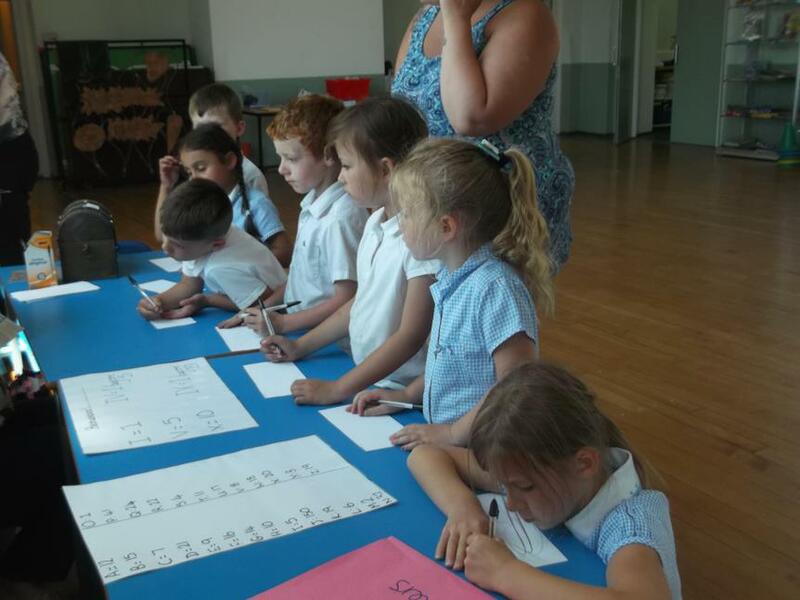 The hall was set up as a polling station and one by one the children voted for who they wanted to sit on the school's council. 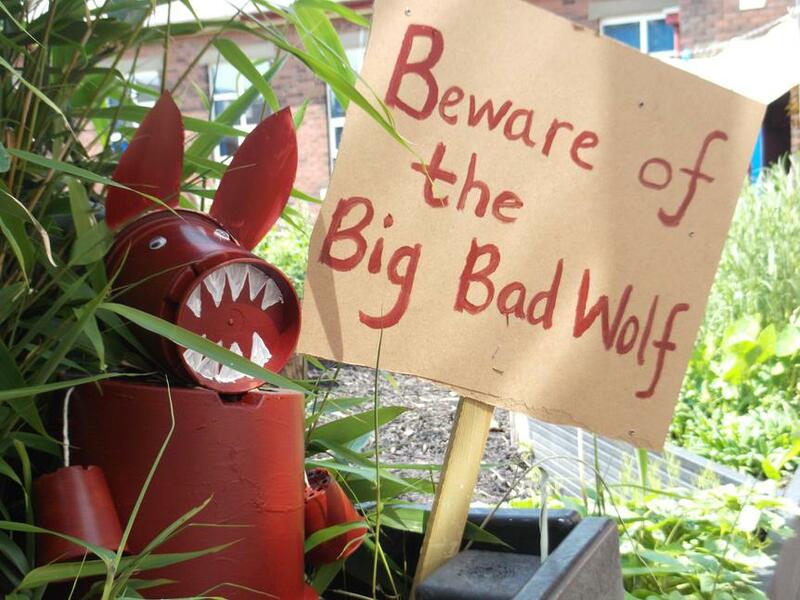 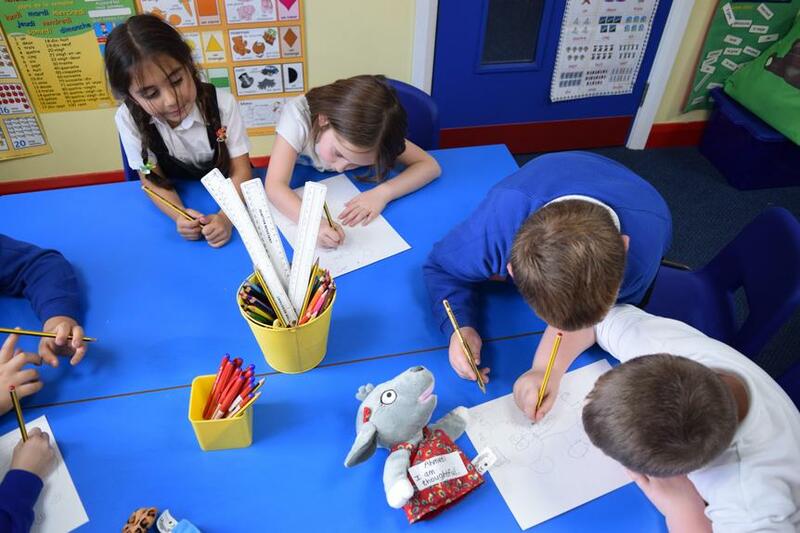 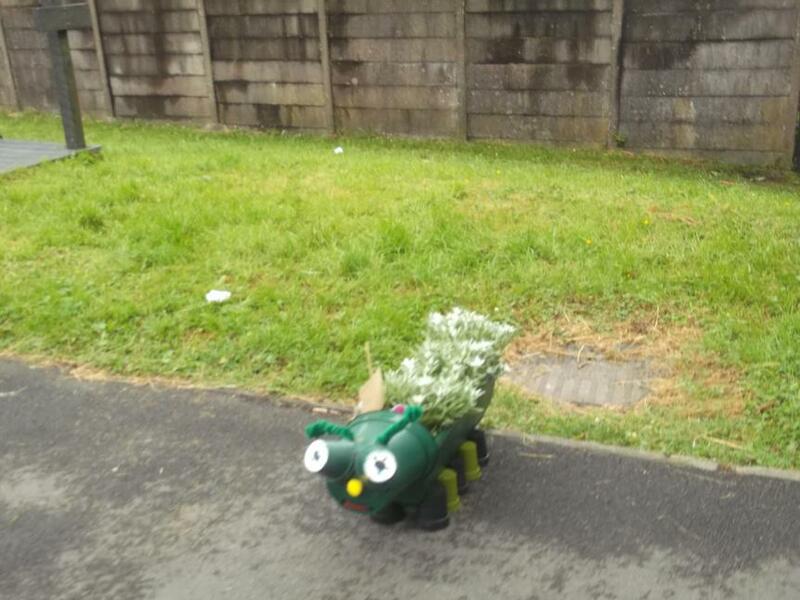 In KS1, they designed a class mascot. 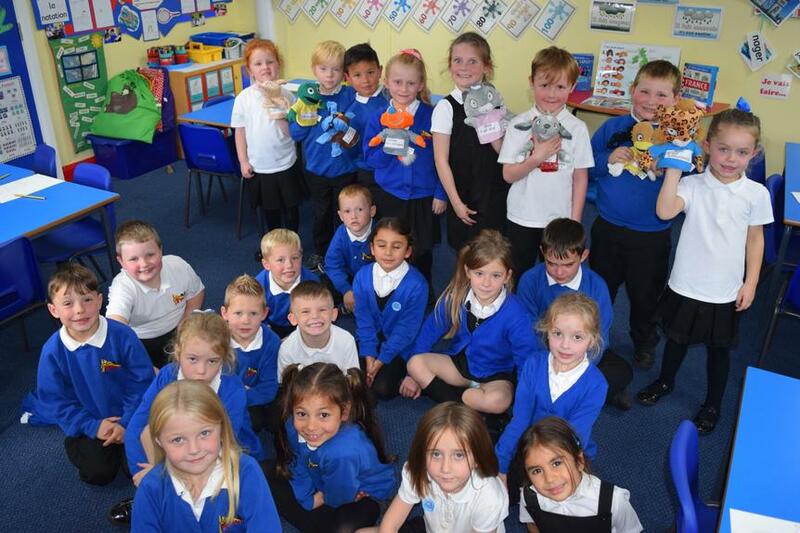 The winning designs will be made into puppets for the class teachers to use in their PSHE lessons. 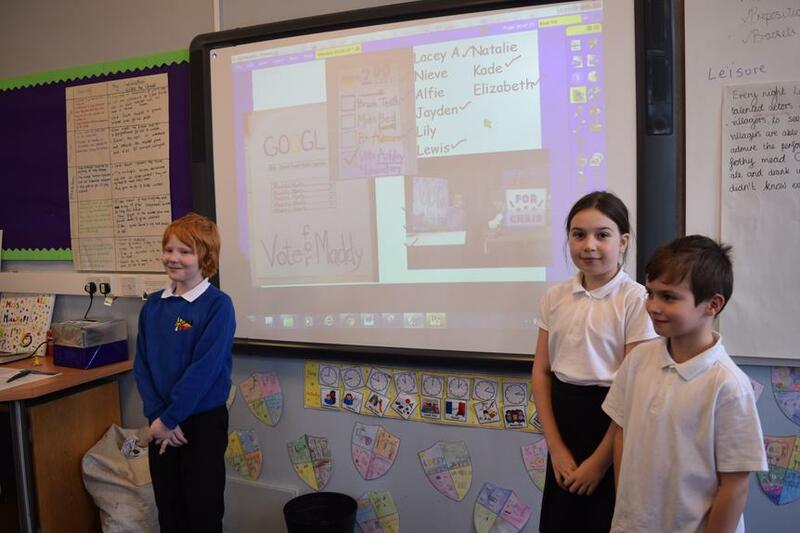 It was a fantastic and enjoyable way for the children to experience democracy and hopefully will inspire them to vote when they become older. 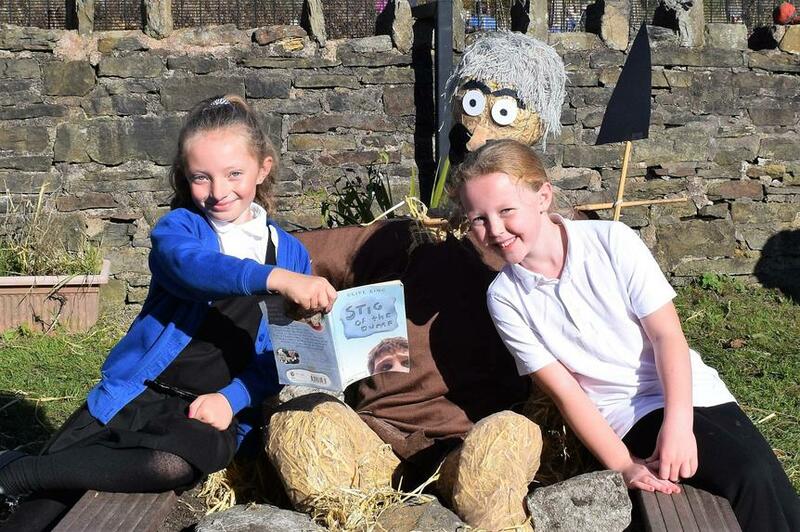 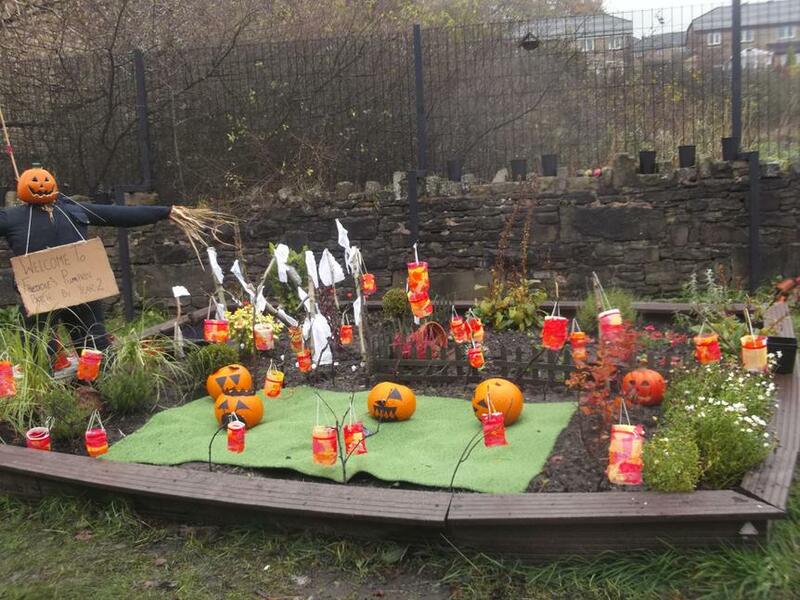 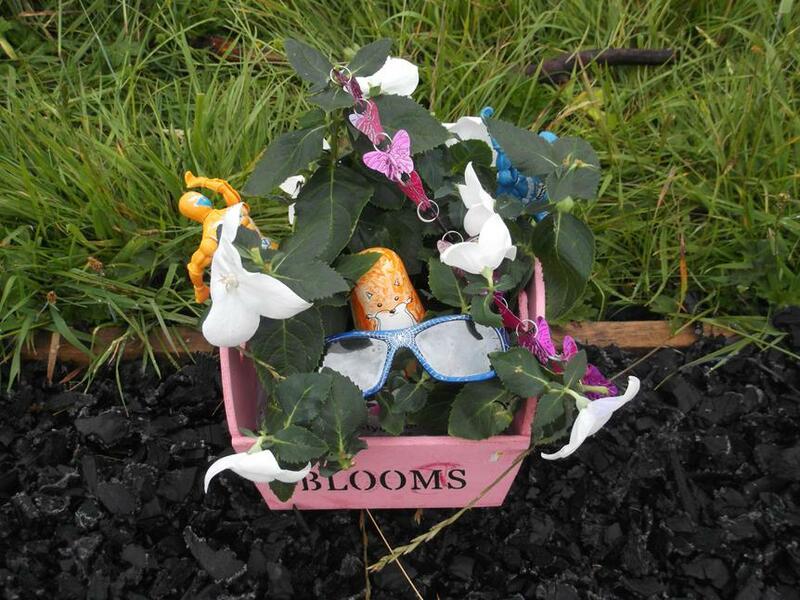 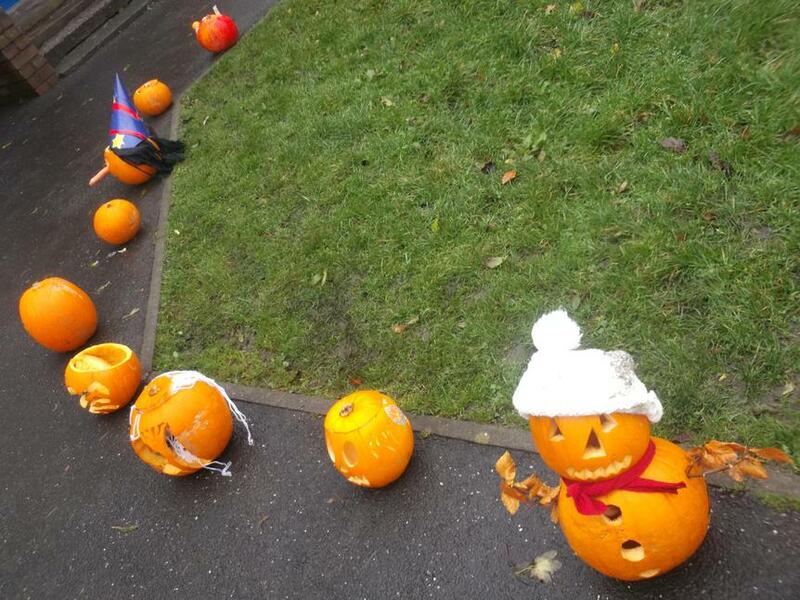 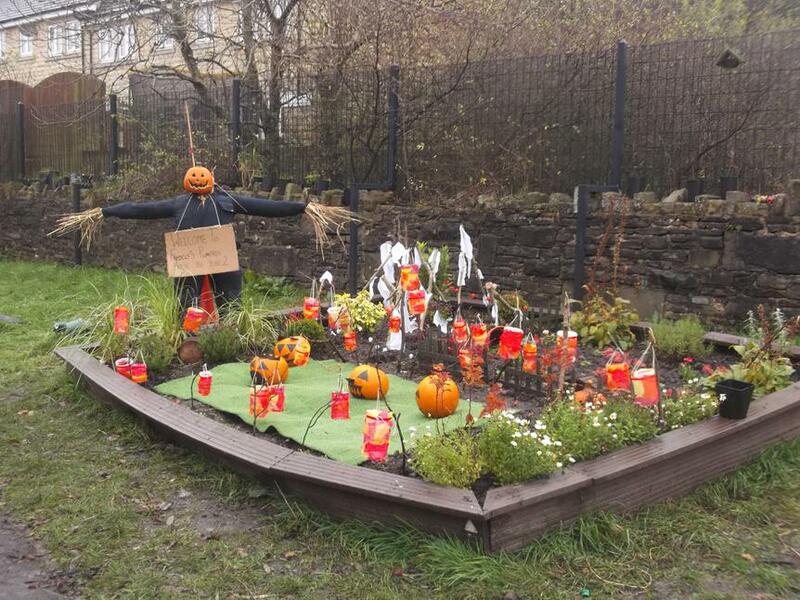 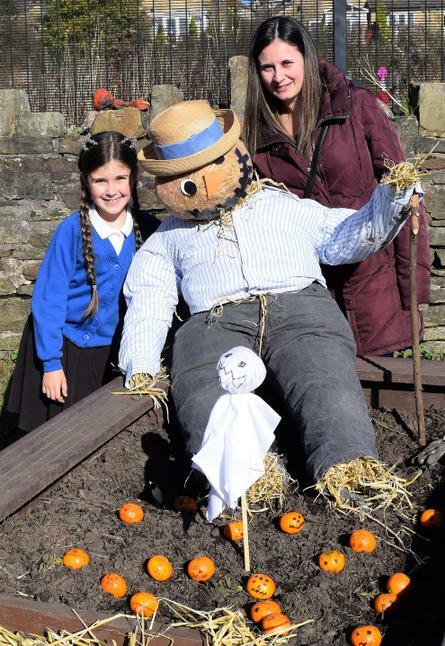 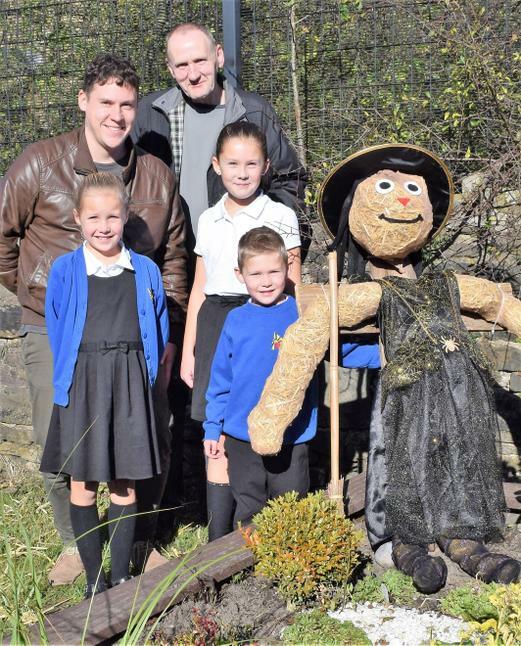 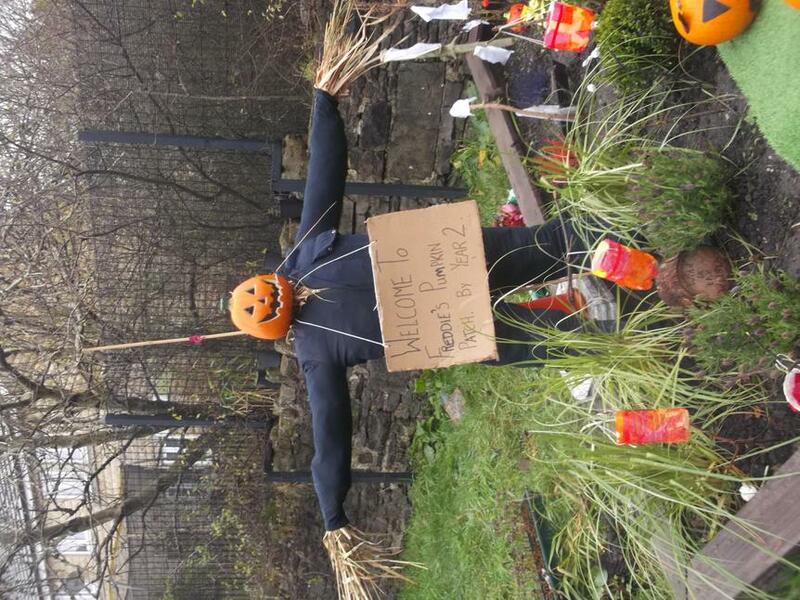 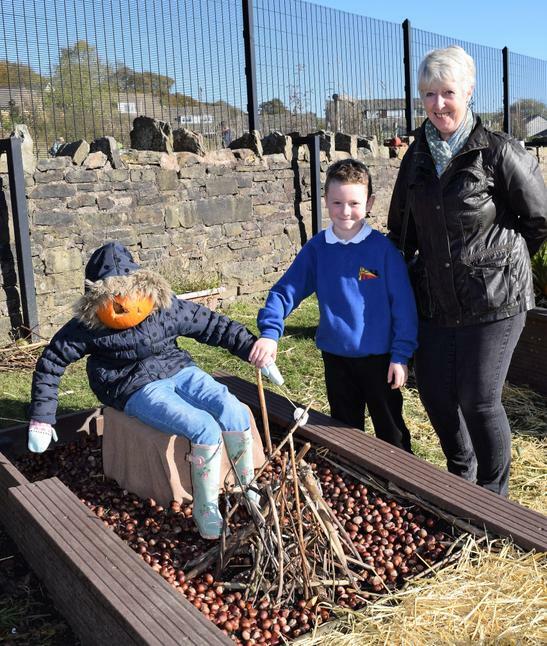 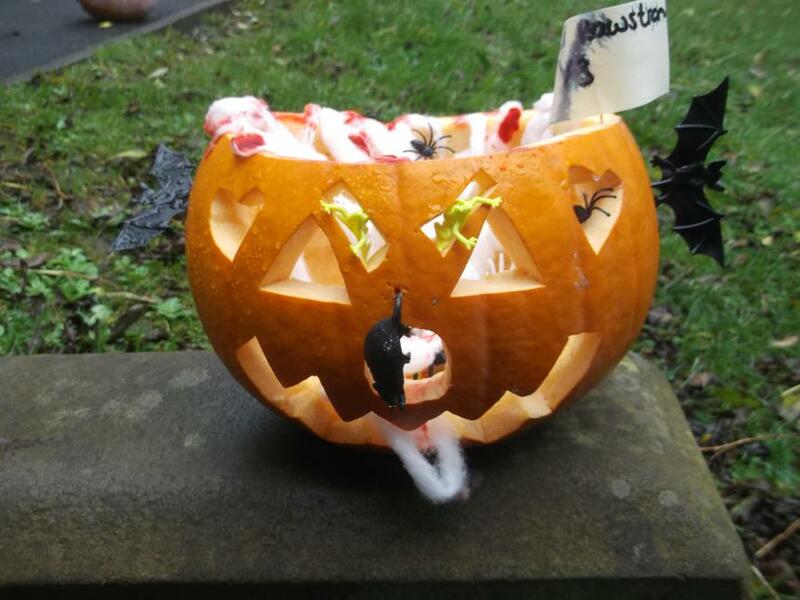 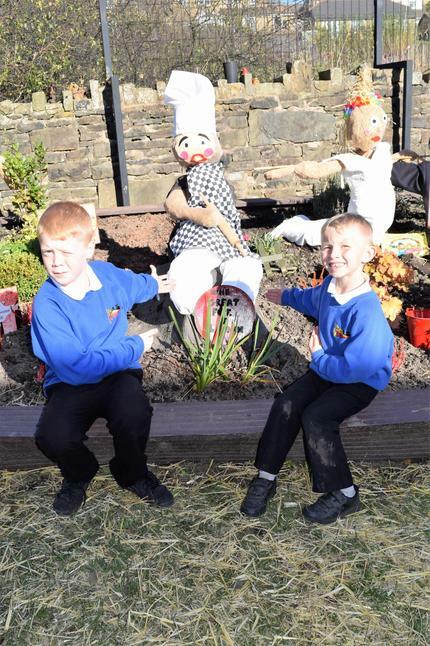 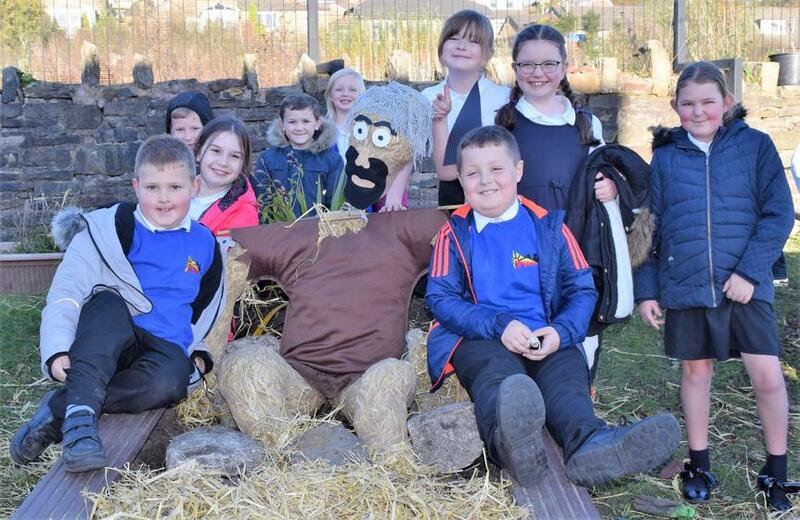 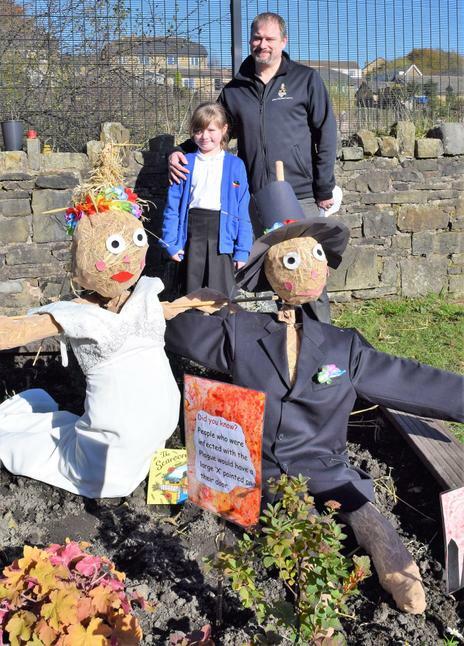 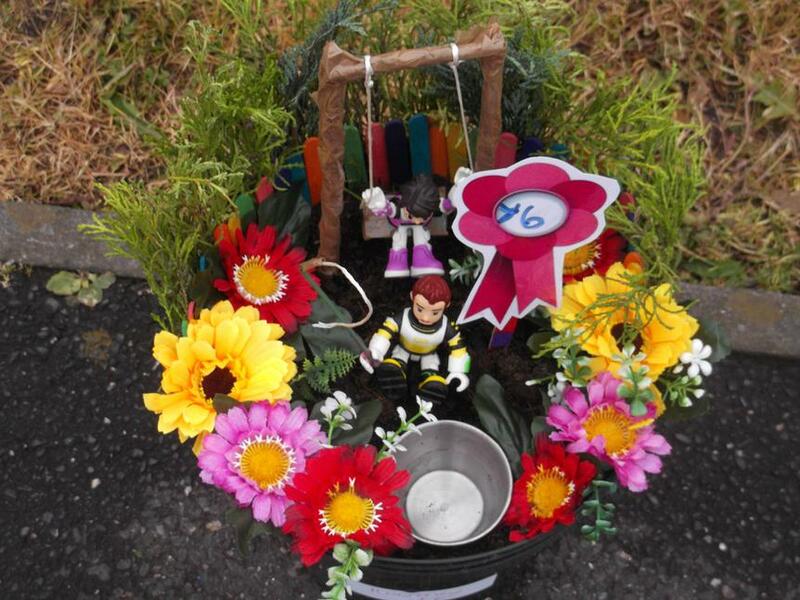 It's autumn time once again and Thorn celebrated in style with a scarecrow festival. 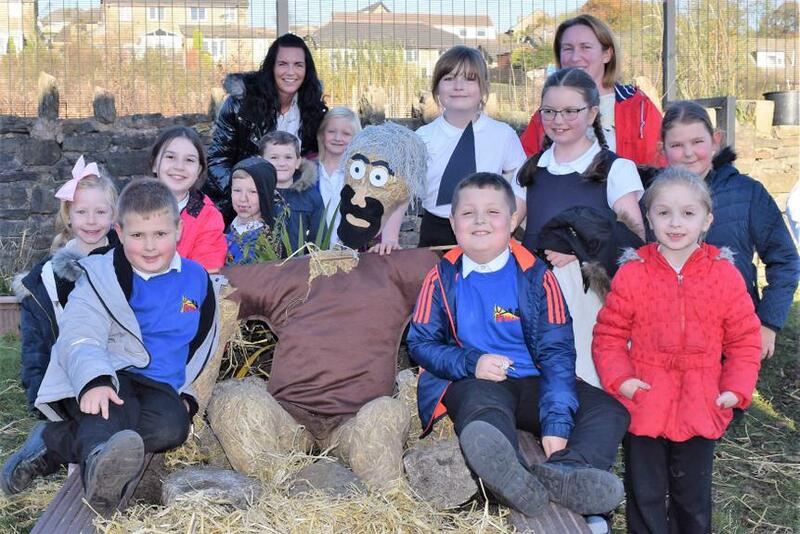 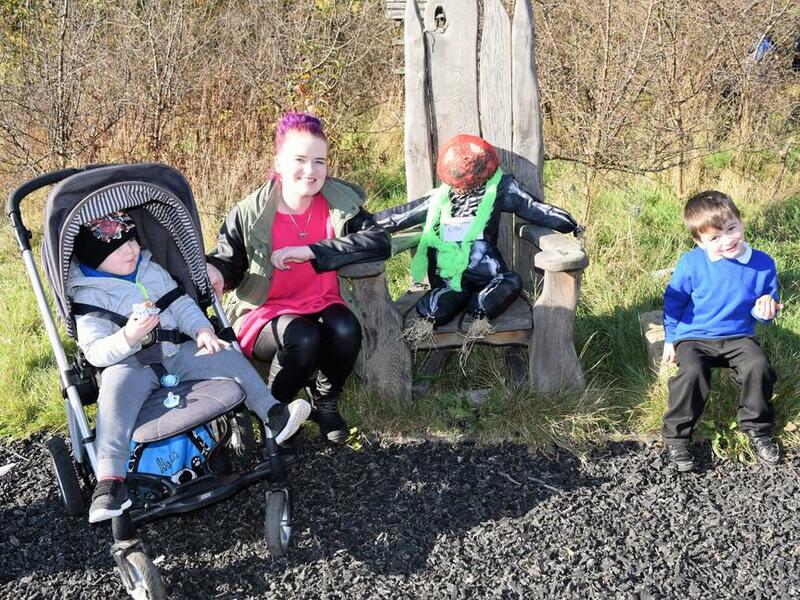 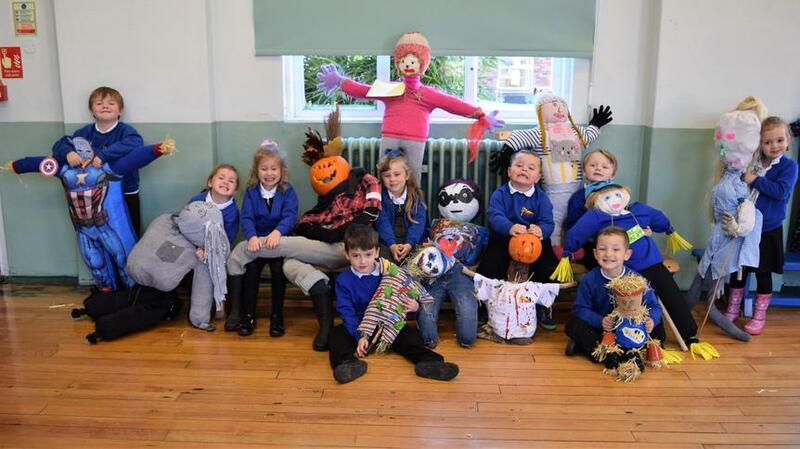 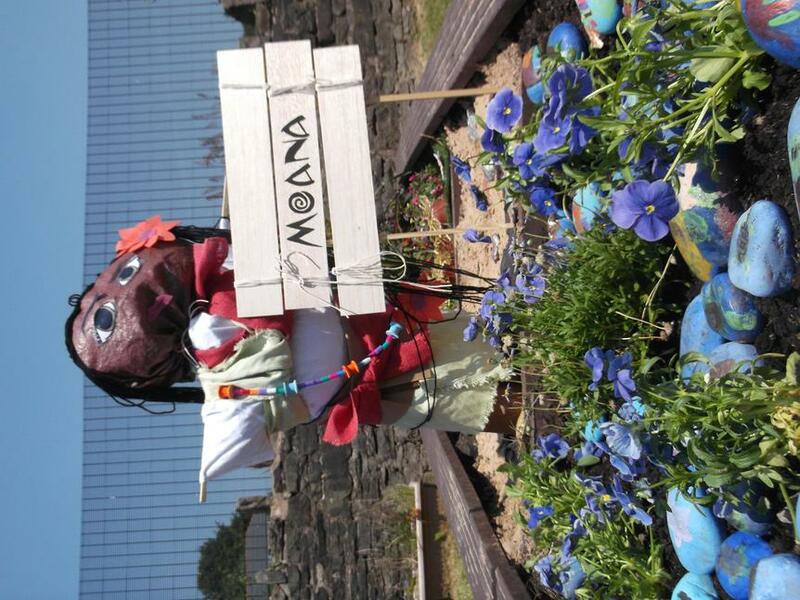 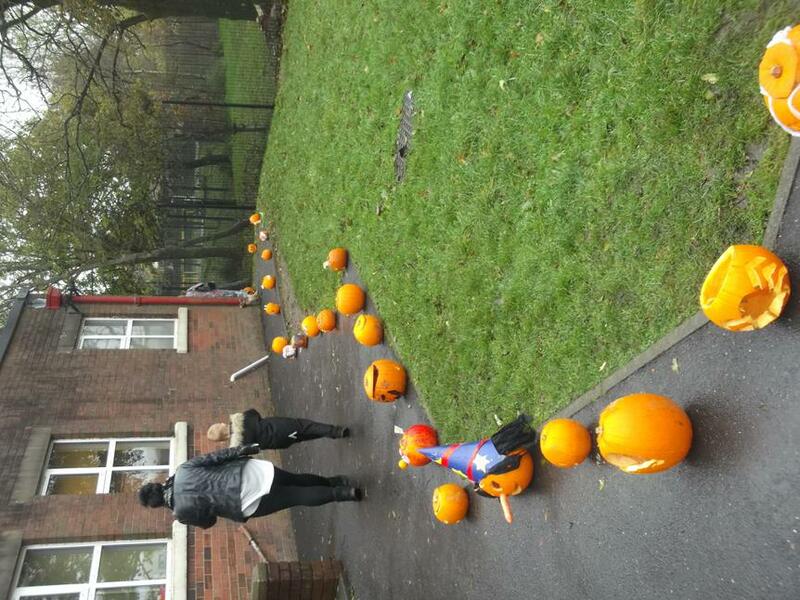 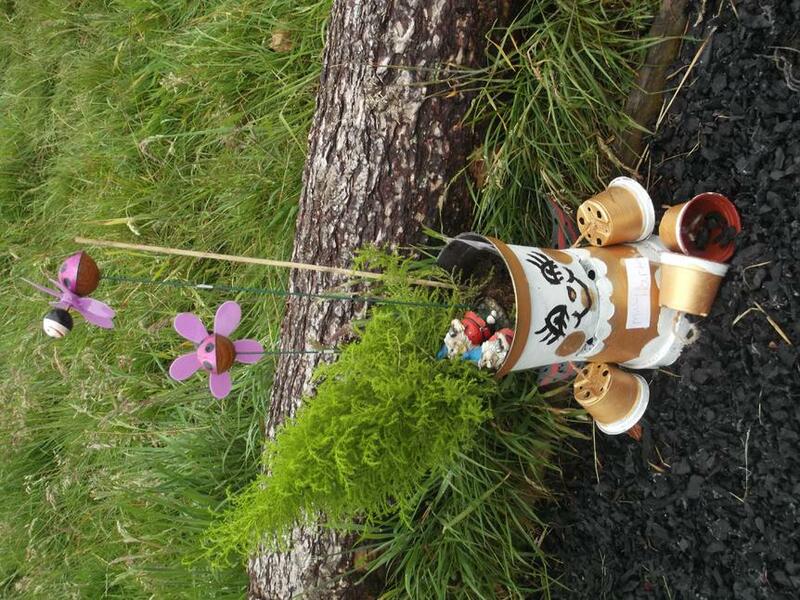 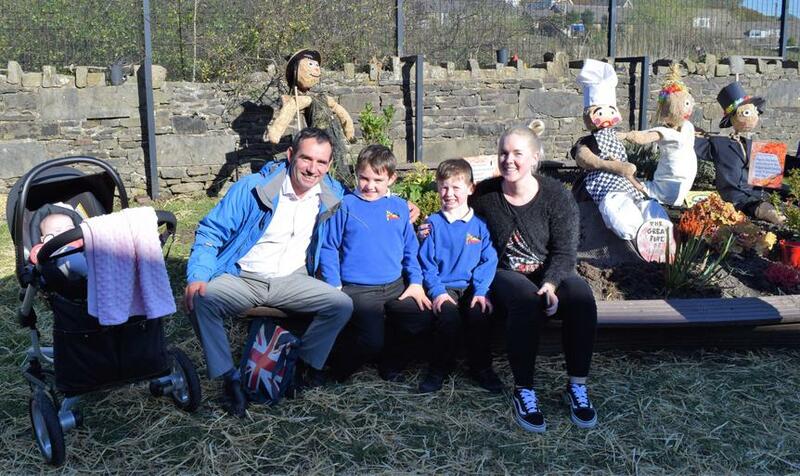 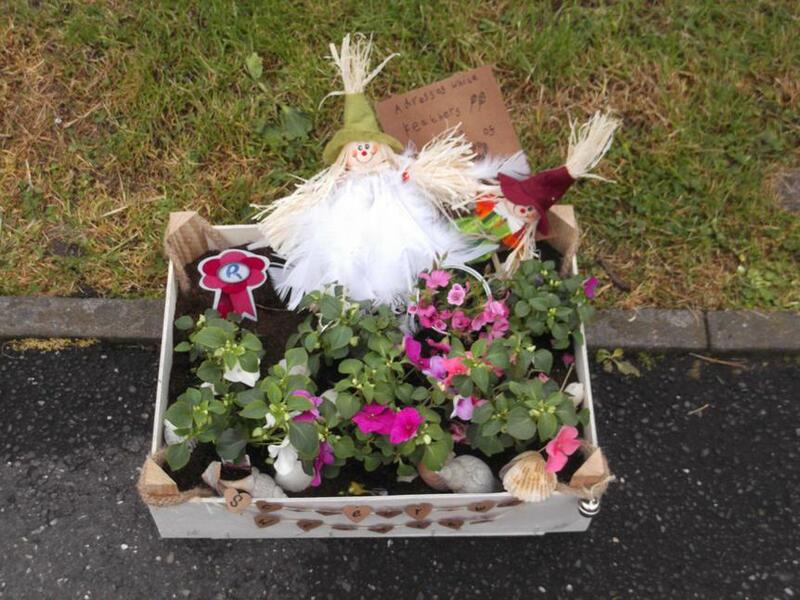 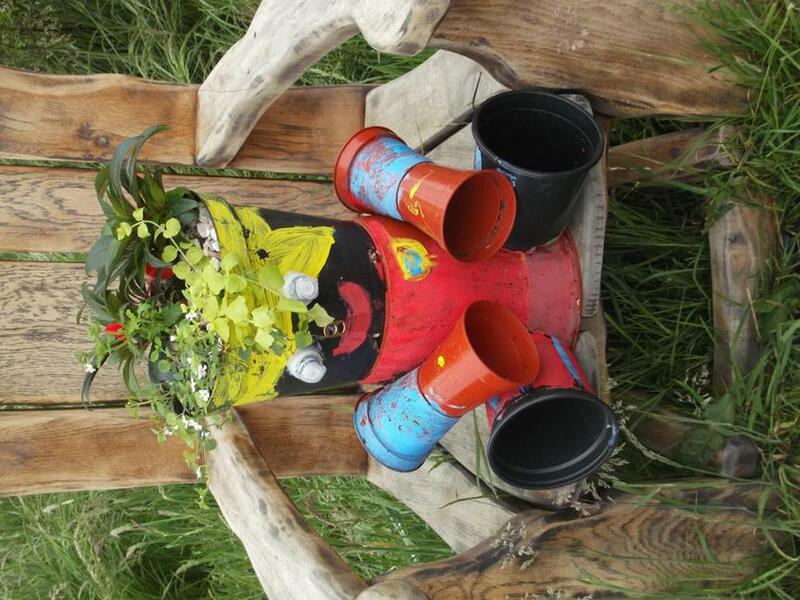 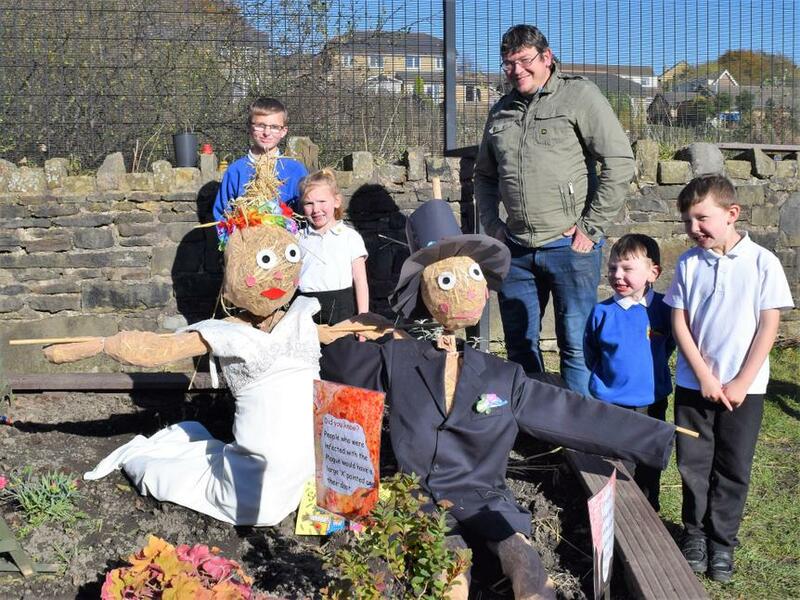 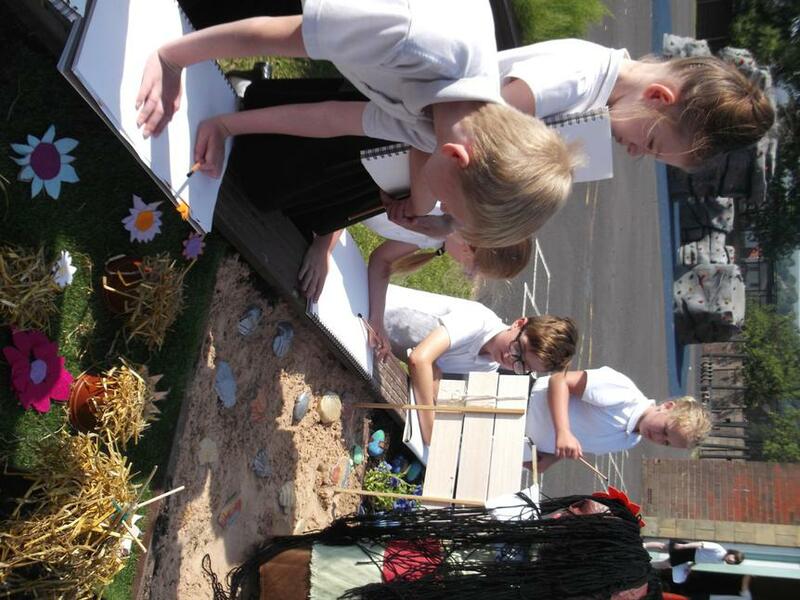 Parents, children and teachers showed their creativity with some fantastic scarecrows. 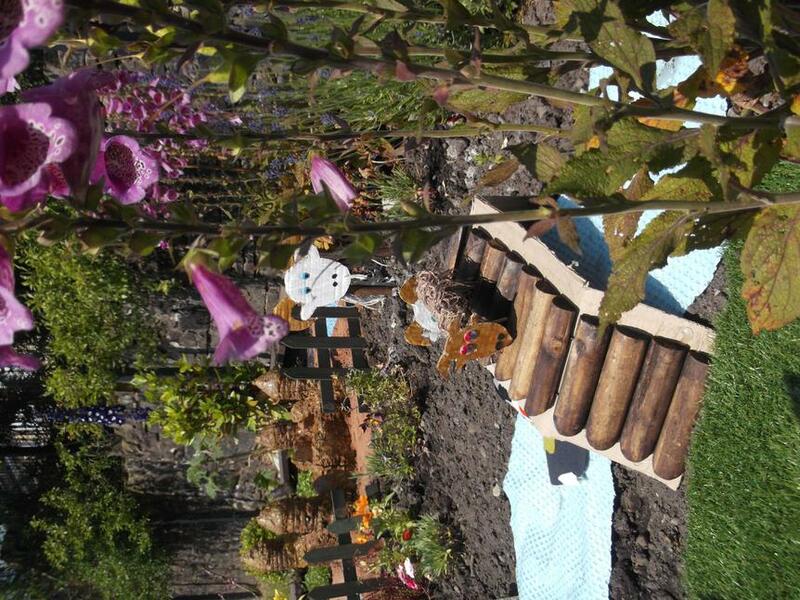 The raised beds were weeded and new seeds were planted. 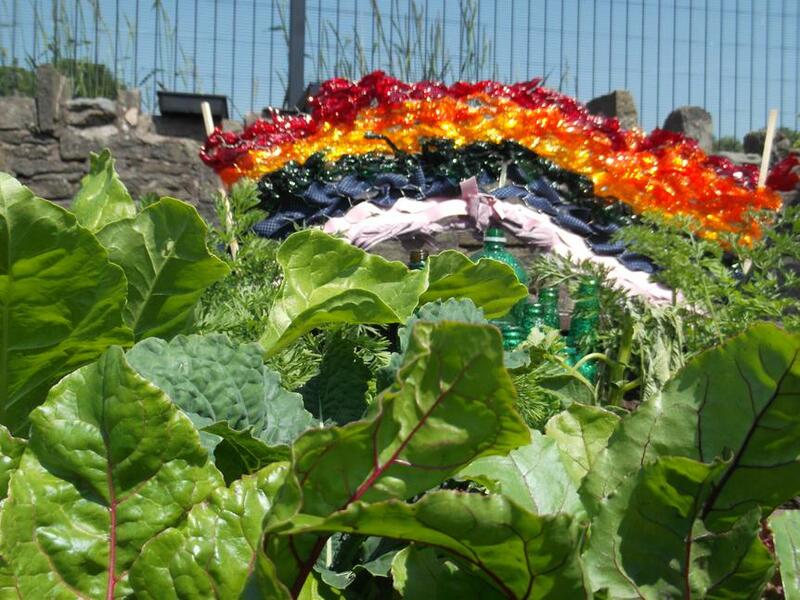 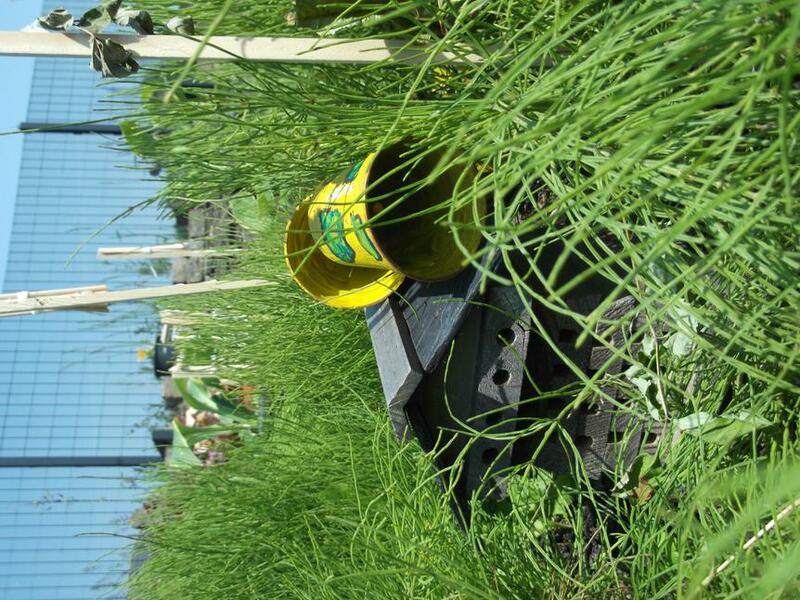 We are looking forward to springtime when we can harvest some new crops. 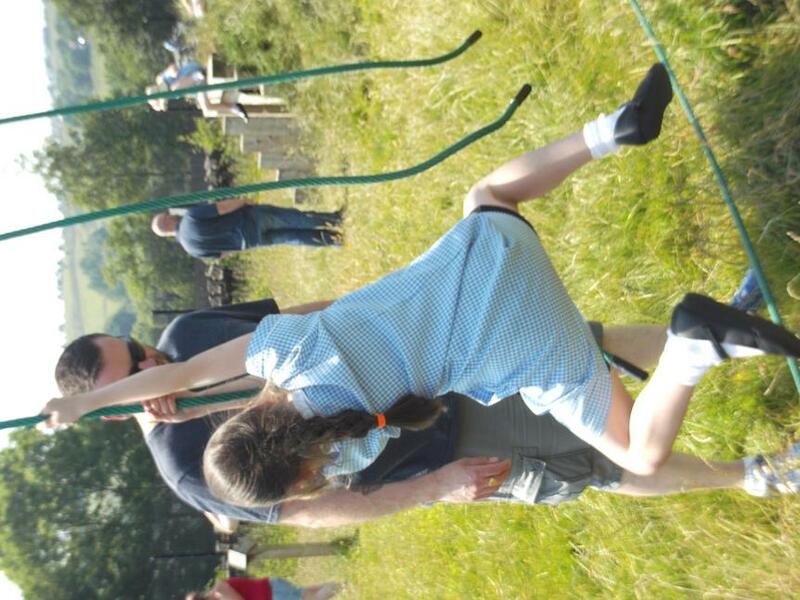 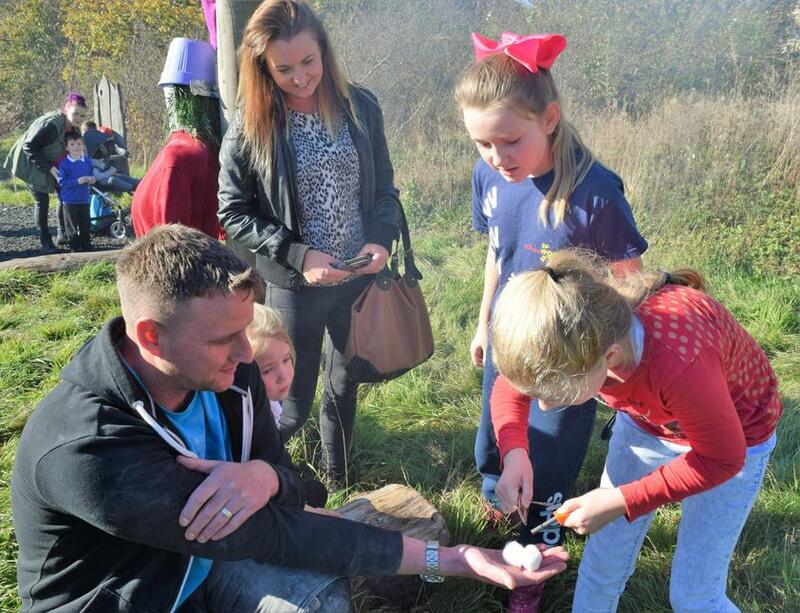 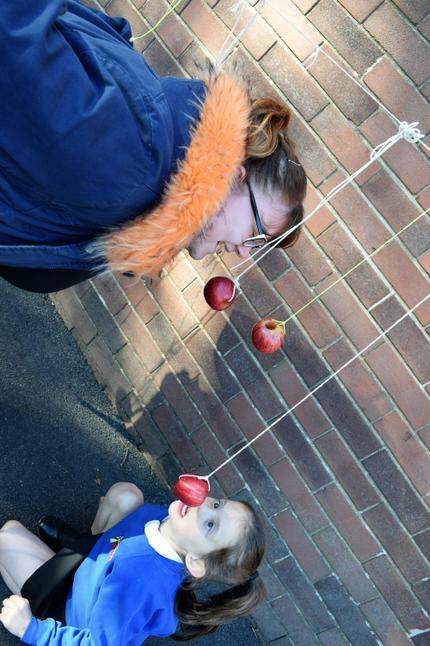 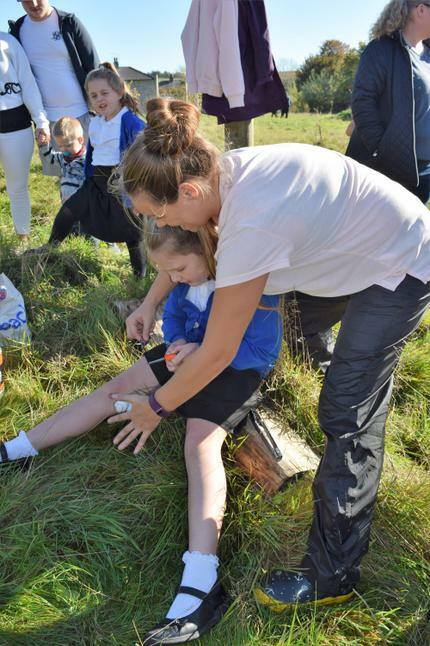 Children and parents enjoyed apple bobbing and roasting marshmallows in the forest school area. 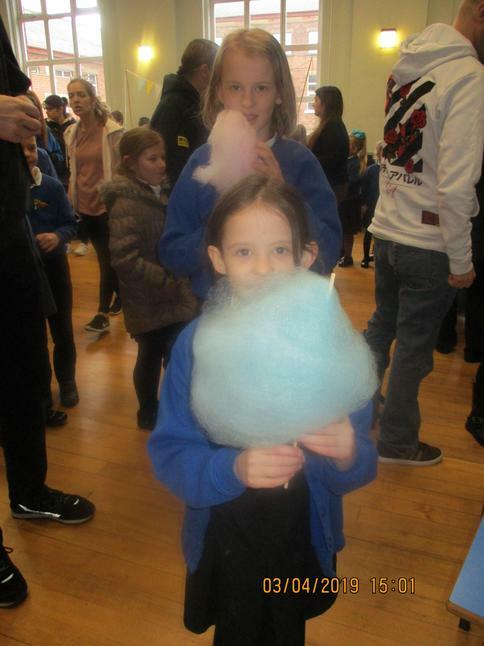 It was a delight to see so many families with big smiles on their faces supporting their children and the school. 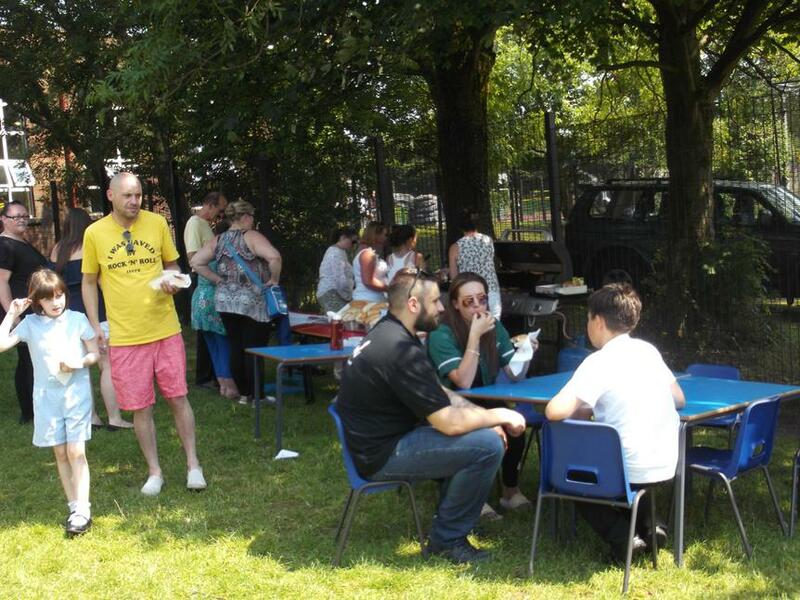 We look forward to seeing you at our summer festival next year! 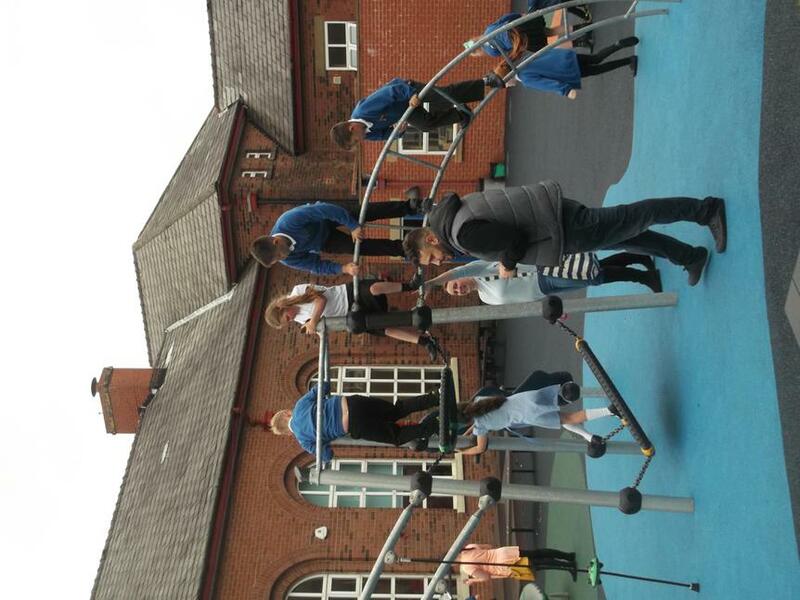 Well what an exciting week it's been here at Thorn! 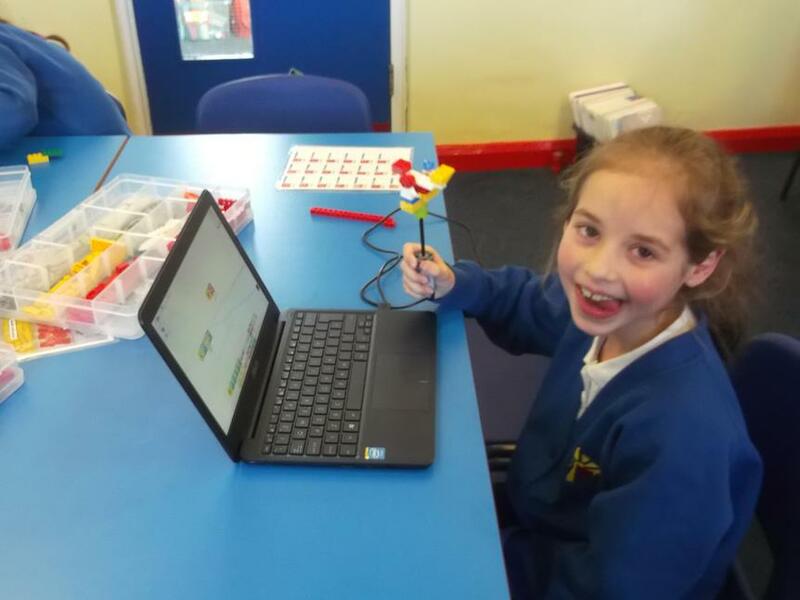 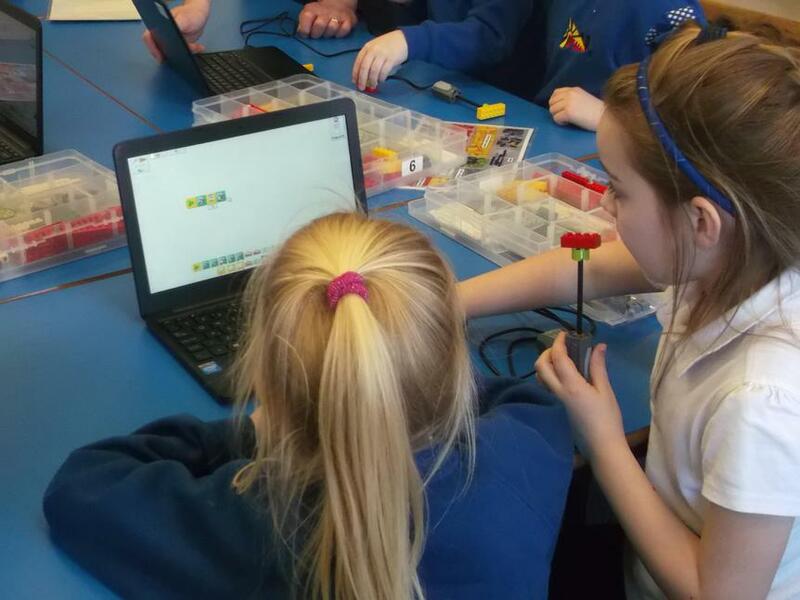 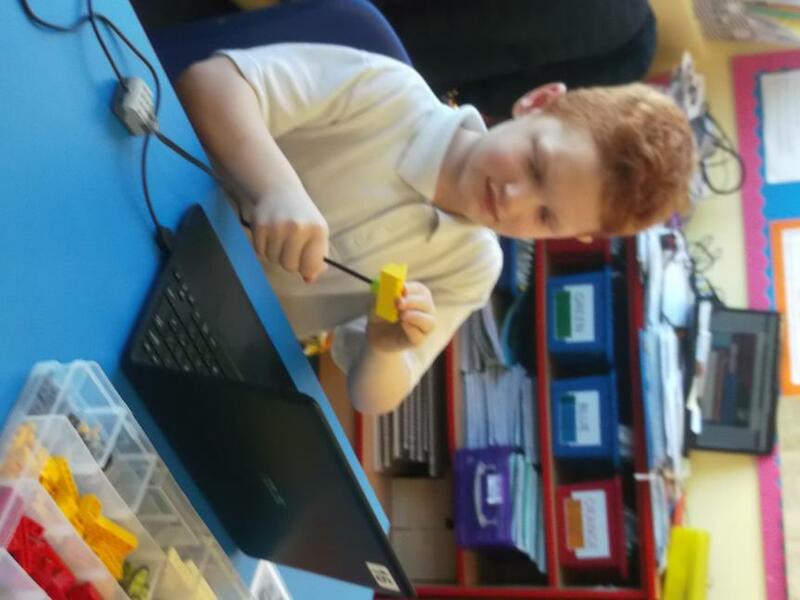 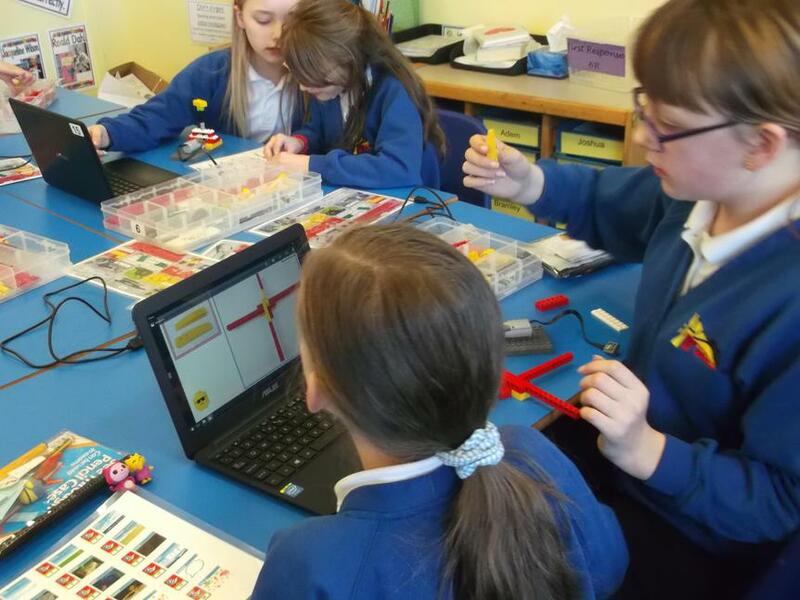 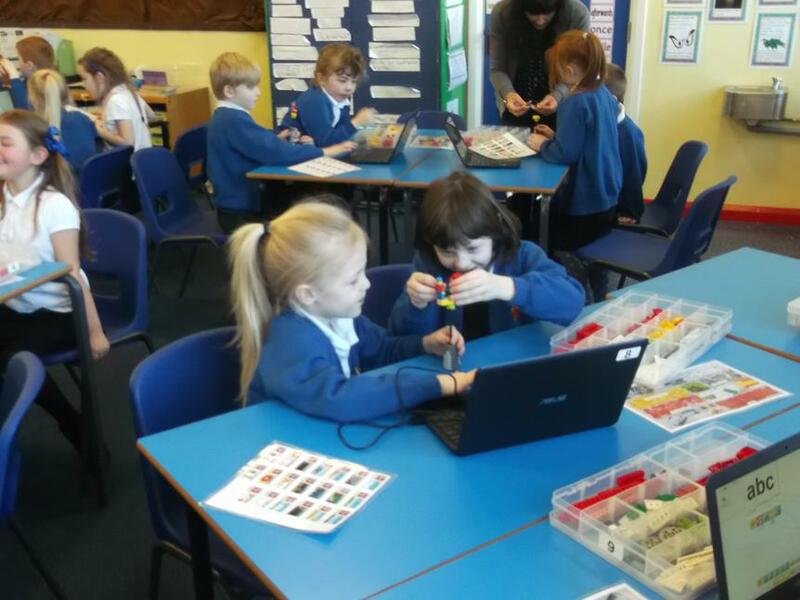 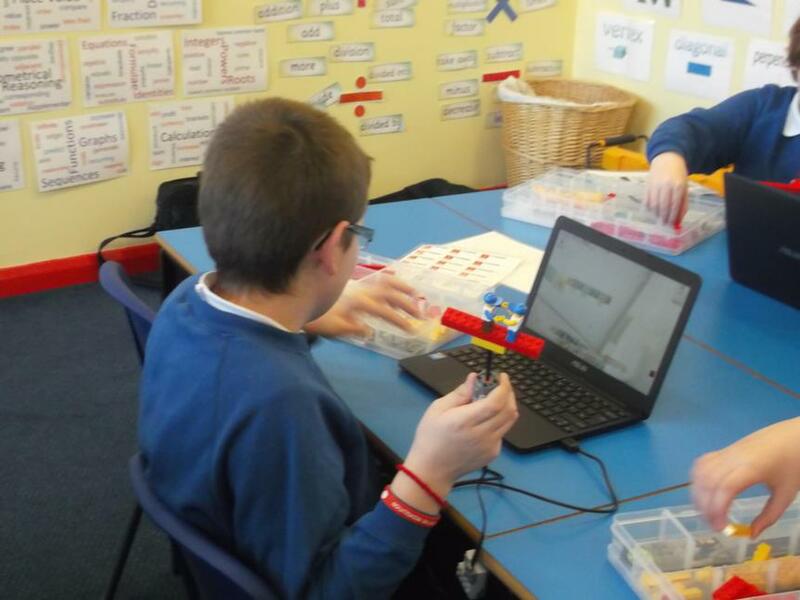 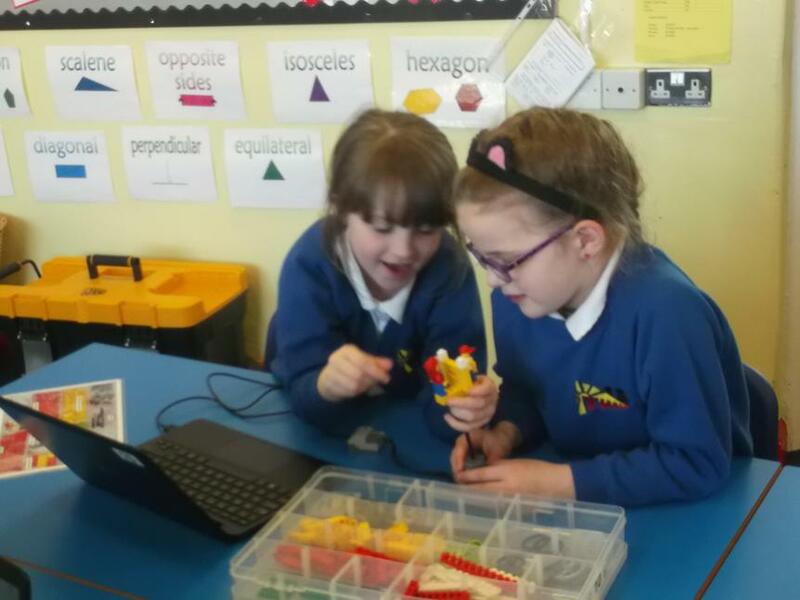 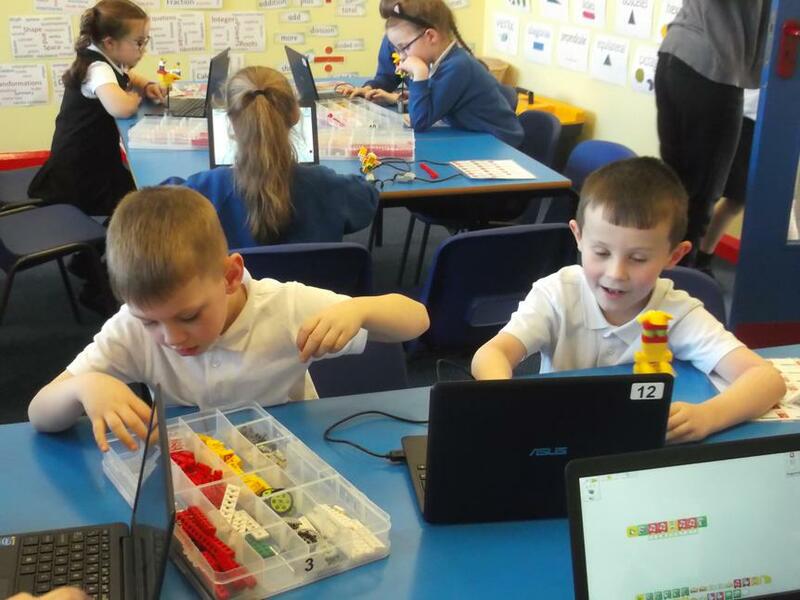 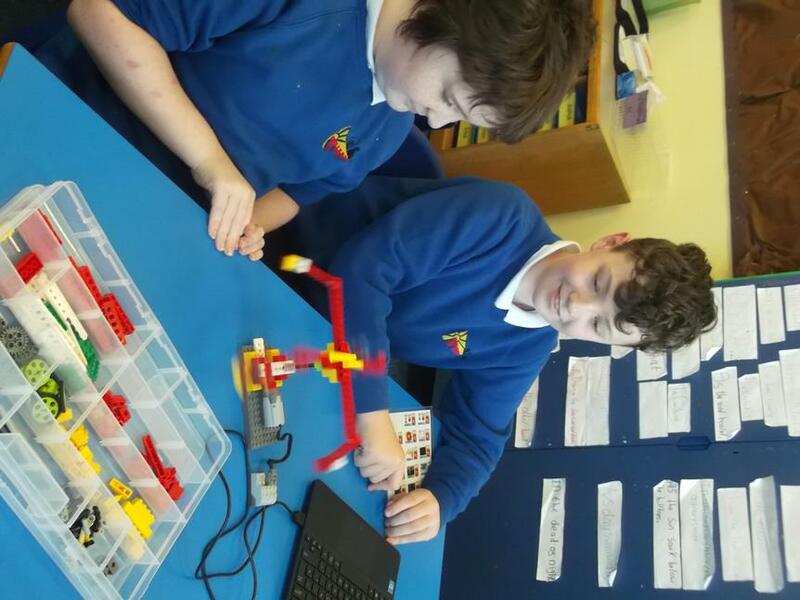 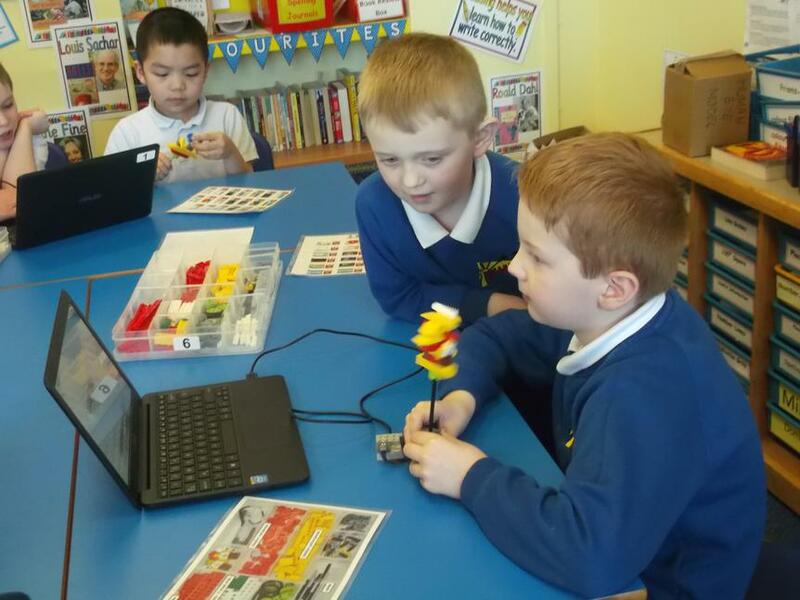 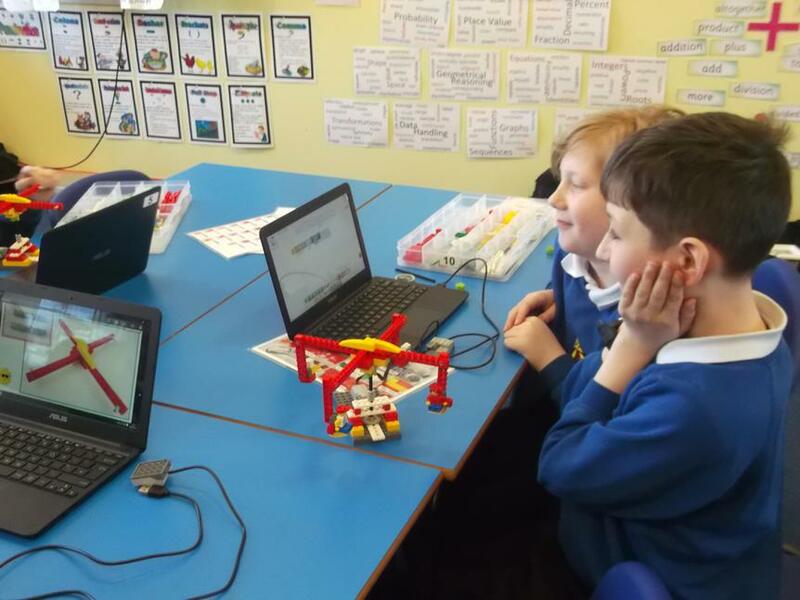 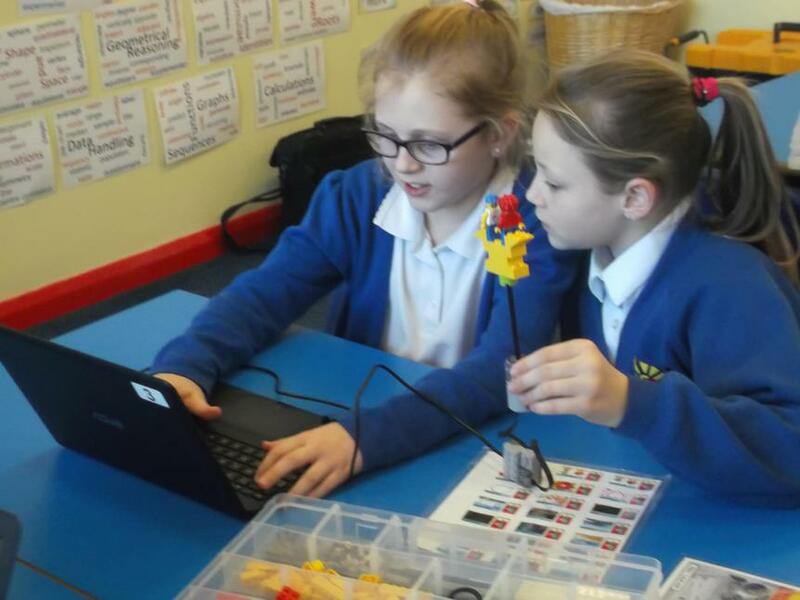 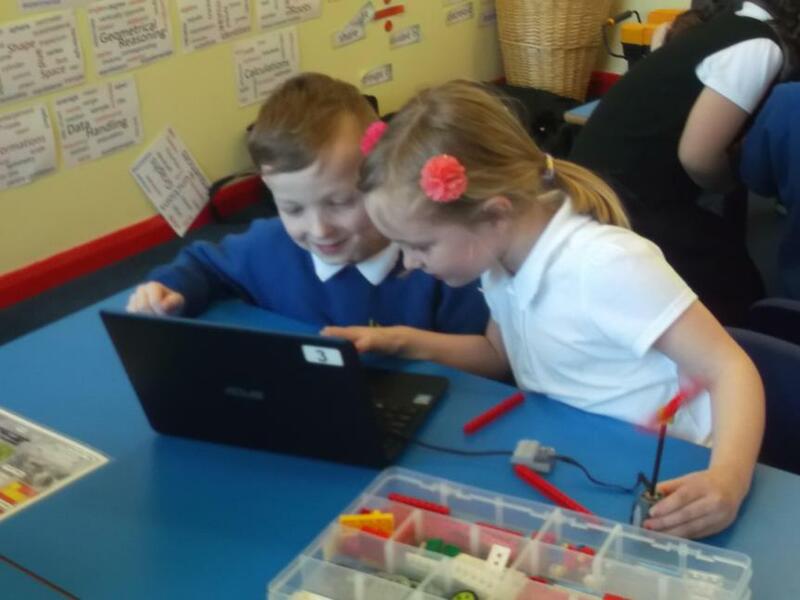 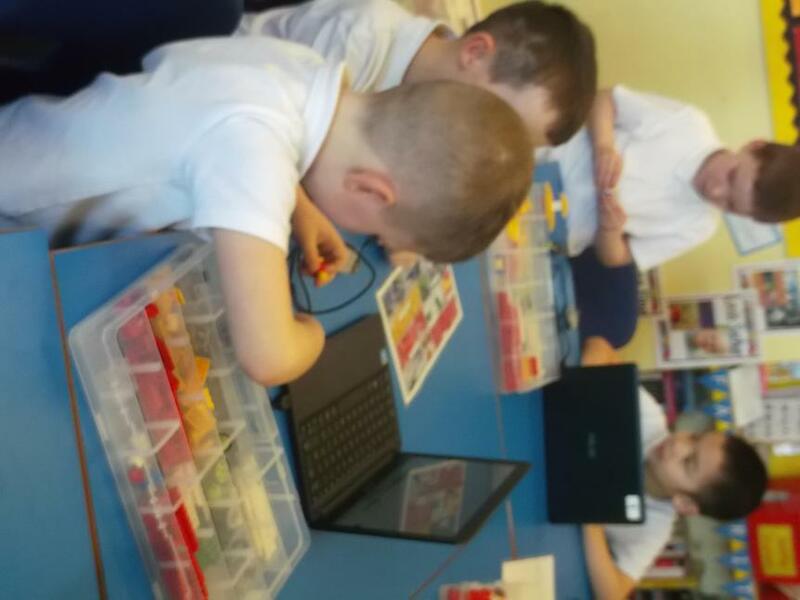 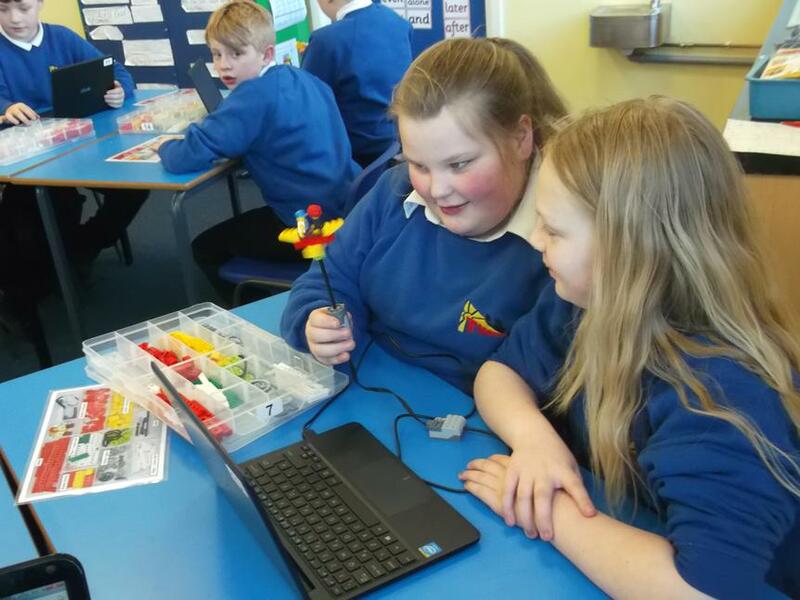 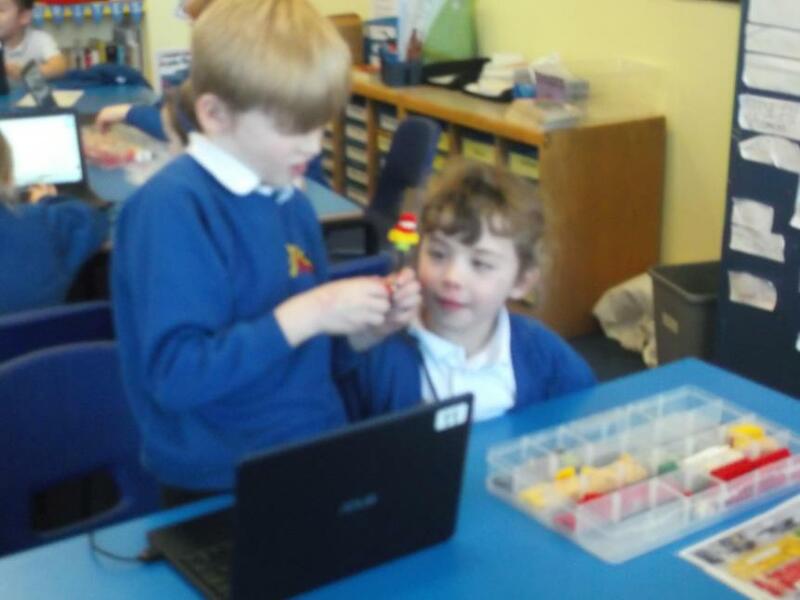 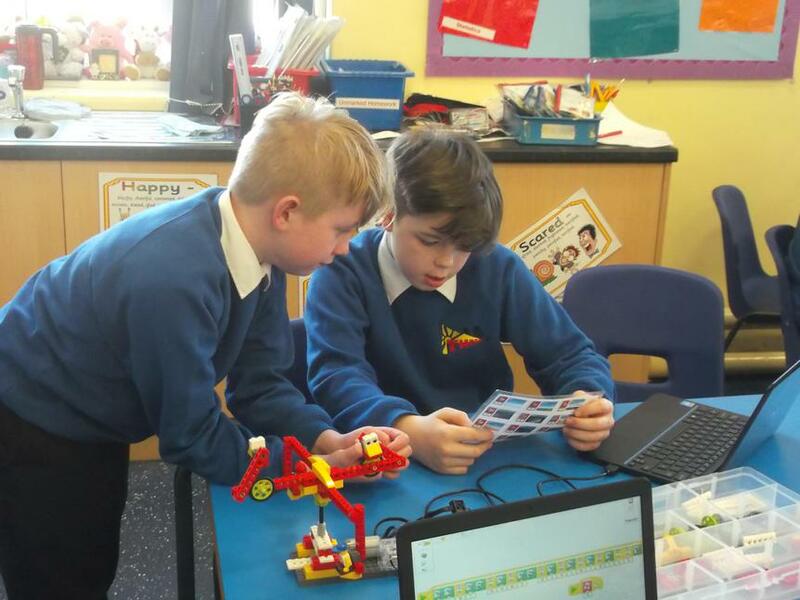 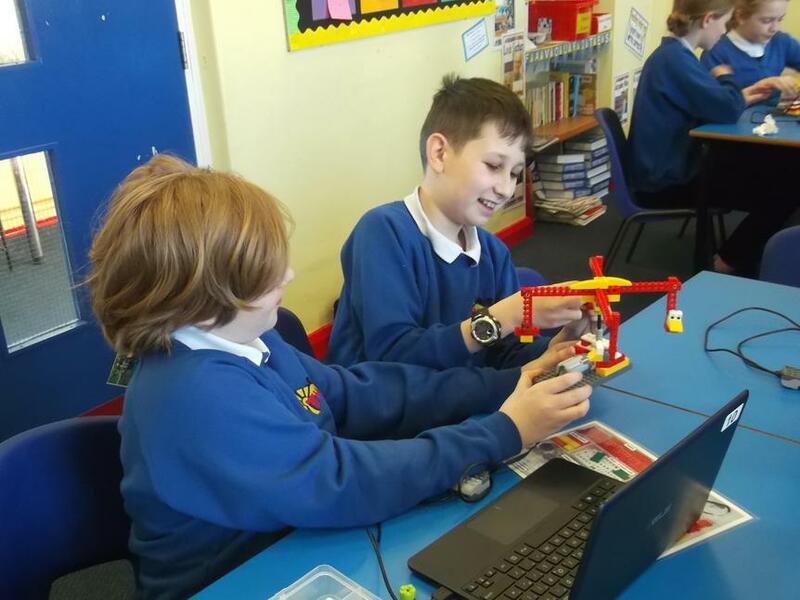 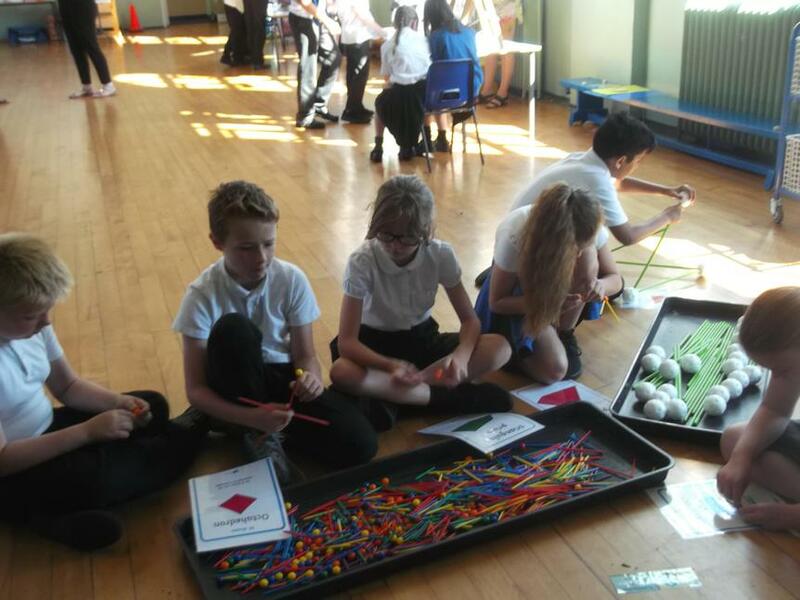 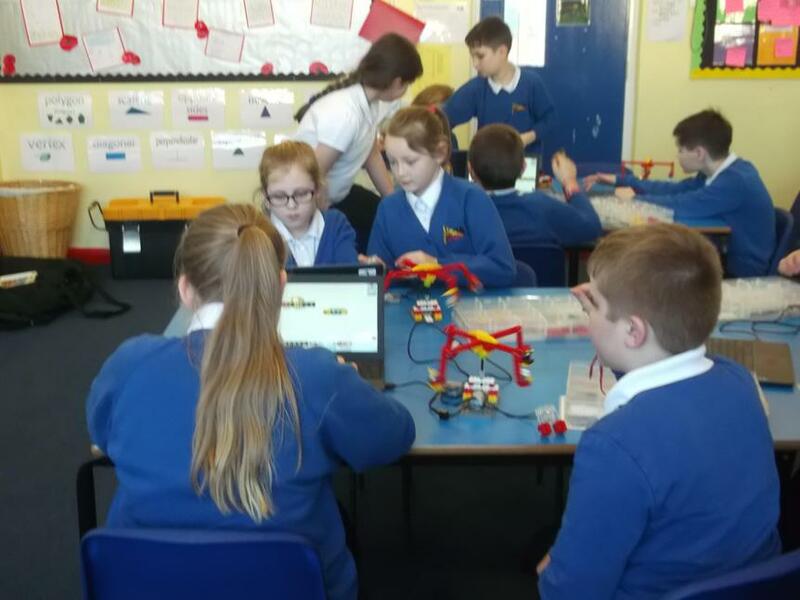 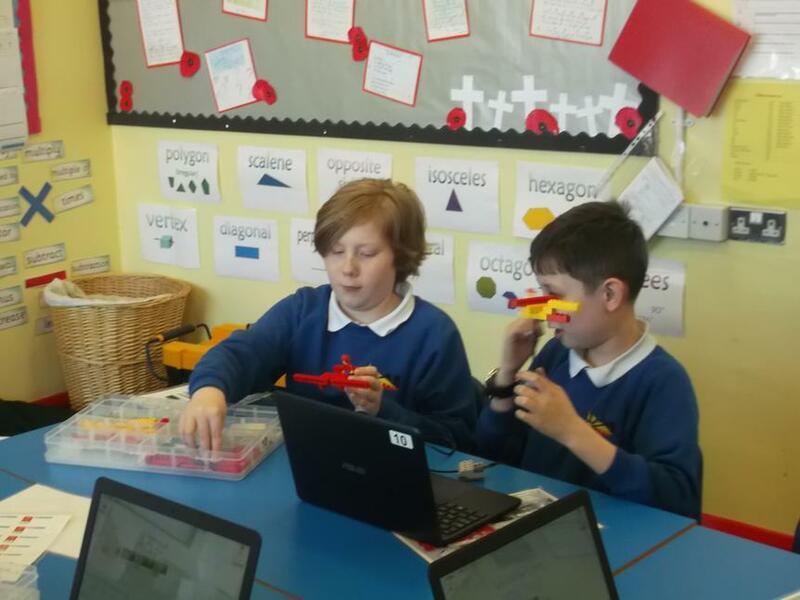 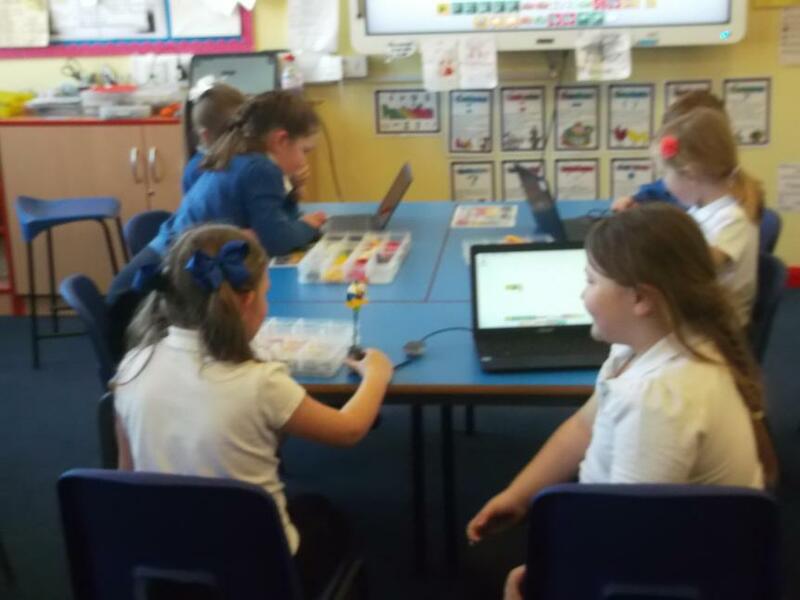 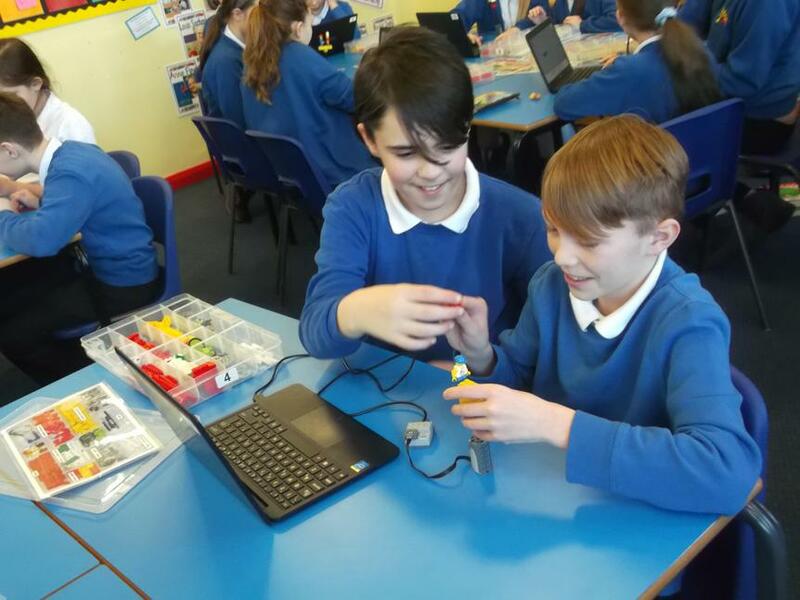 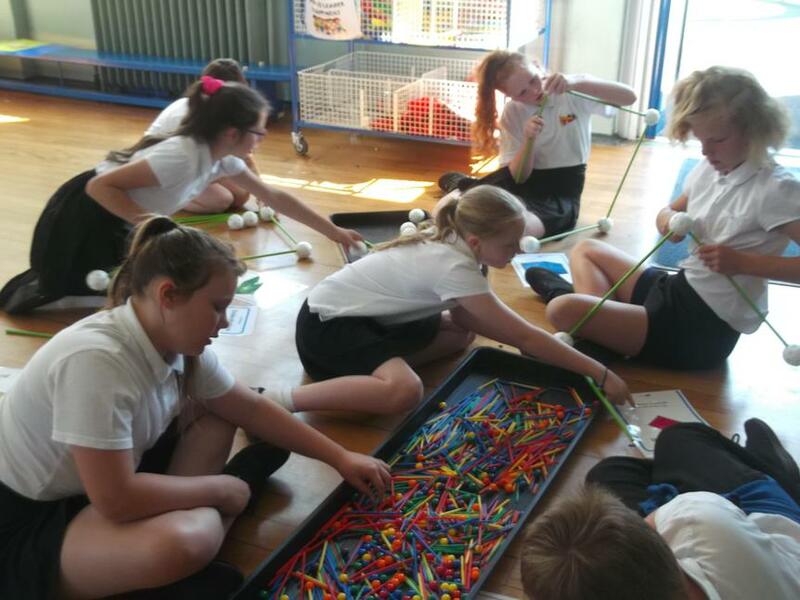 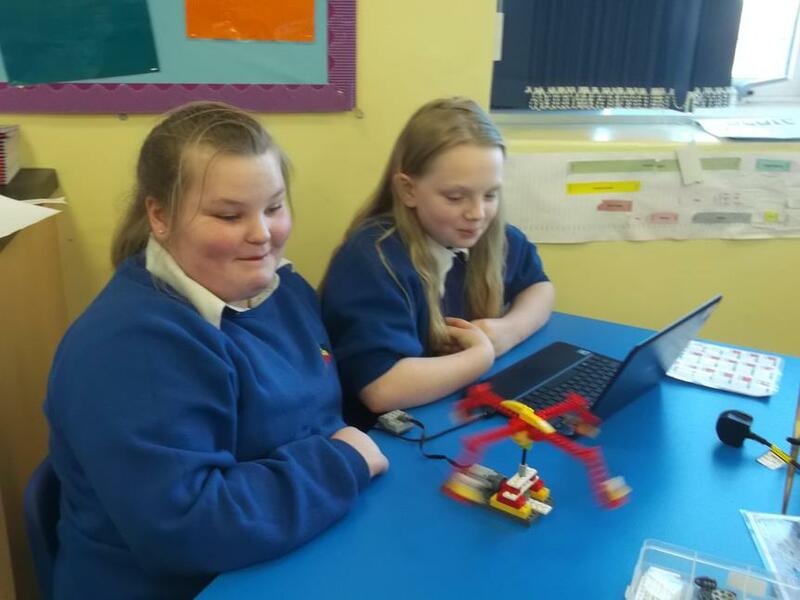 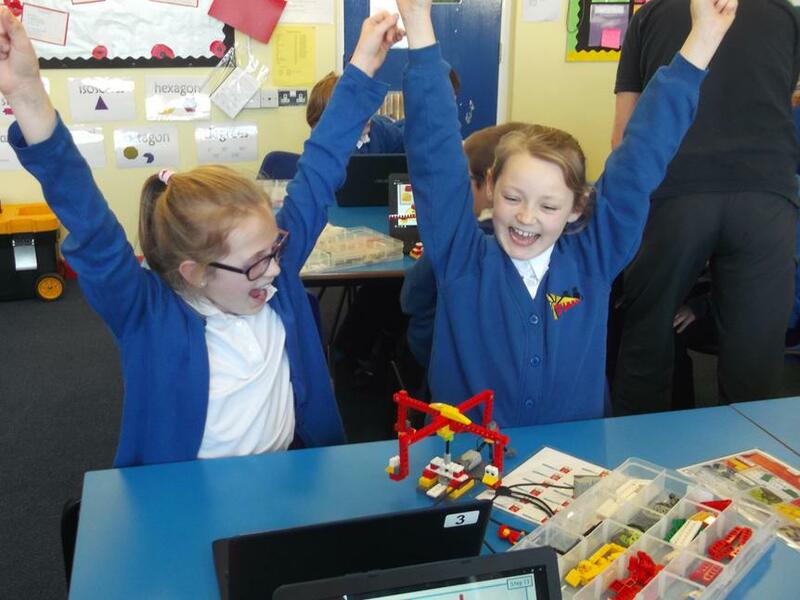 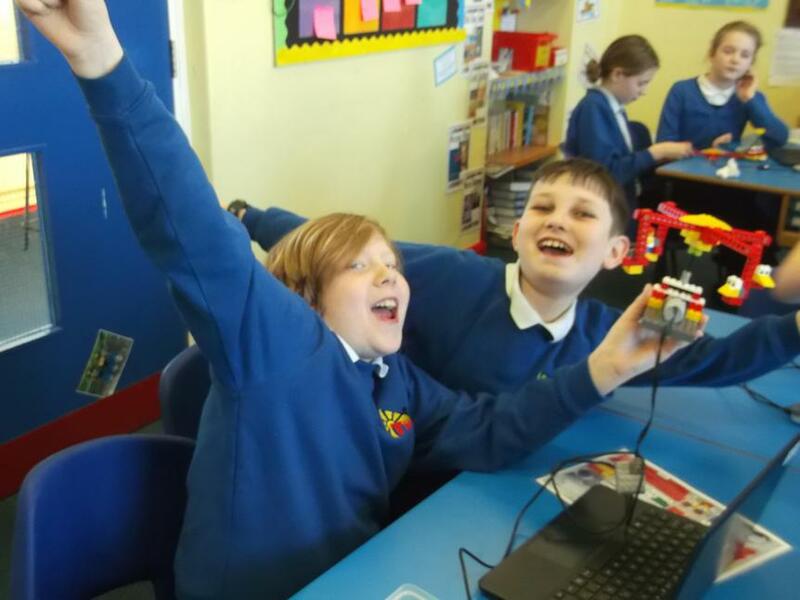 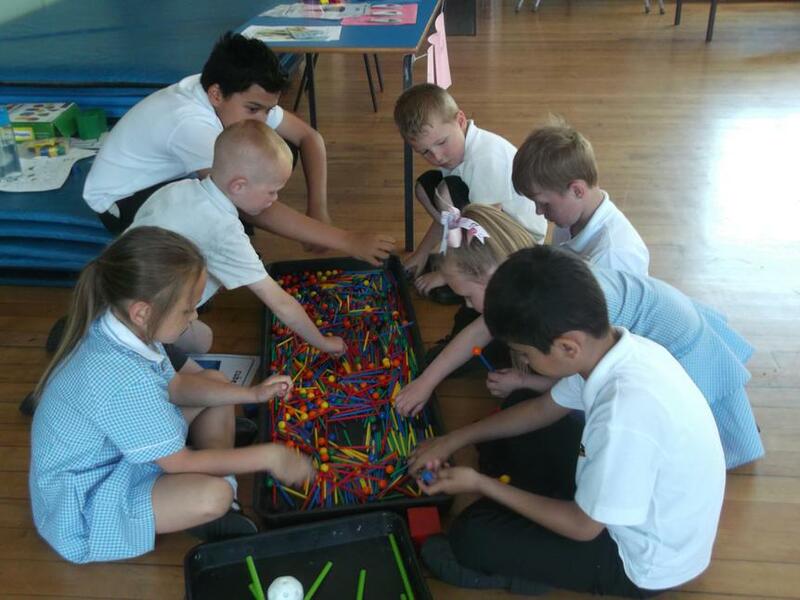 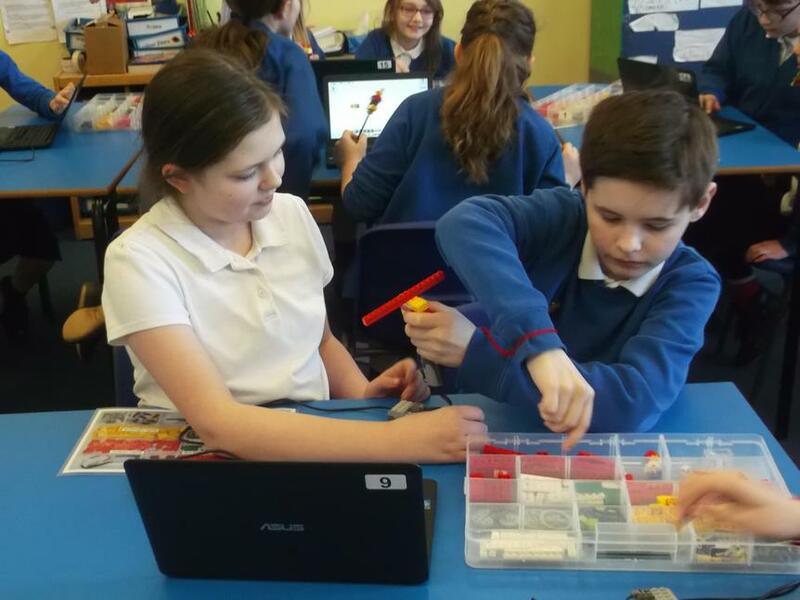 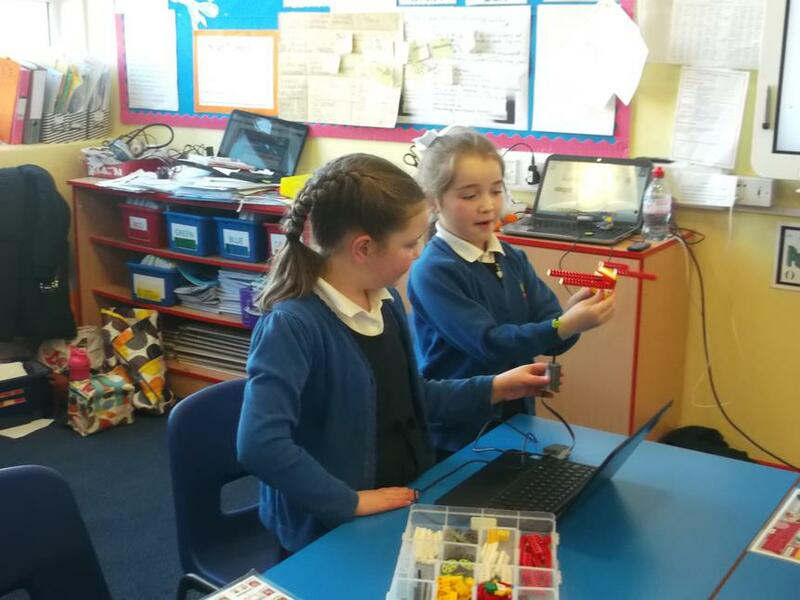 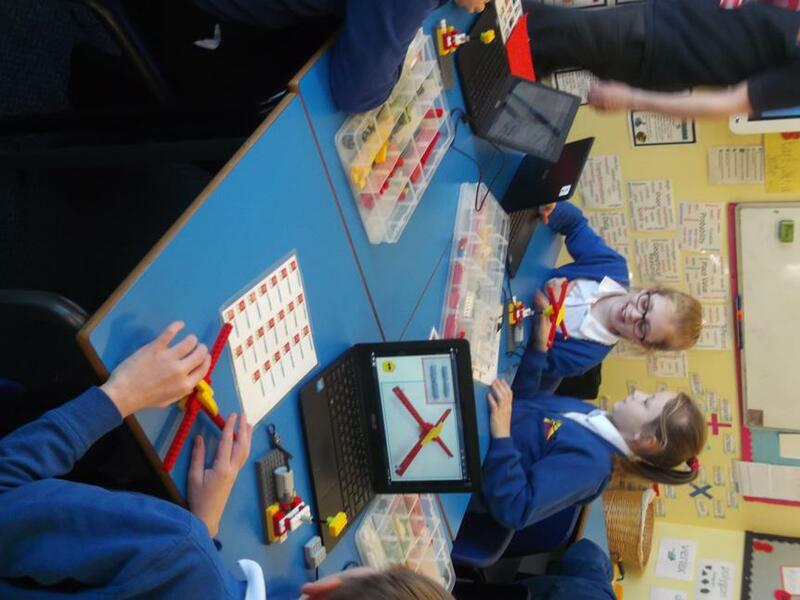 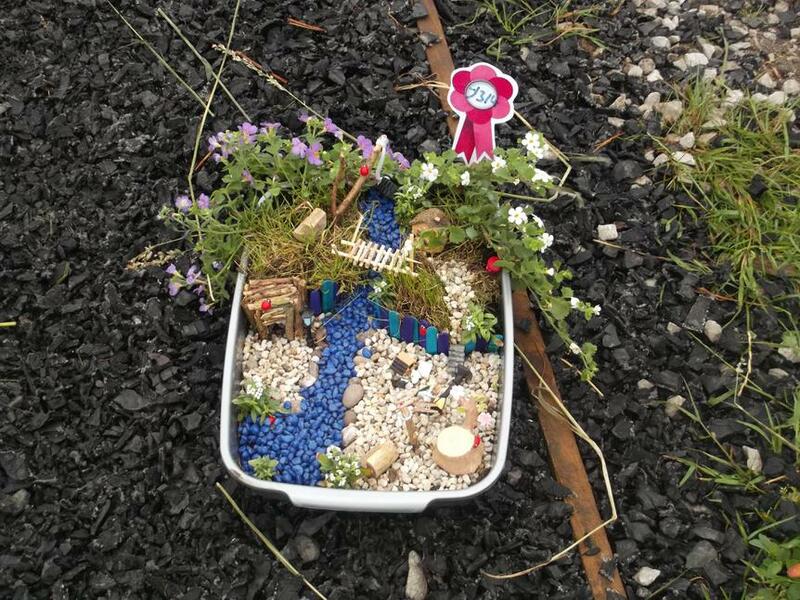 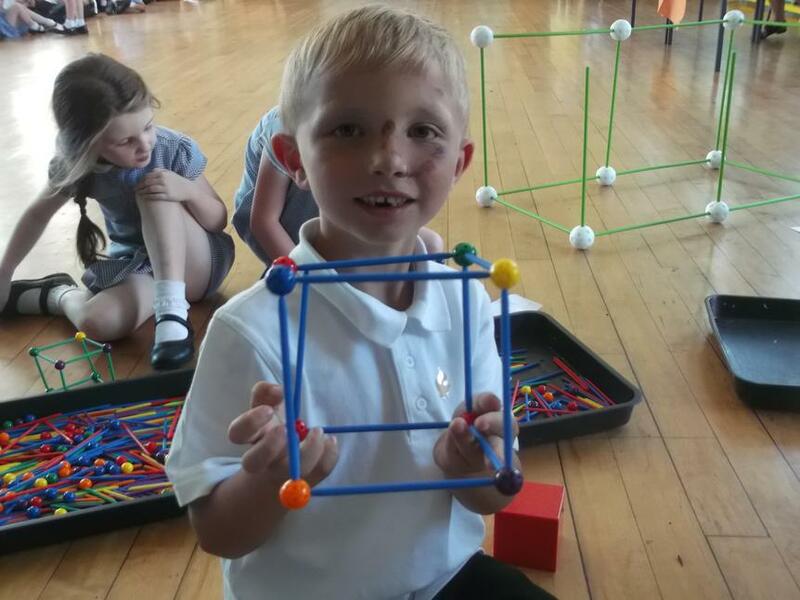 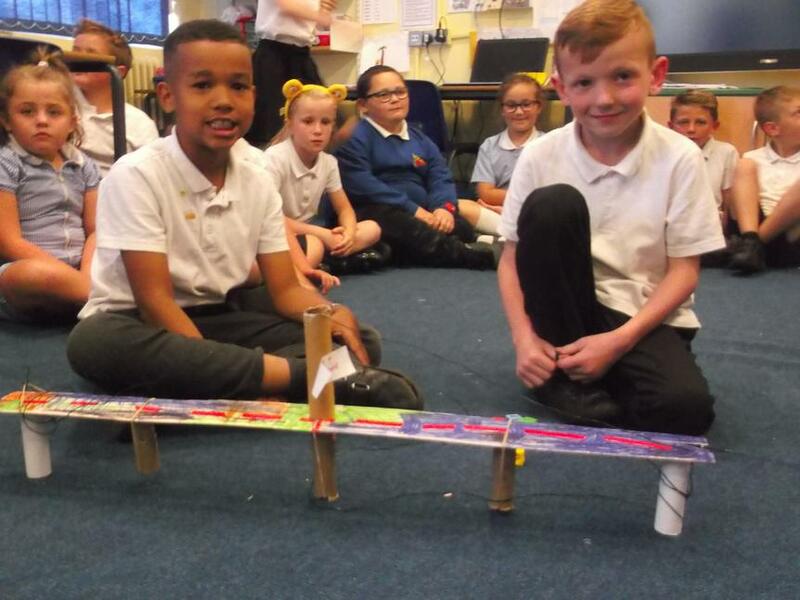 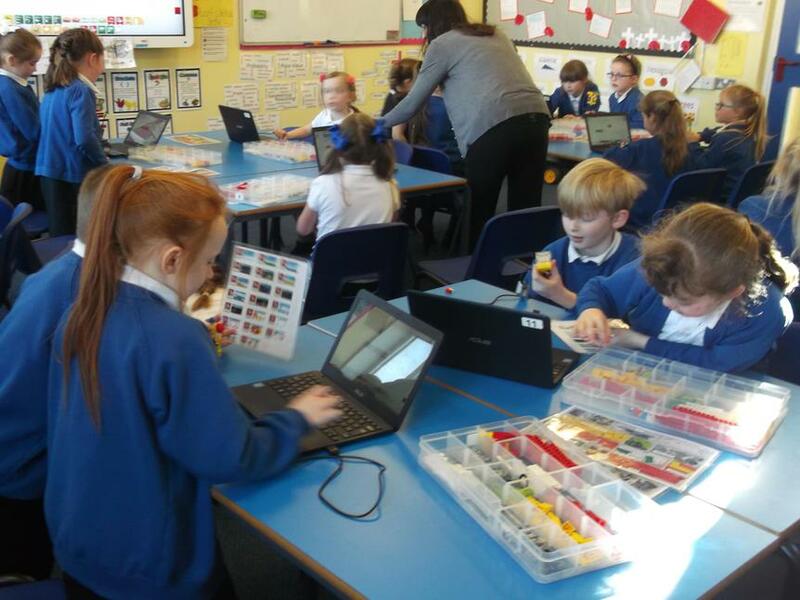 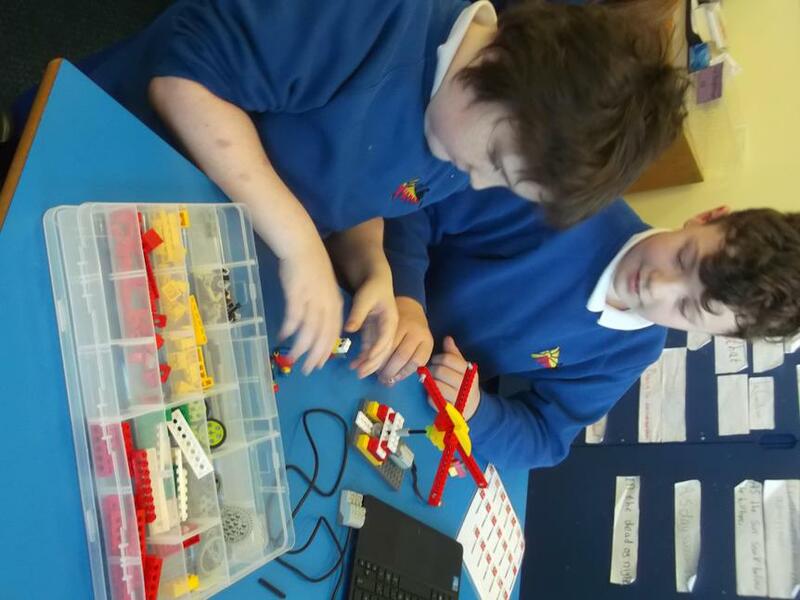 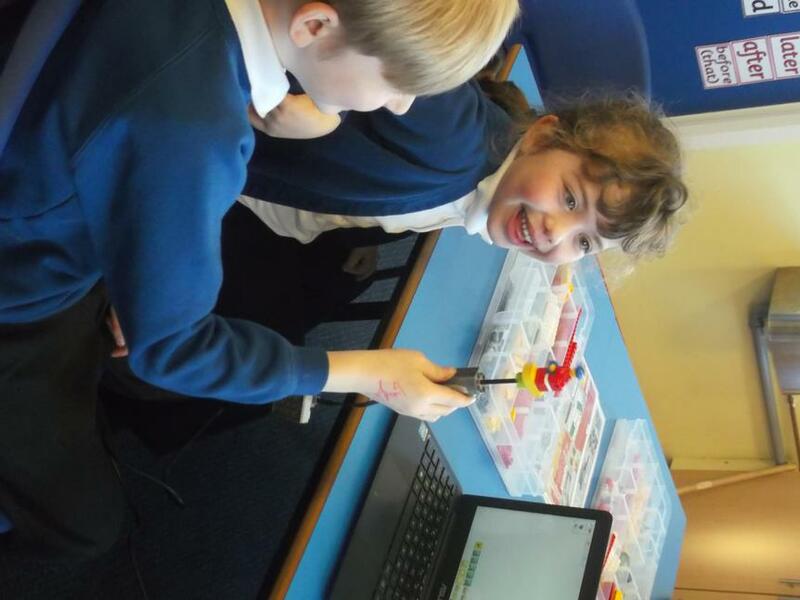 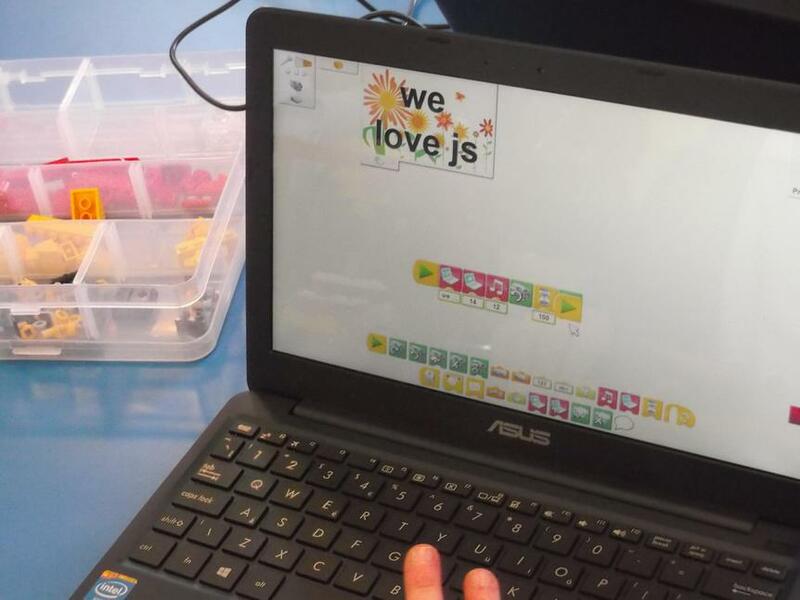 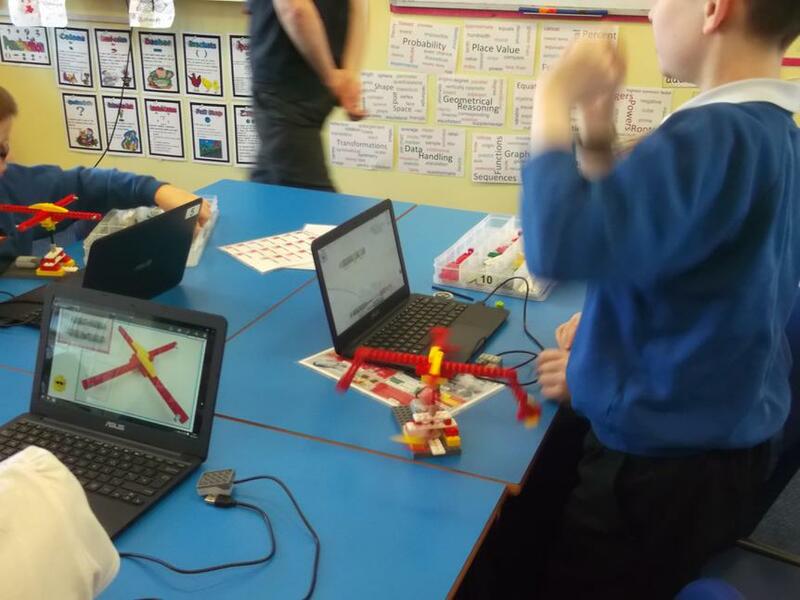 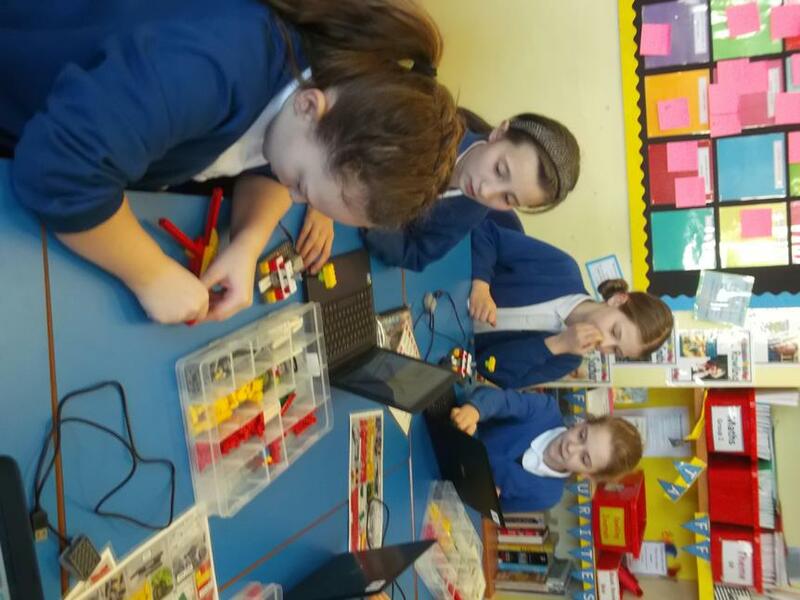 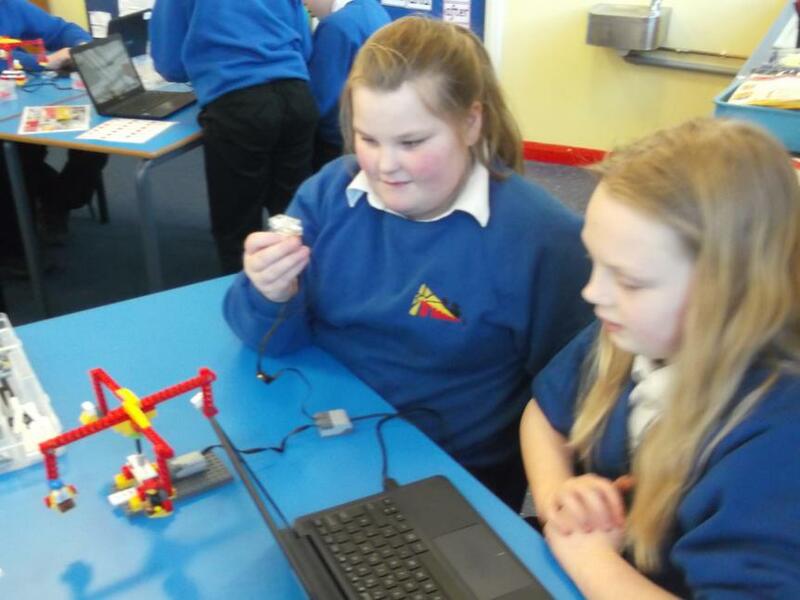 The children have been busy from start to finish with array of challenging and hands on activities including an active maths relay on the forest school area, a super maths workshop to get their brains goings and yet another amazing Lego STEM engineering workshop! 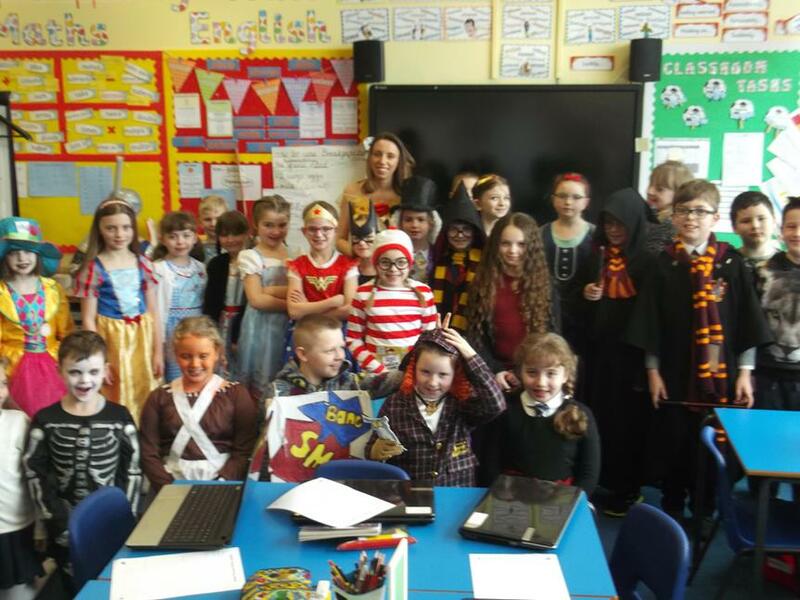 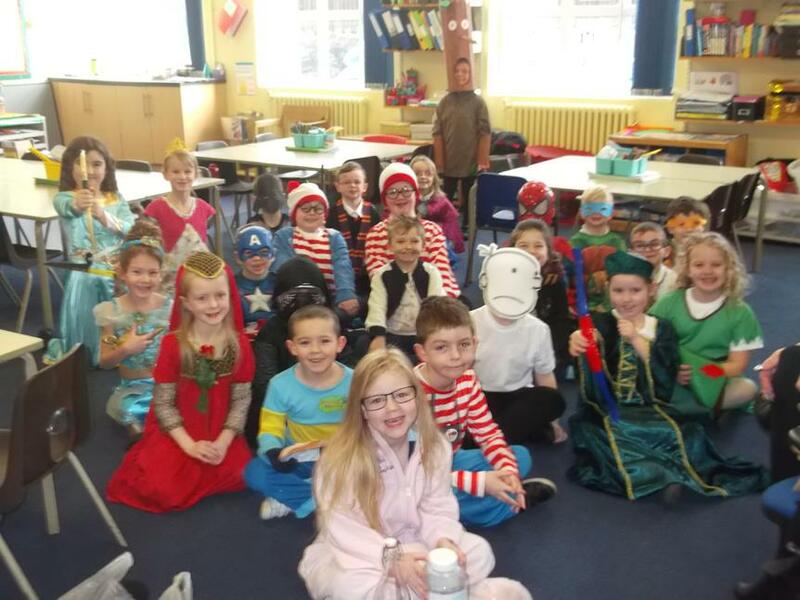 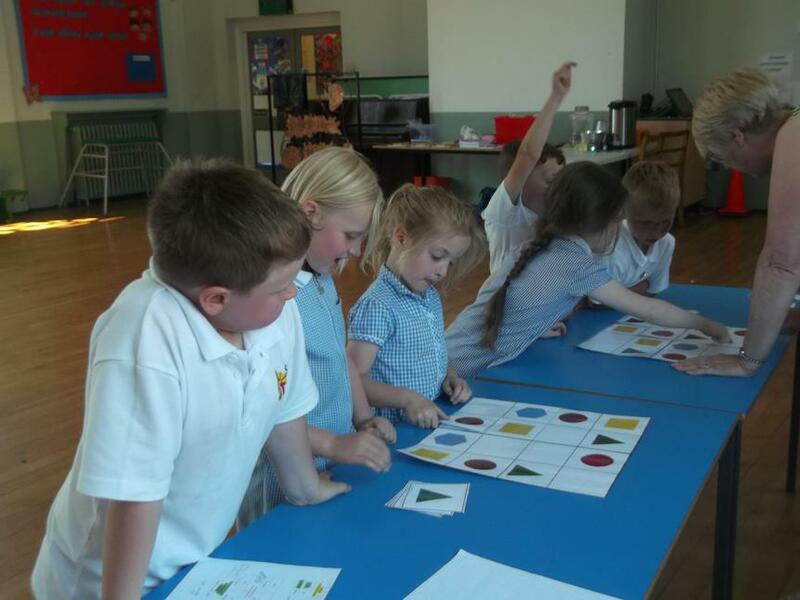 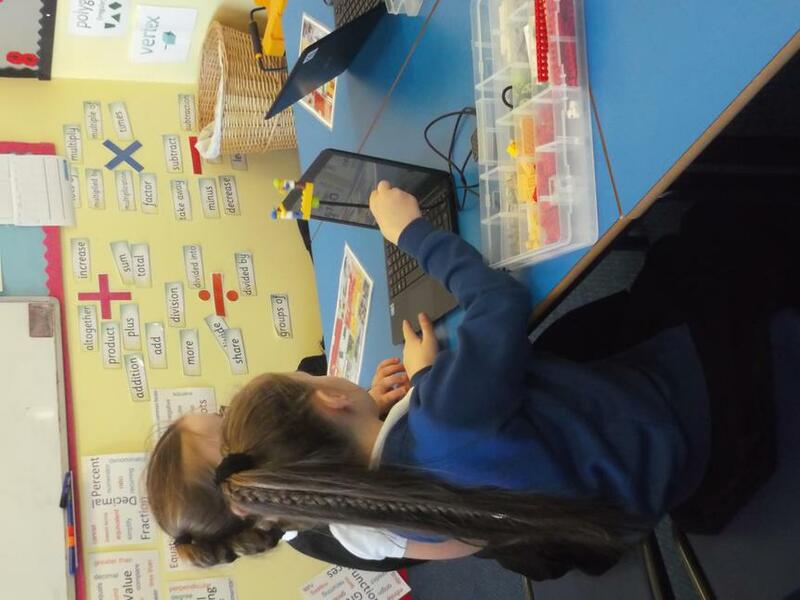 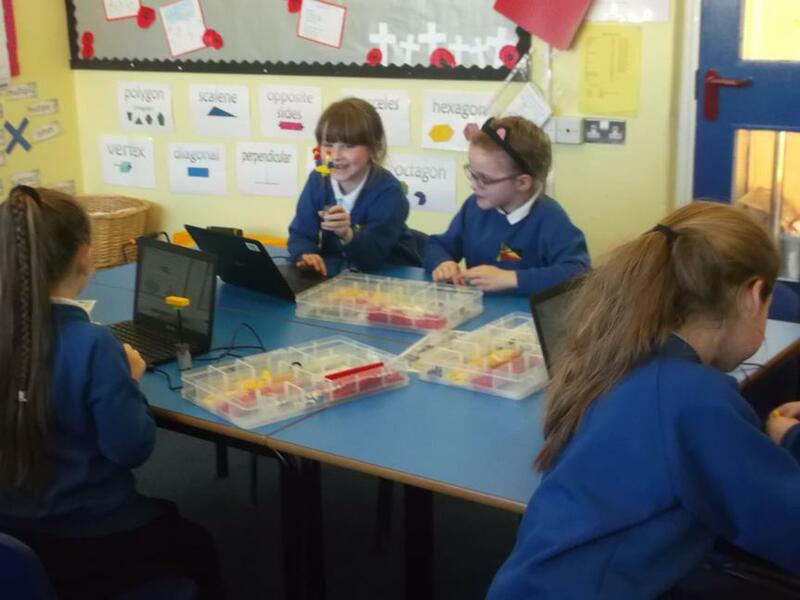 On Friday children did a great job coming to school in a colour of their choice so that each class could complete their data collection challenges as part of 'Colour Day'. 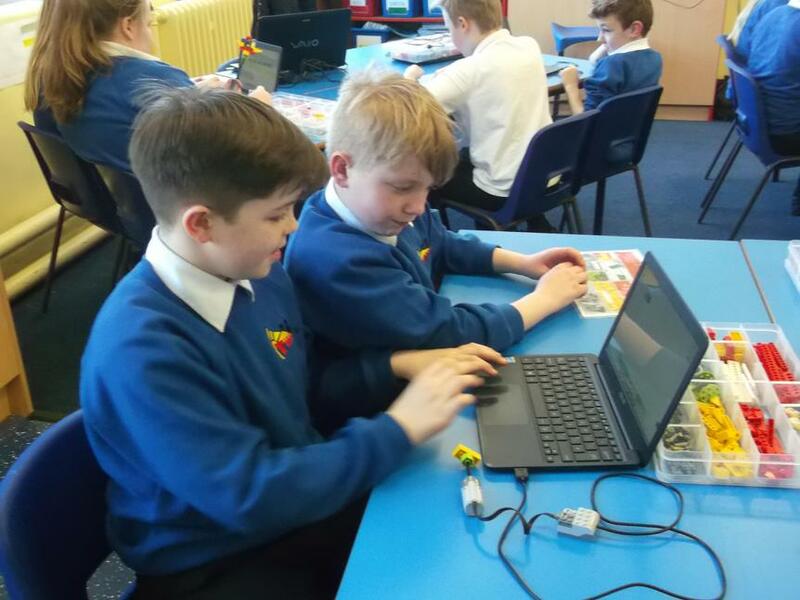 Over the week, each class learnt about a different famous name in the STEM industry, some being Bill Gates, Charles Darwin, Tim Peak and David Attenborough! 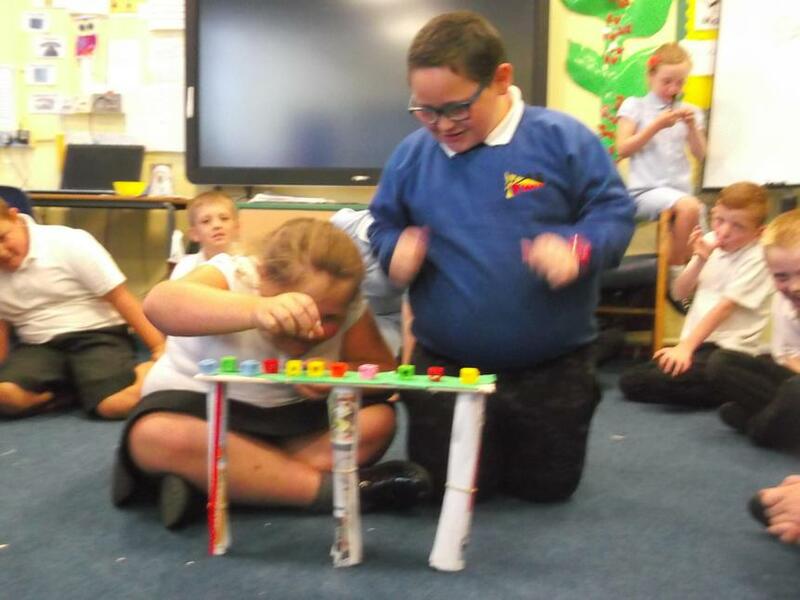 The children did a great job showcasing what they had learnt in the STEM celebration assembly. 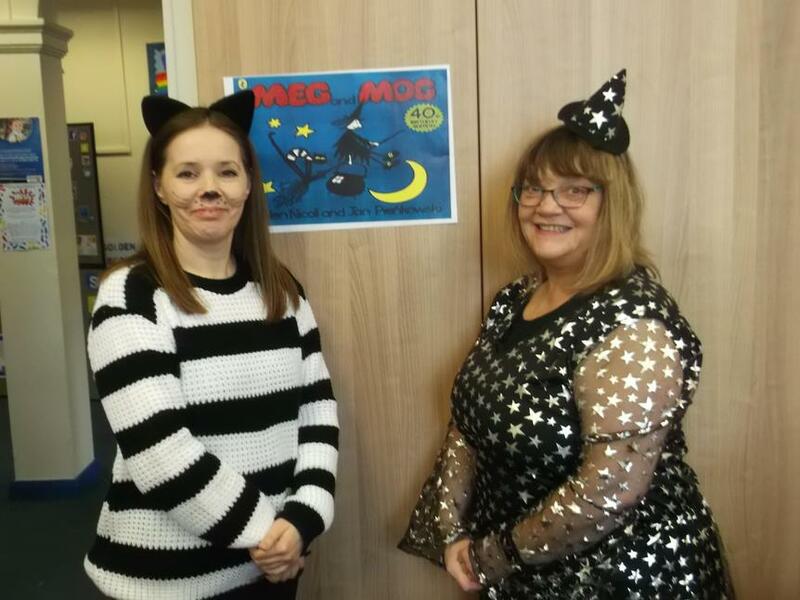 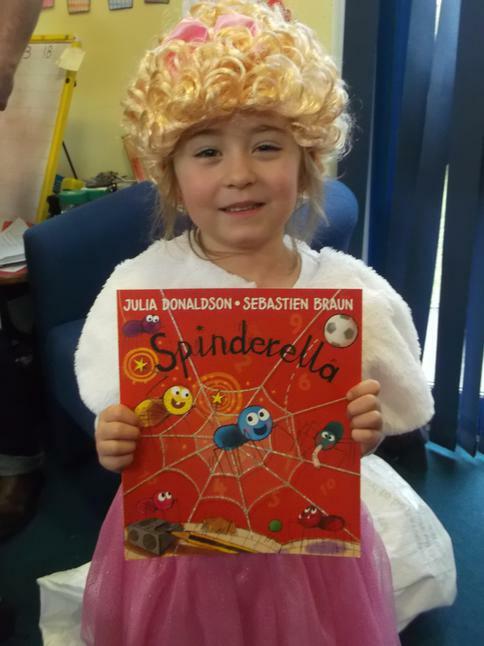 The children were buzzing through the school all week with positive comments all around. 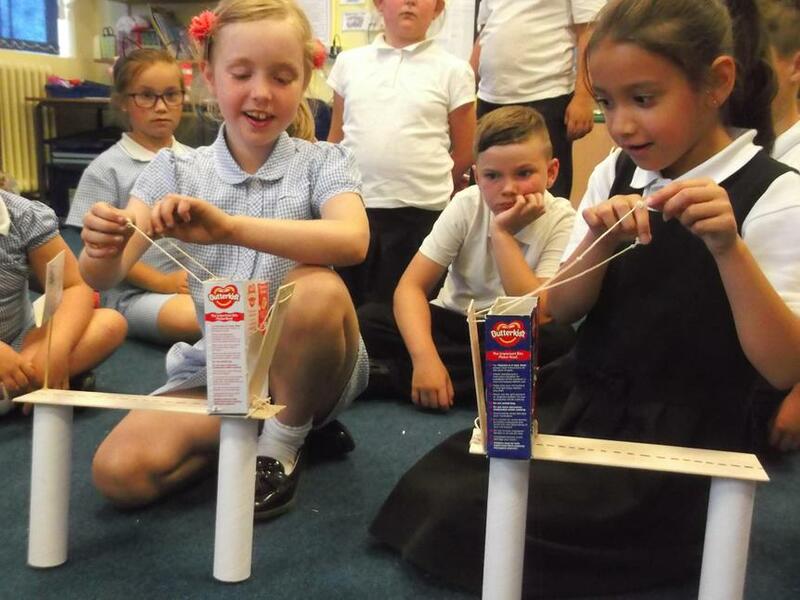 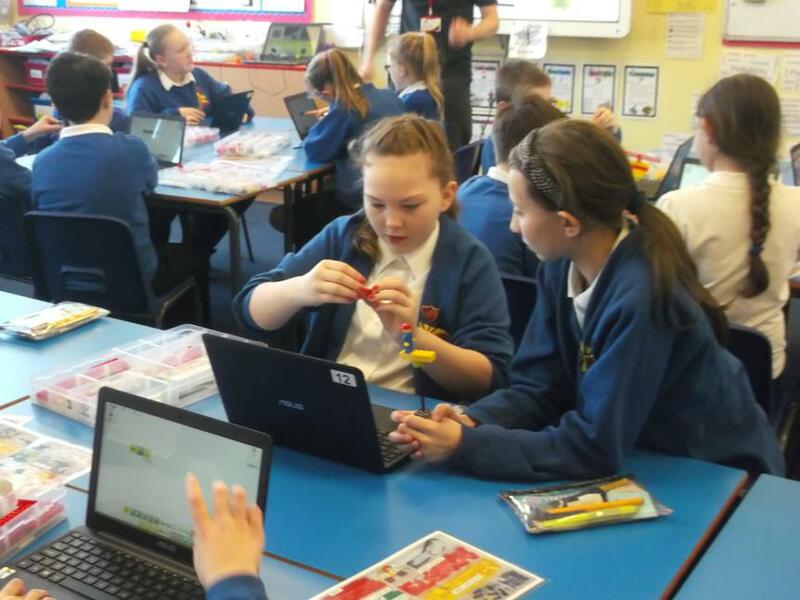 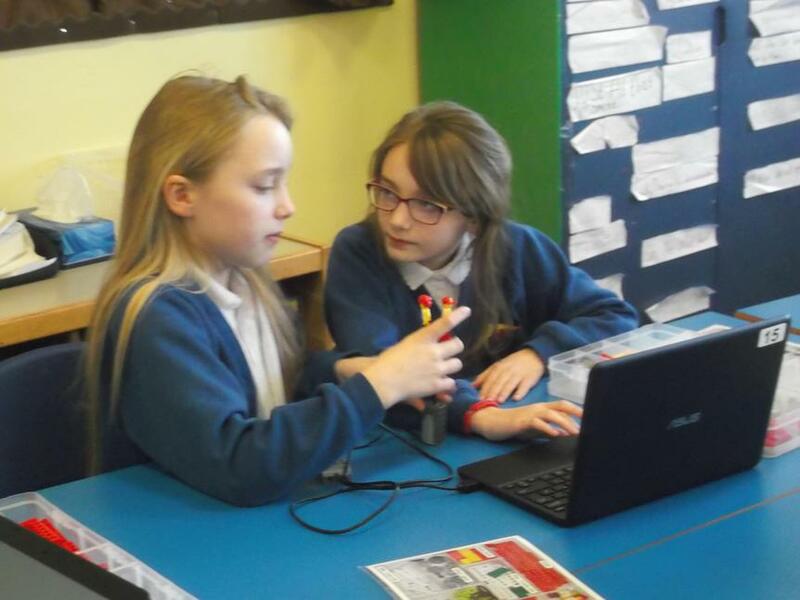 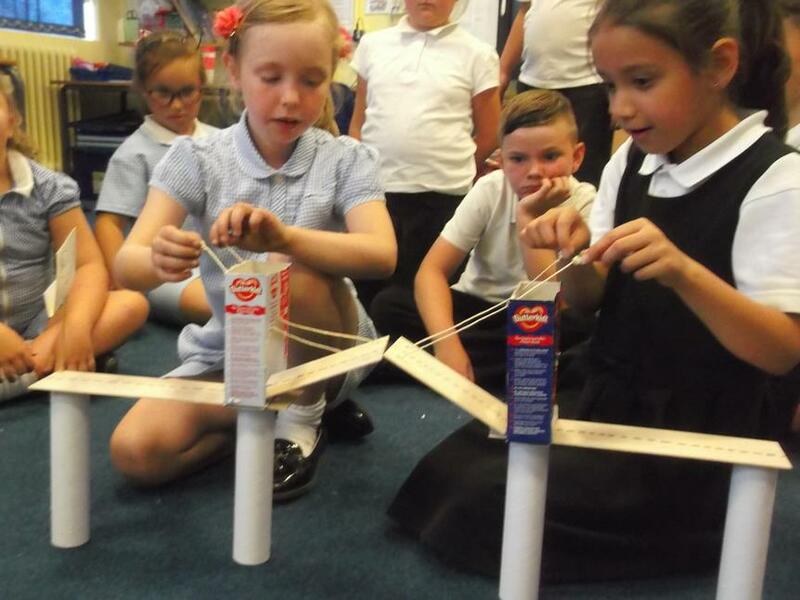 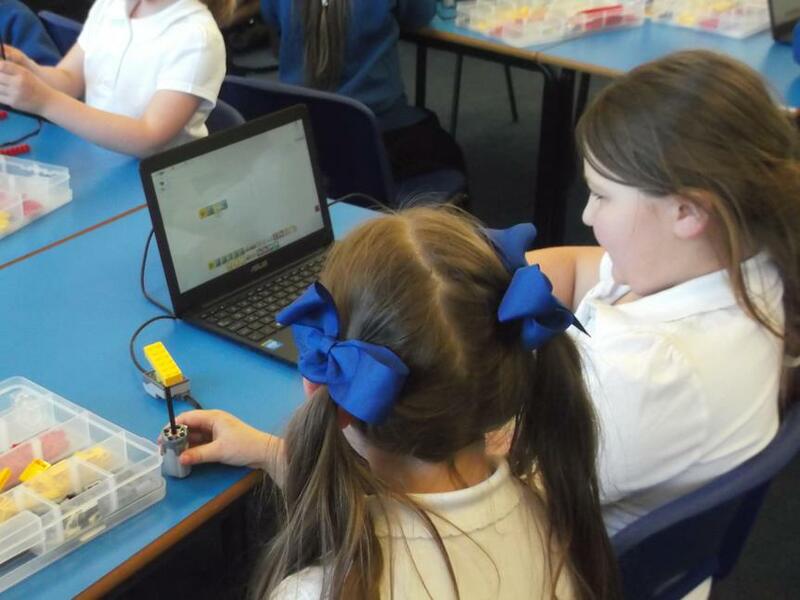 We saw some budding engineers in the making and it was lovely to see children realize the potential careers available for their futures! 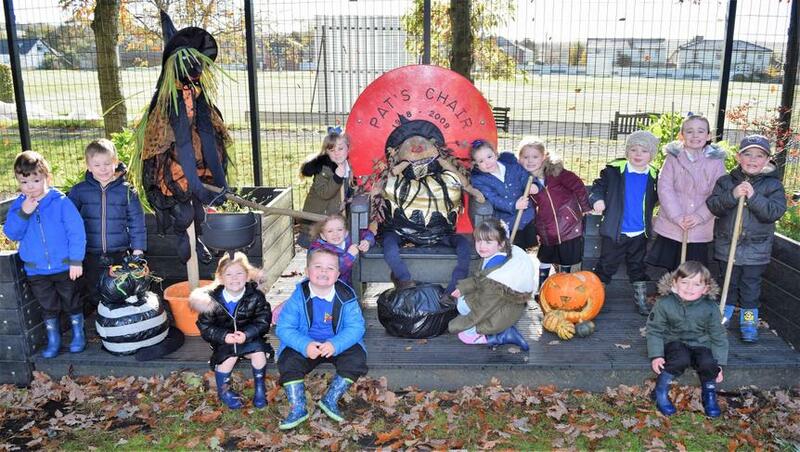 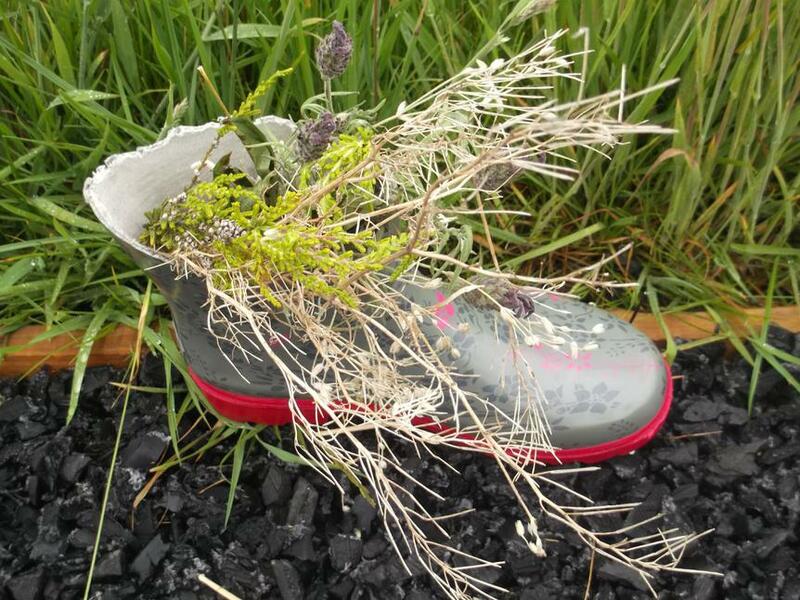 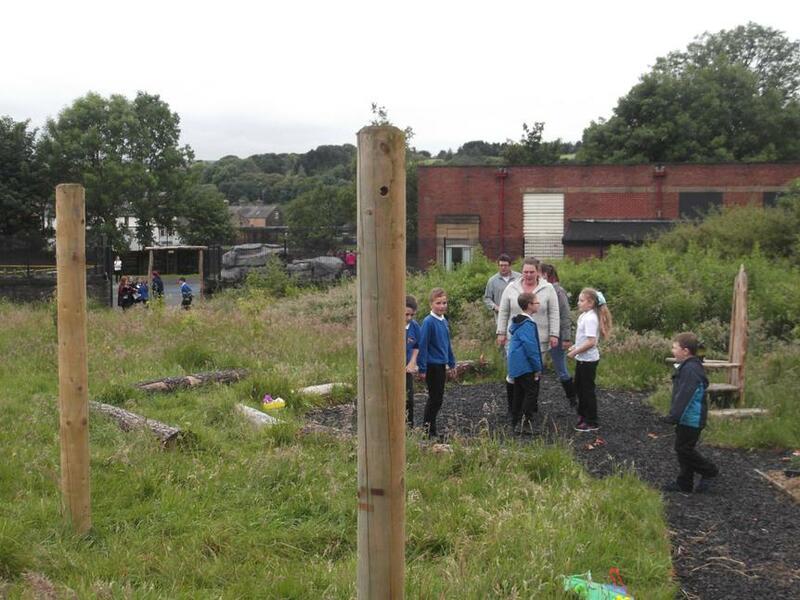 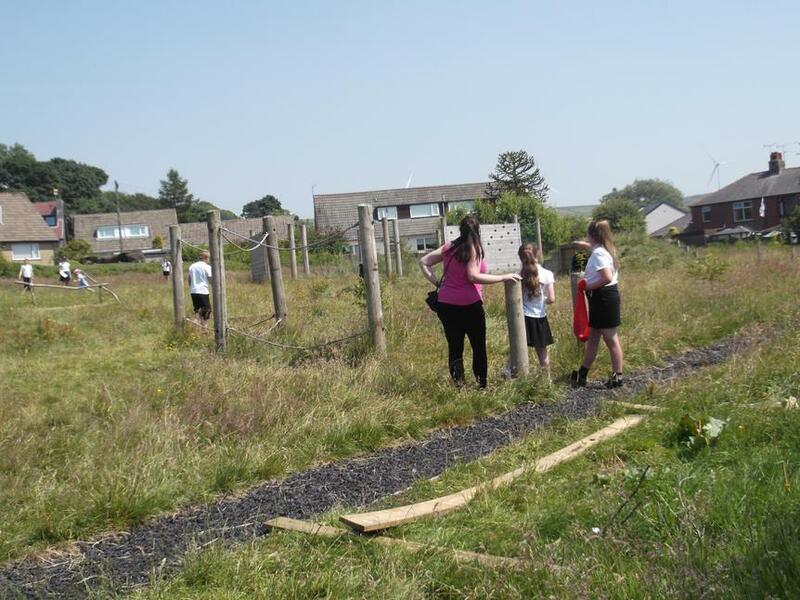 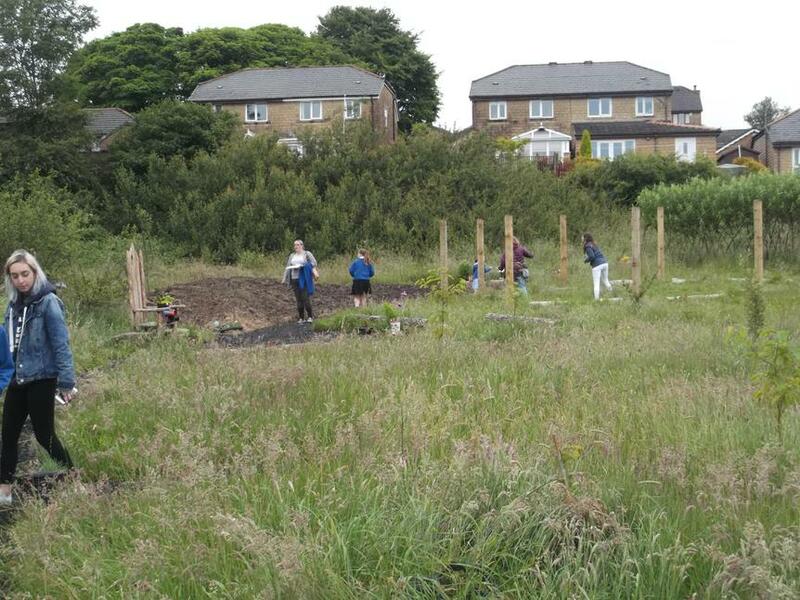 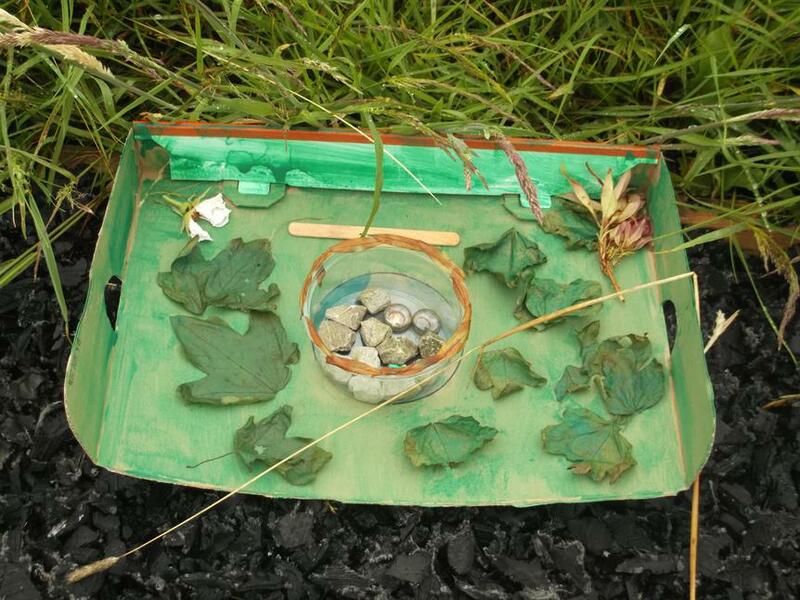 Thorn Primary have been awarded the 'Sharing Schools' award for all the activities completed in the forest school grounds by children and their families. 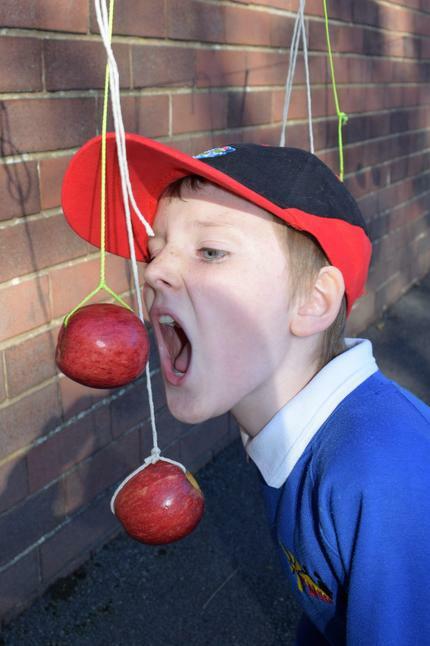 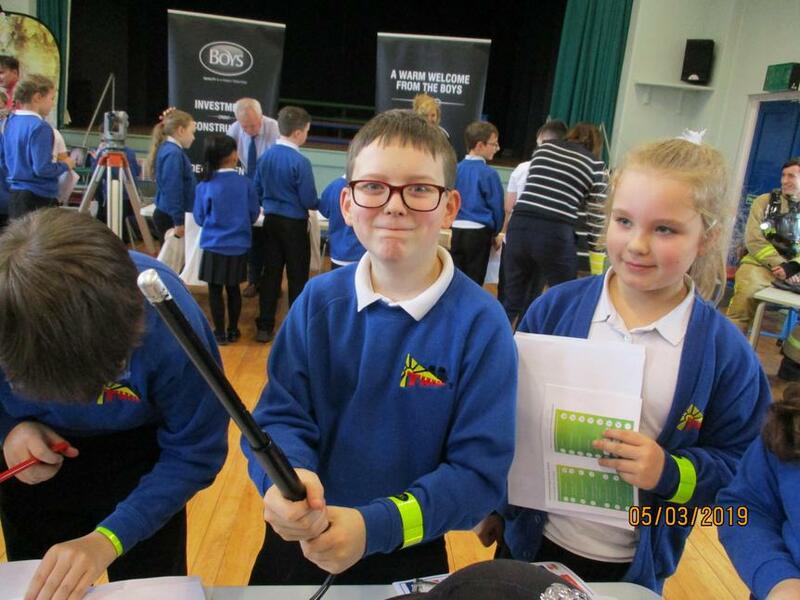 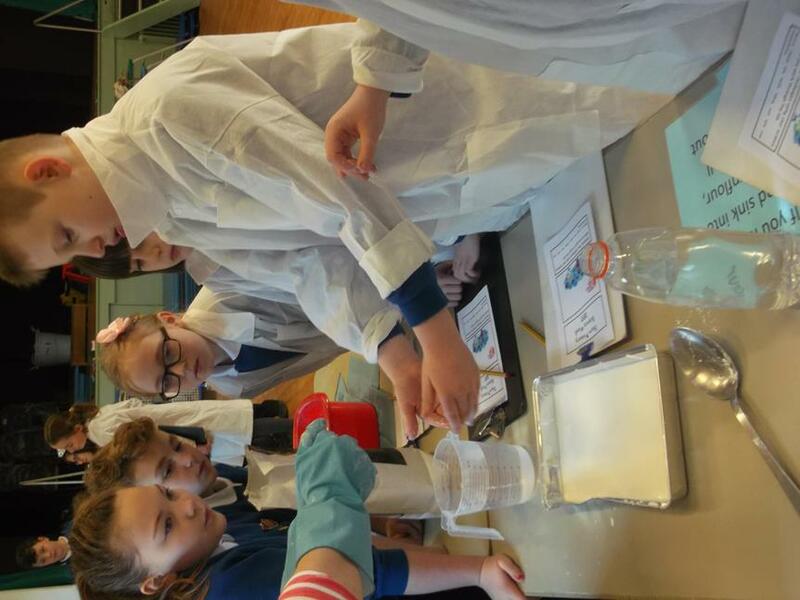 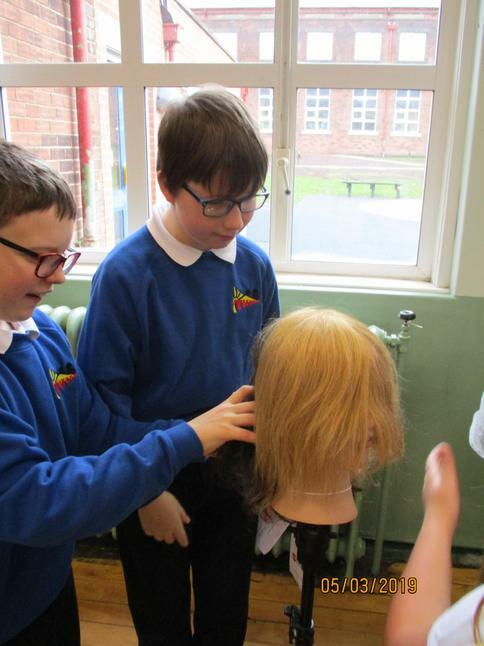 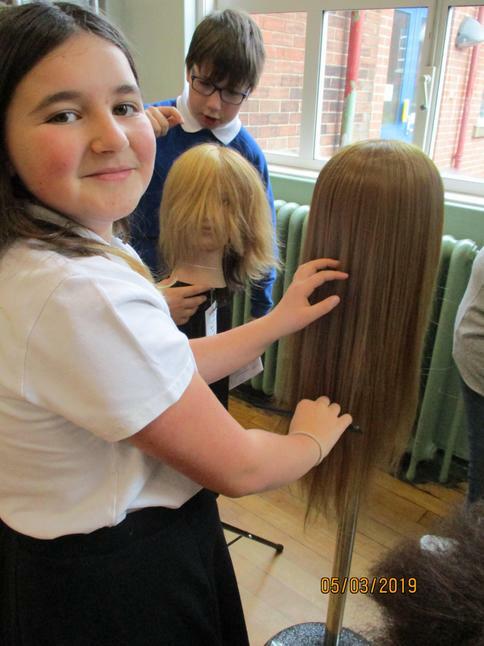 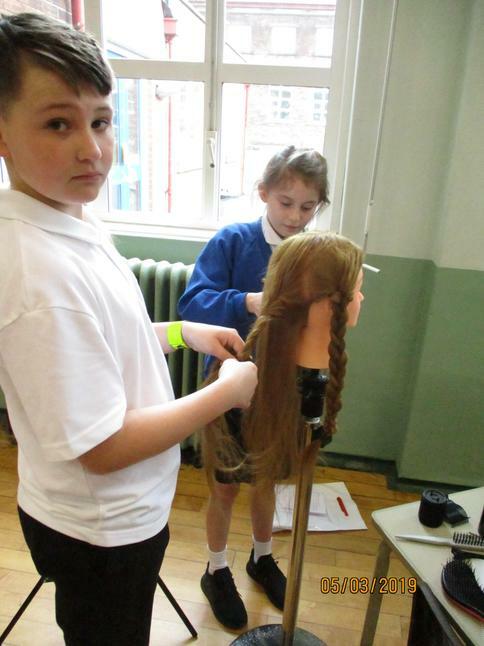 Eight children who have excelled in forest schools were selected to visit the Lancashire Science Festival at UCLAN to attend the awards ceremony and take part in various workshops. 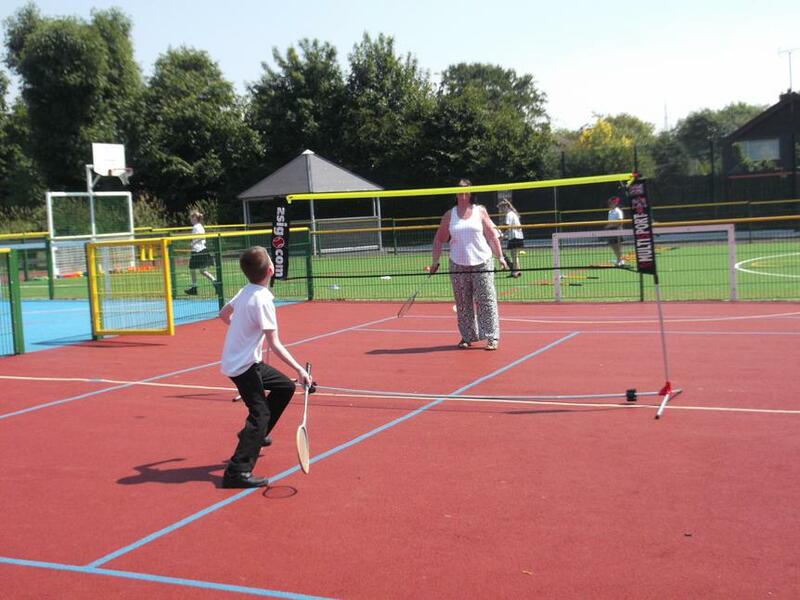 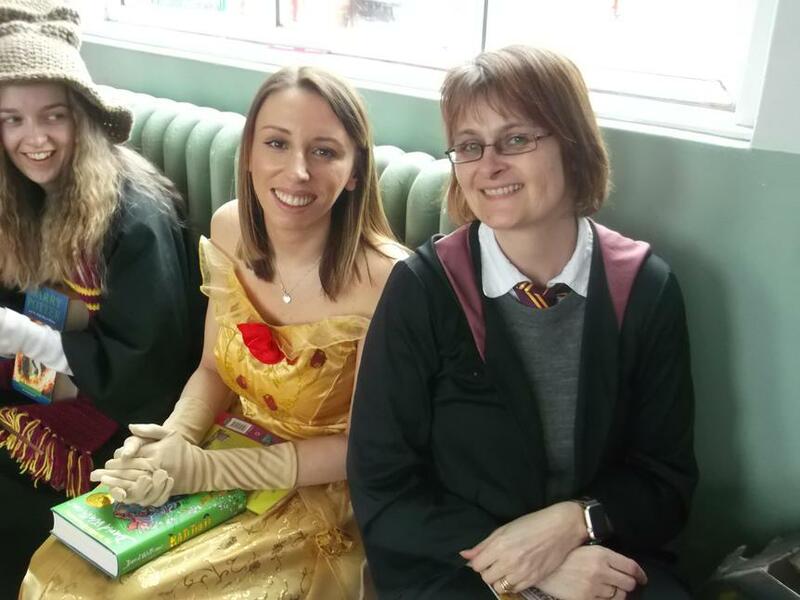 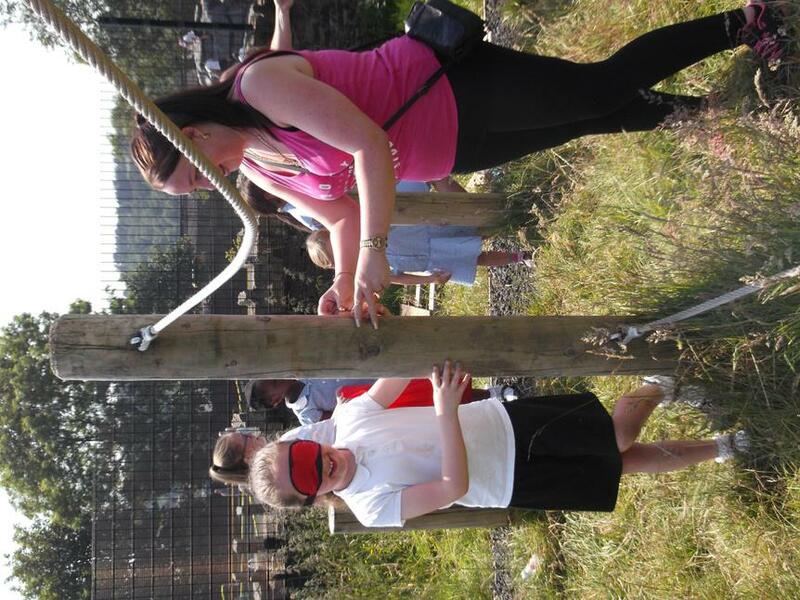 A great day was had by all and the children were a credit to our school. 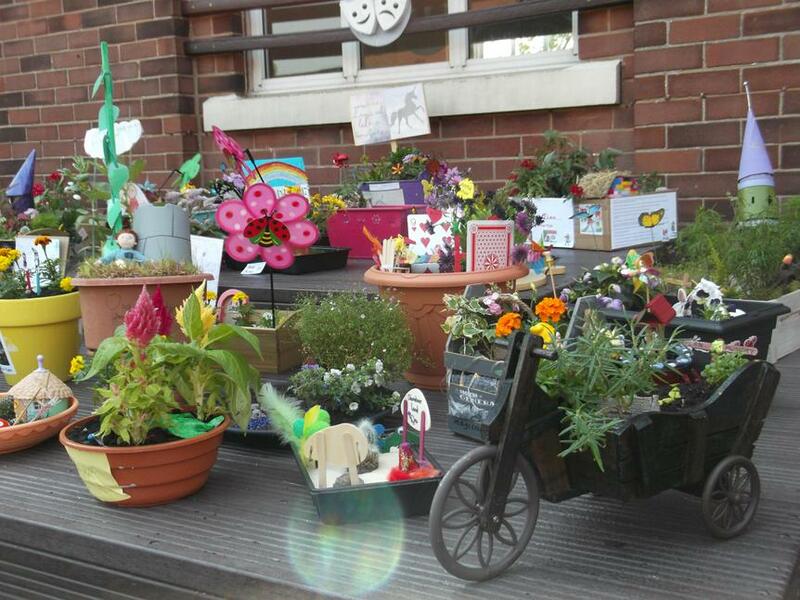 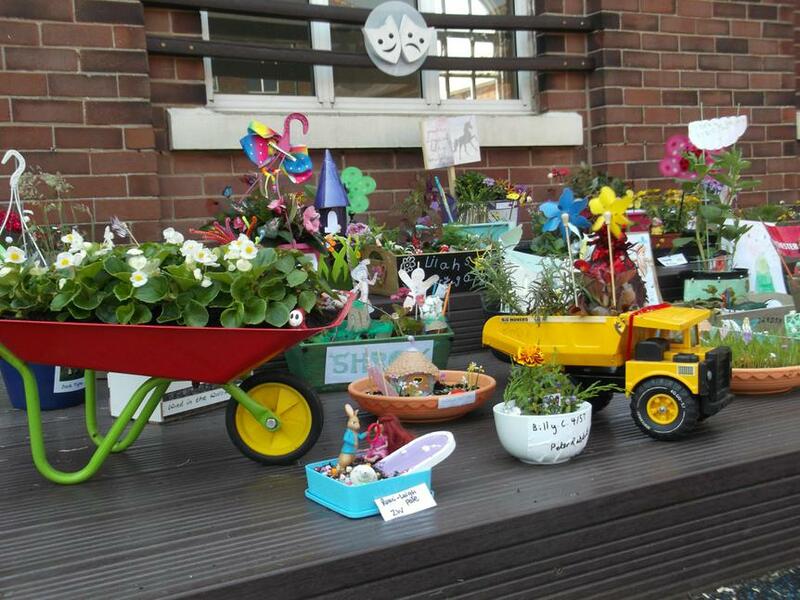 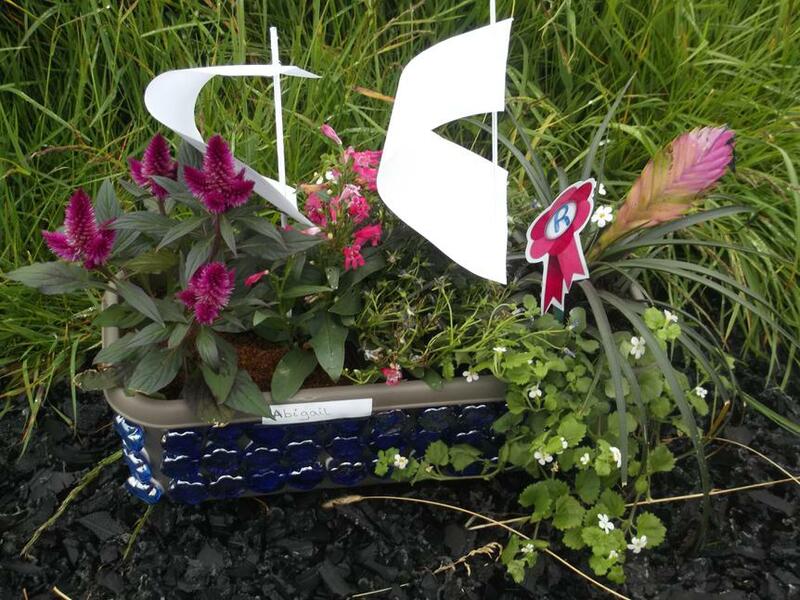 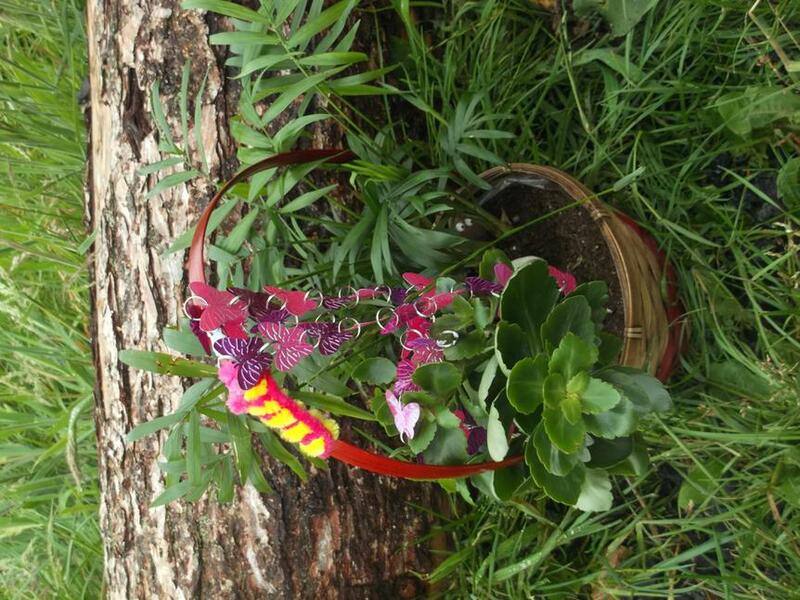 Children, parents and staff had a wonderful time at our annual flower festival. 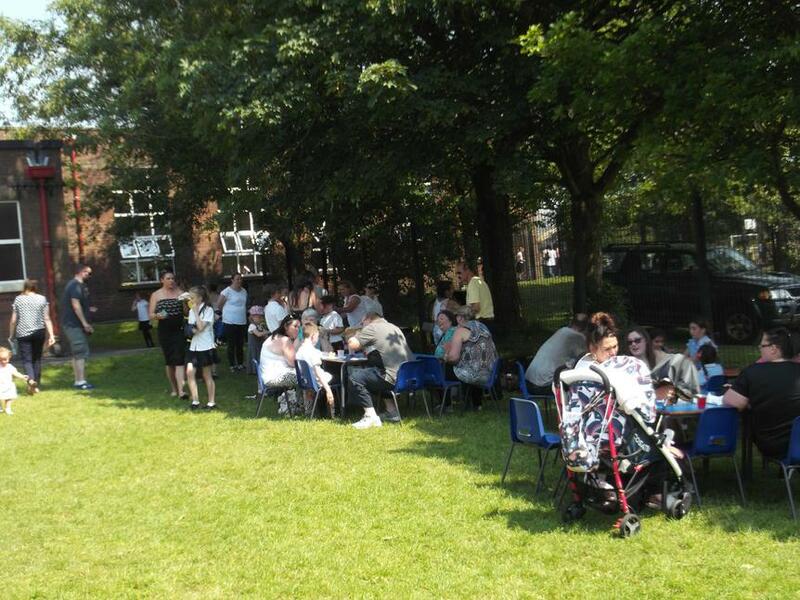 The sun shone and smiles were worn by all! 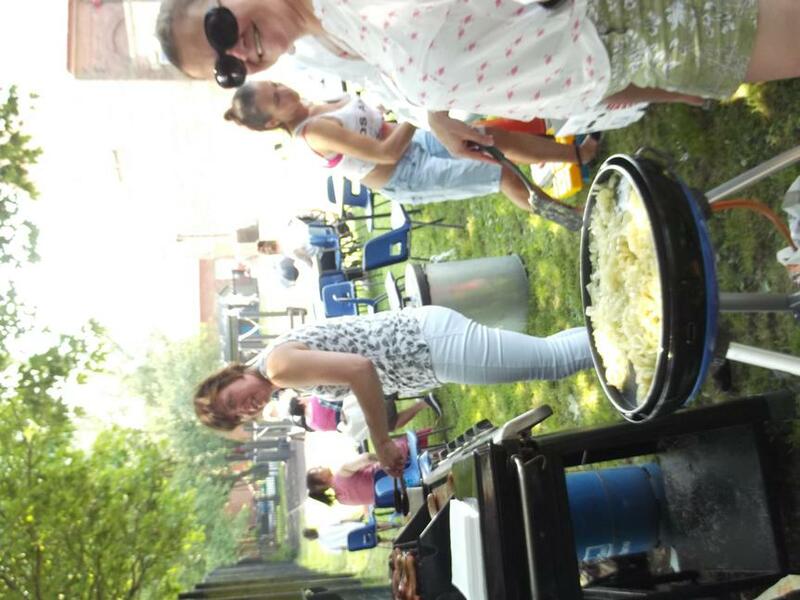 Lots of tasty treats were on offer including delicious sausage sandwiches on the BBQ, cooling ice cream and refreshing drinks. 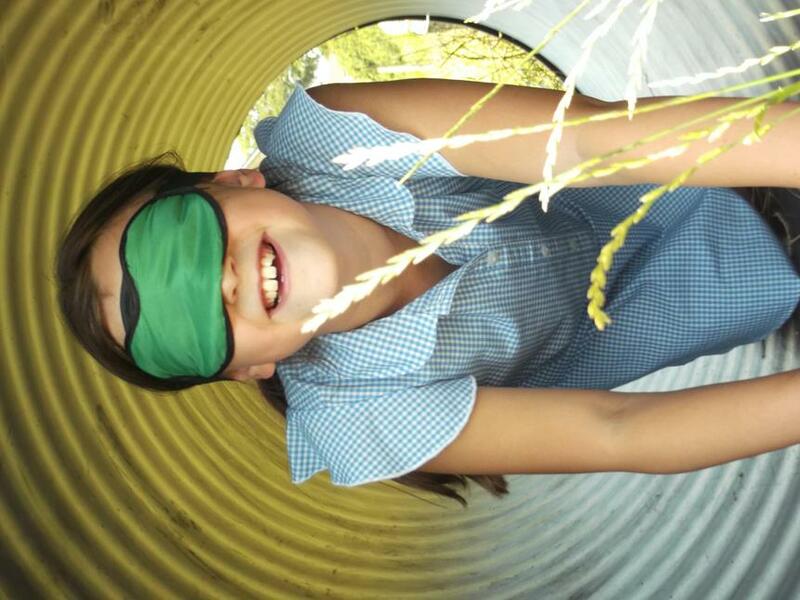 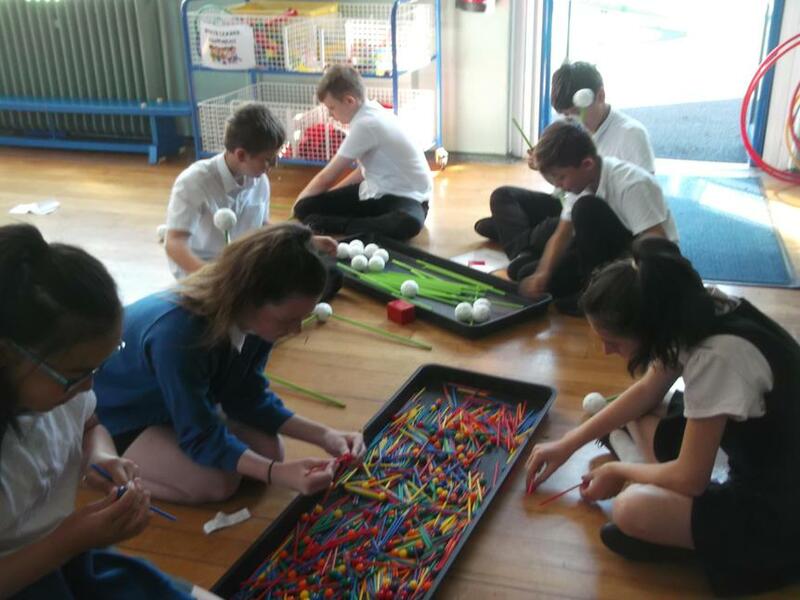 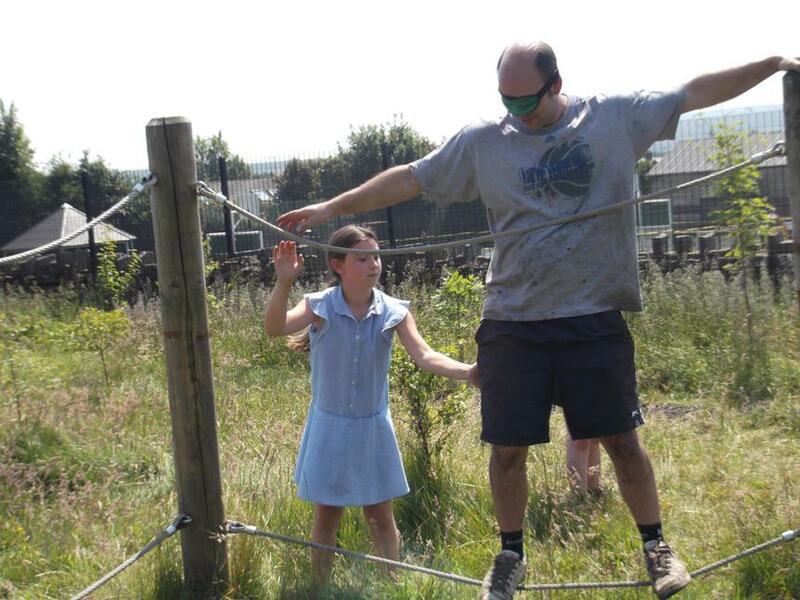 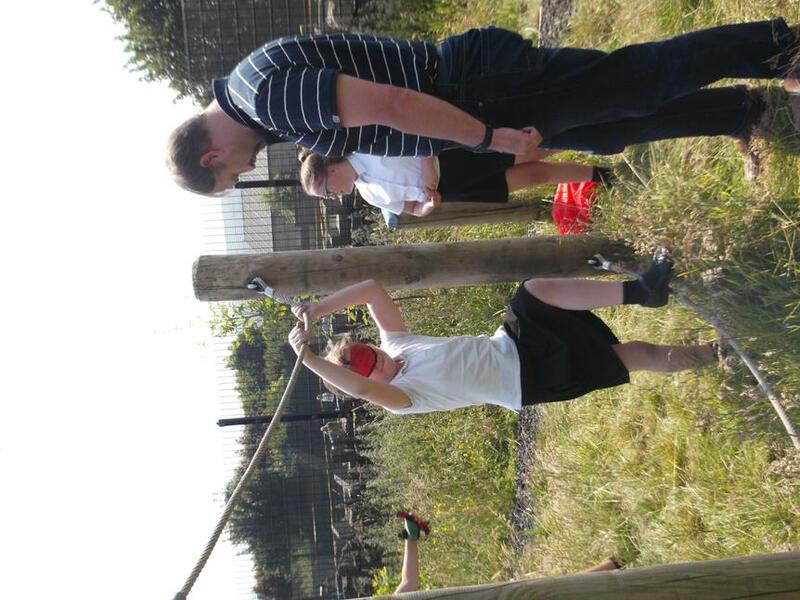 There were lots of activities to enjoy including crazy golf, tennis, basketball and trails and challenges in the forest school area which were led by Year 6 who parents commented were 'informative, kind and helpful'. 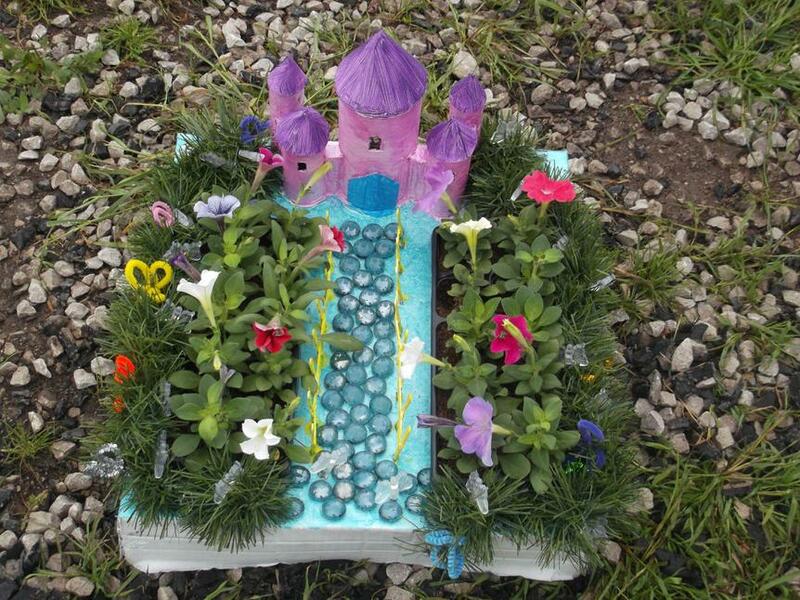 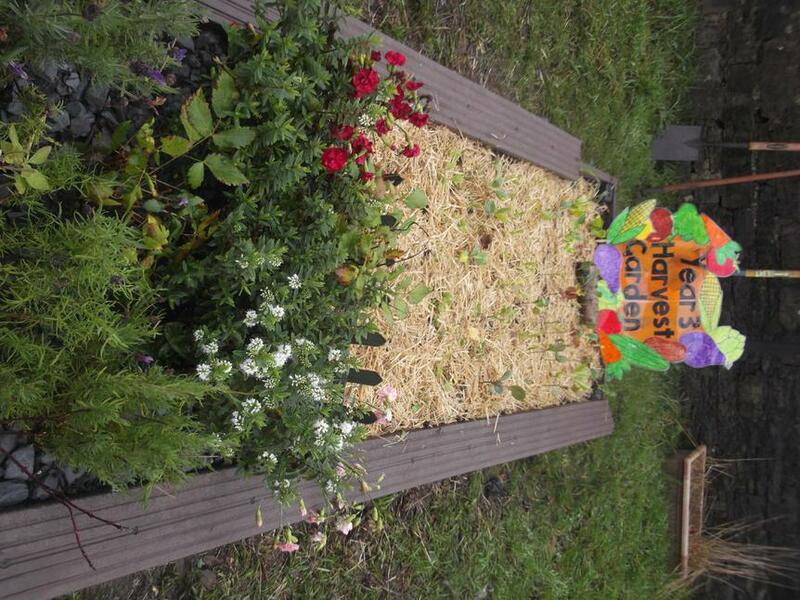 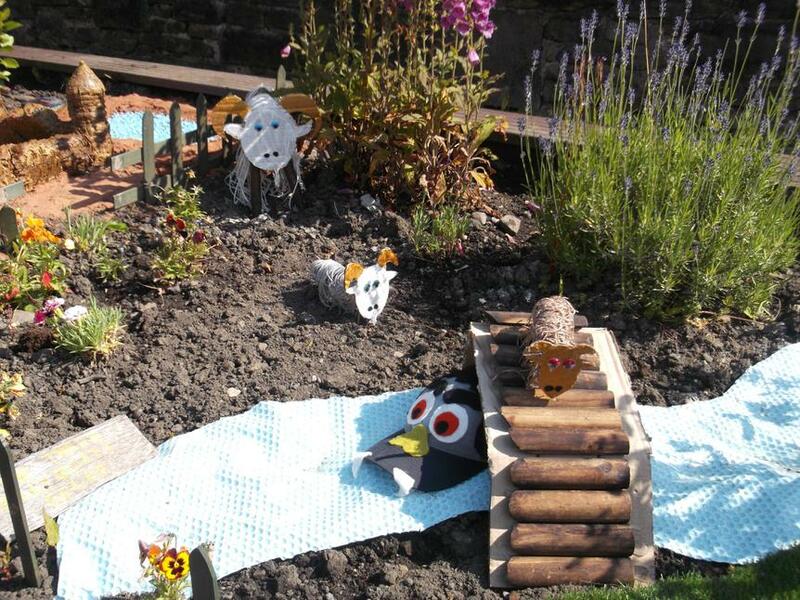 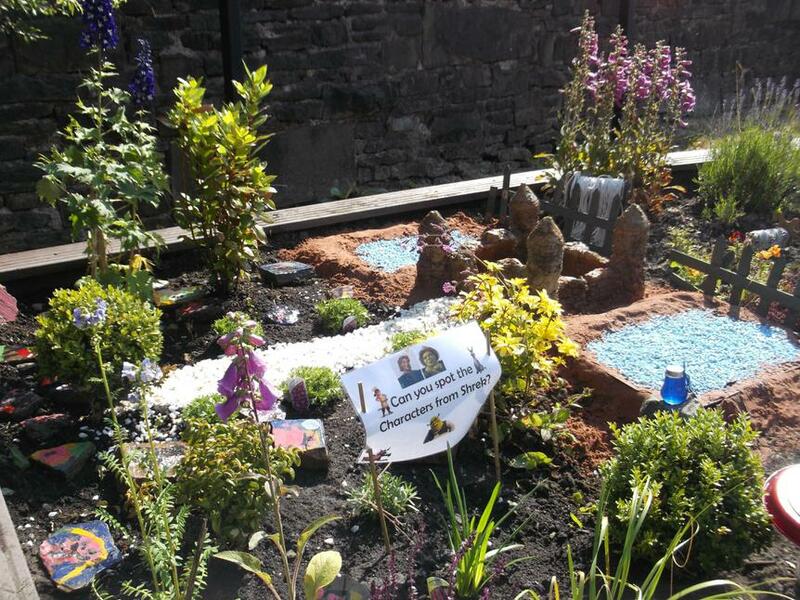 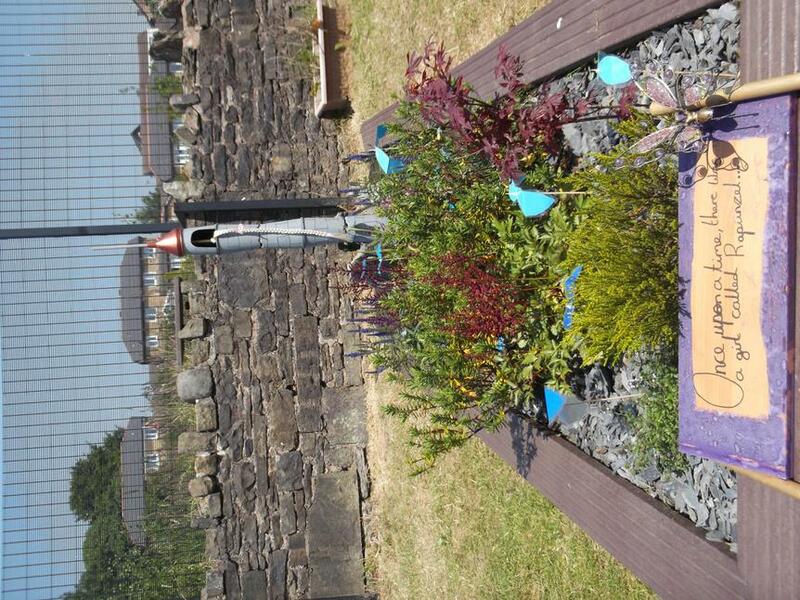 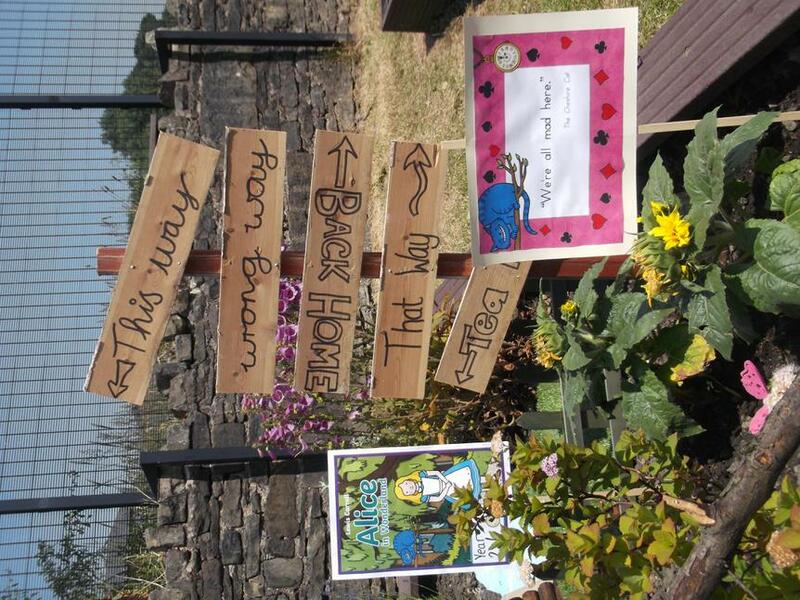 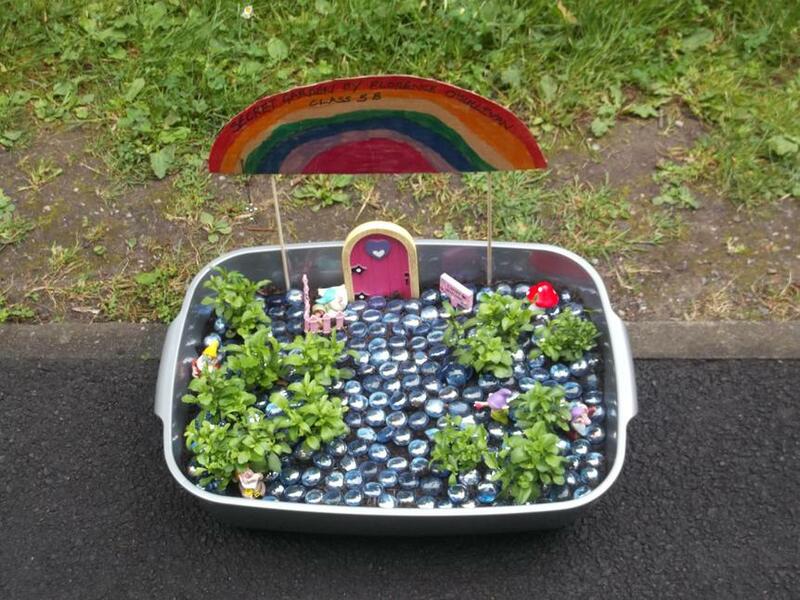 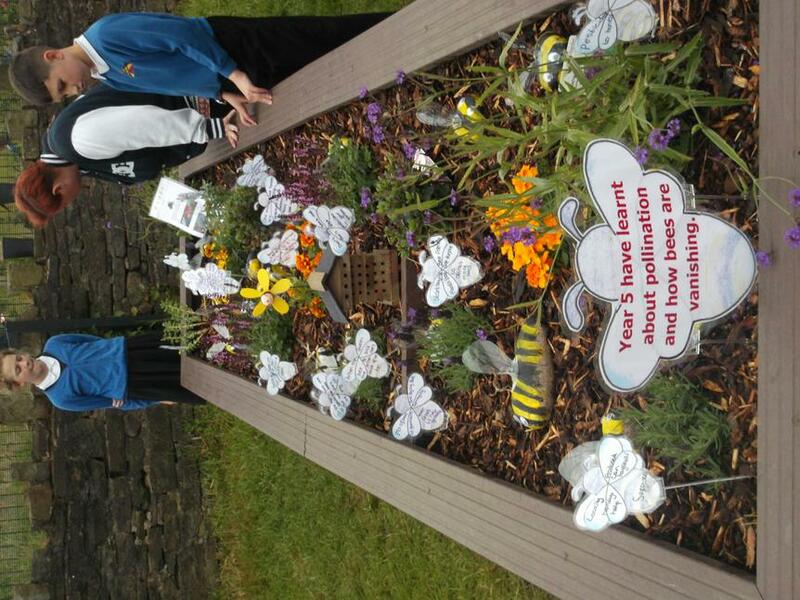 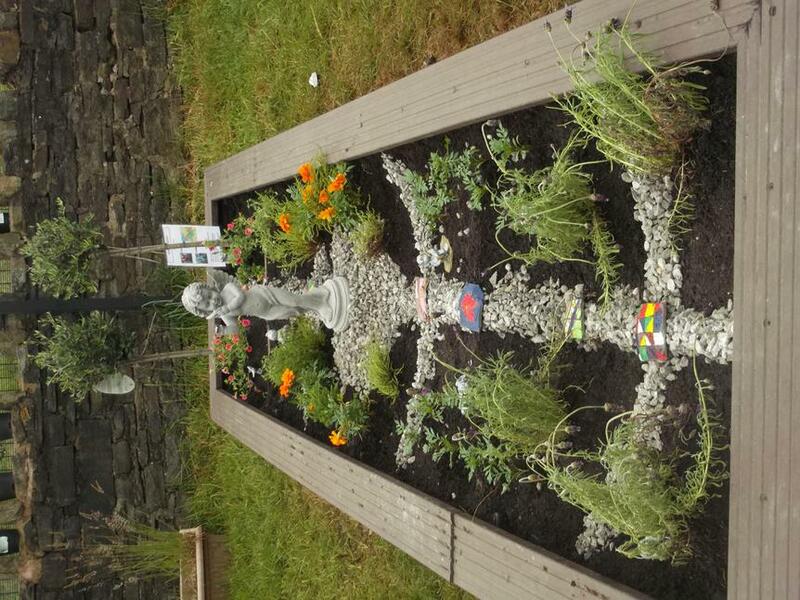 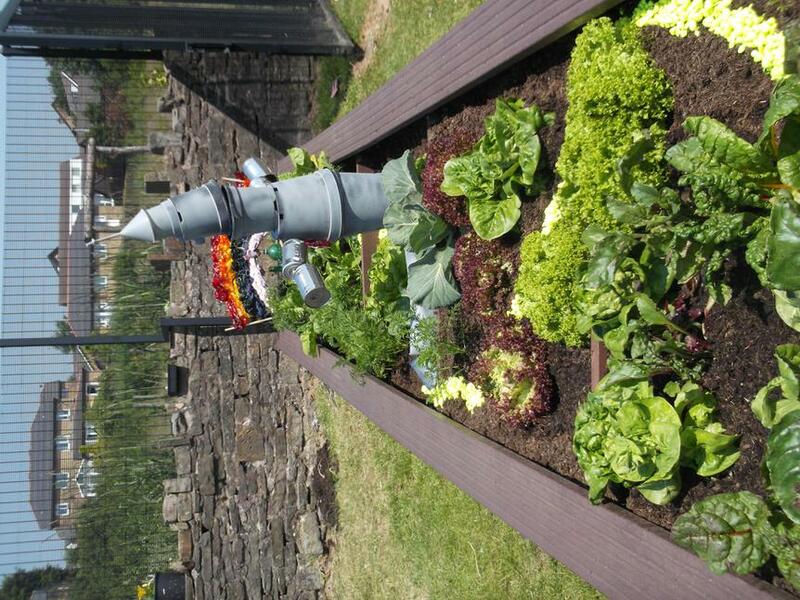 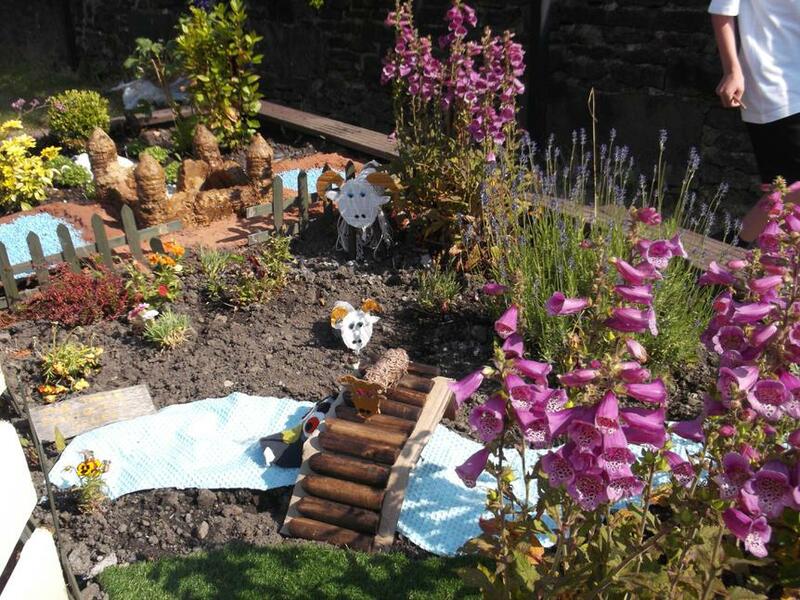 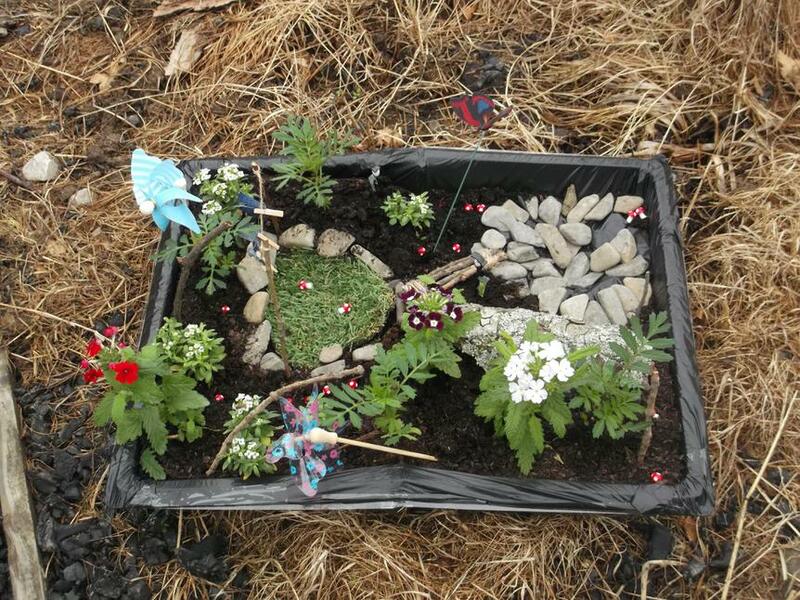 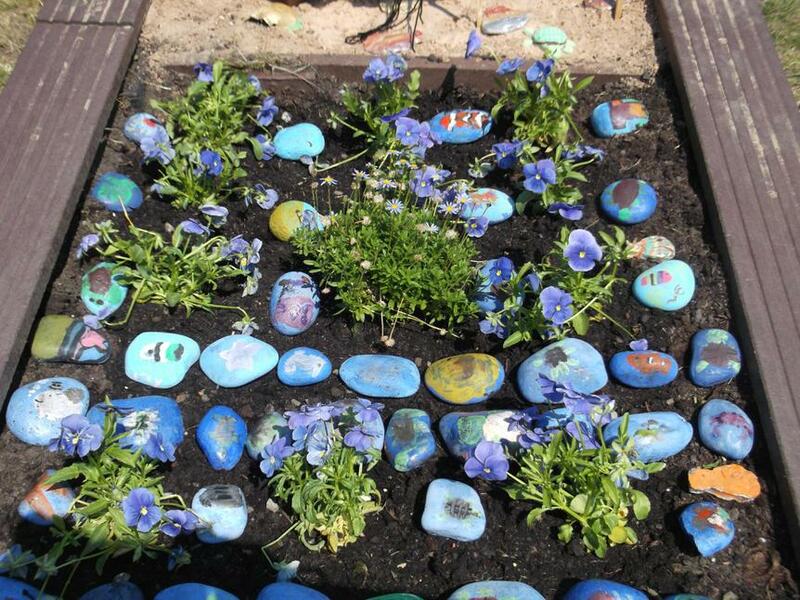 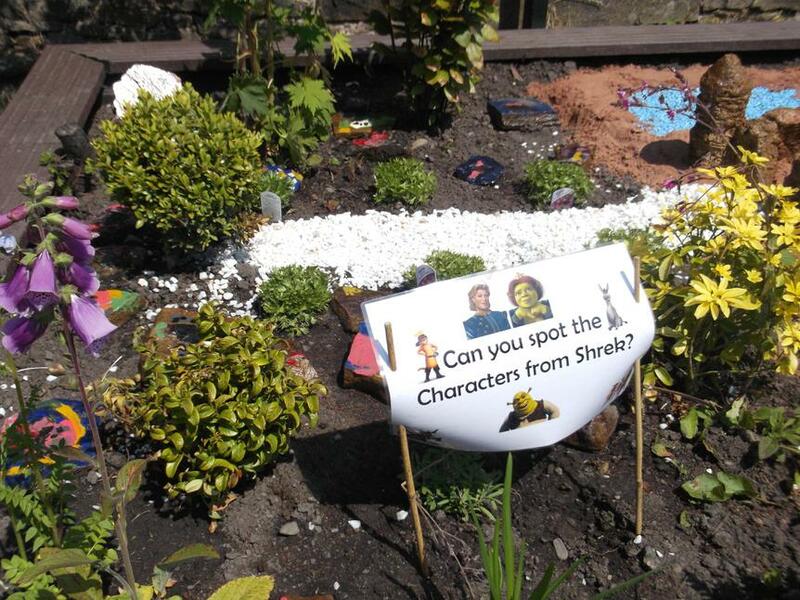 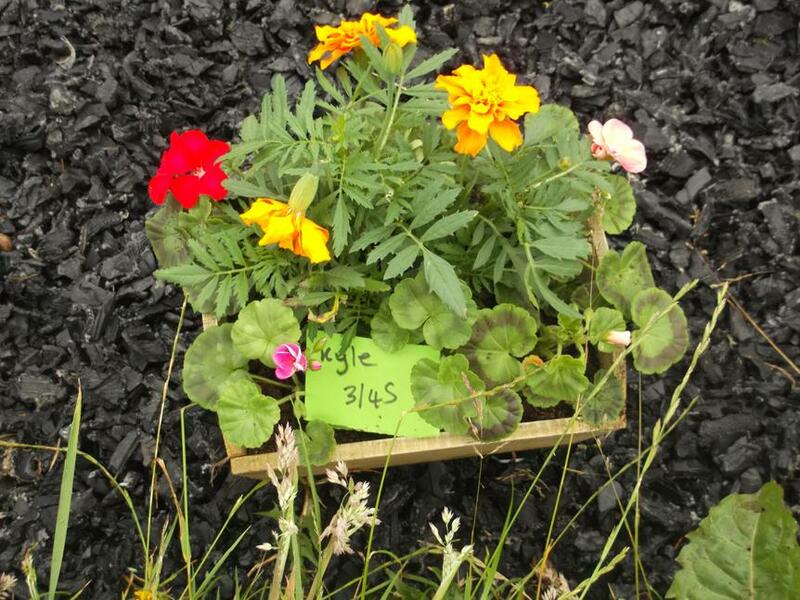 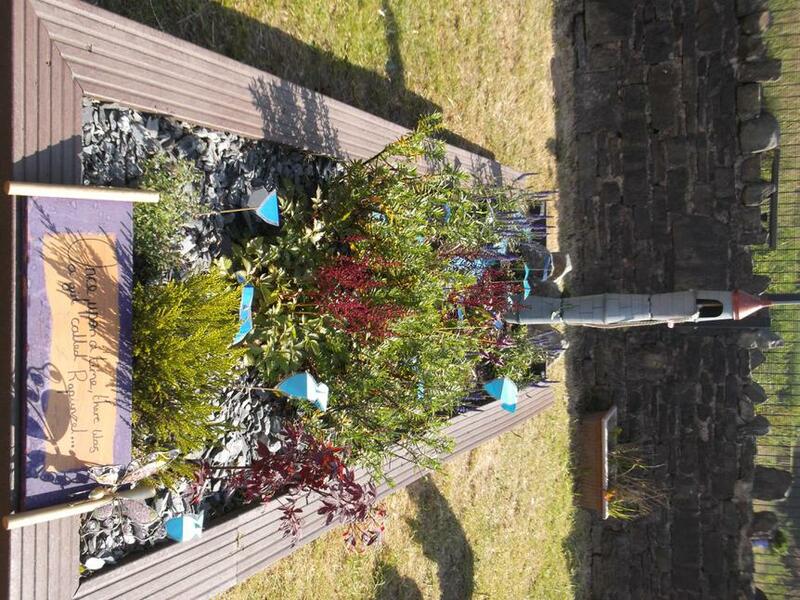 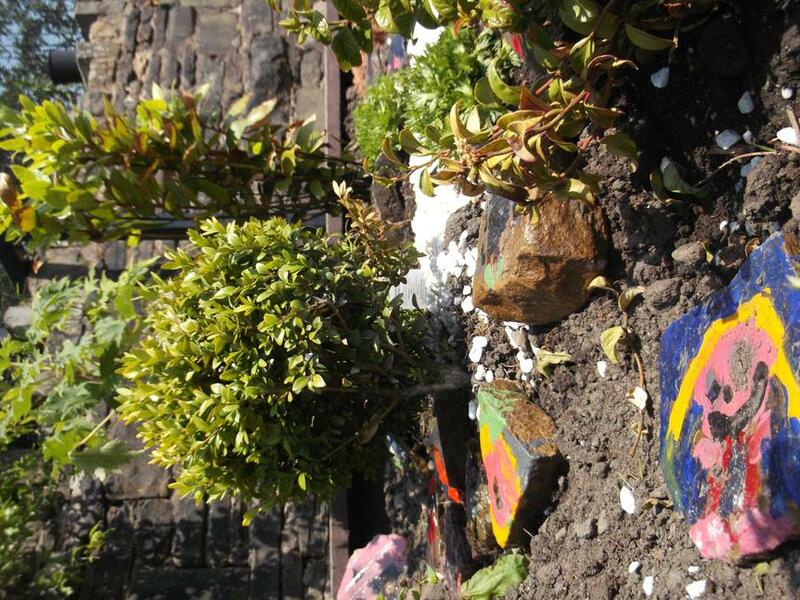 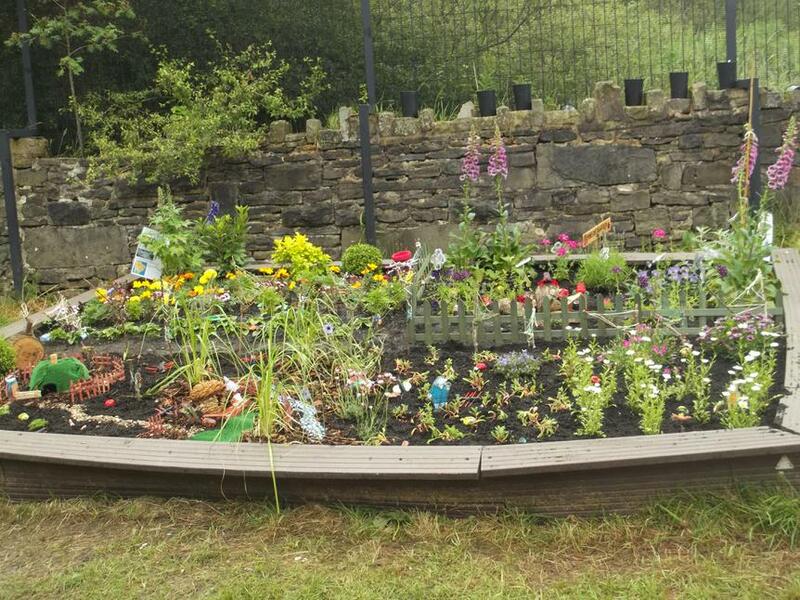 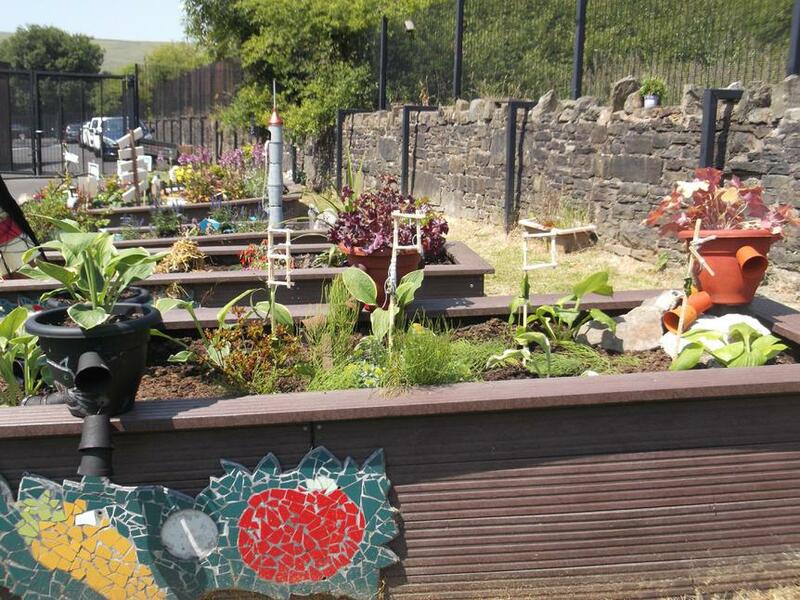 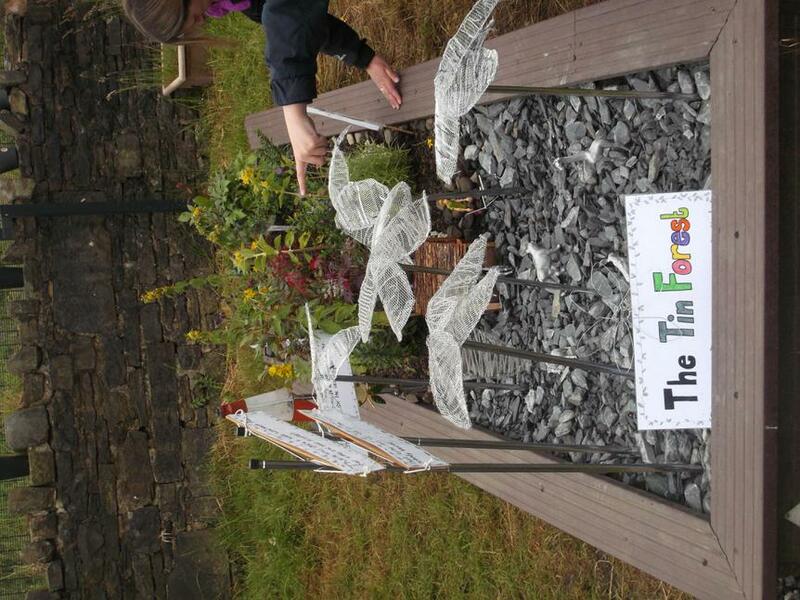 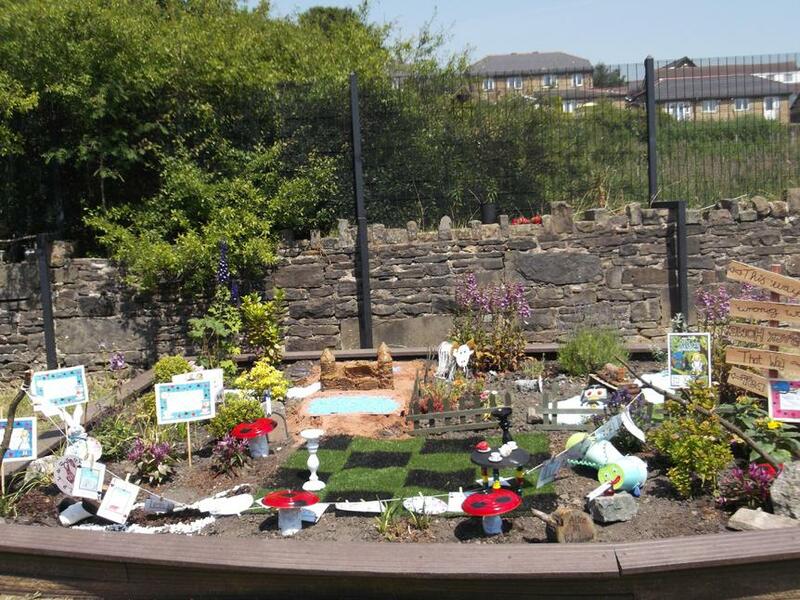 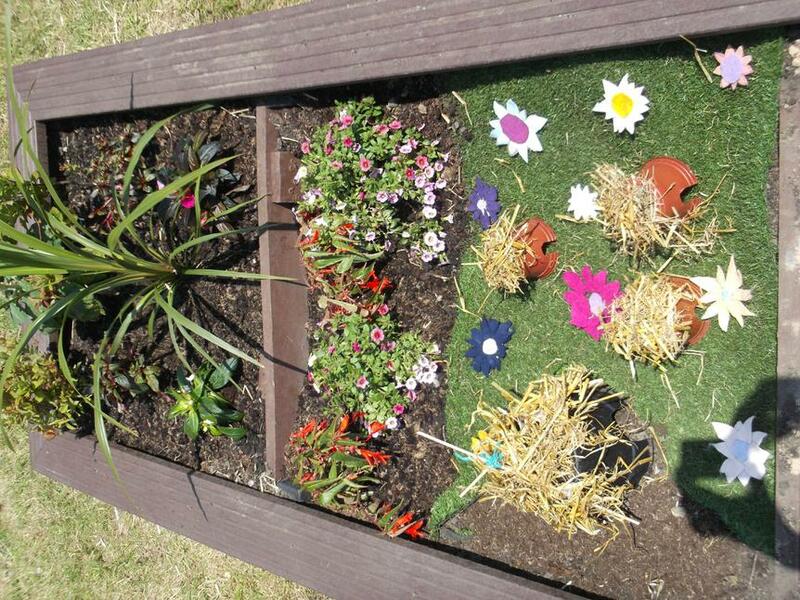 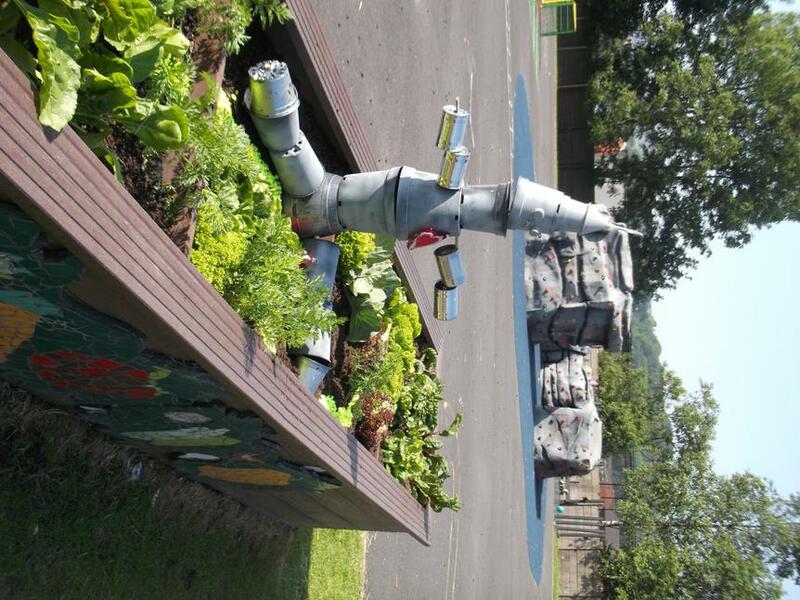 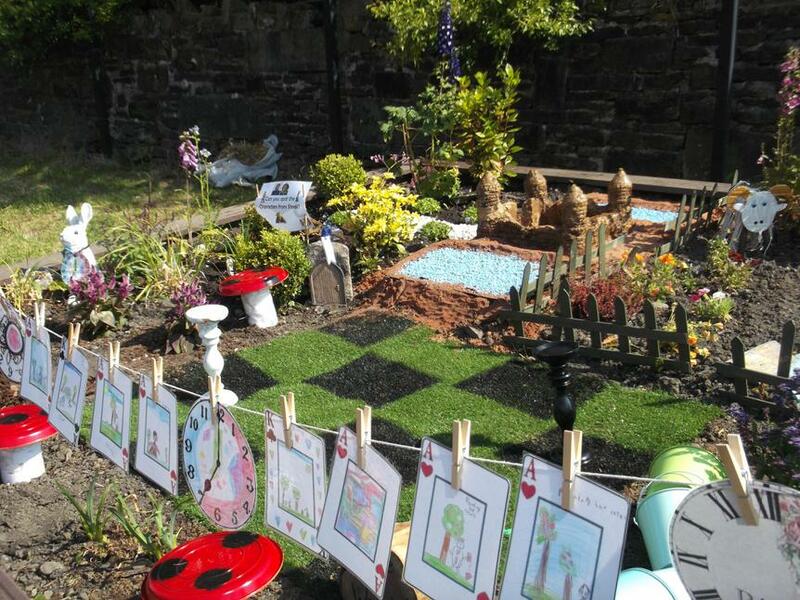 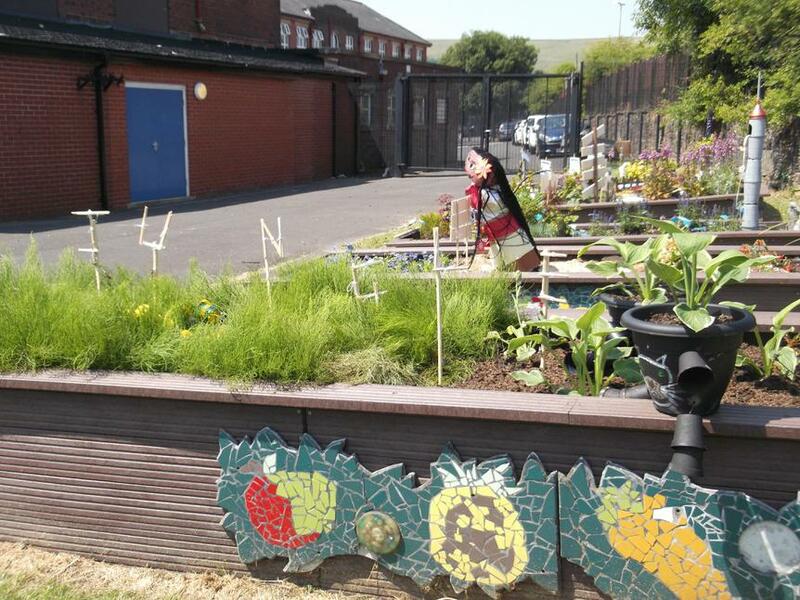 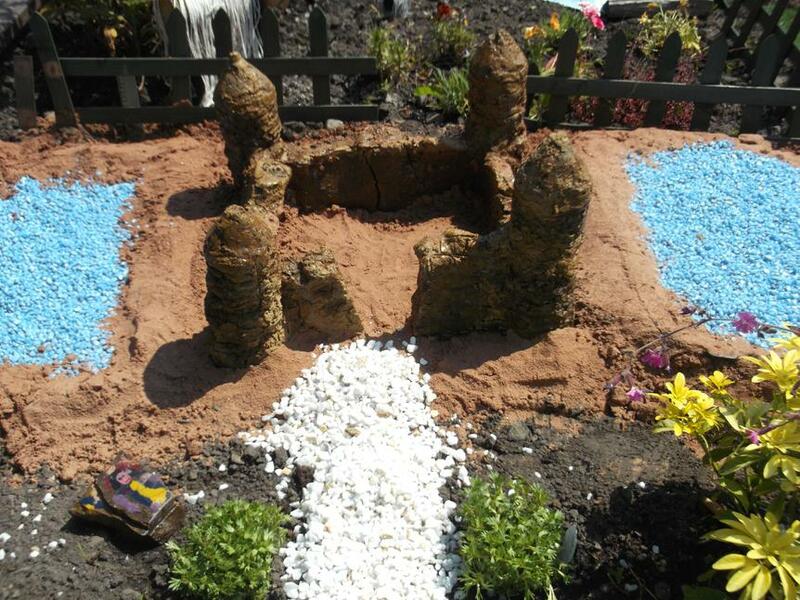 The raised beds are looking beautiful and have been updated with a 'Once Upon a Time' theme. 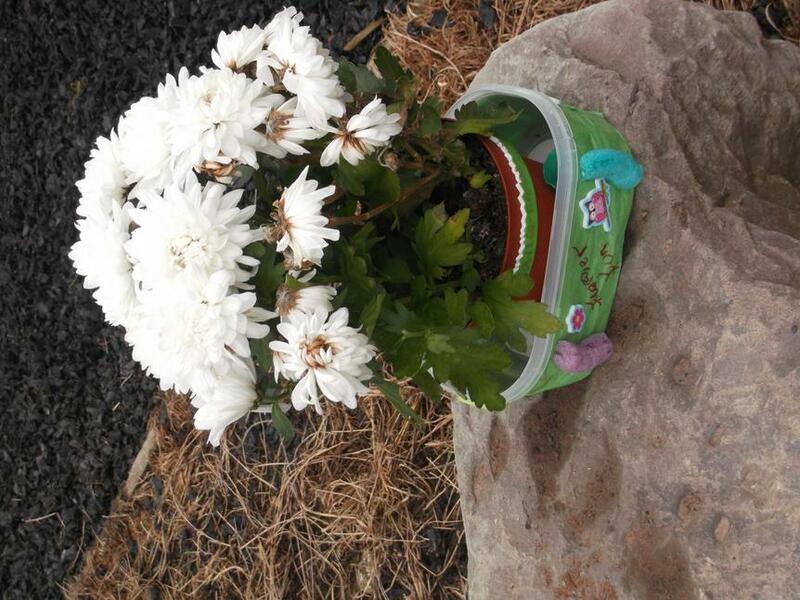 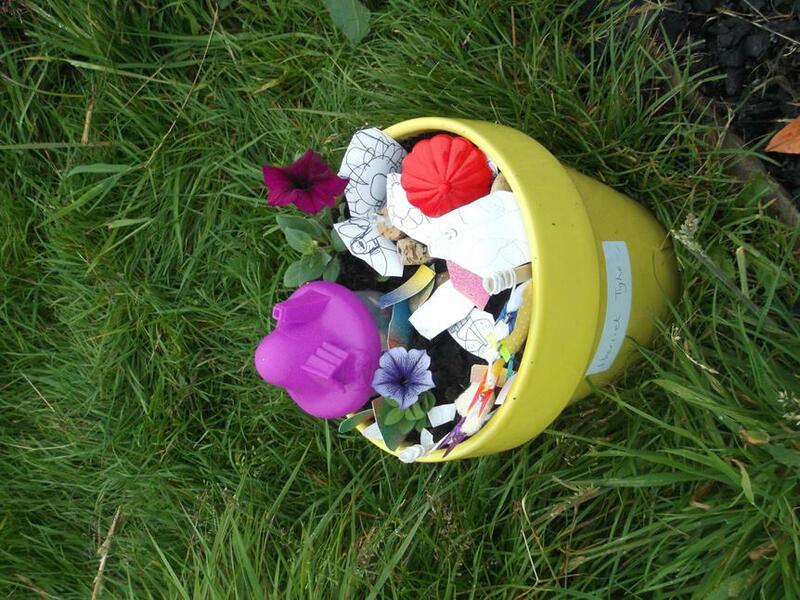 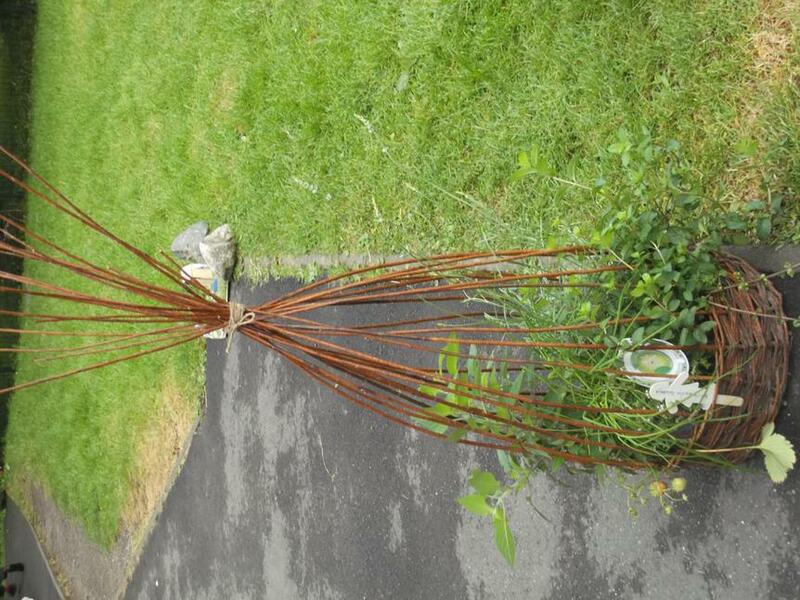 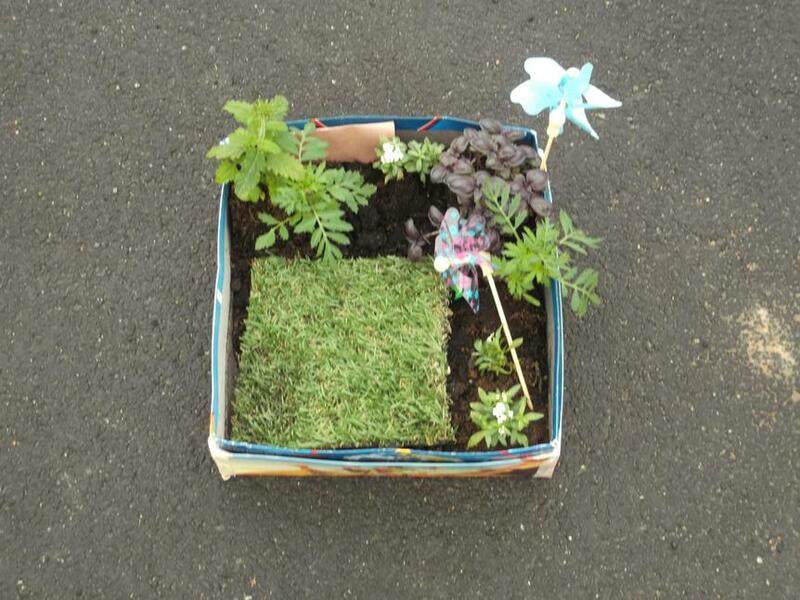 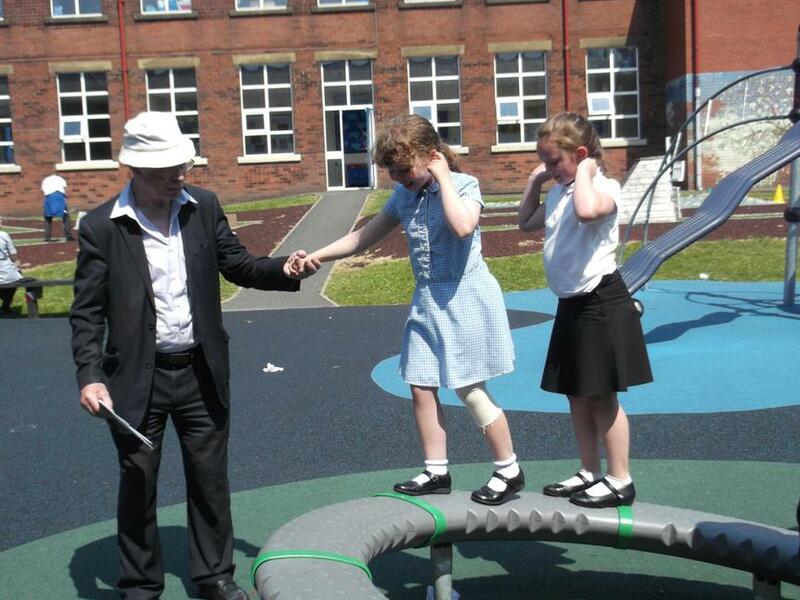 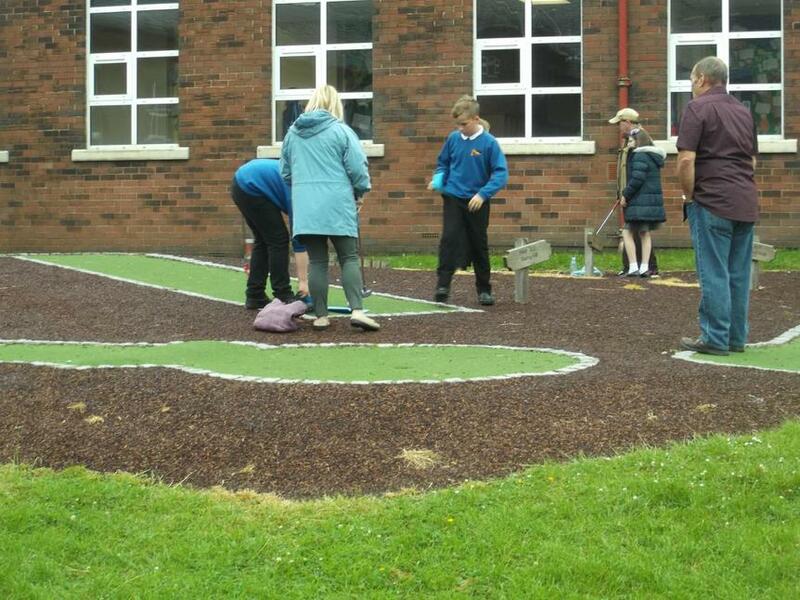 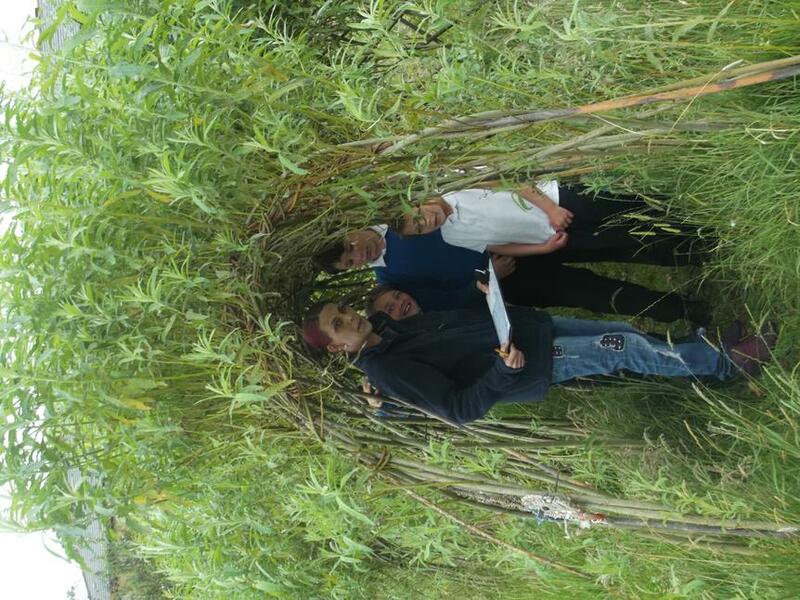 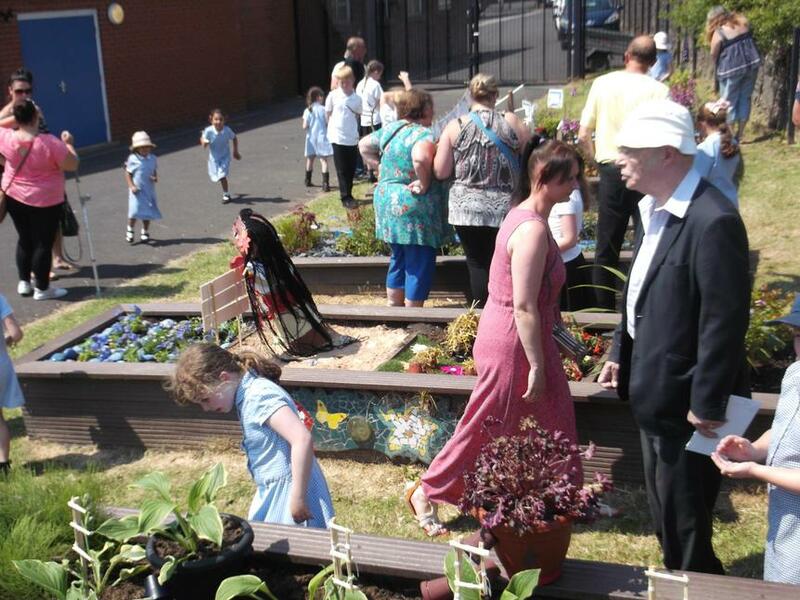 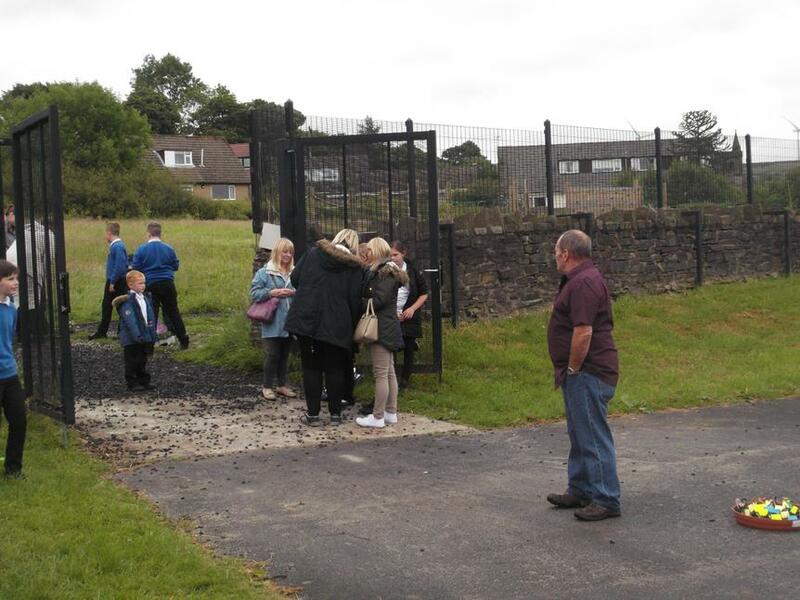 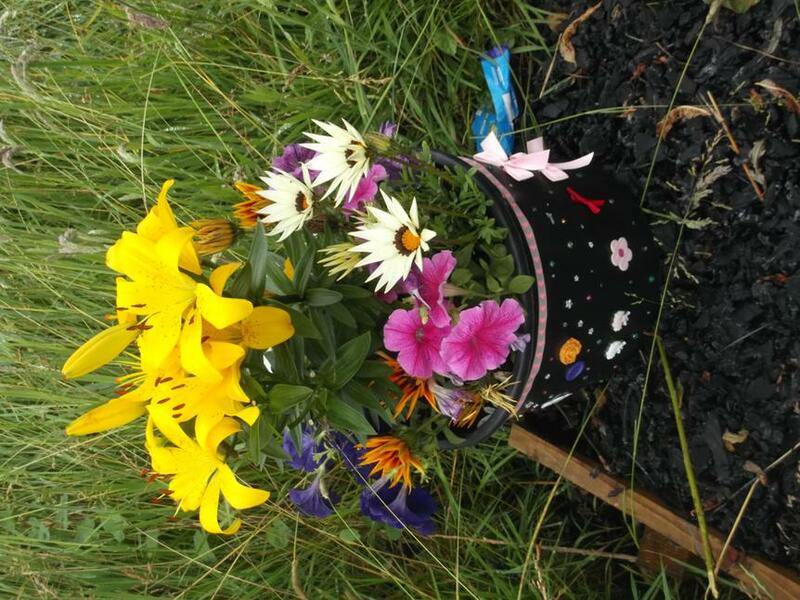 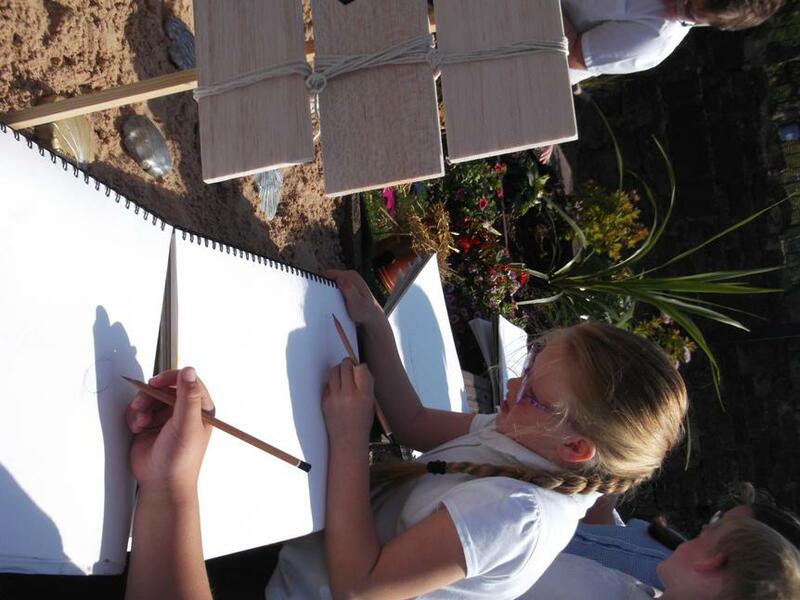 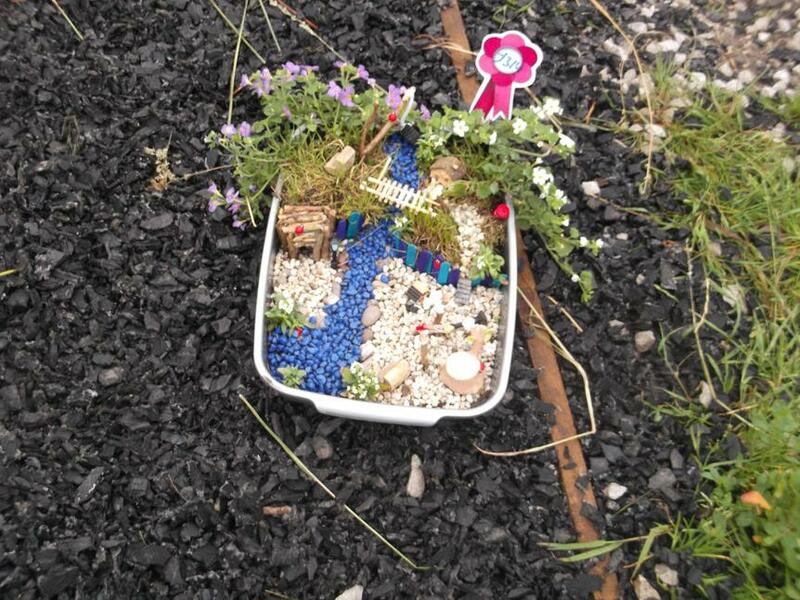 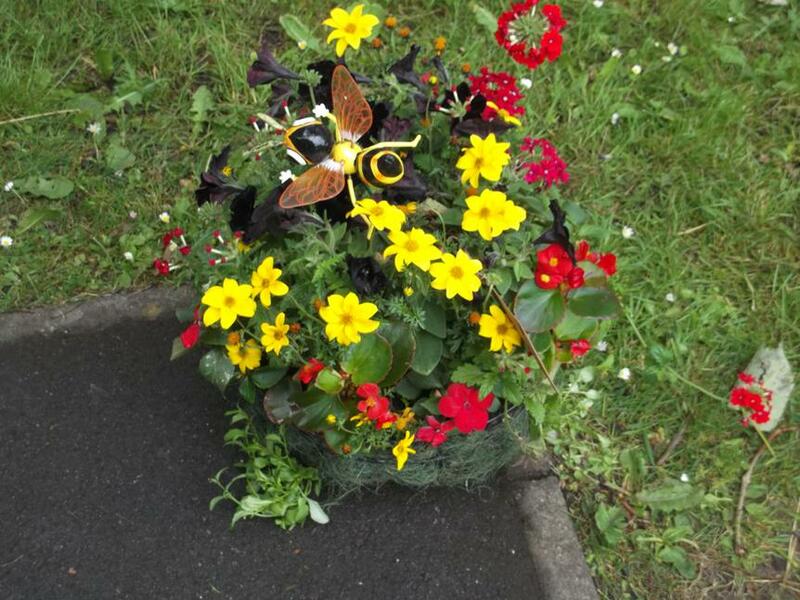 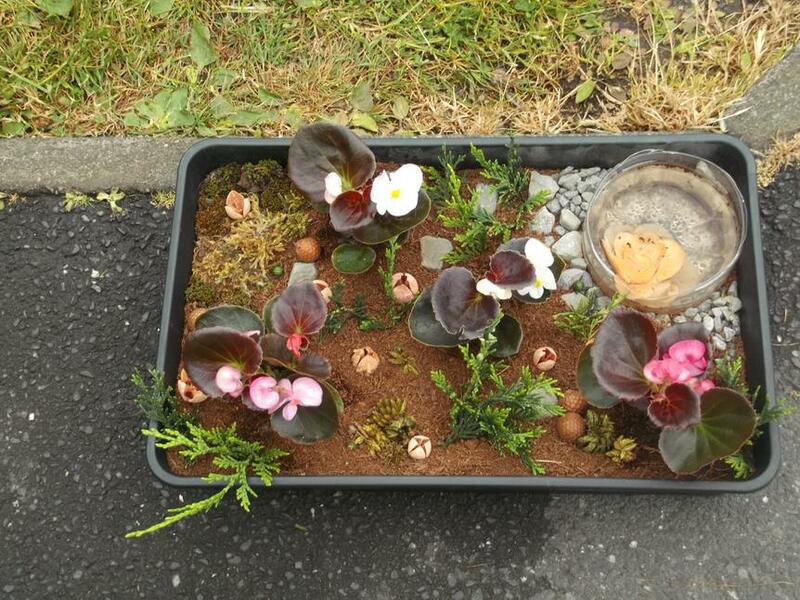 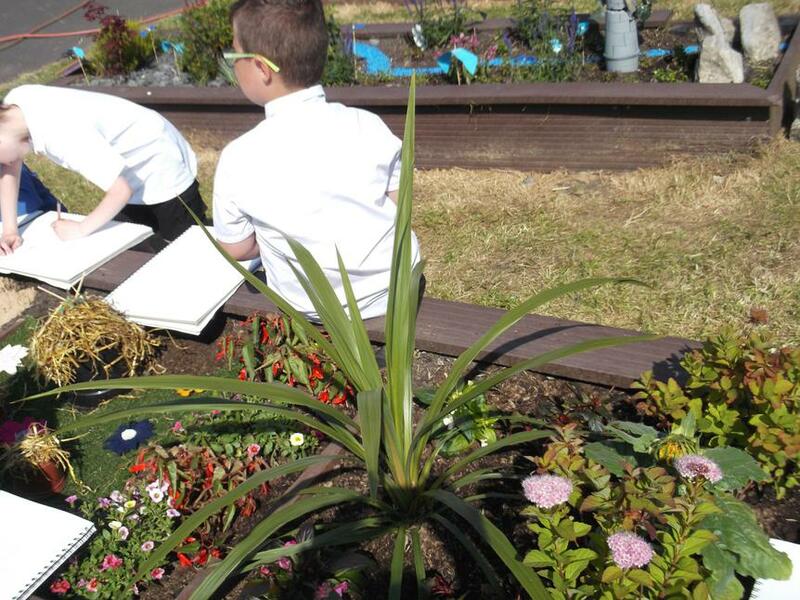 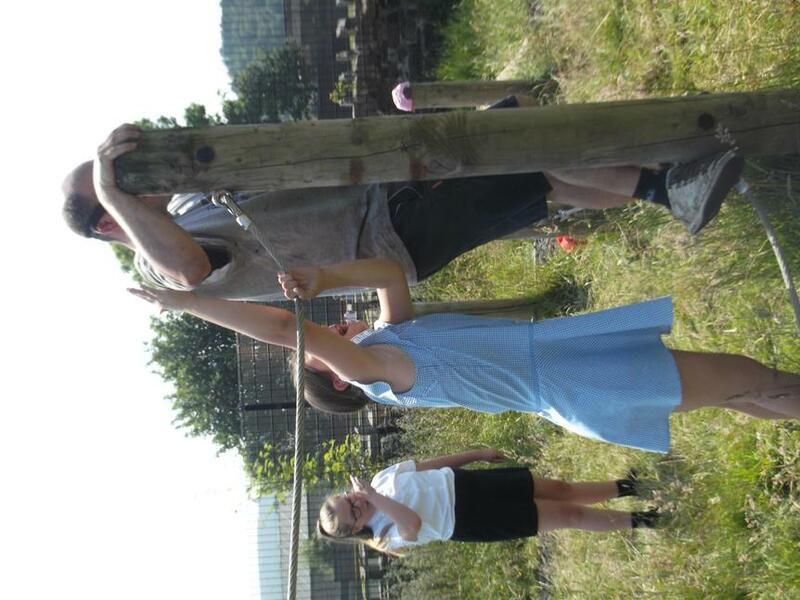 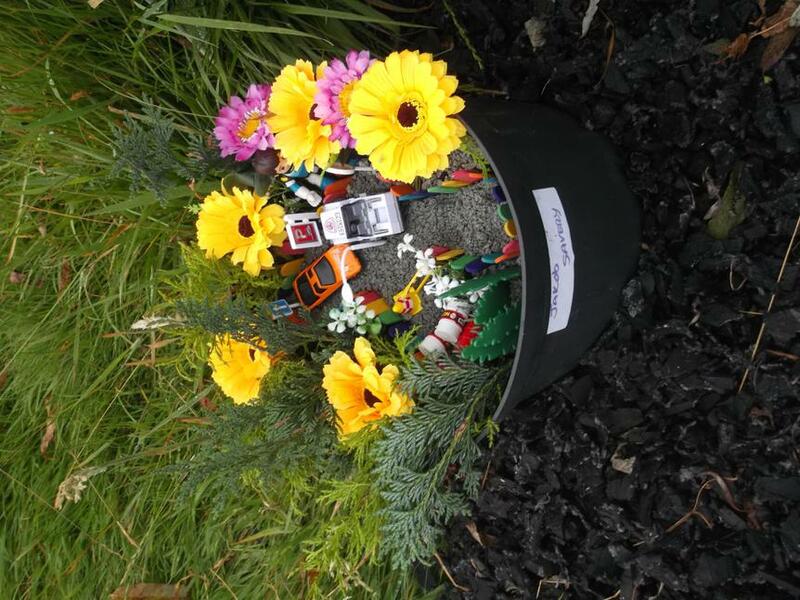 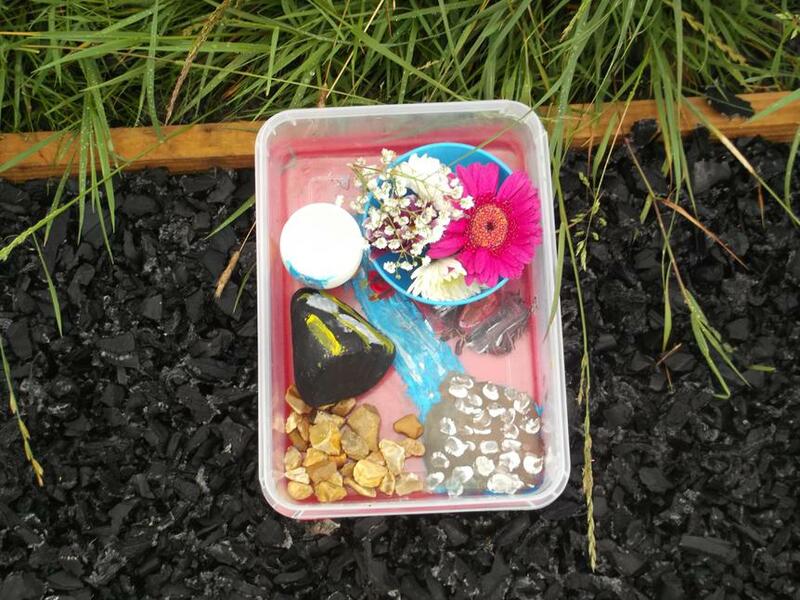 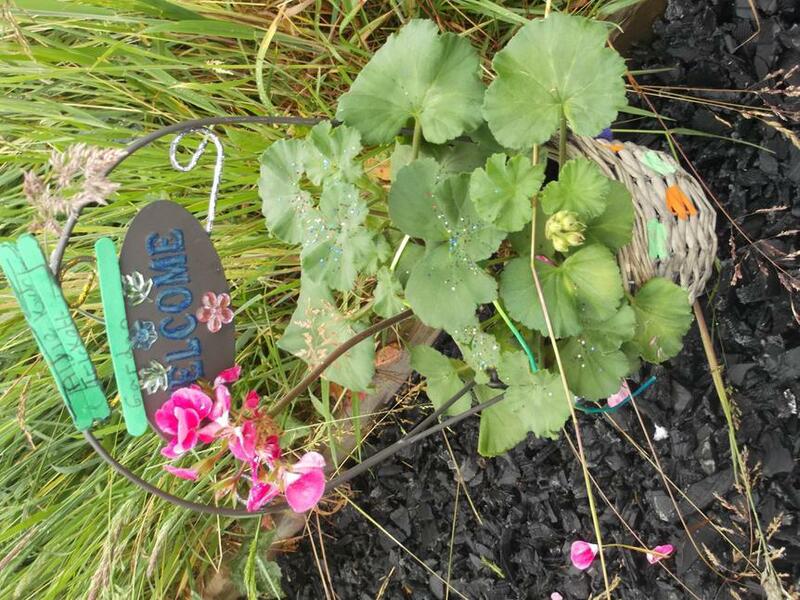 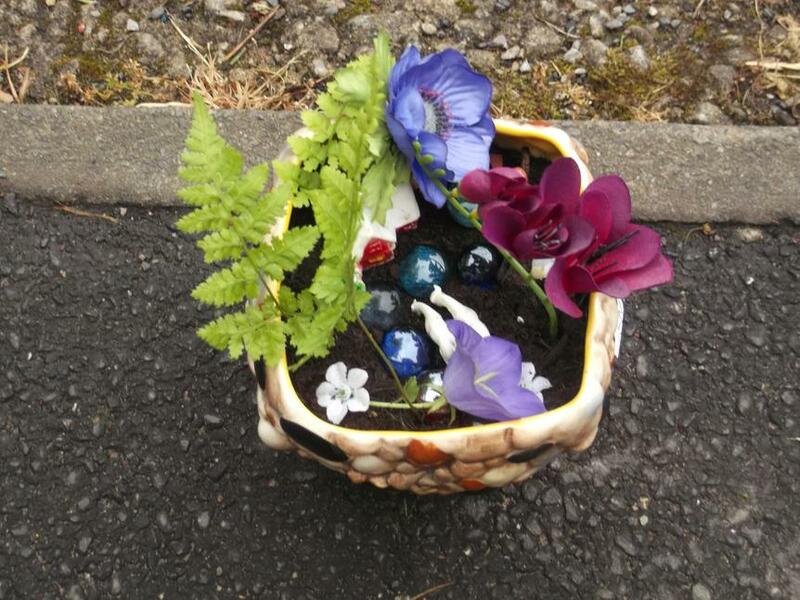 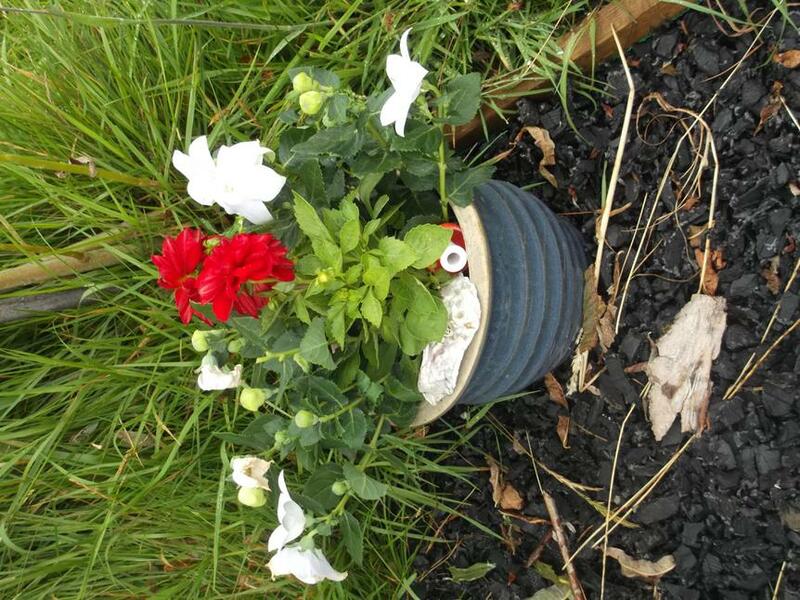 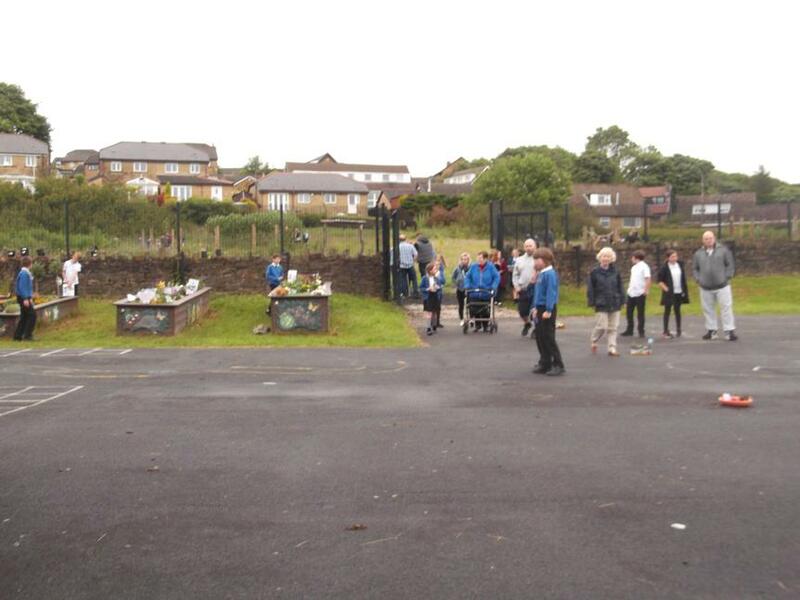 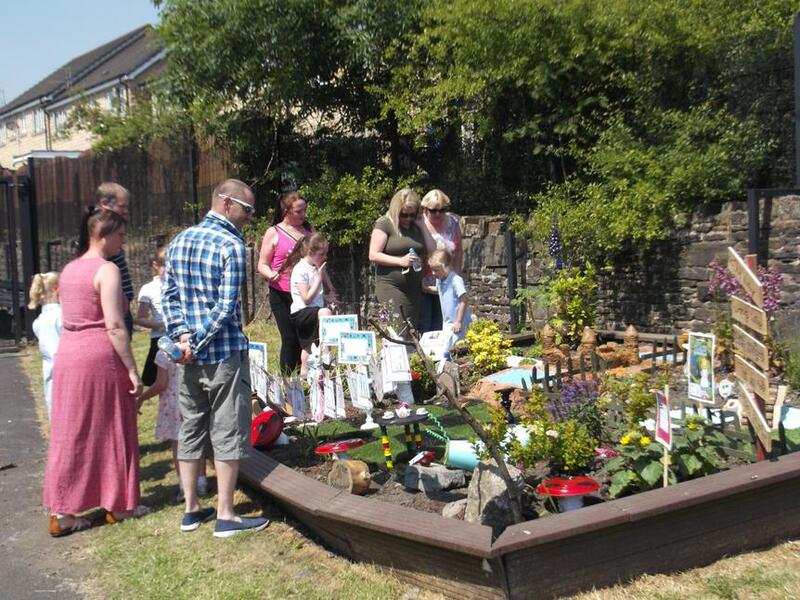 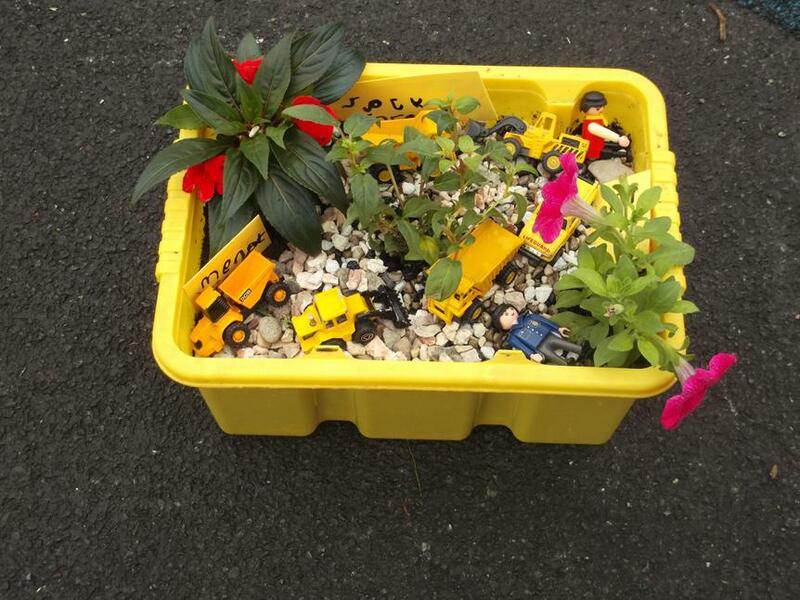 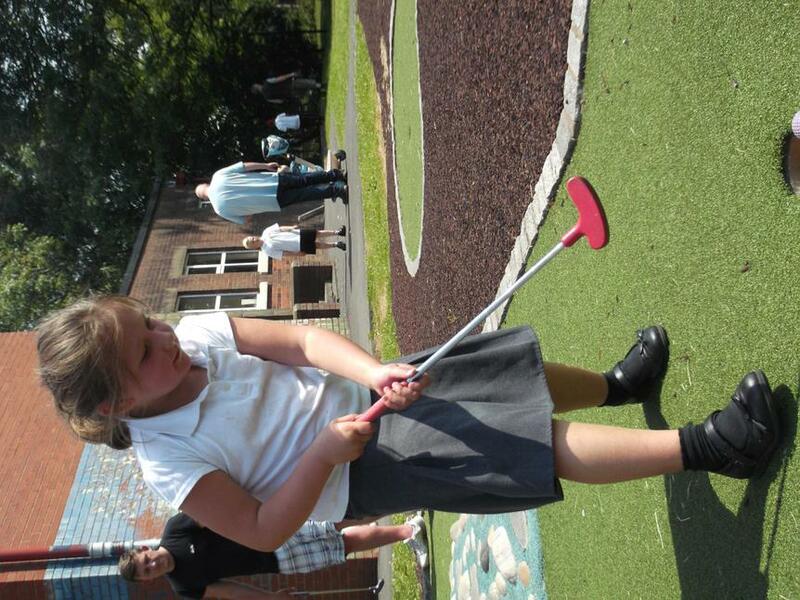 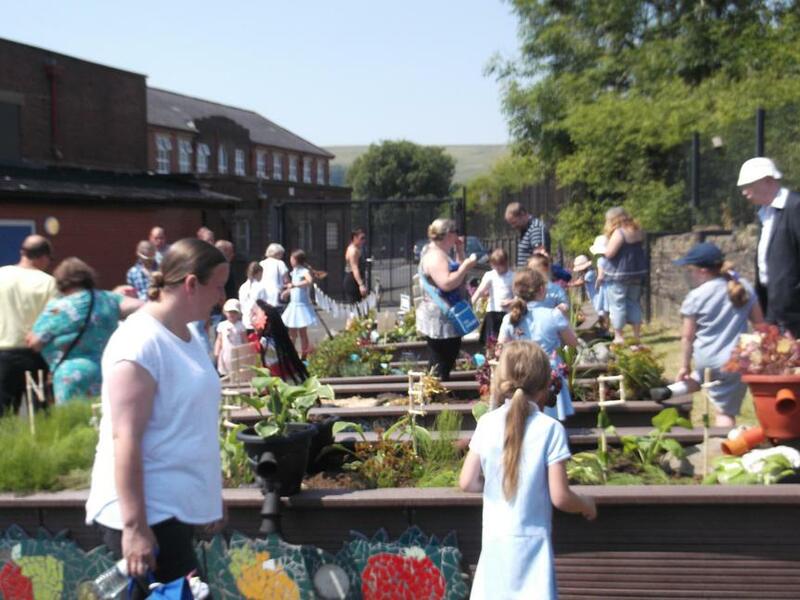 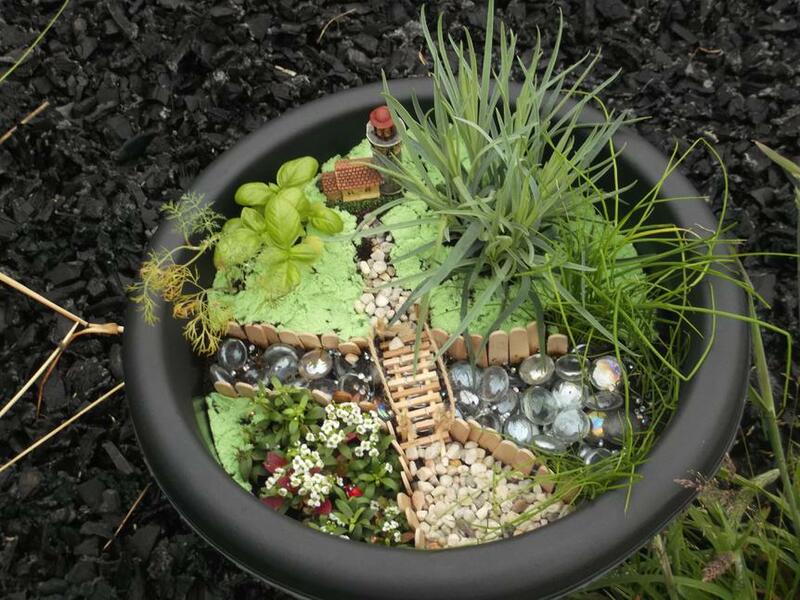 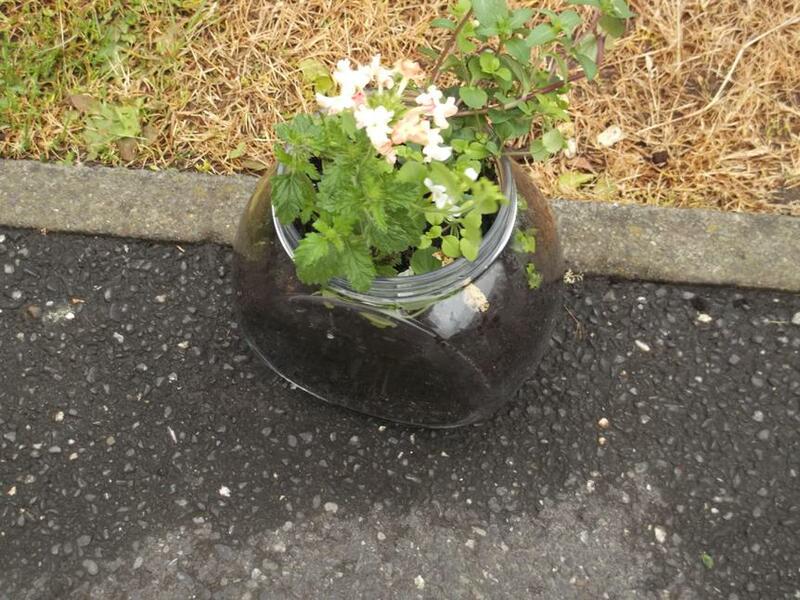 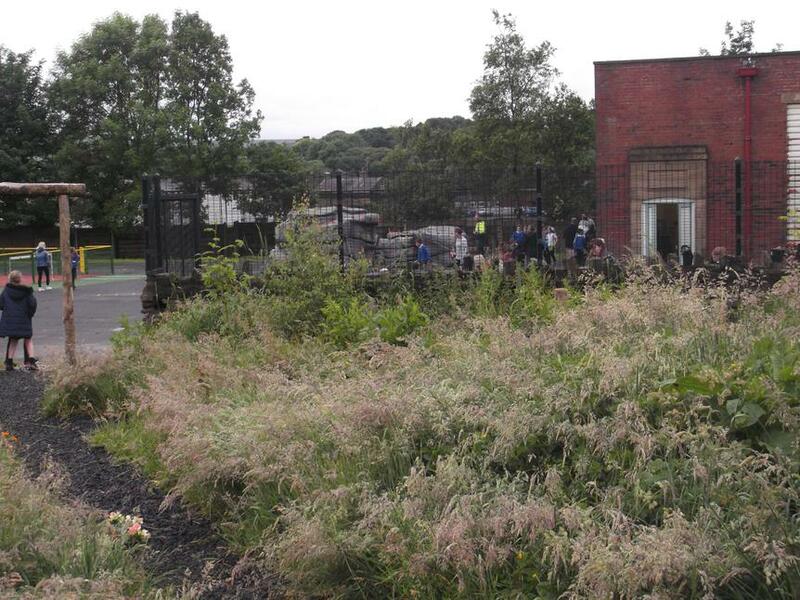 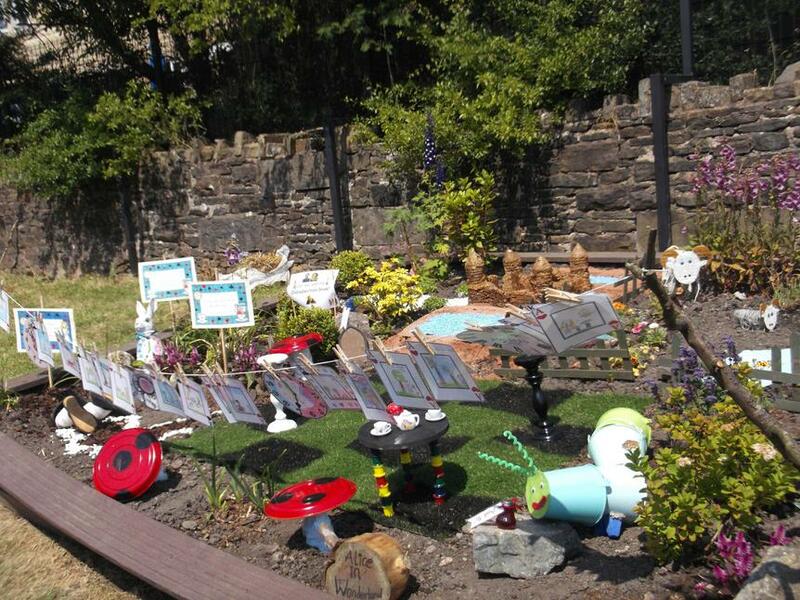 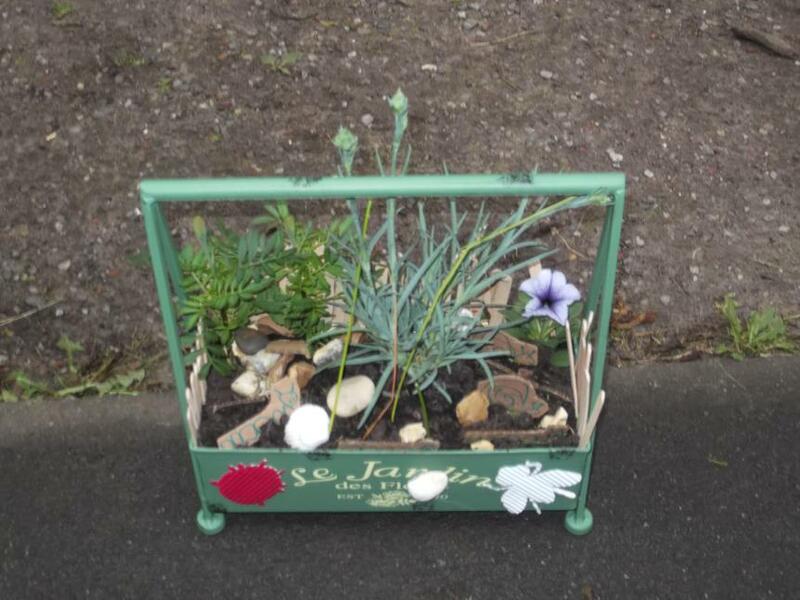 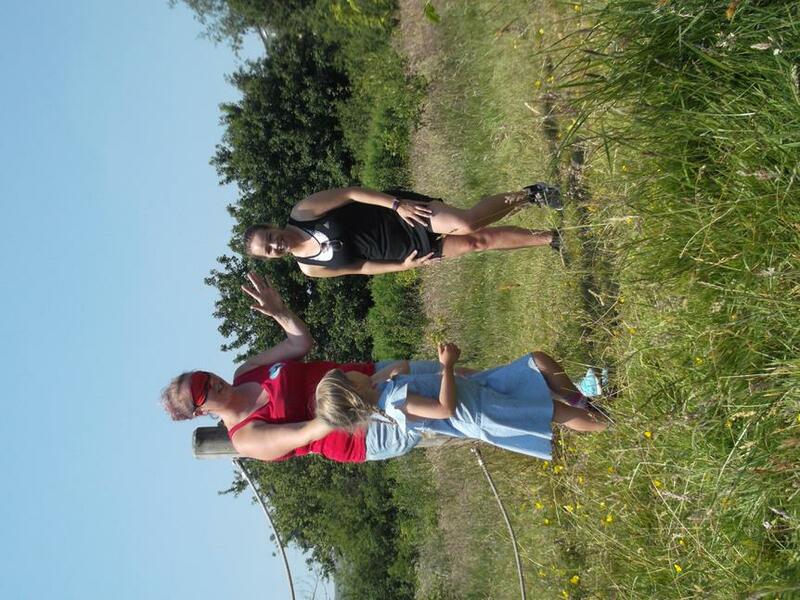 Children enjoyed showing their parents around the gardens and were proud of their achievements. 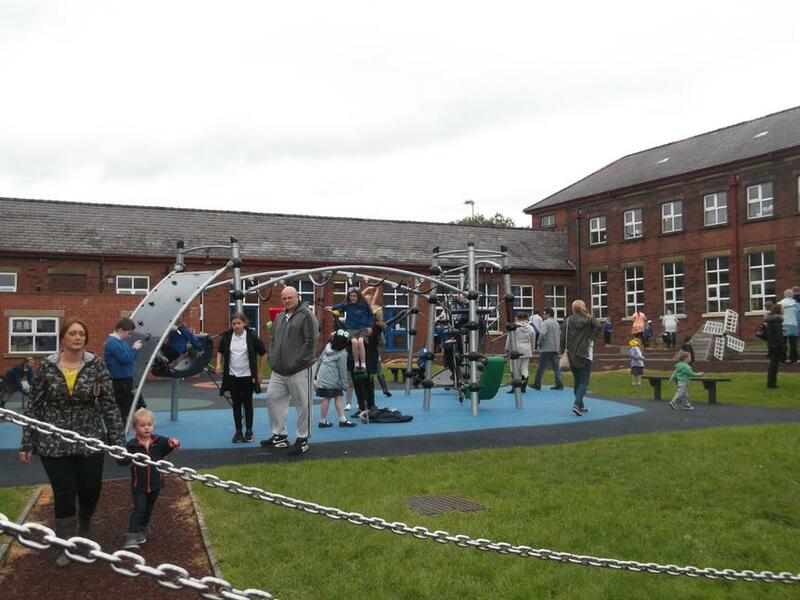 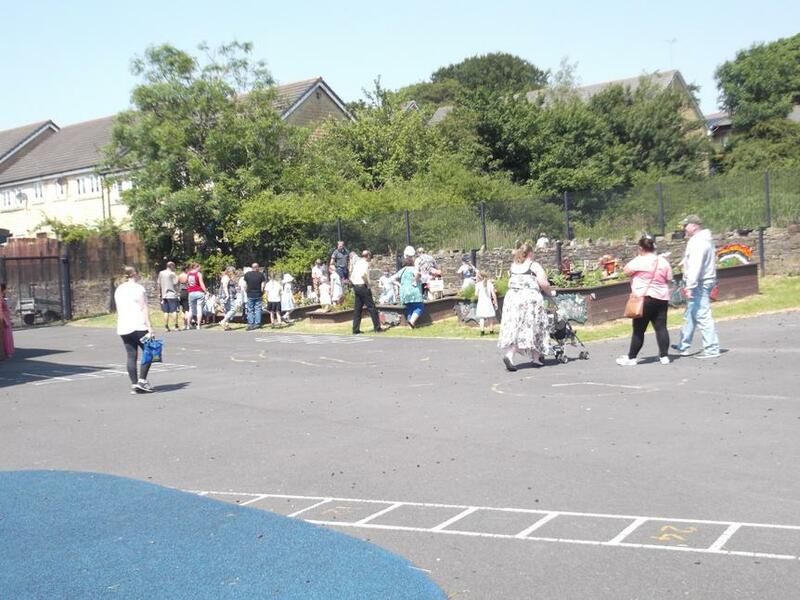 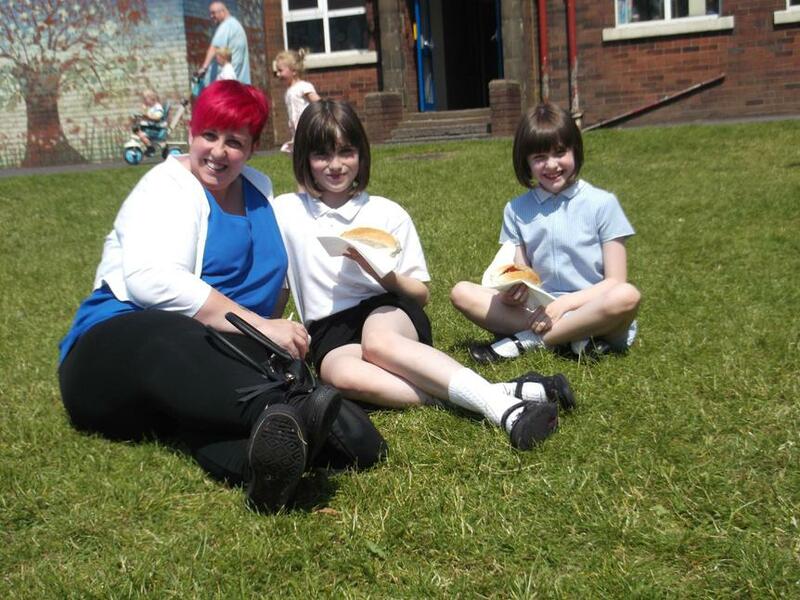 It was lovely to see our families enjoying the sunshine and having fun together and parents said they enjoyed 'getting a peek in the window of their children's school life'. 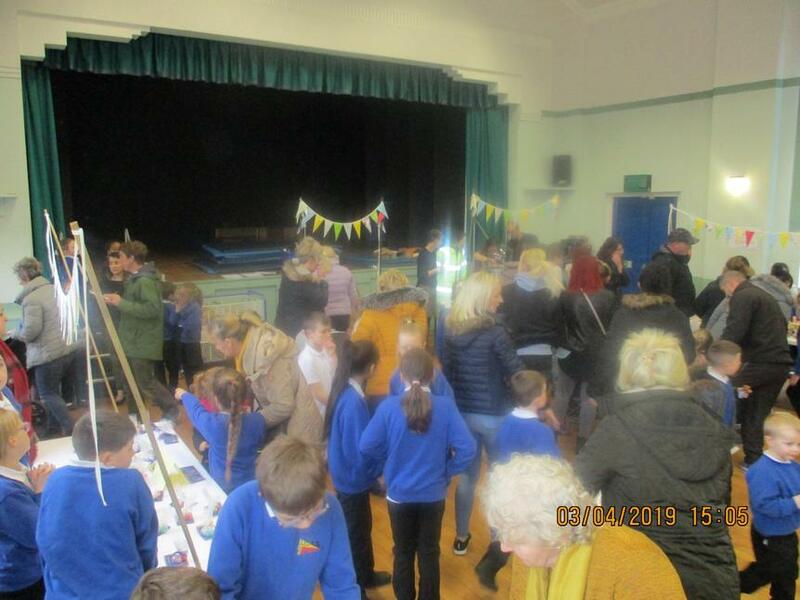 Thank you to all who joined us and a huge thanks to all in the school and wider community who supported the event, including The Friends of Thorn. 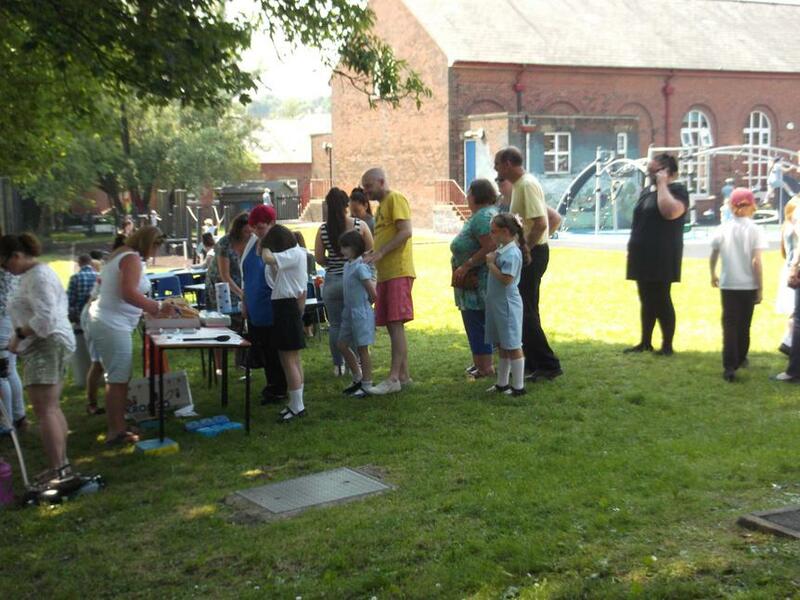 We hope to see you again in Autumn for our next event. 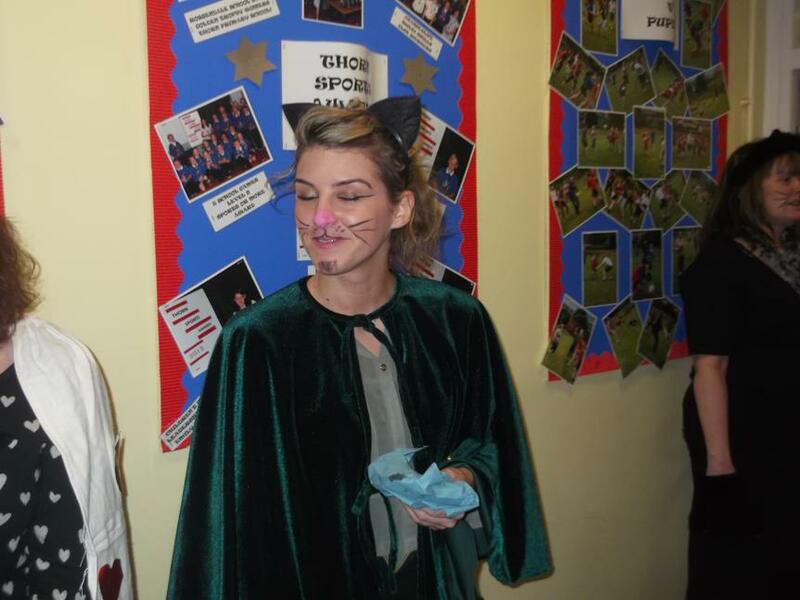 disappoint and all looked fabulous. 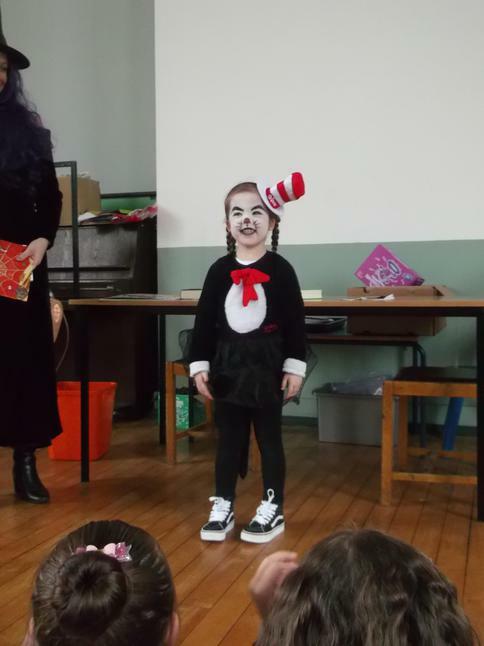 They spent the day working on book related activities and had lots of fun. 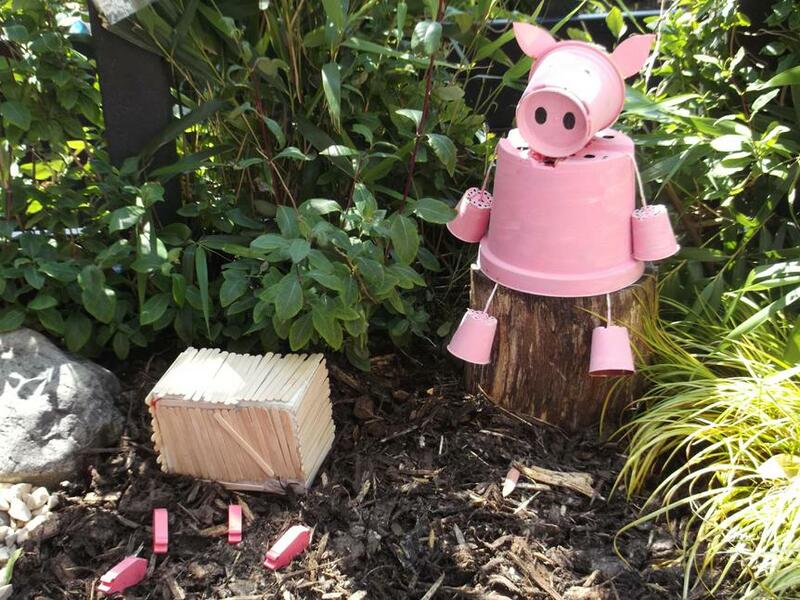 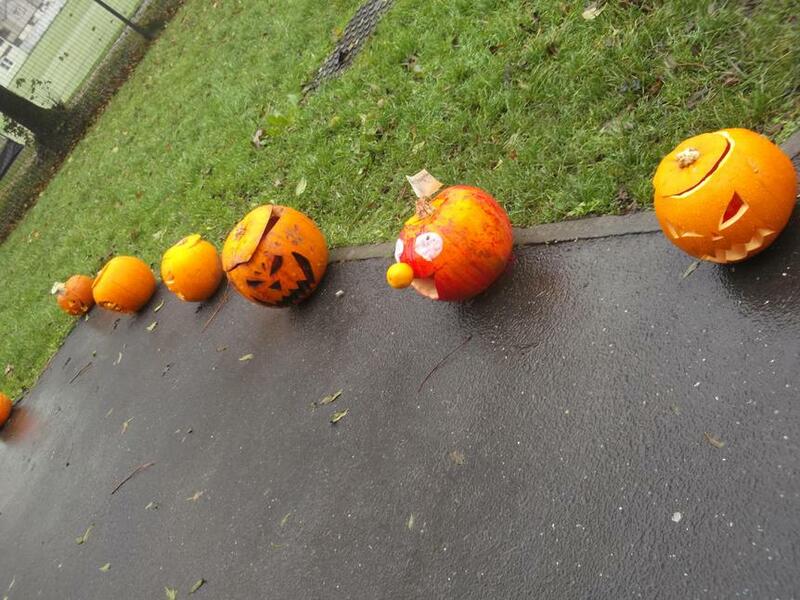 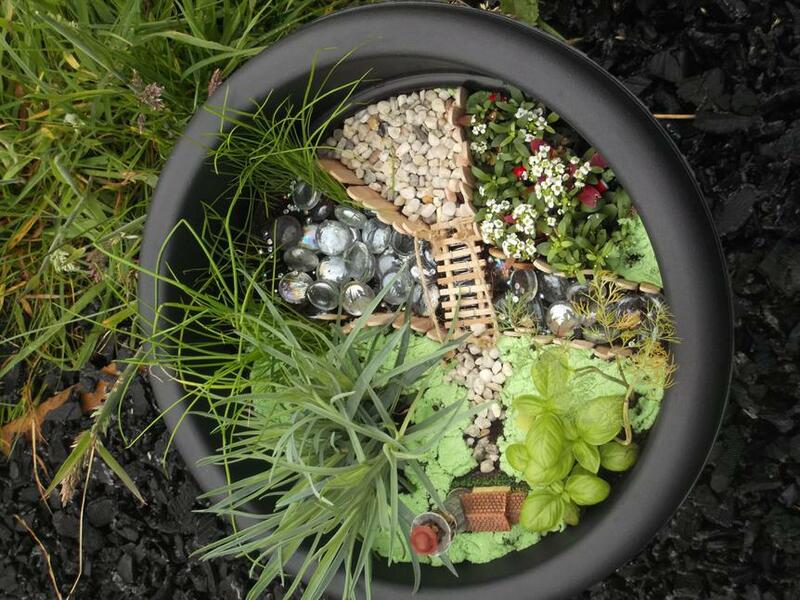 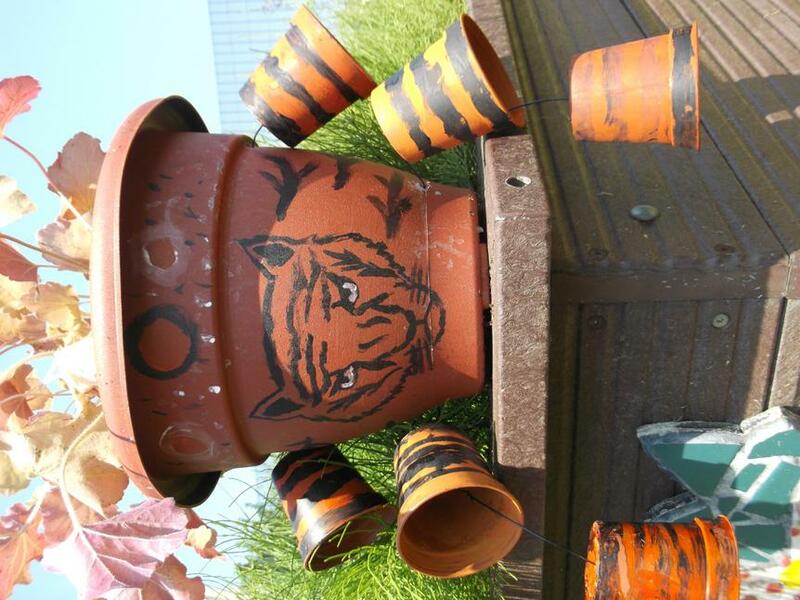 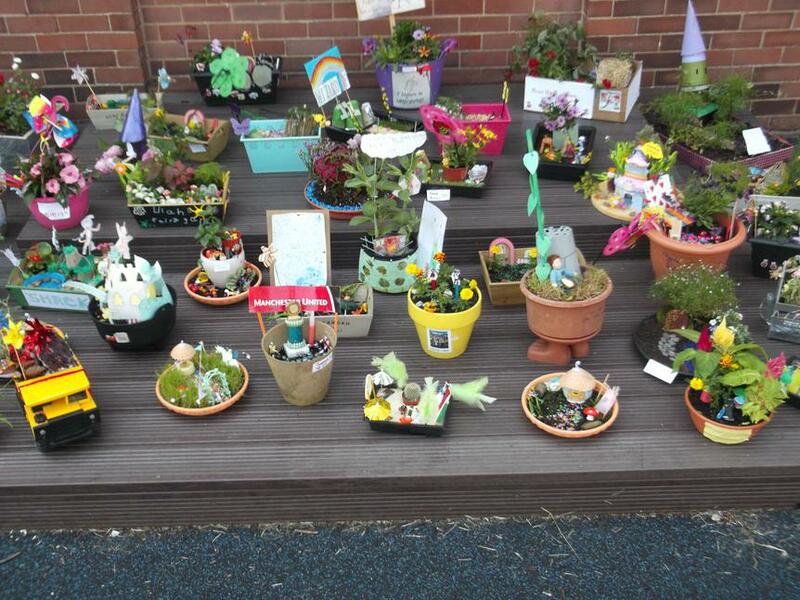 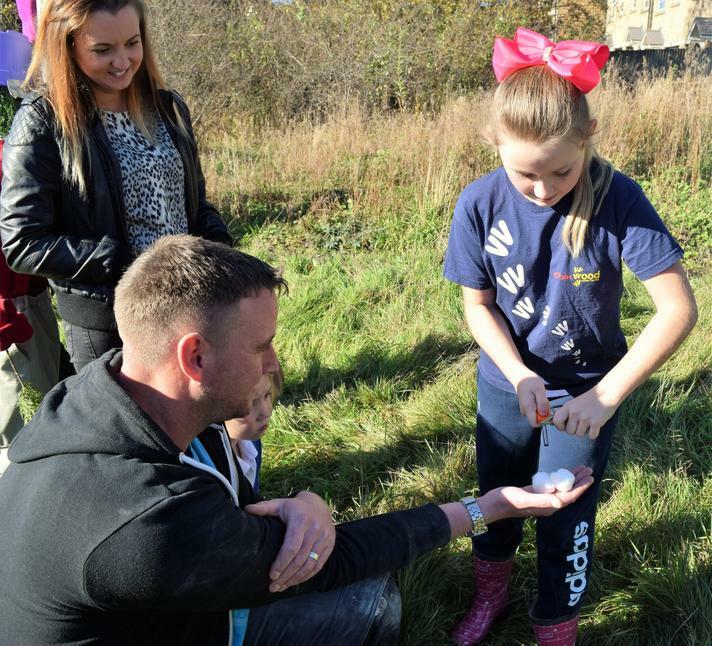 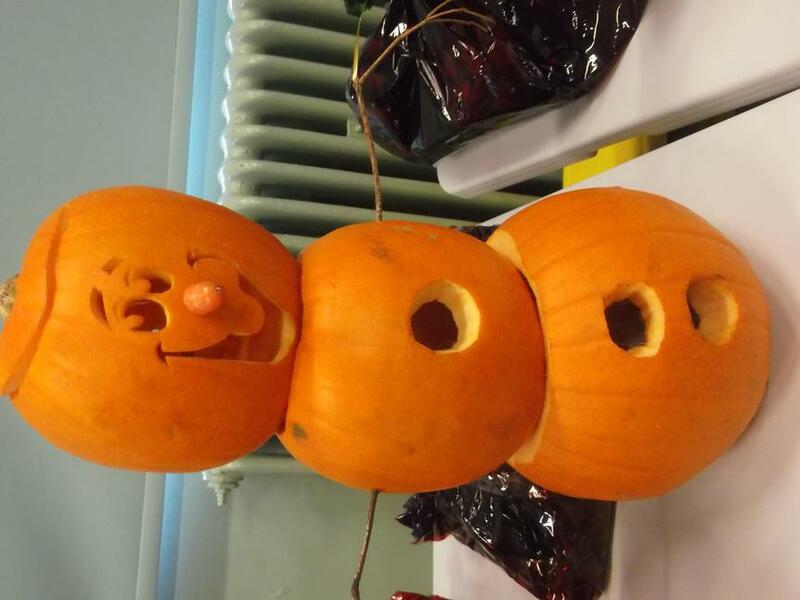 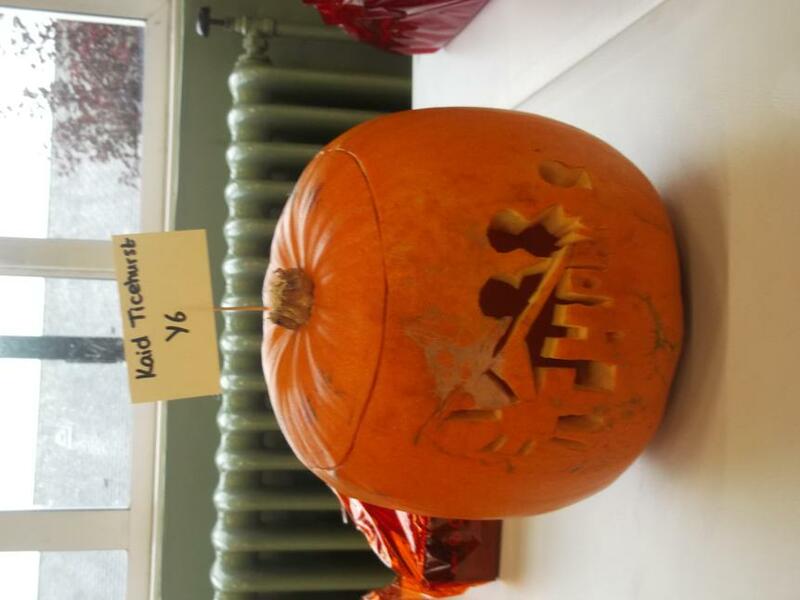 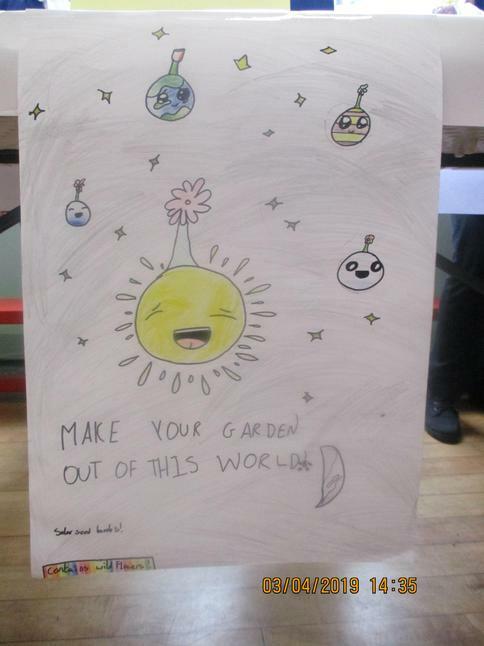 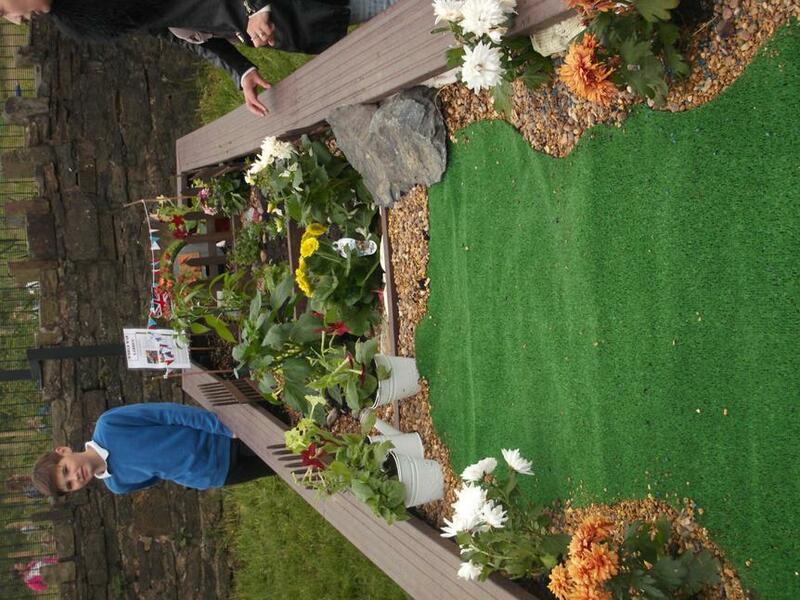 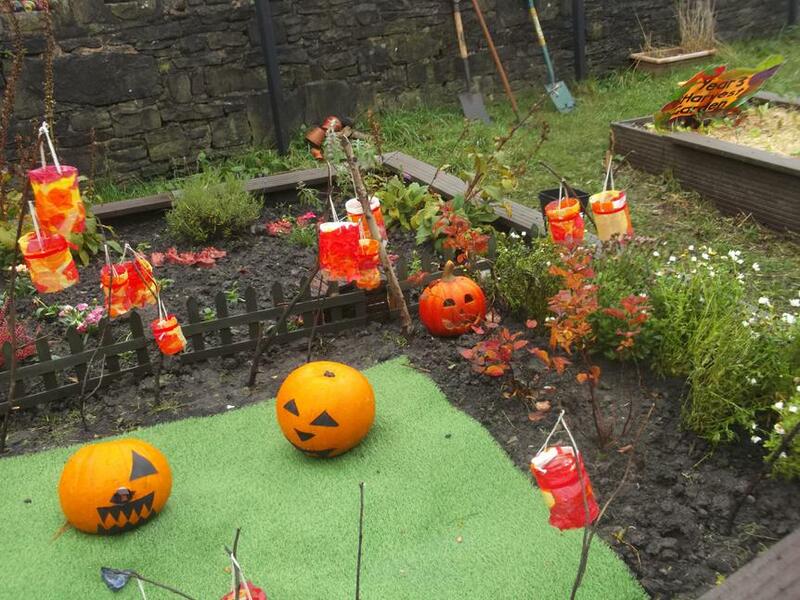 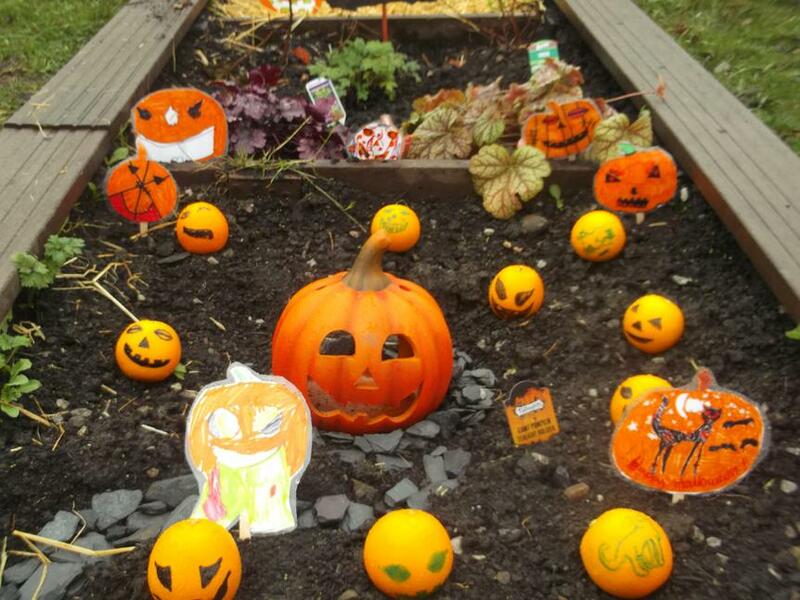 To celebrate achieving an RHS Level 3 gardening award, we held an Autumn Festival. 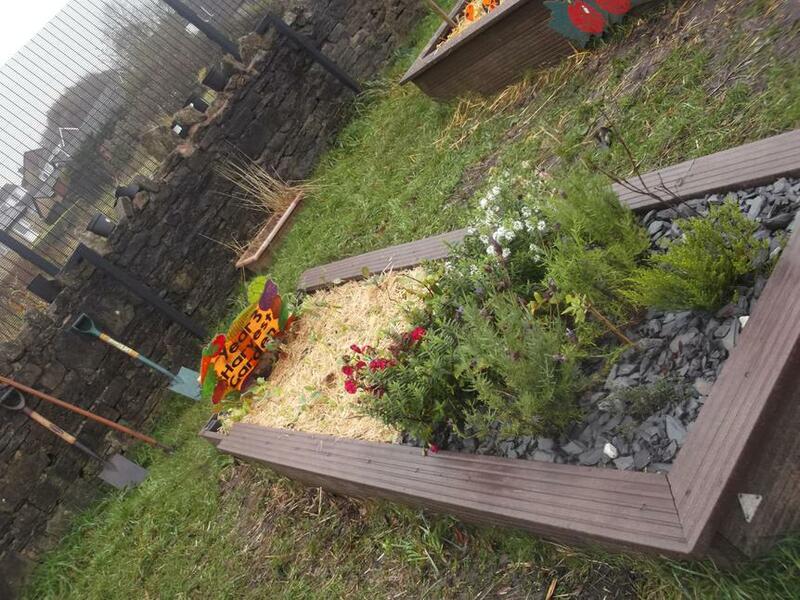 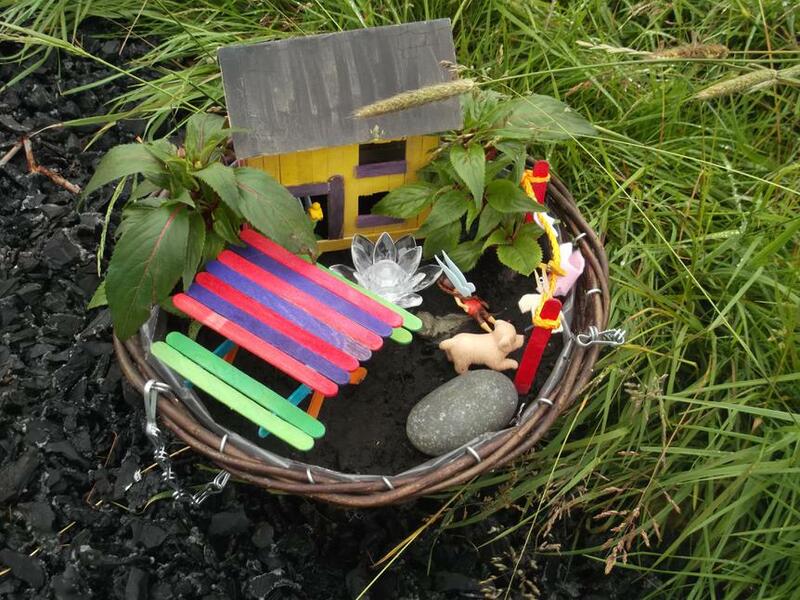 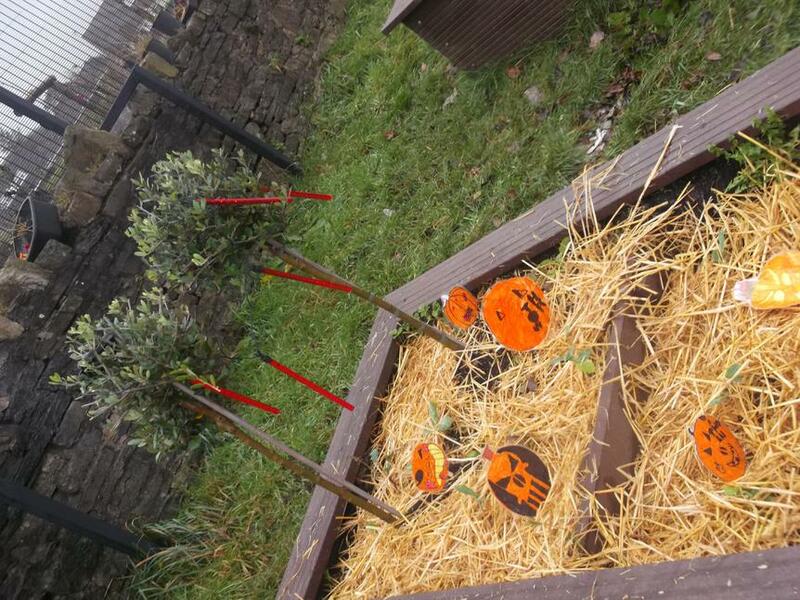 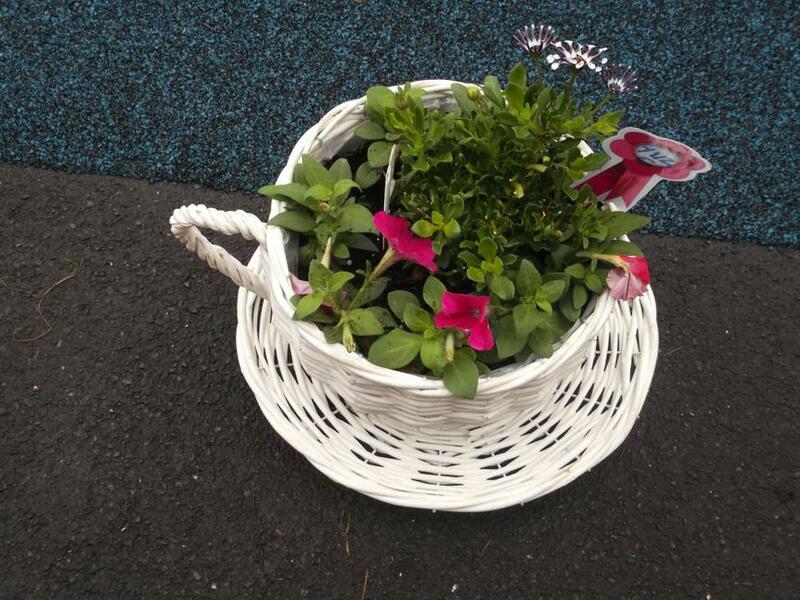 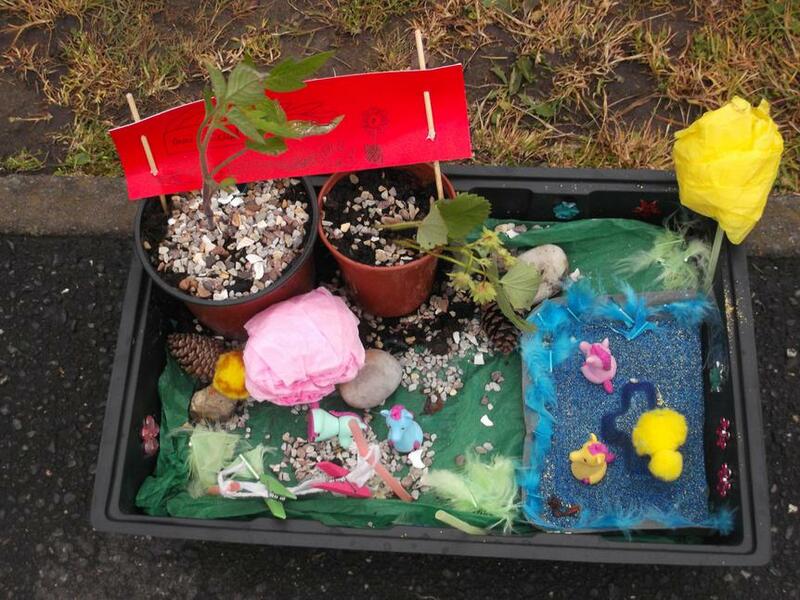 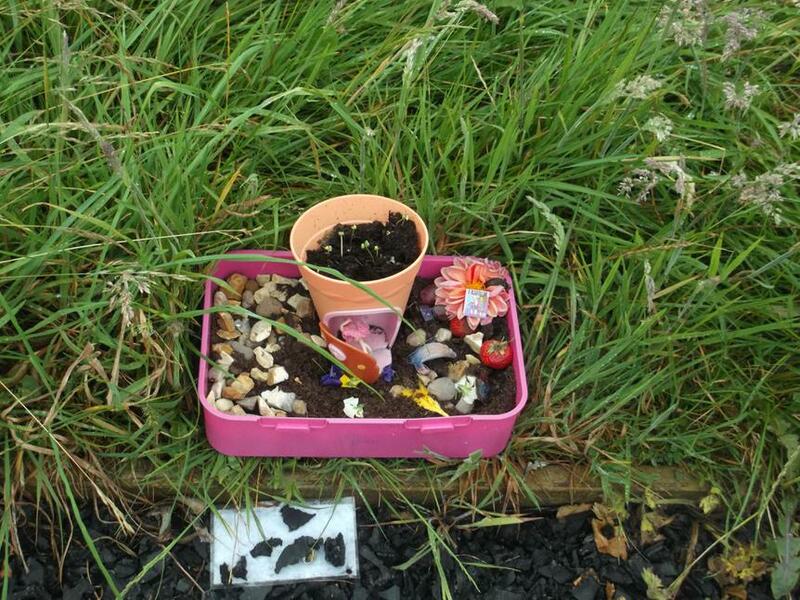 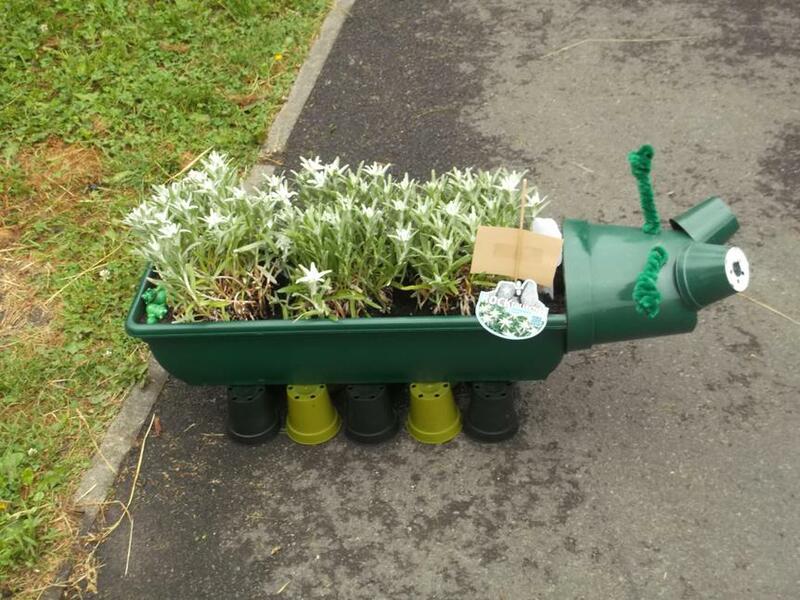 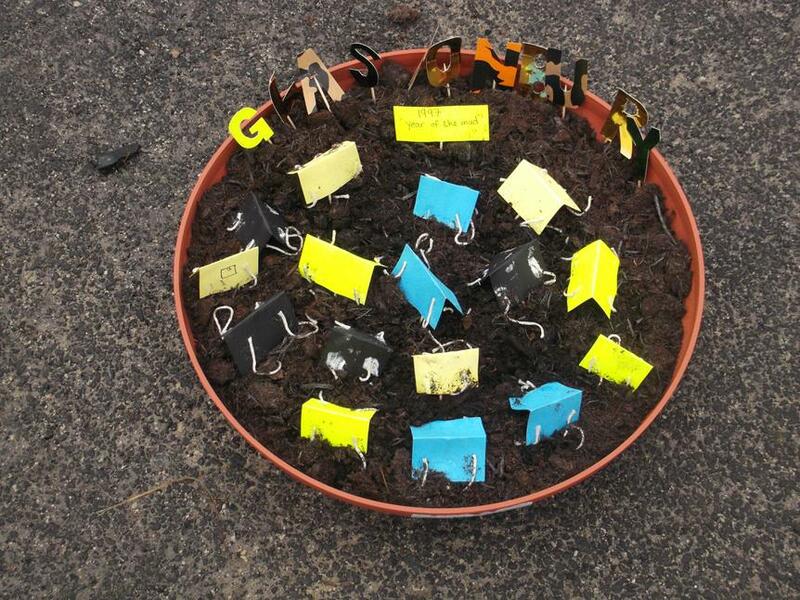 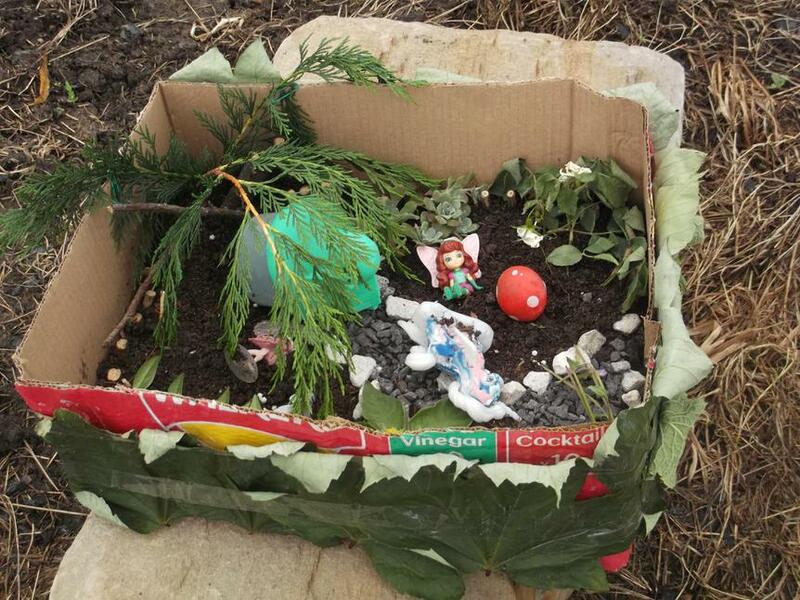 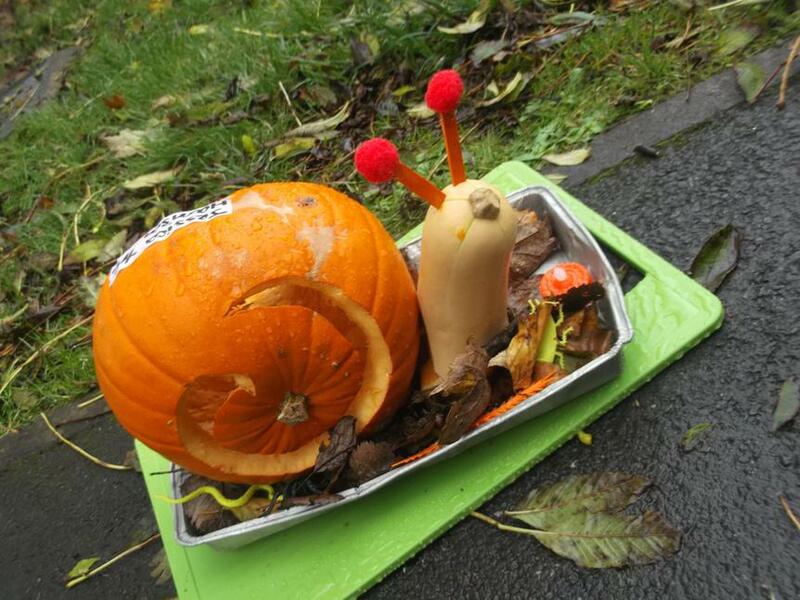 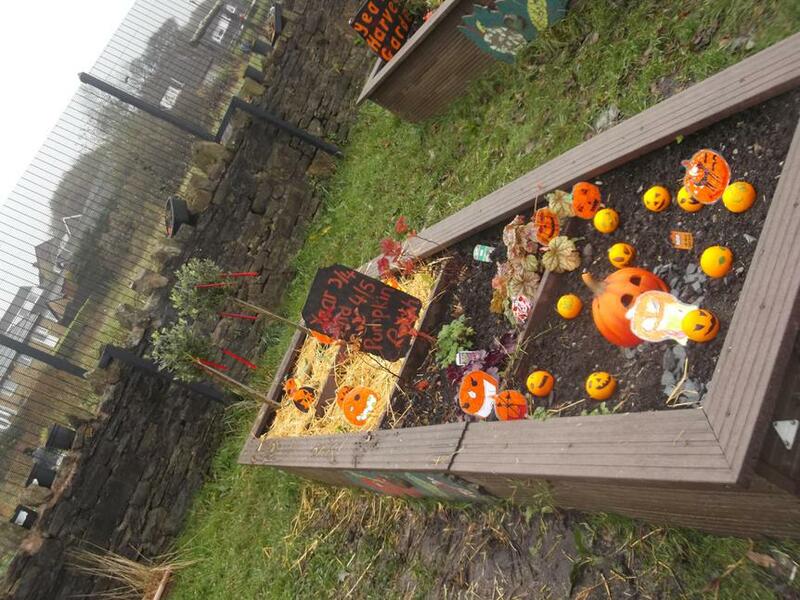 The children put their 'green-fingers' to the test and worked exceptionally hard to weed, cut back and re-plant their classes raised bed in a spooky halloween theme. 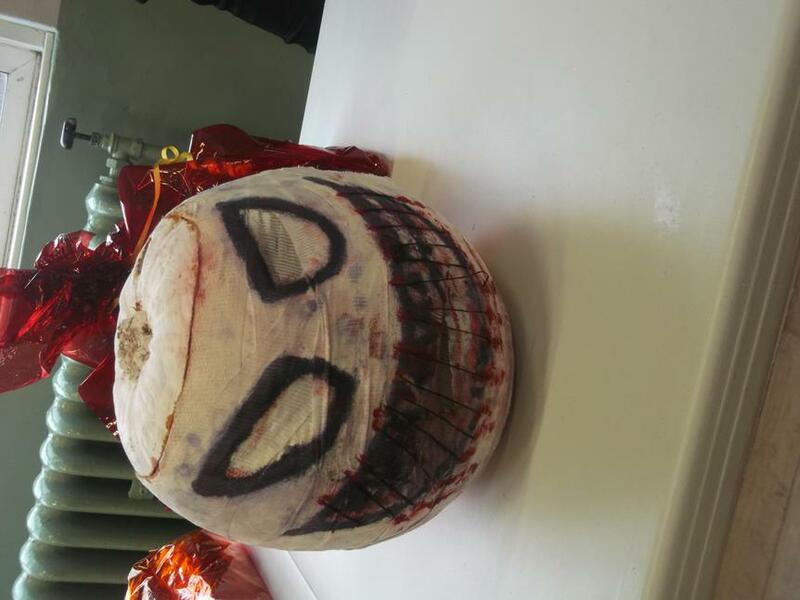 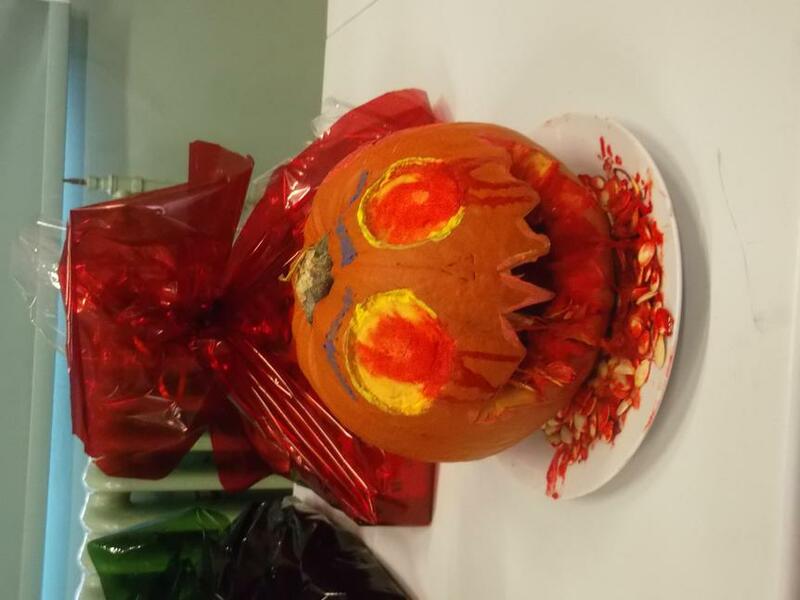 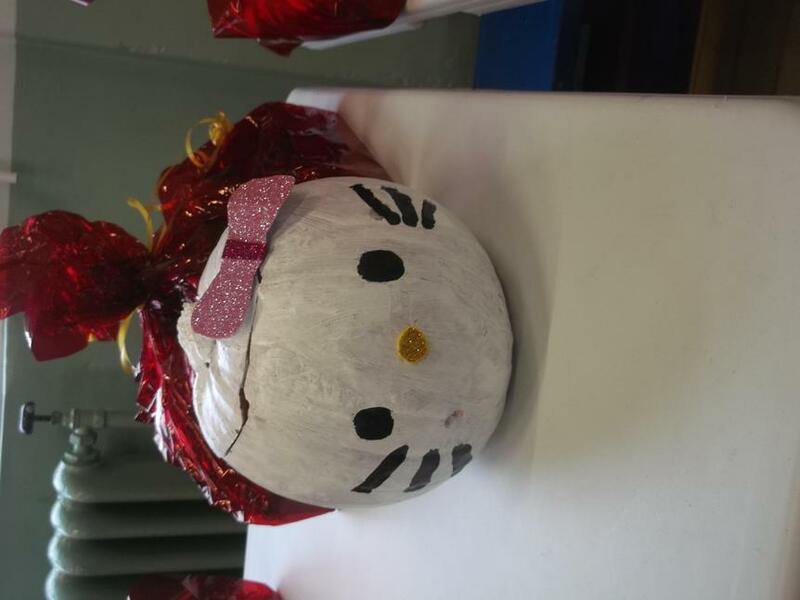 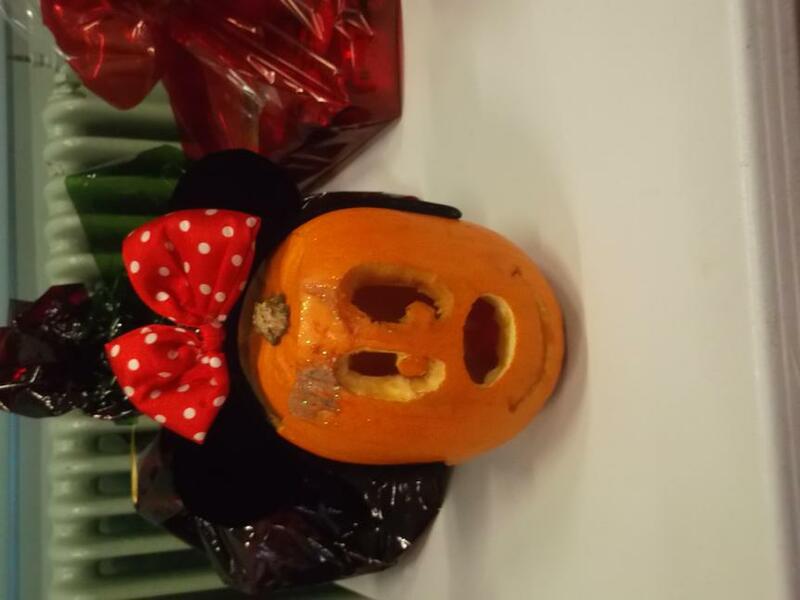 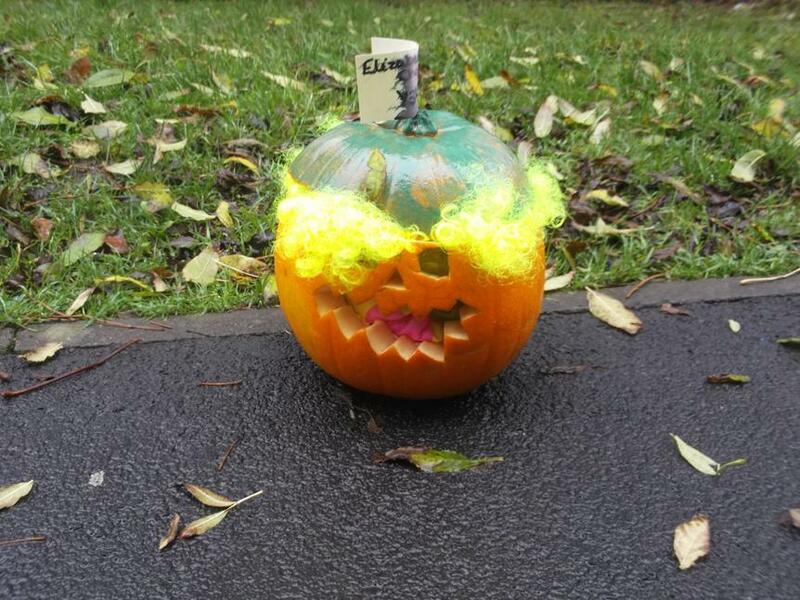 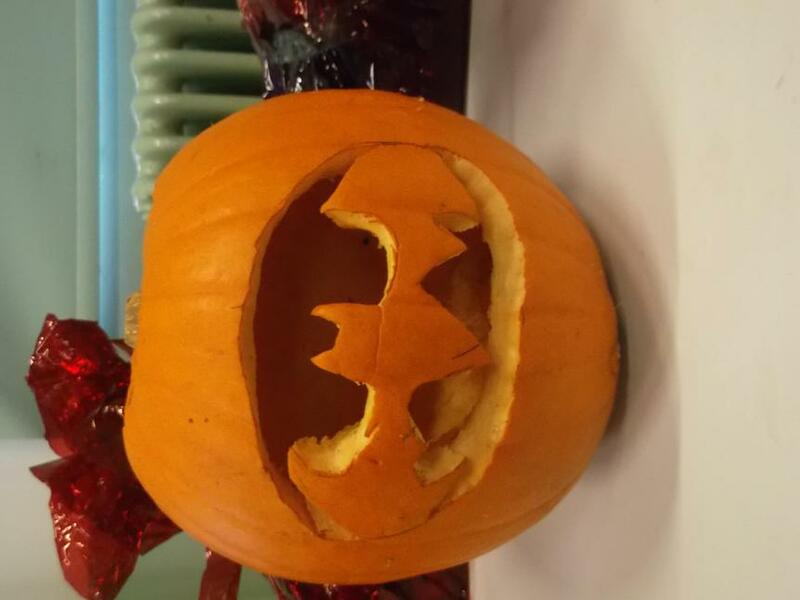 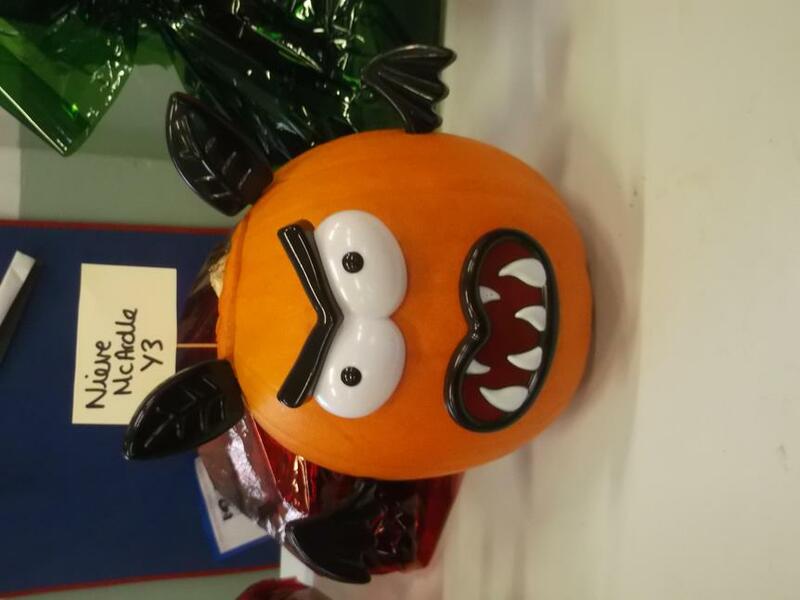 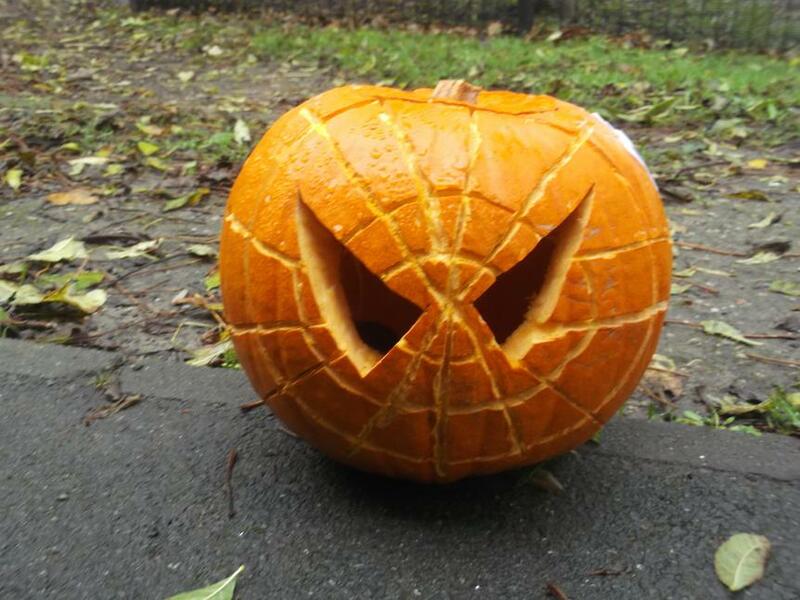 Once again, our families showed off their creativity in our pumpkin carving competition. 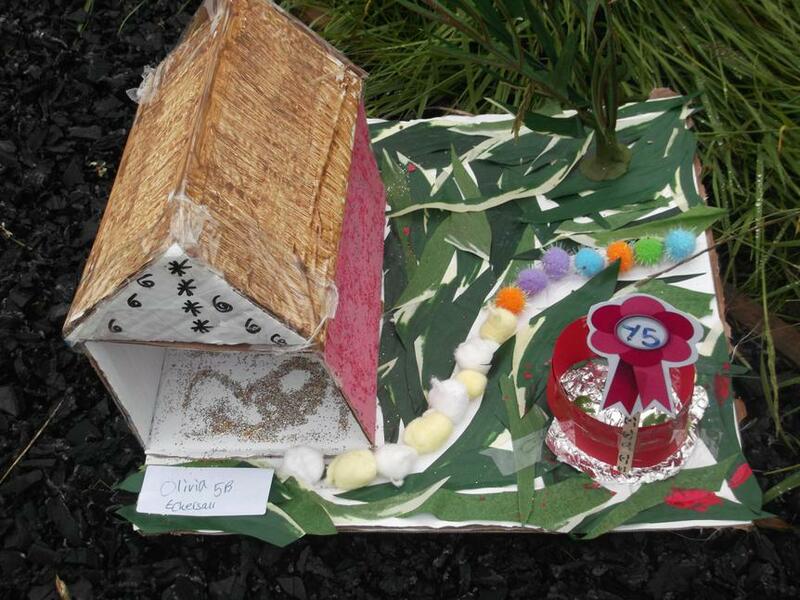 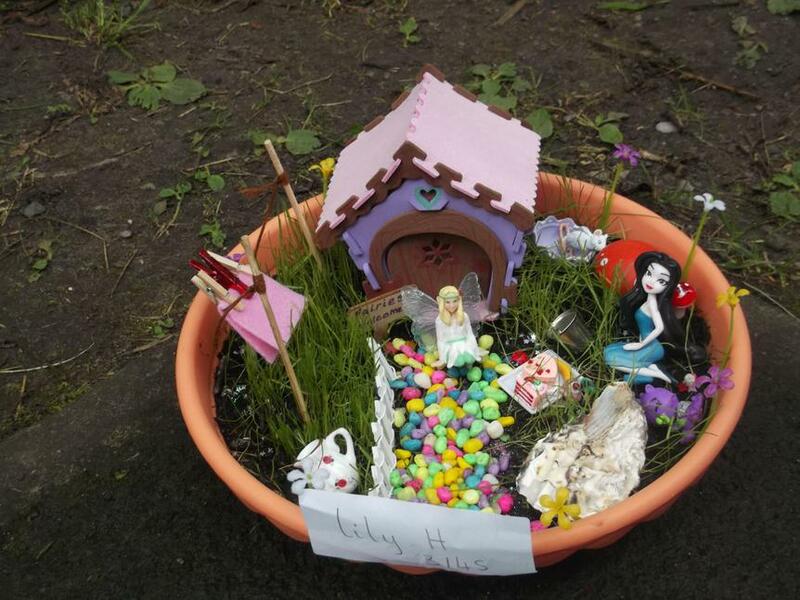 I'm sure you'll agree we had some great entries and it was difficult to pick a winner from each class. 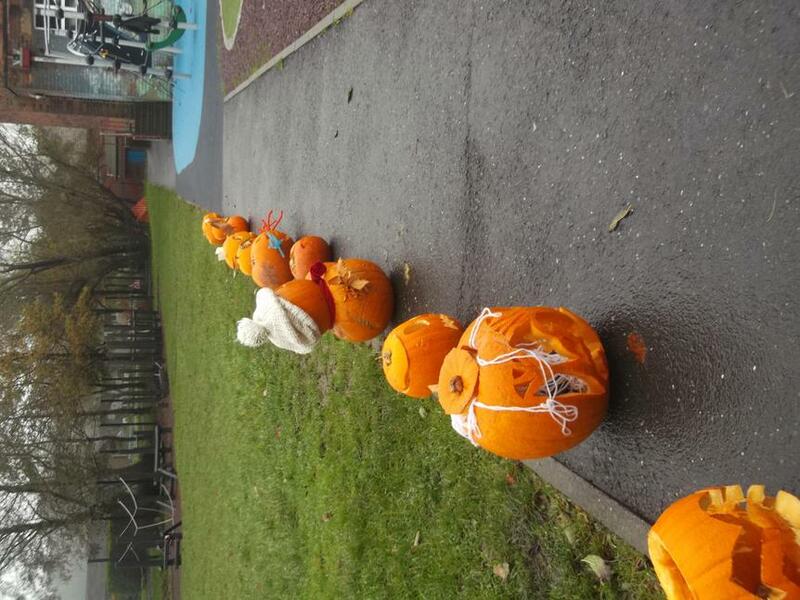 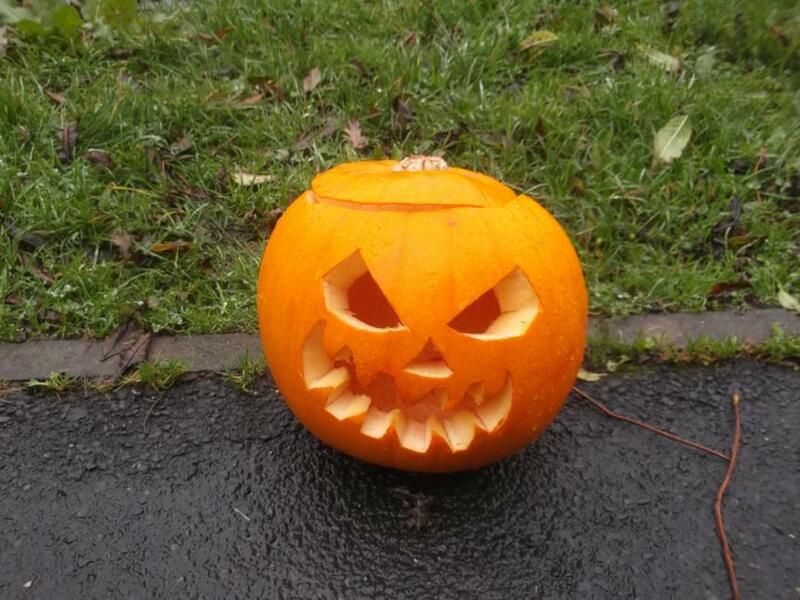 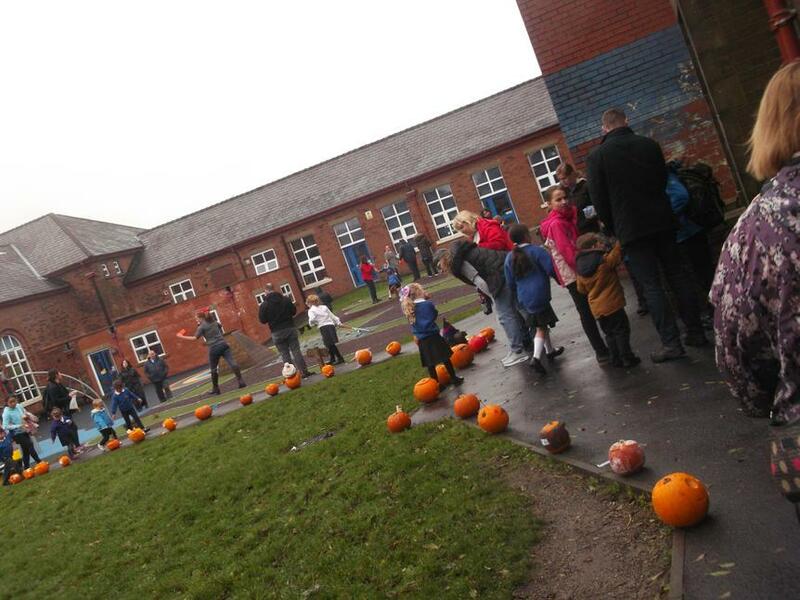 Luckily the weather stayed fine and our families had a great time playing crazy golf and completing a spooky trivia quiz in the forest school area. 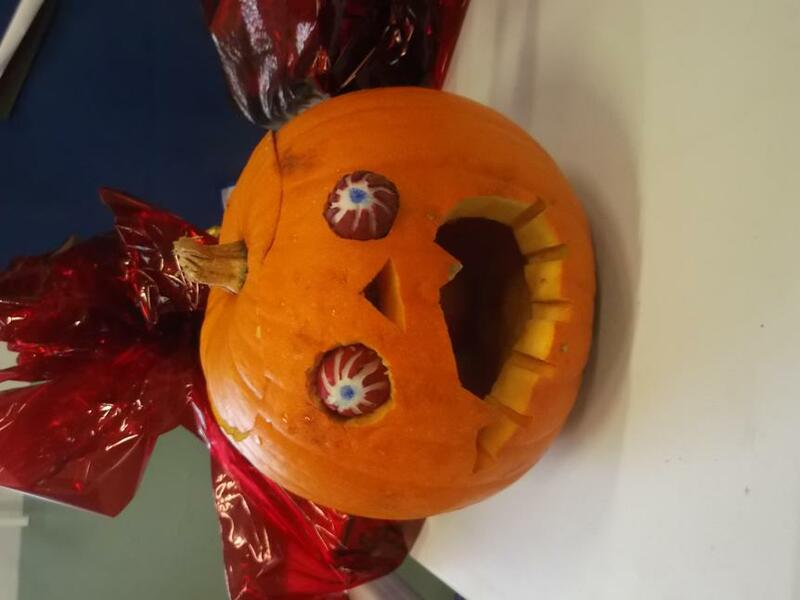 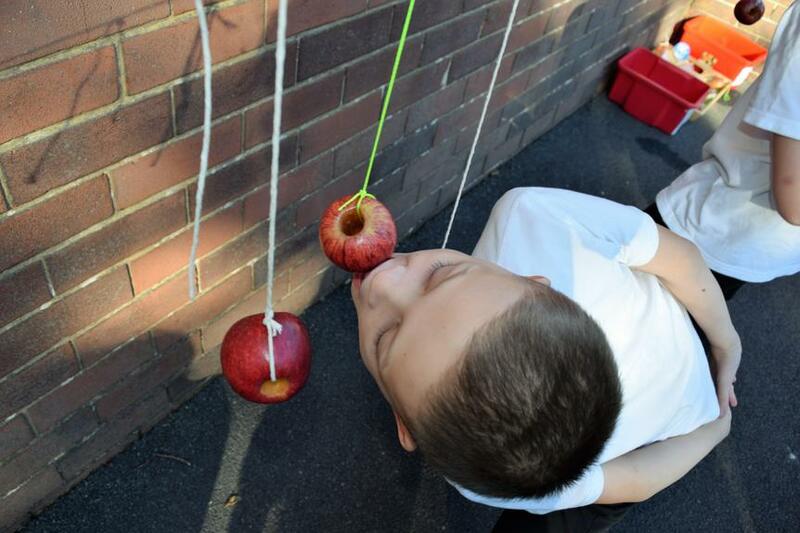 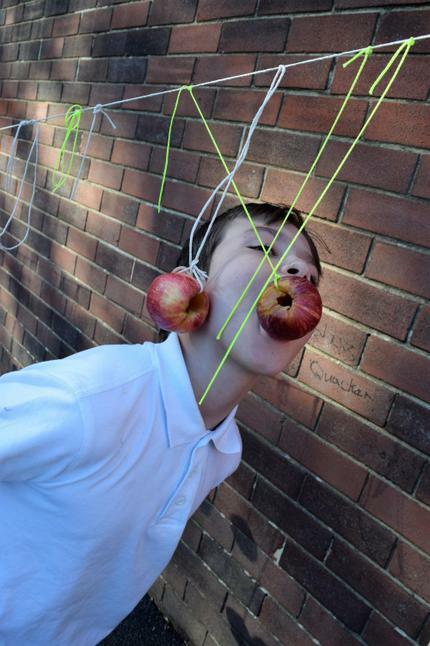 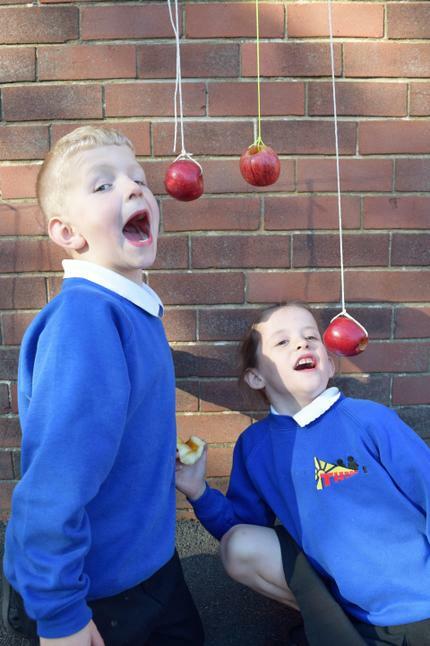 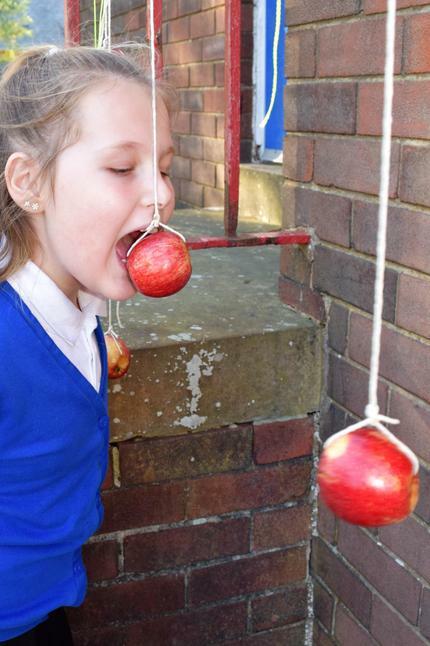 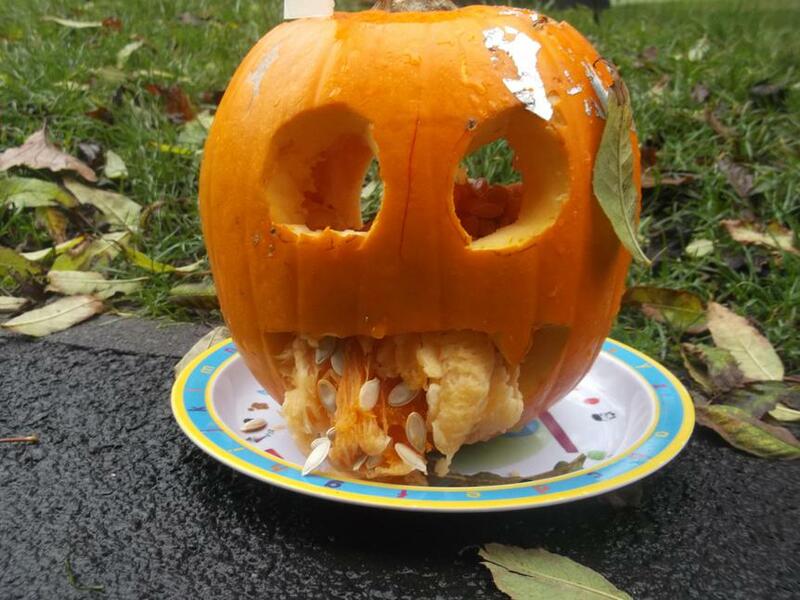 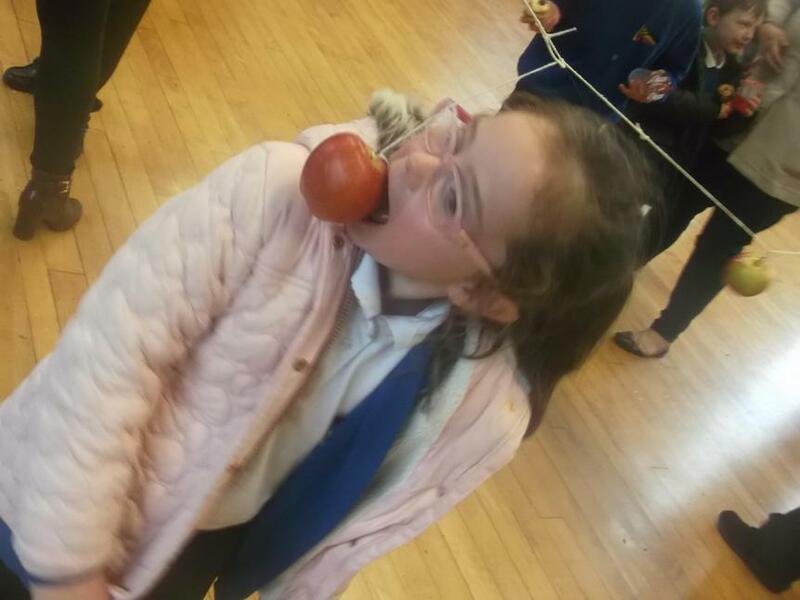 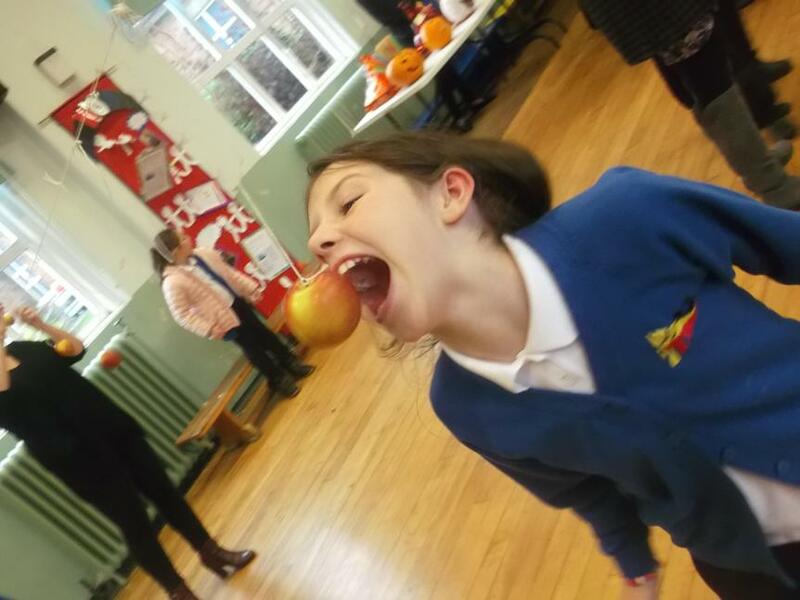 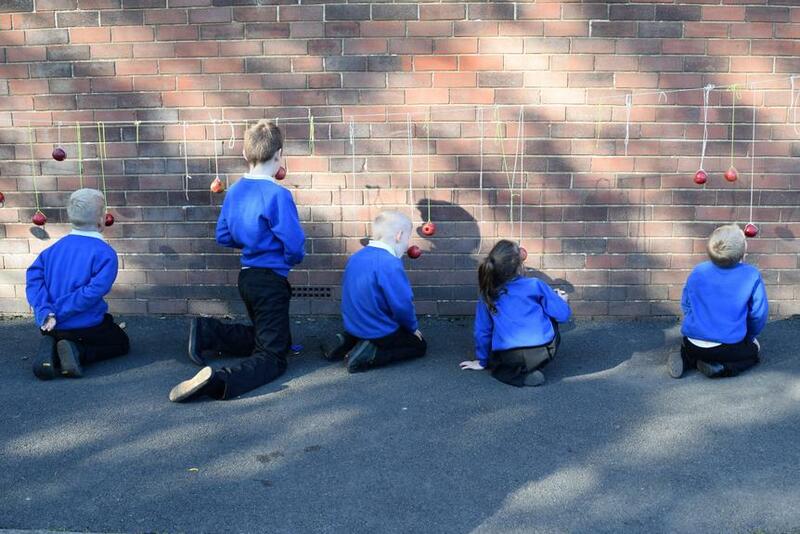 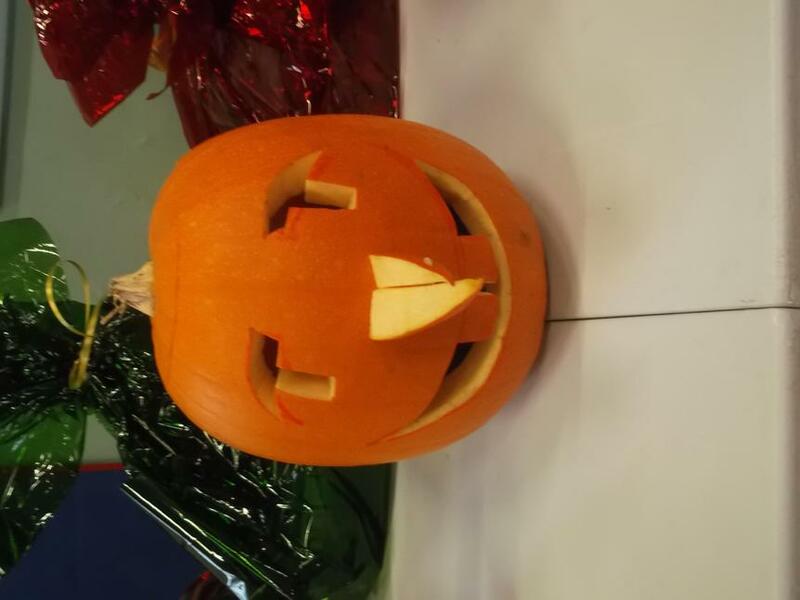 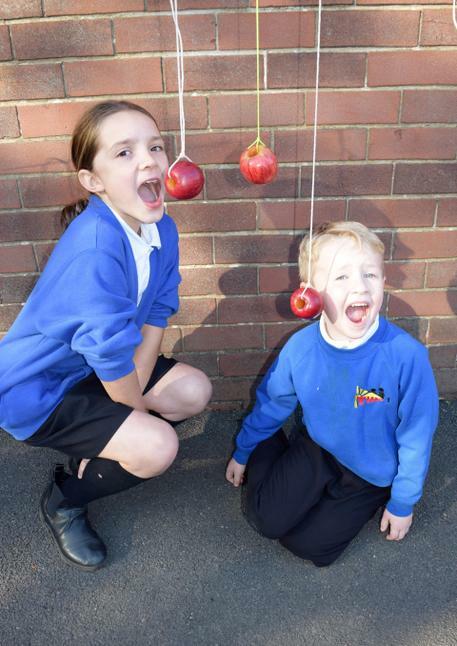 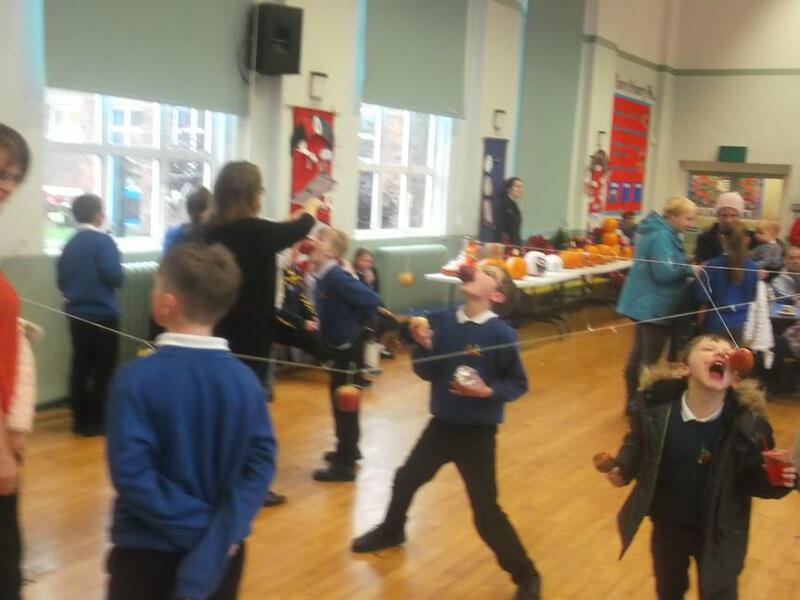 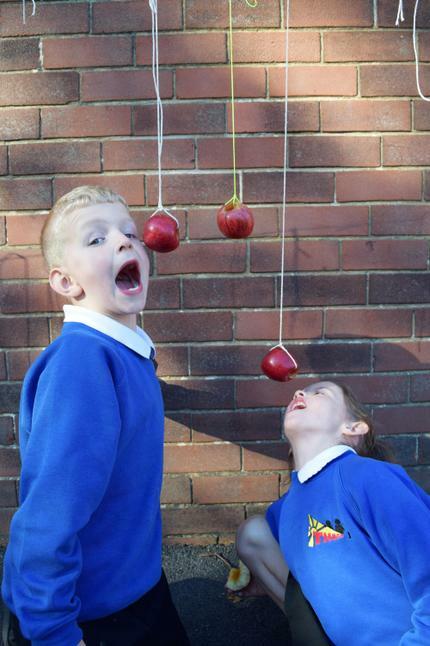 Apple bobbing was a huge success along with our refreshment stall with lots of tasty autumnal treats made by the children such as pumpkin soup (EYFS), pumpkin cake (2W), parkin (1/2K) and chocolate apples (Yr6). 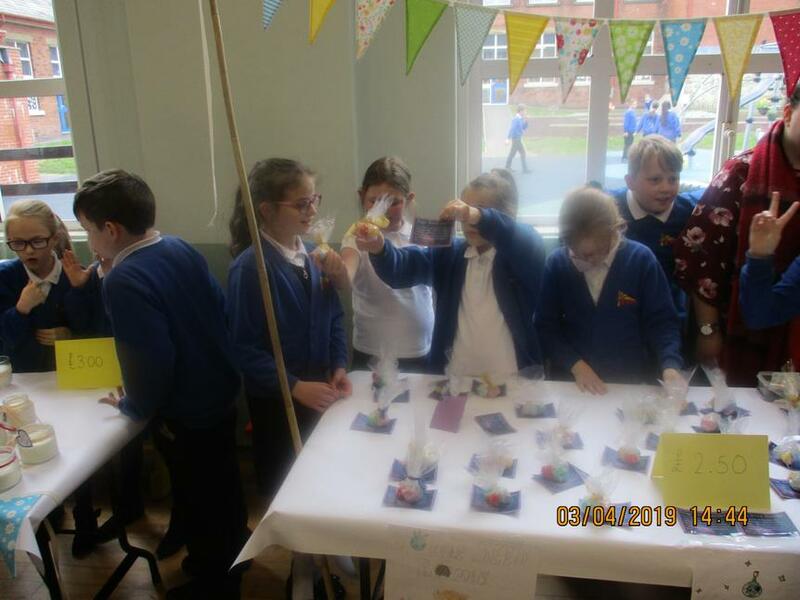 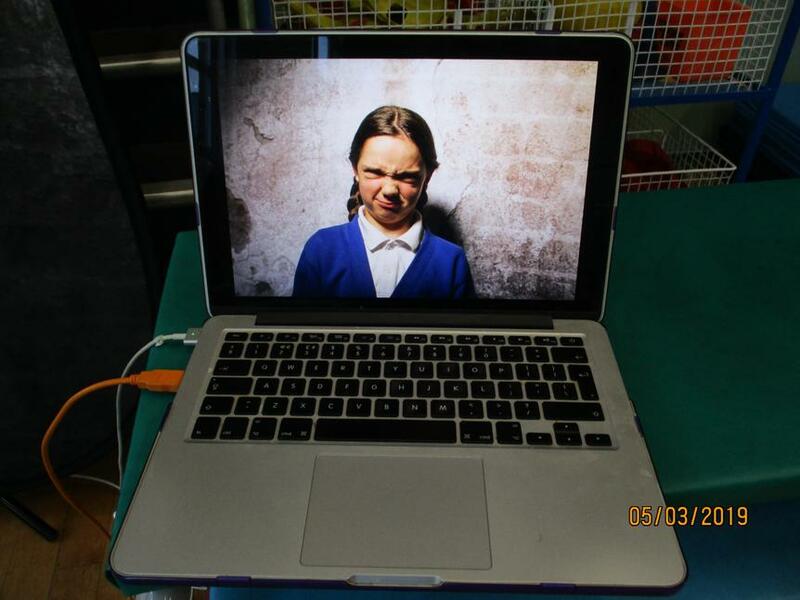 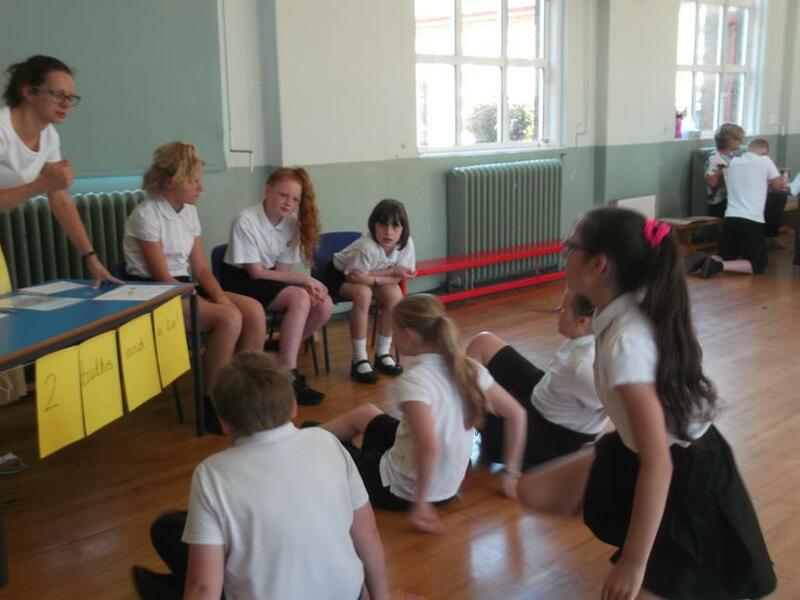 Year 6 did a fantastic job running all the events and were a credit to the school. 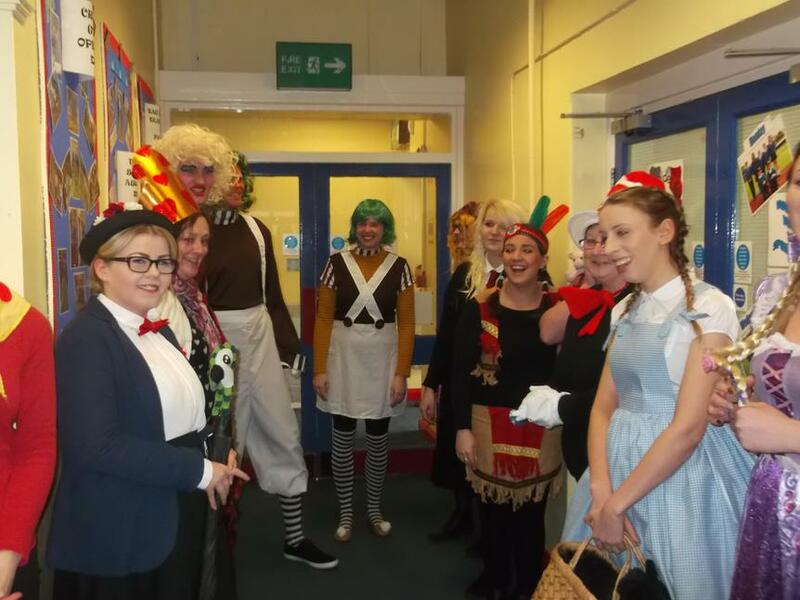 We are now working towards a Level 4 award and hope you join us next term for our spring festivities. 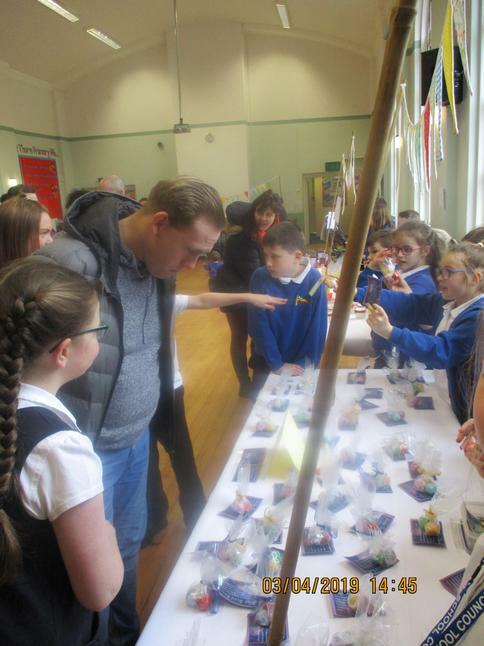 Thank you for your support in making these events a great success. 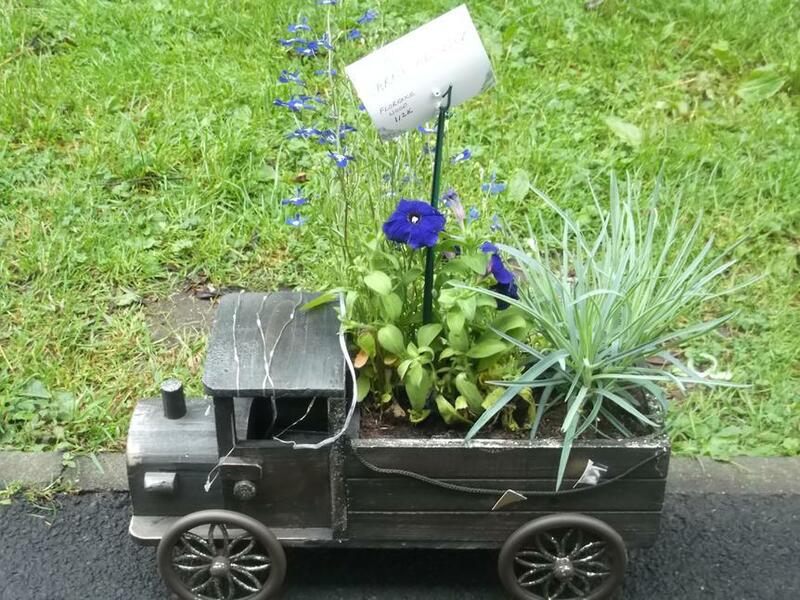 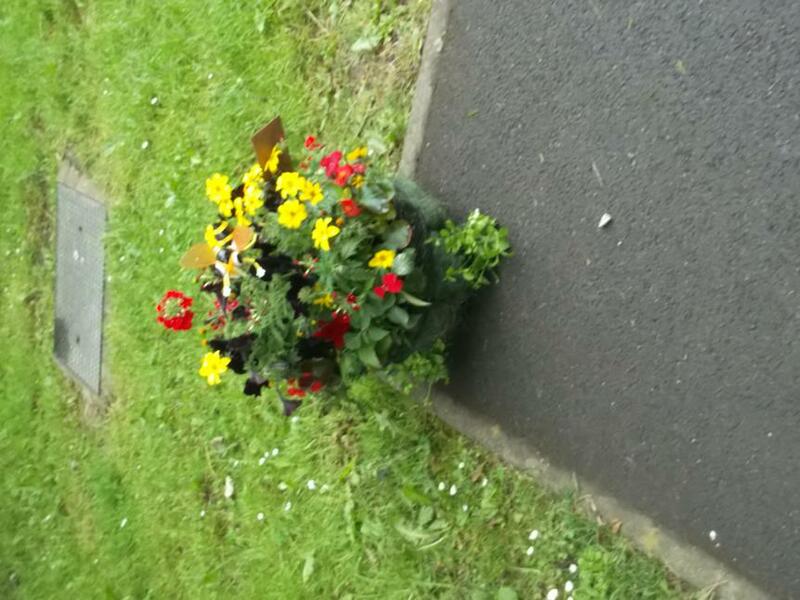 Bacup in Bloom Flower Festival 2017! 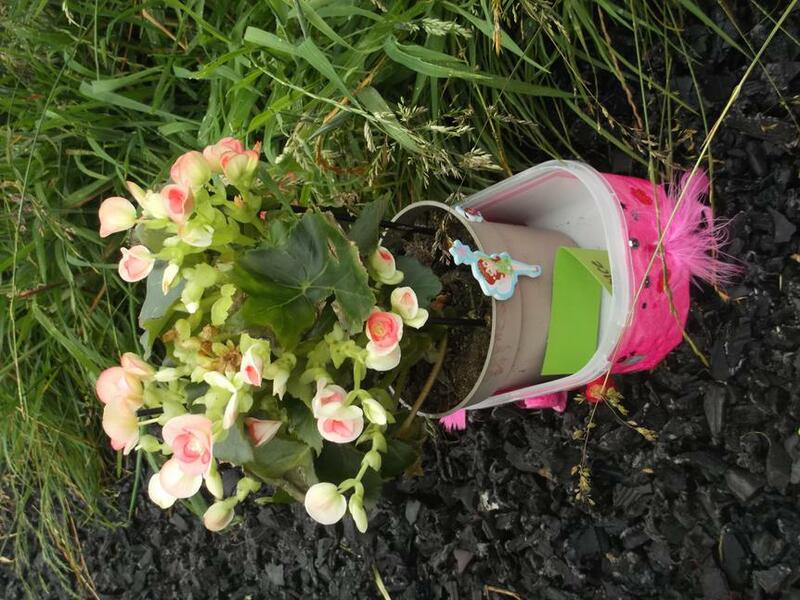 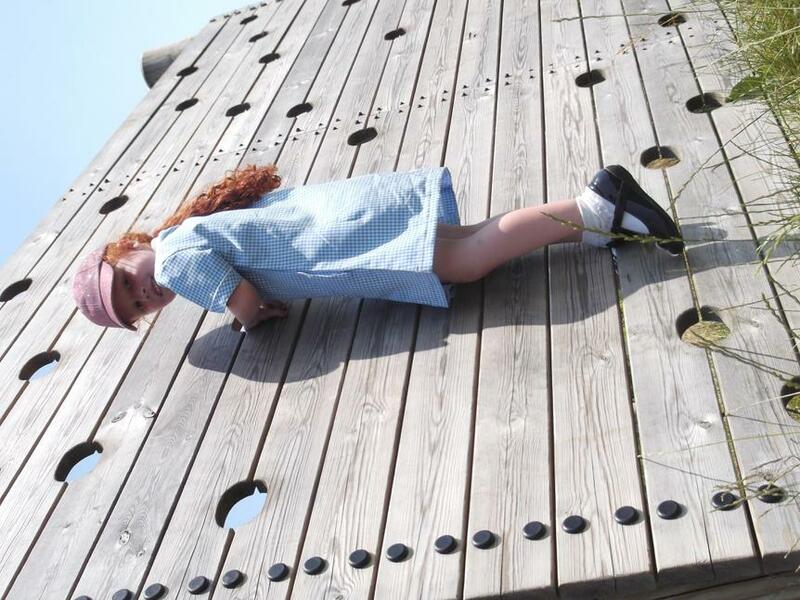 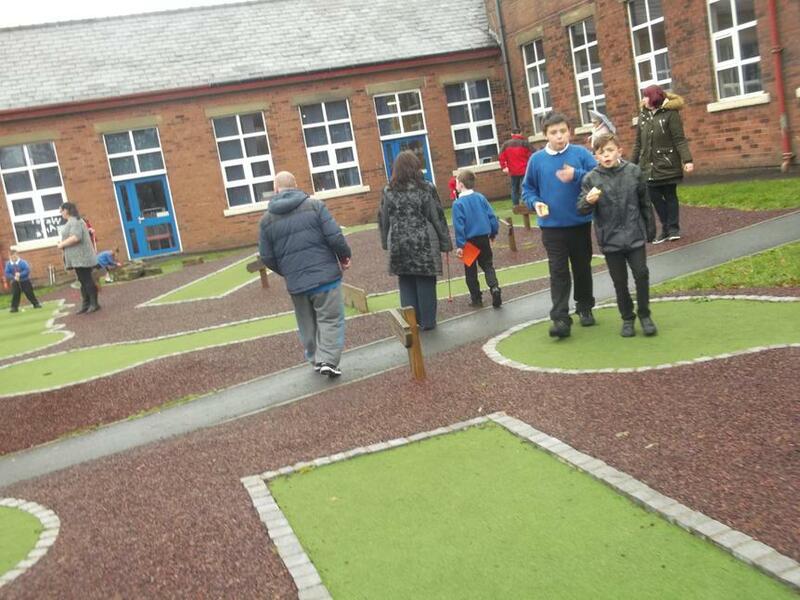 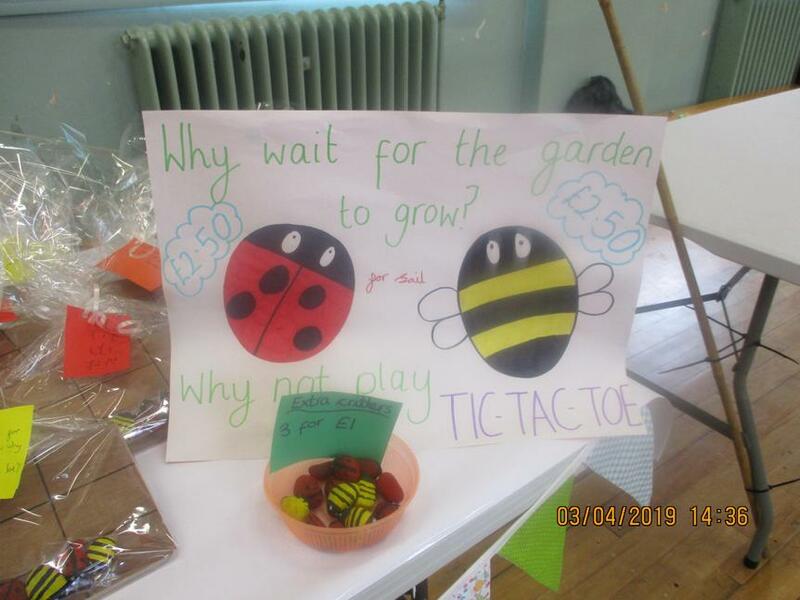 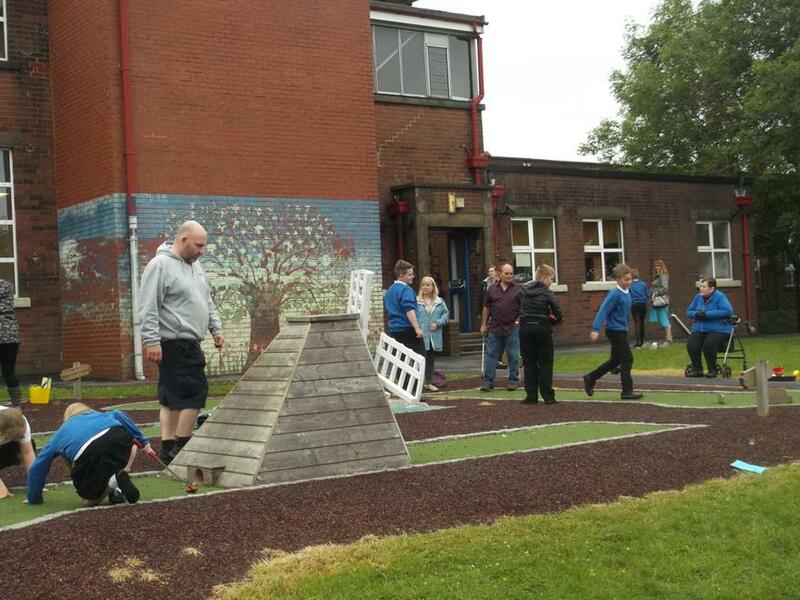 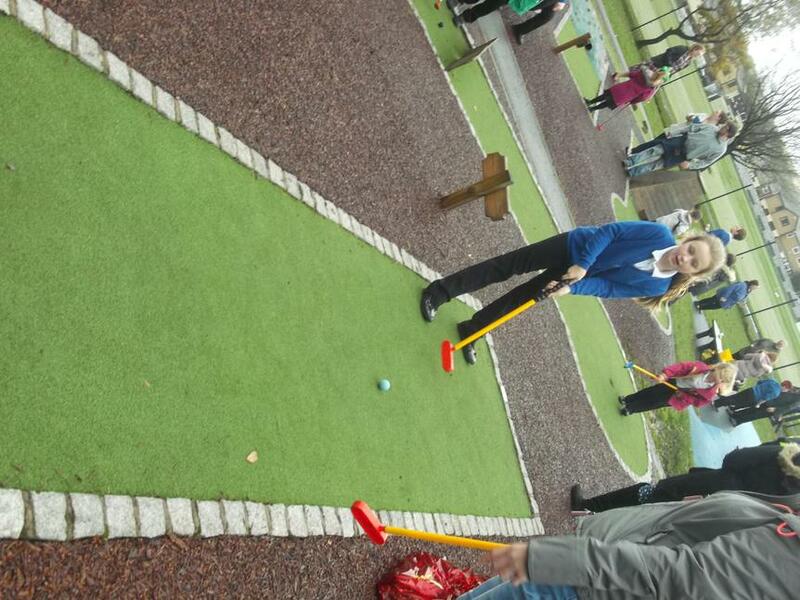 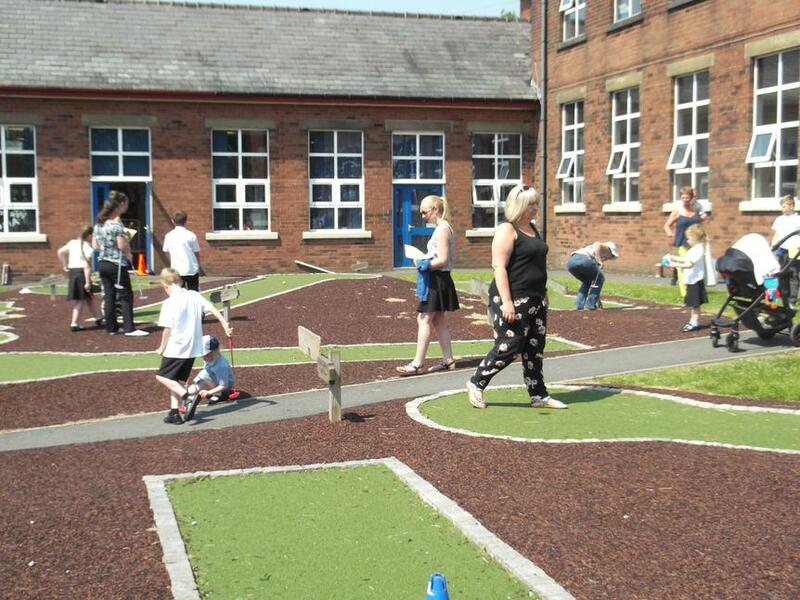 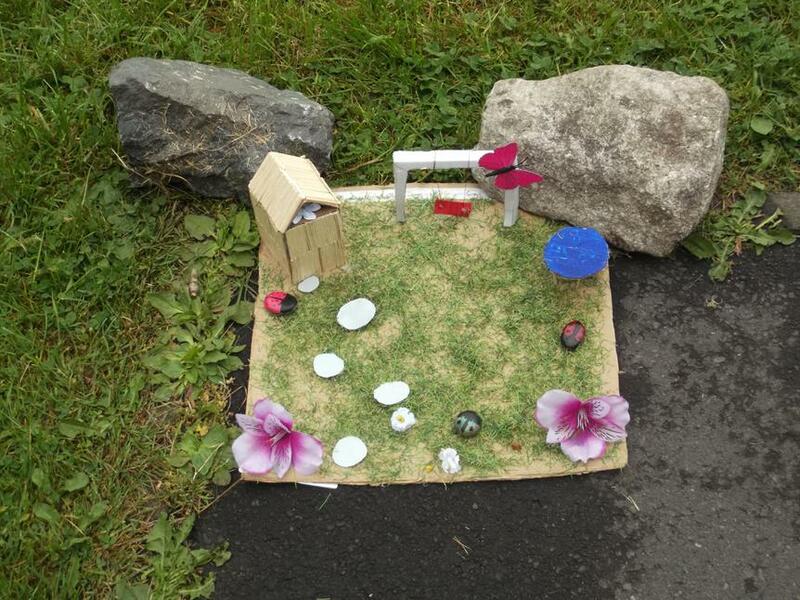 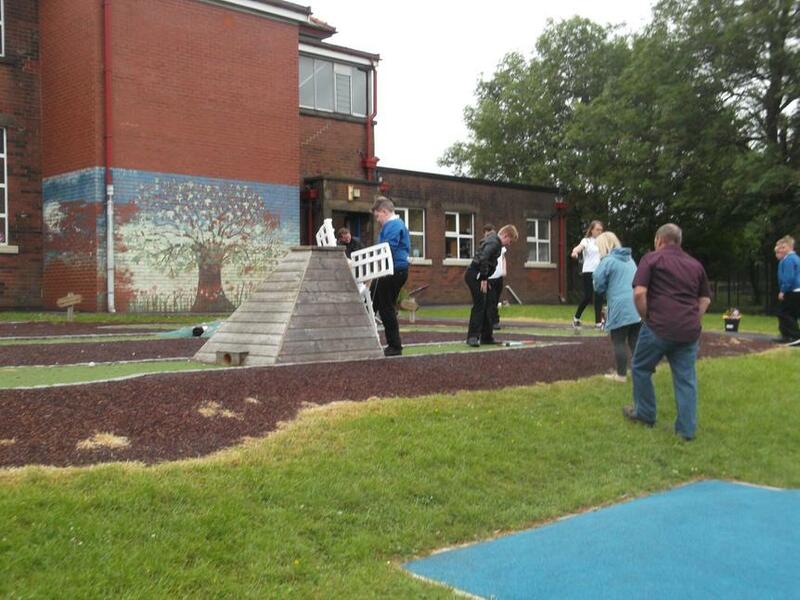 After admiring the gardens, parents and children enjoyed a game of crazy golf and orienteering before having a well-earned rest with a cup of tea and cake. 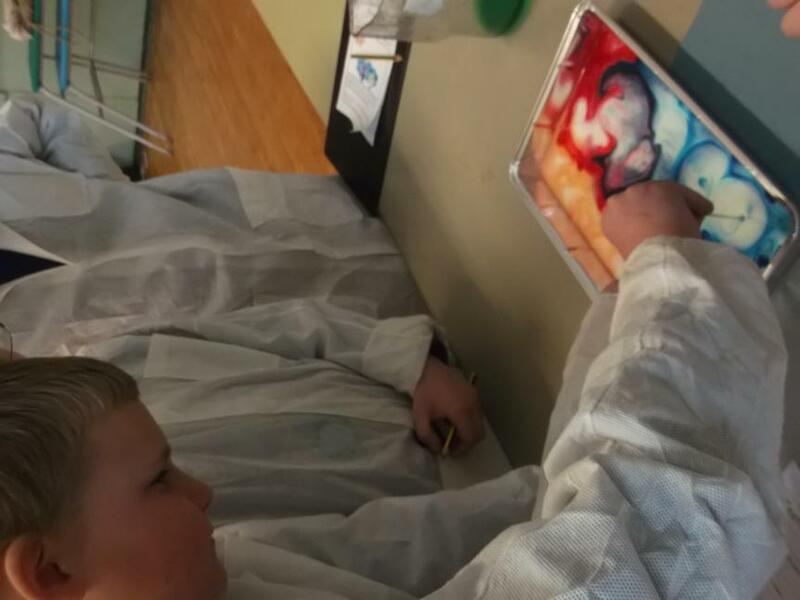 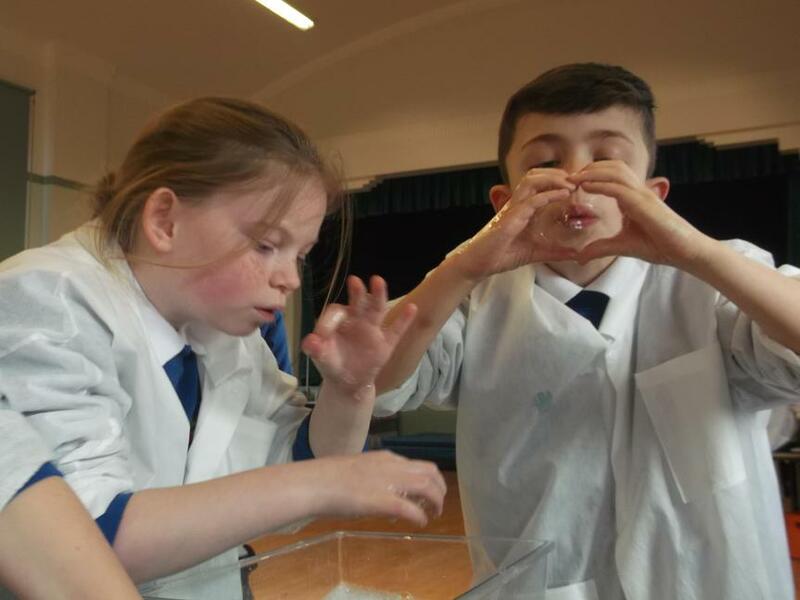 Science Week at Thorn 2017! 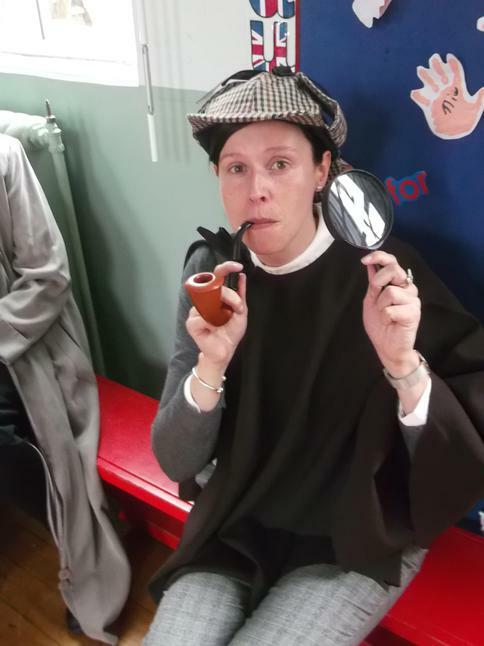 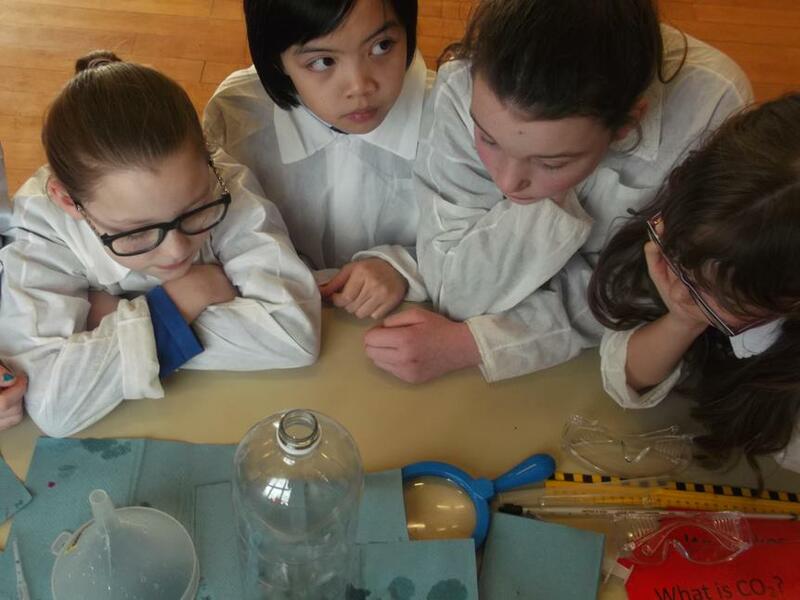 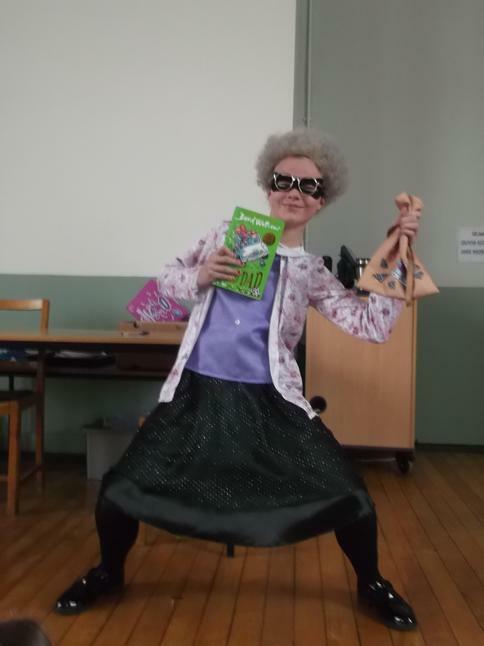 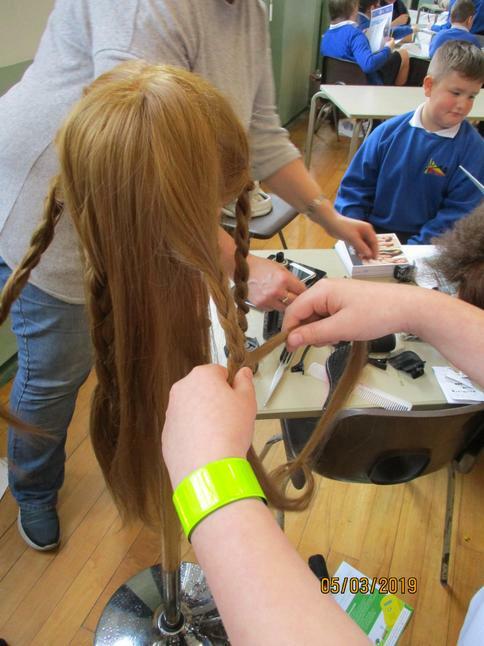 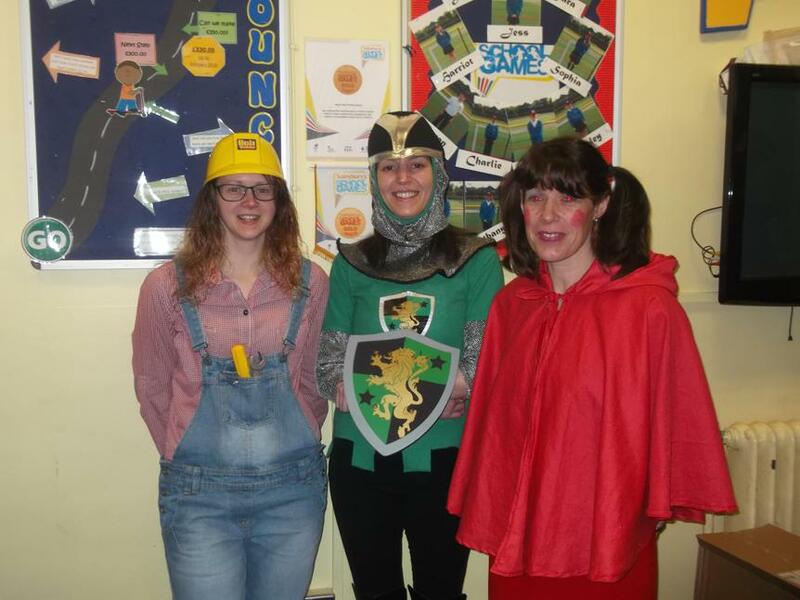 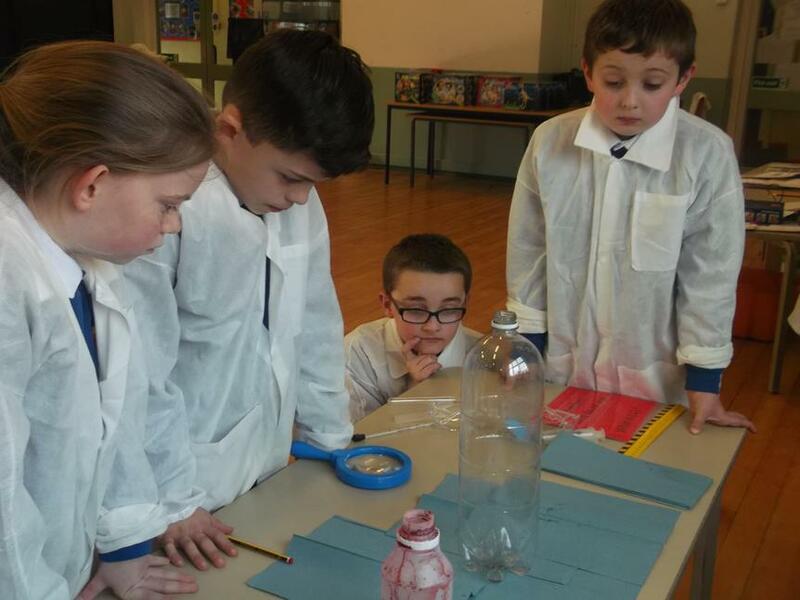 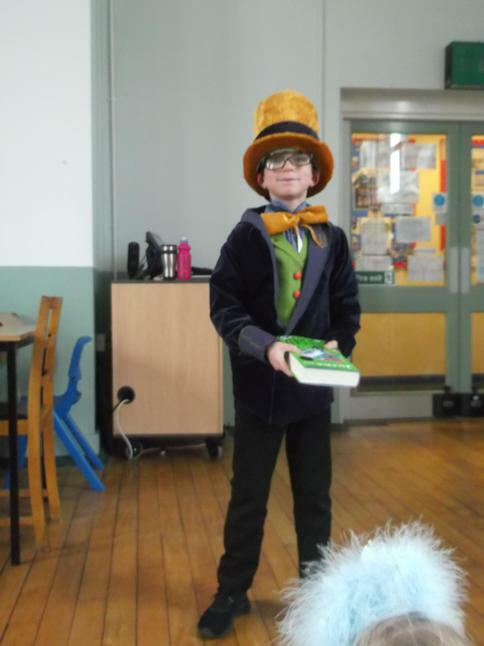 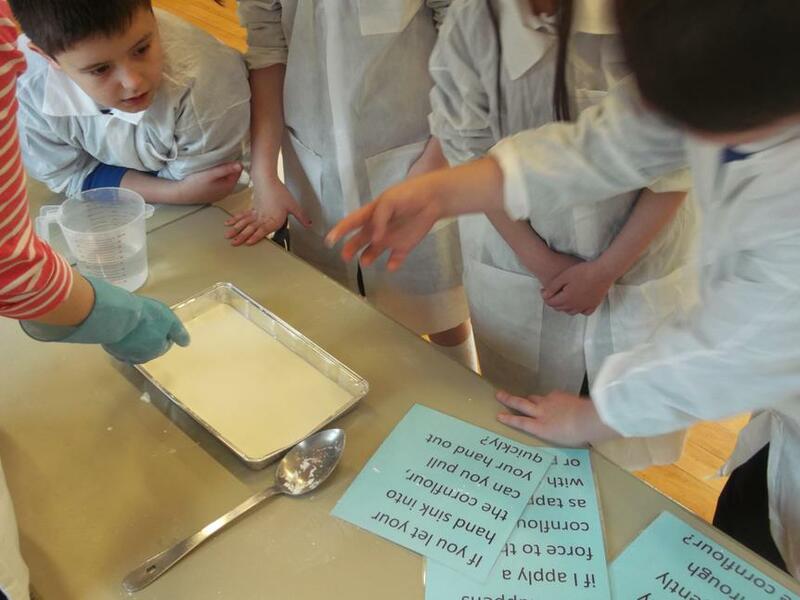 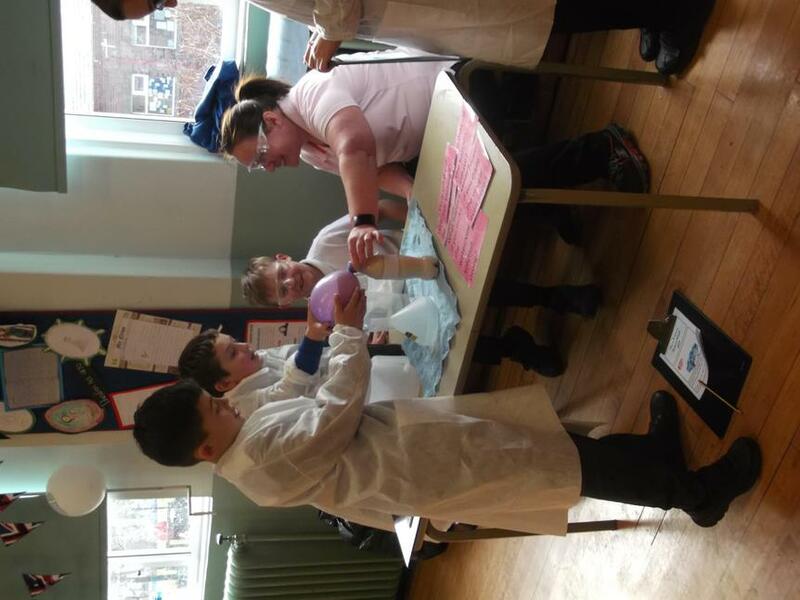 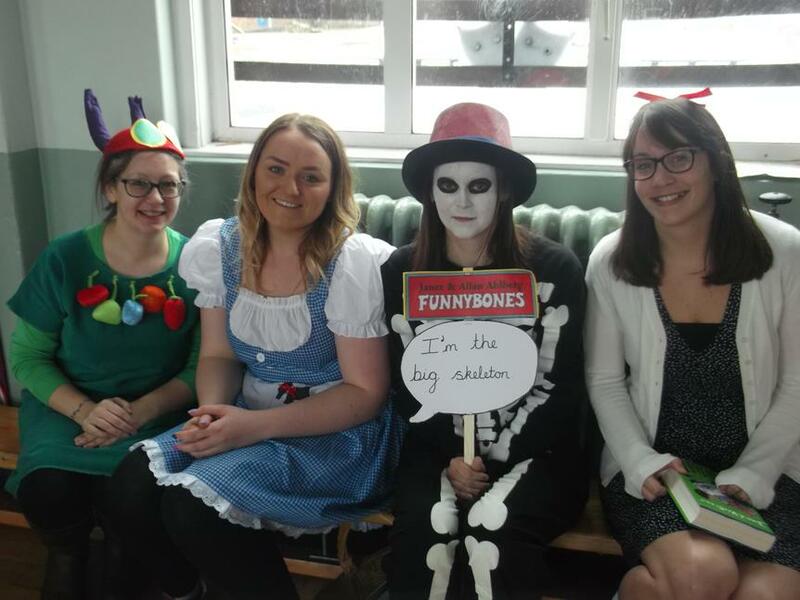 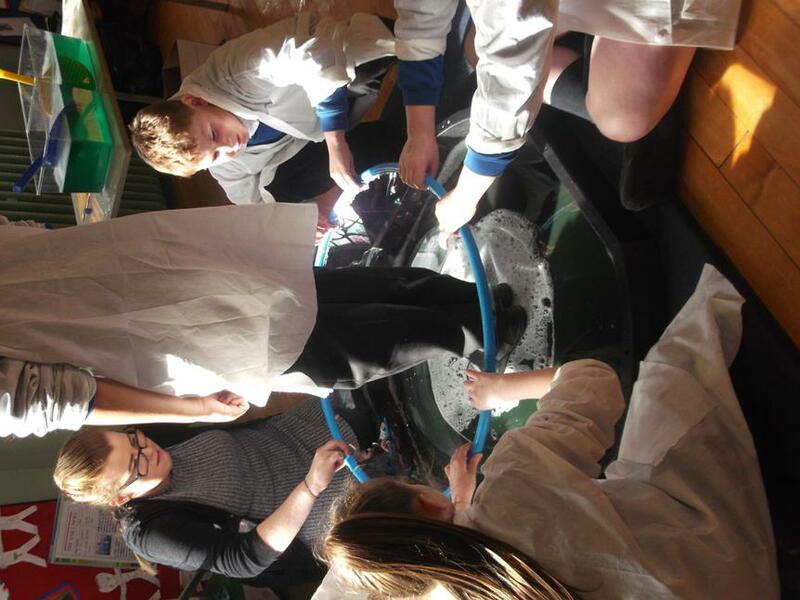 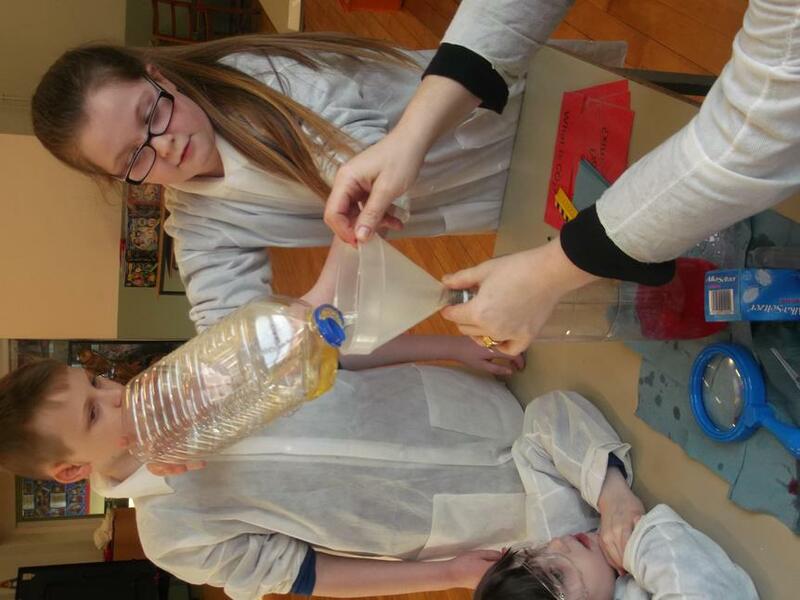 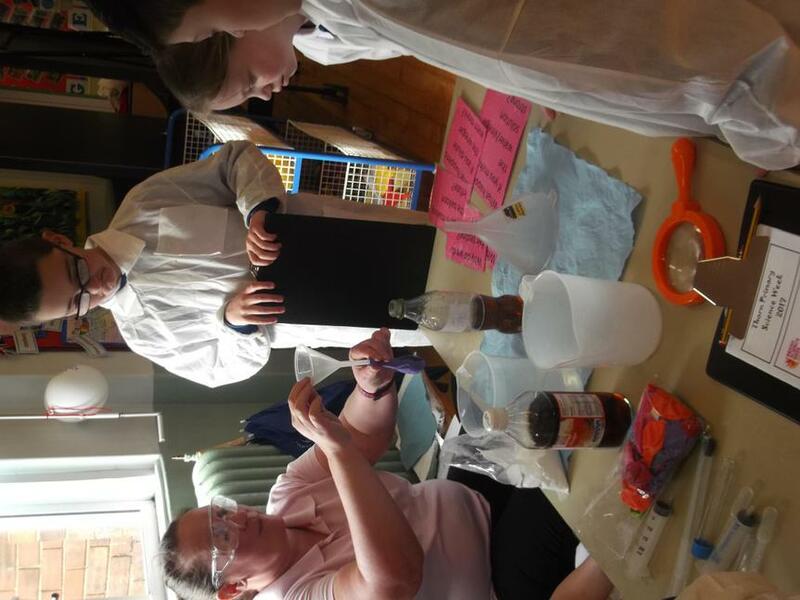 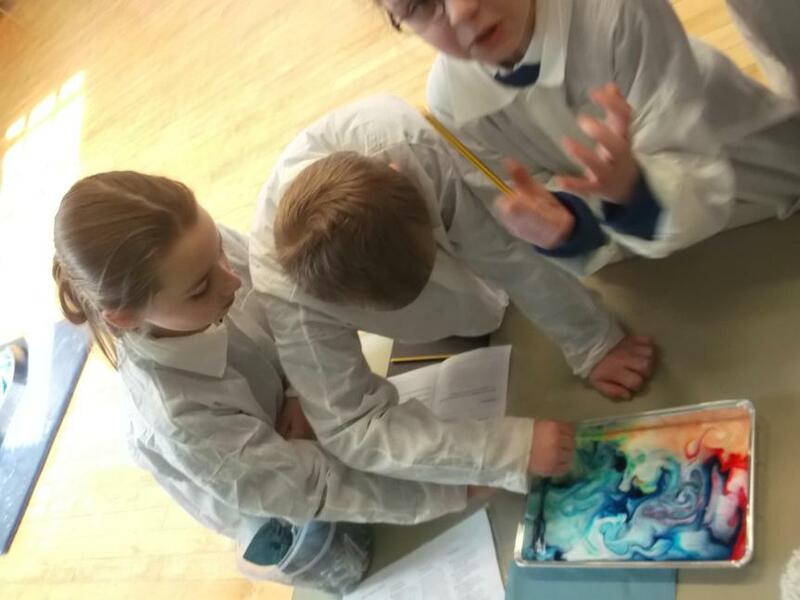 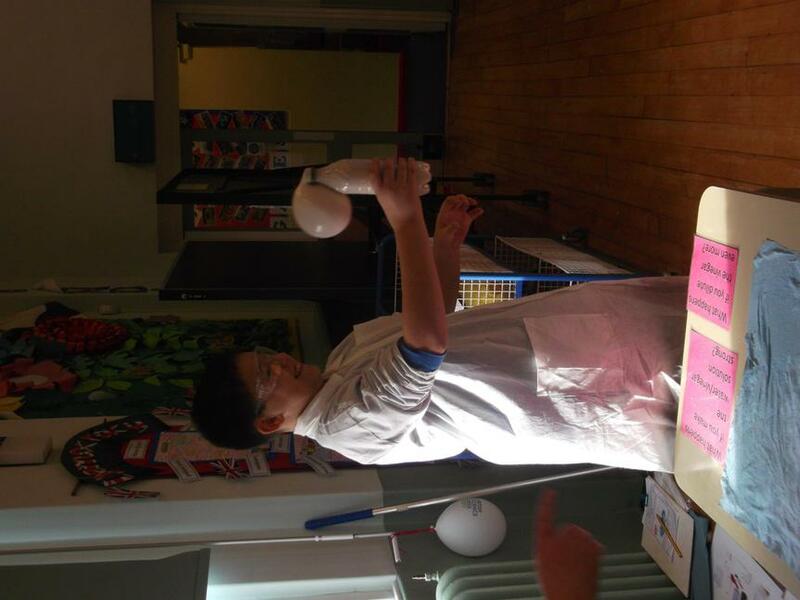 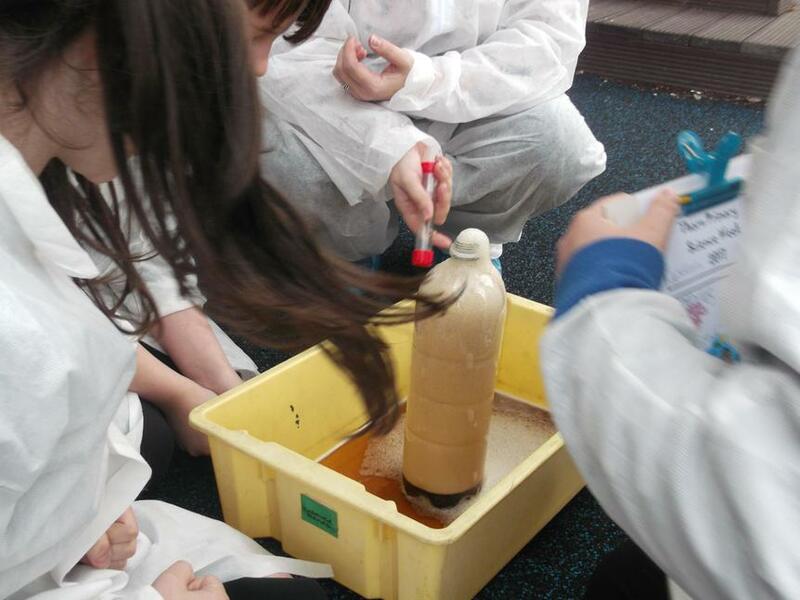 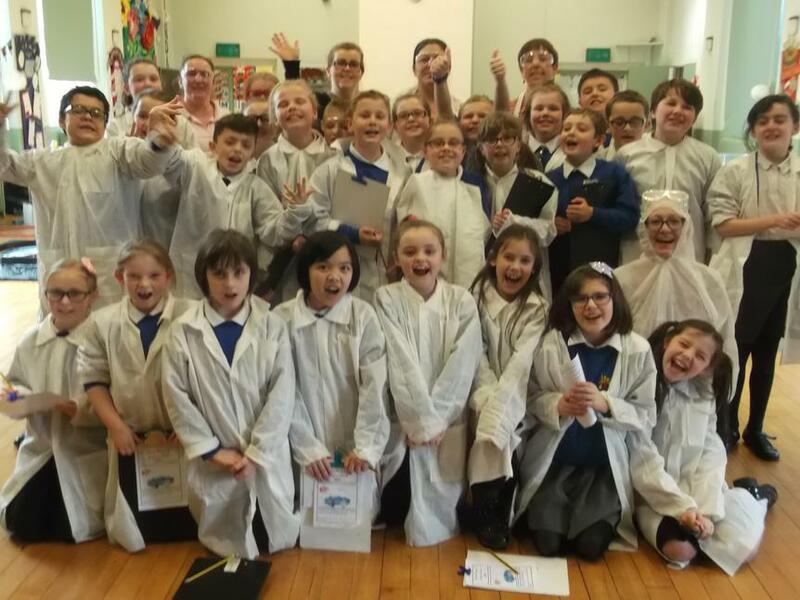 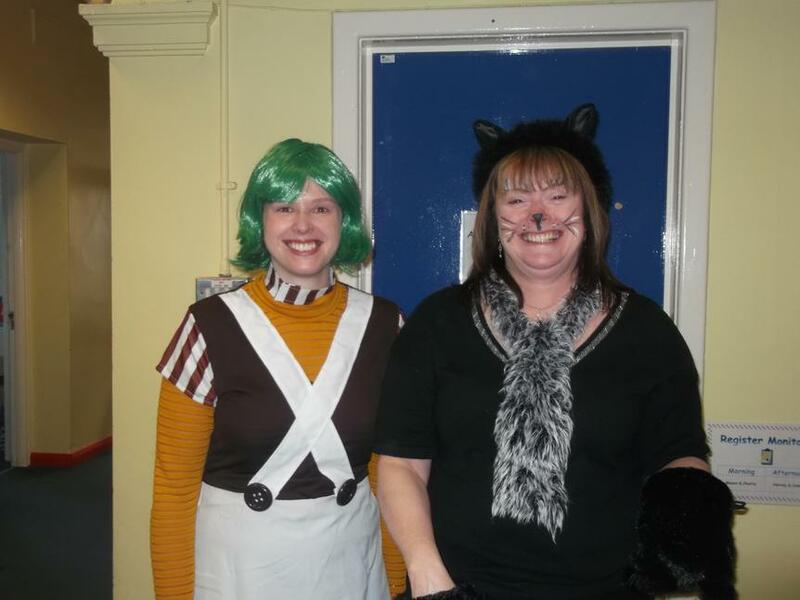 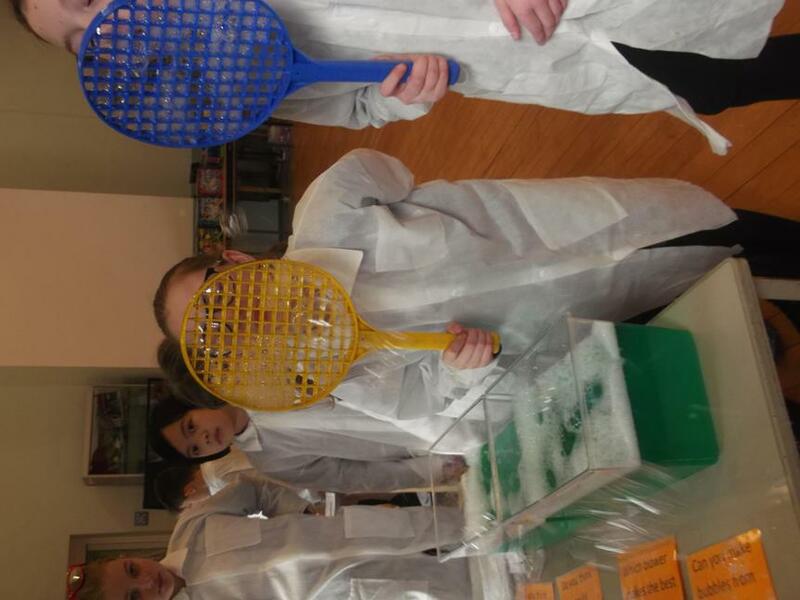 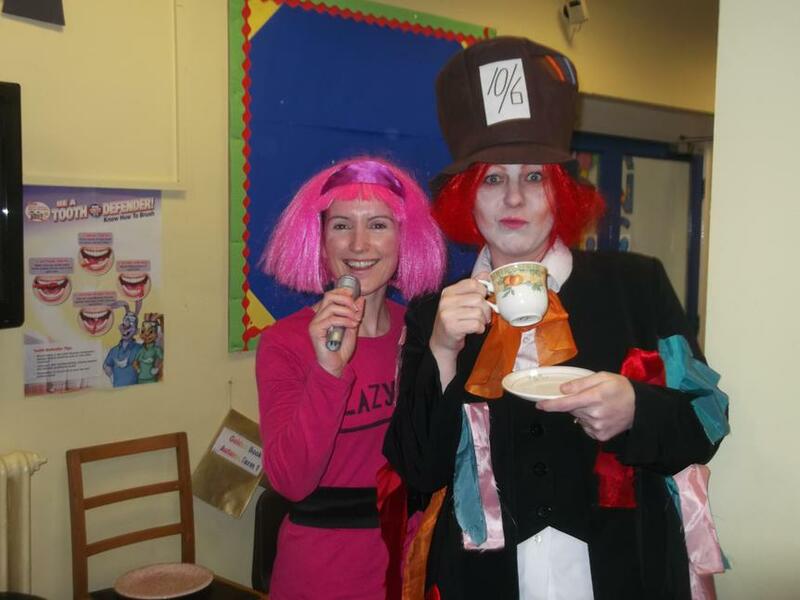 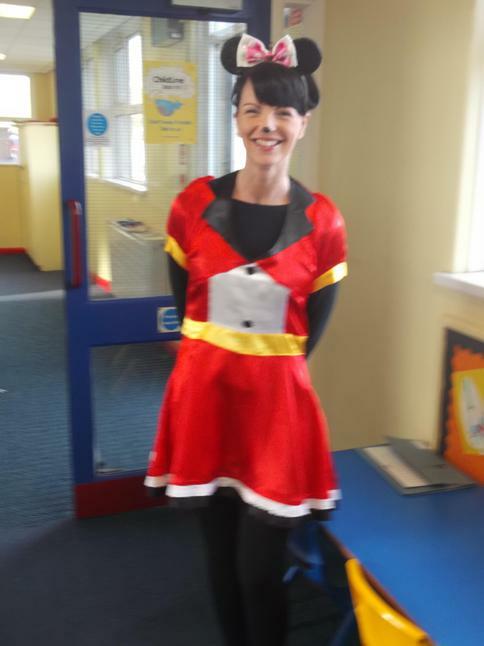 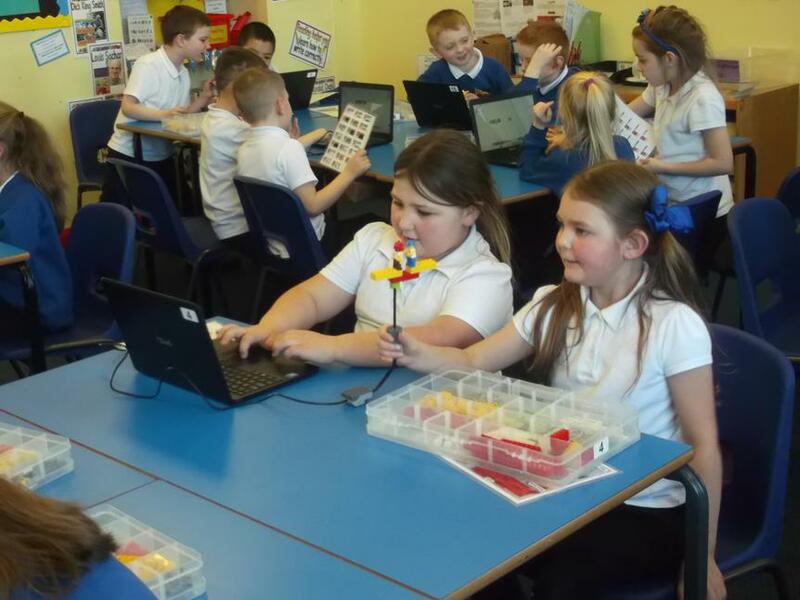 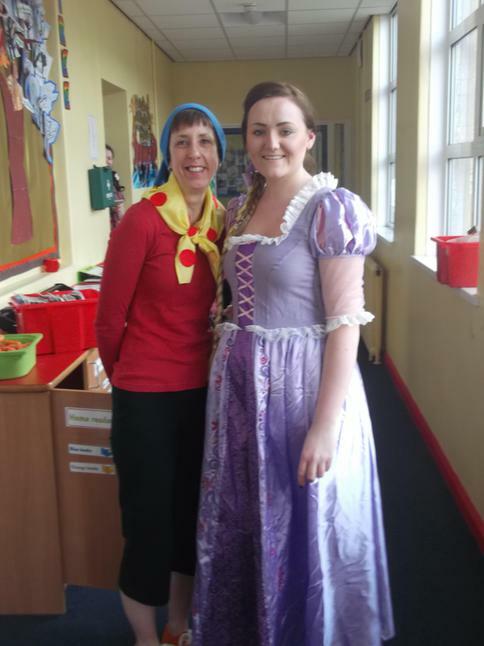 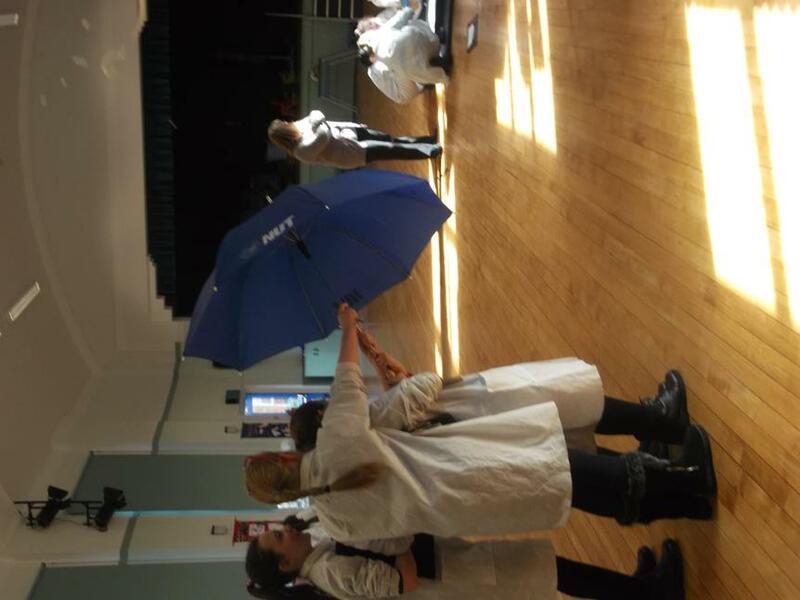 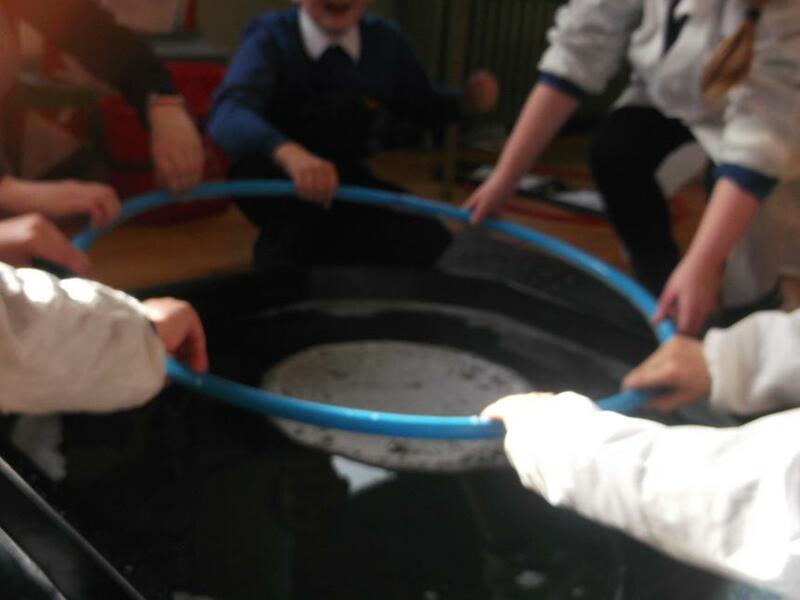 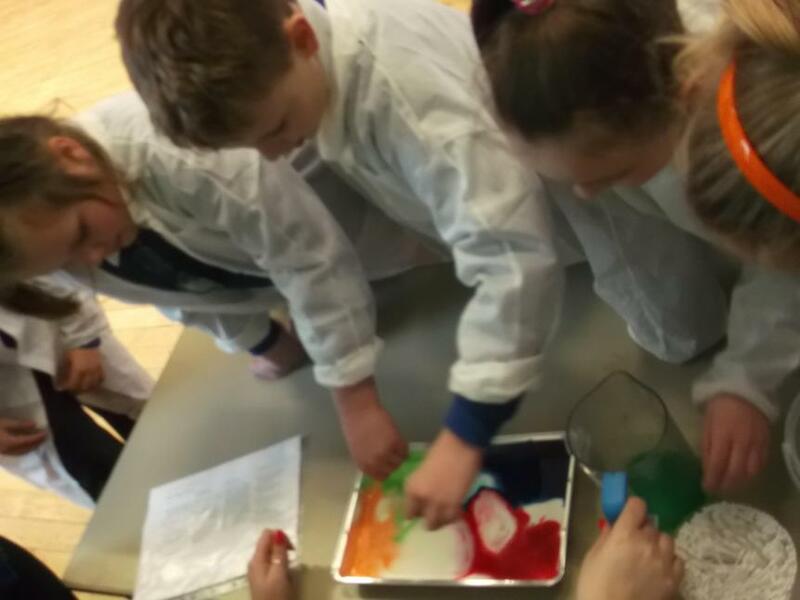 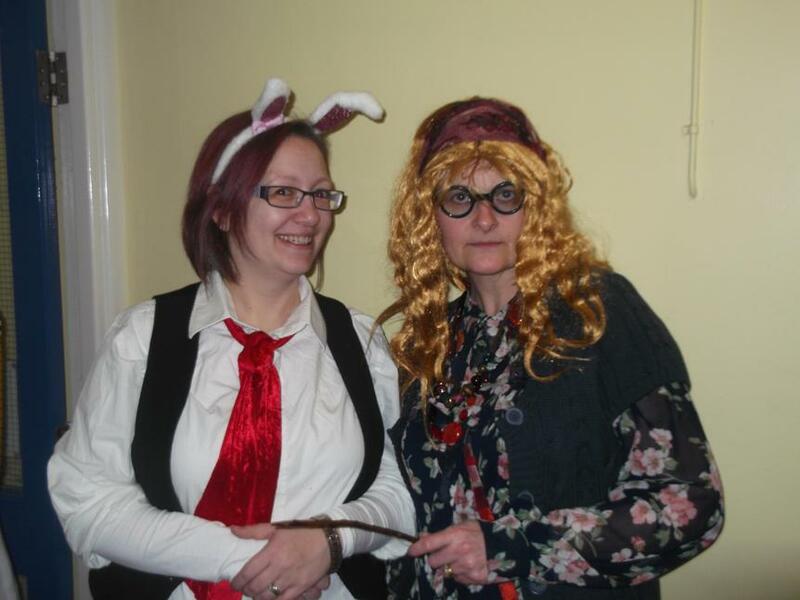 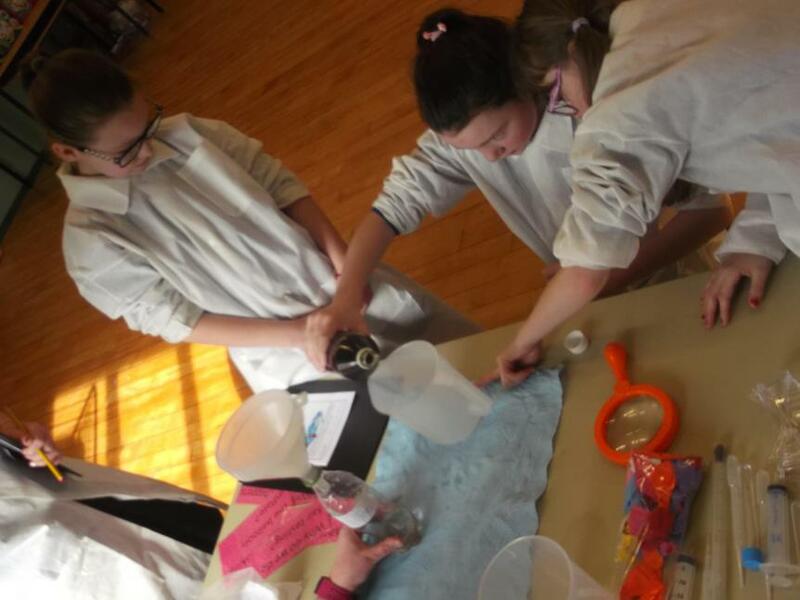 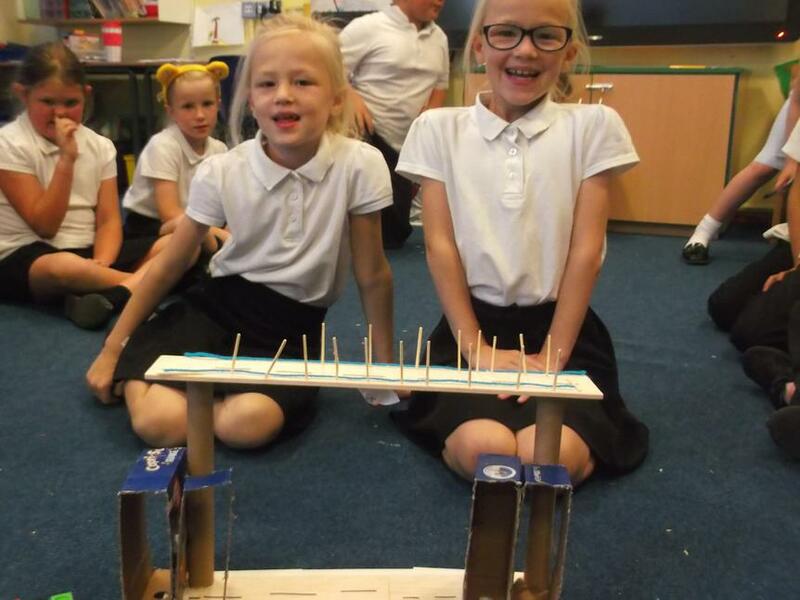 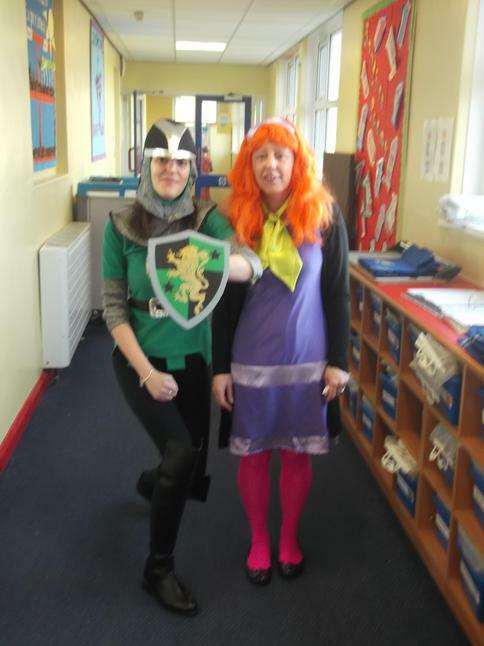 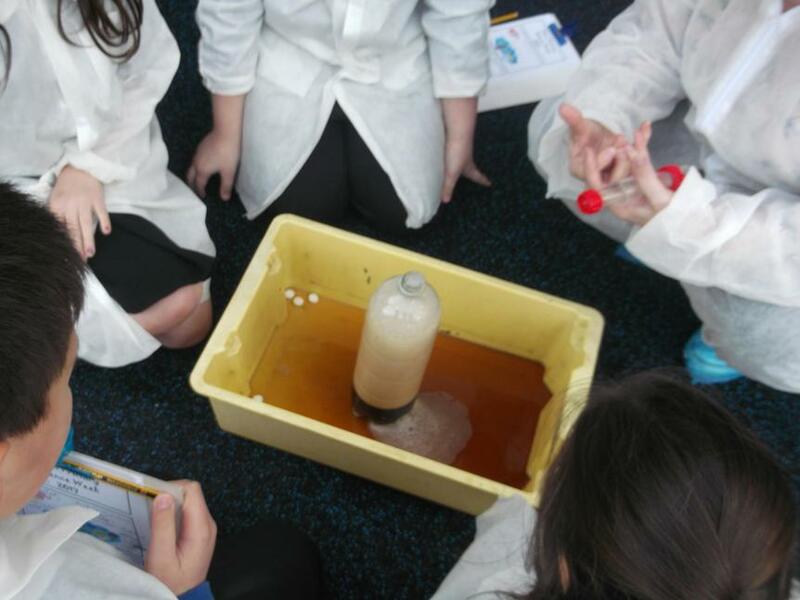 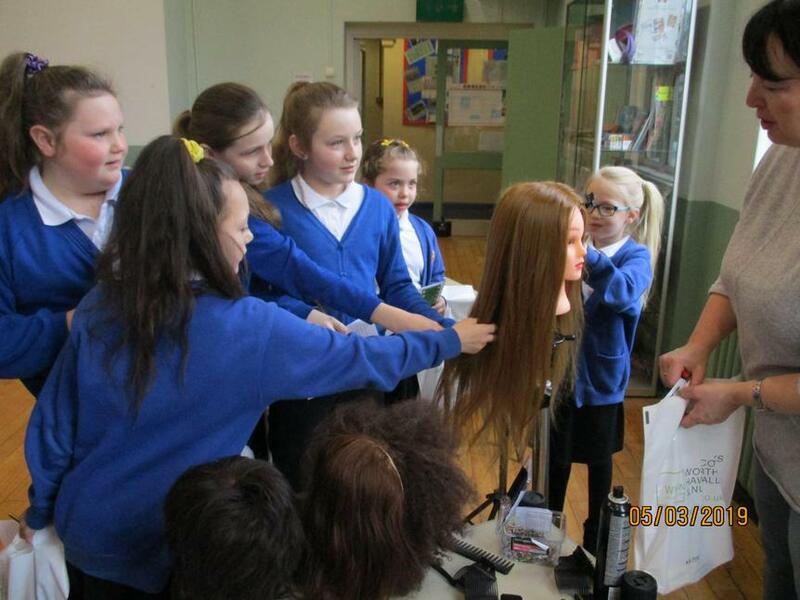 The children and staff had a fantastic time during Science week. 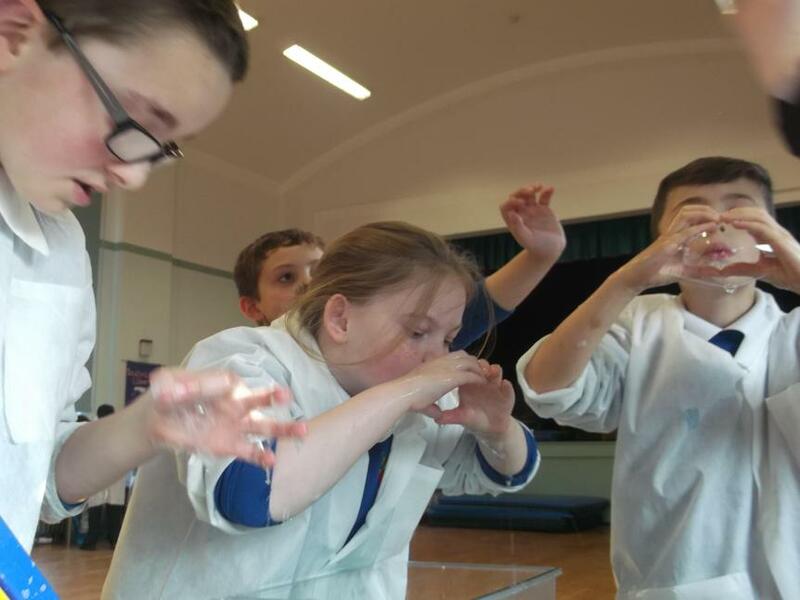 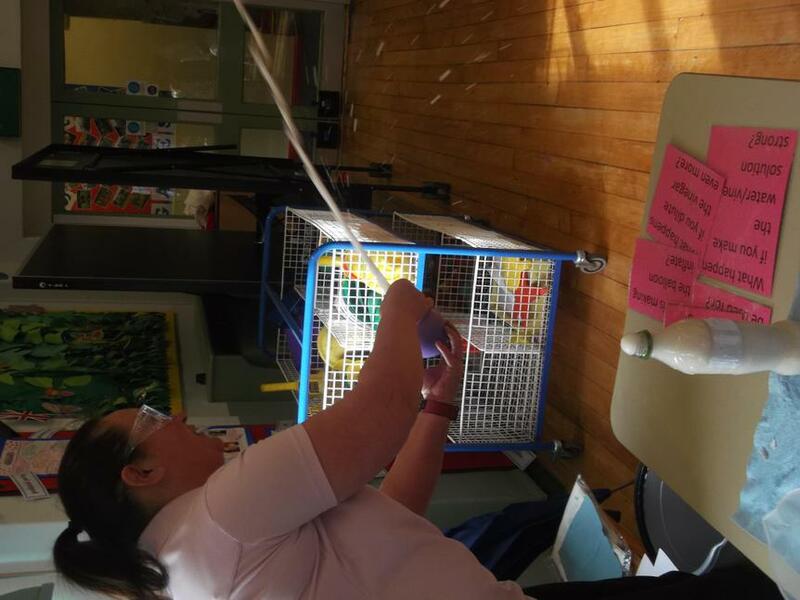 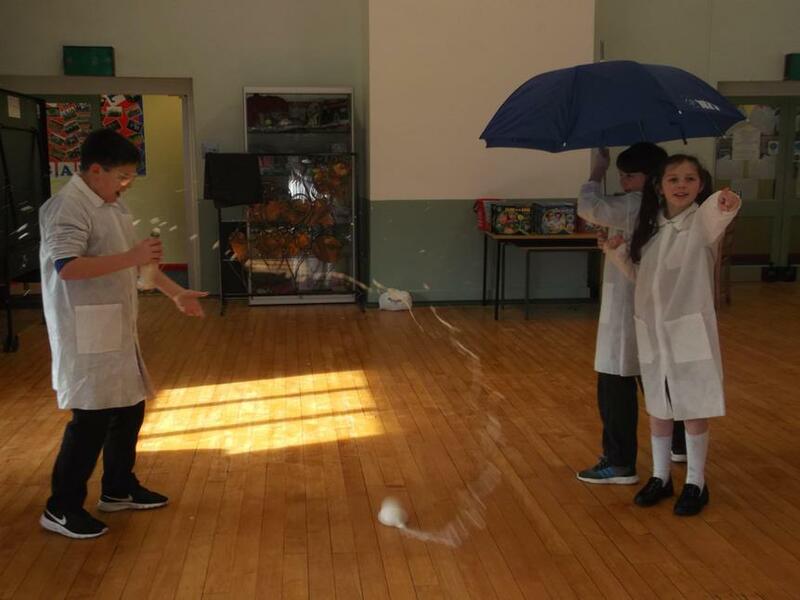 All children visited Thorn's very own science lab where they took part in a series of 'wow' experiments with plenty of pop, fizz and bang! 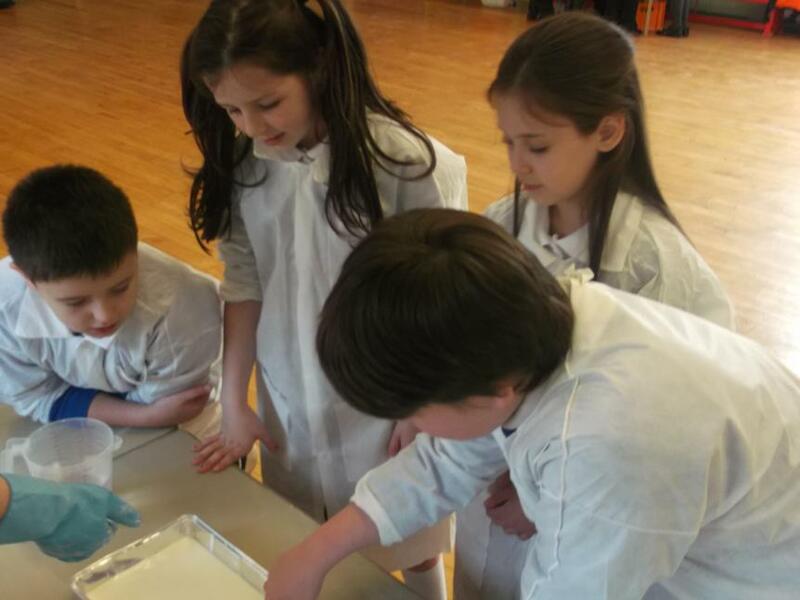 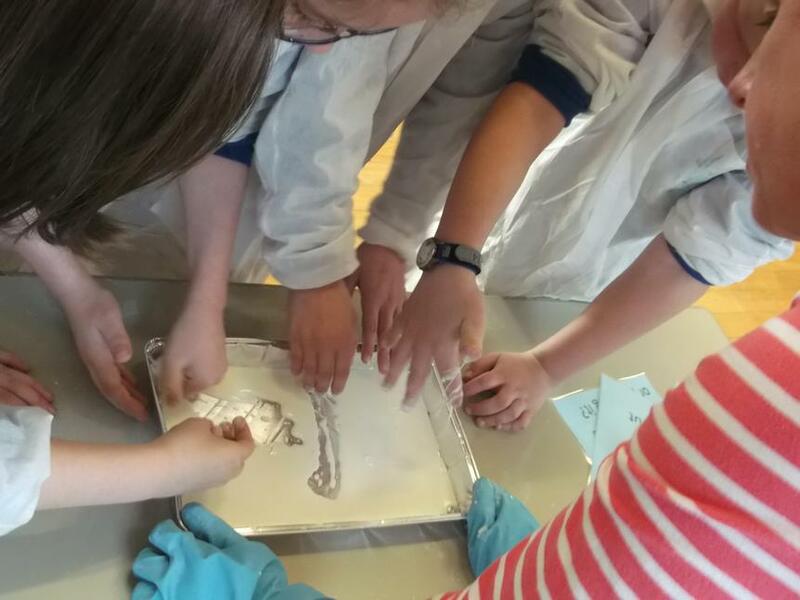 We all got very messy but luckily we were wearing our lab coats just like real scientists. 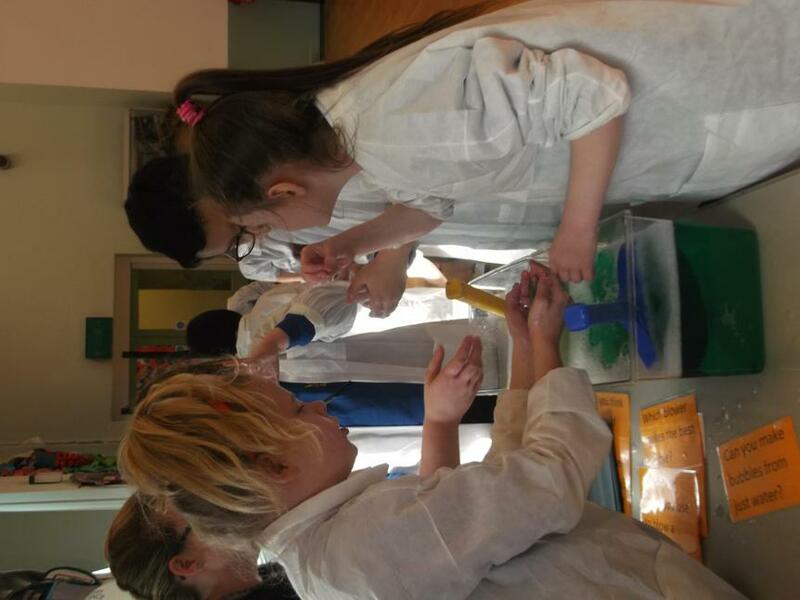 The children used their predicting, observation, comparing, modelling and evaluation skills in the lab. 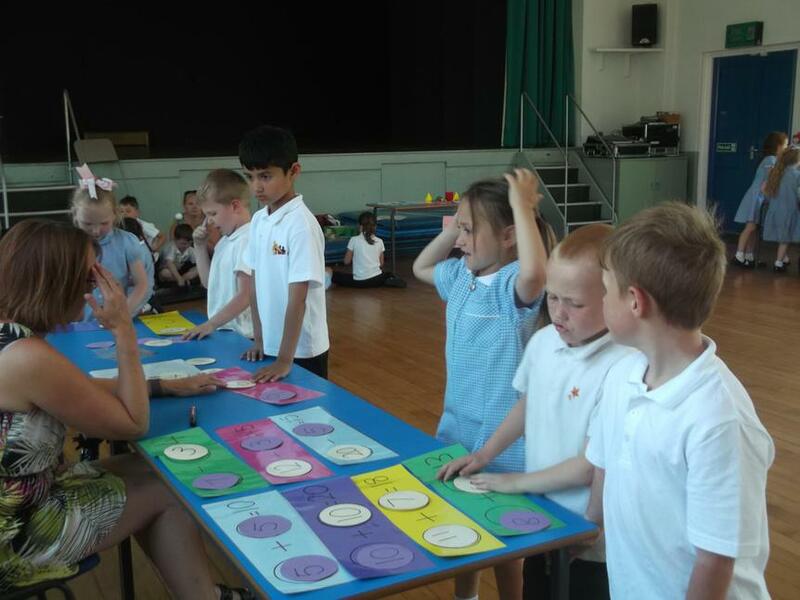 Fantastic scientific vocabulary could be heard from children of all ages. 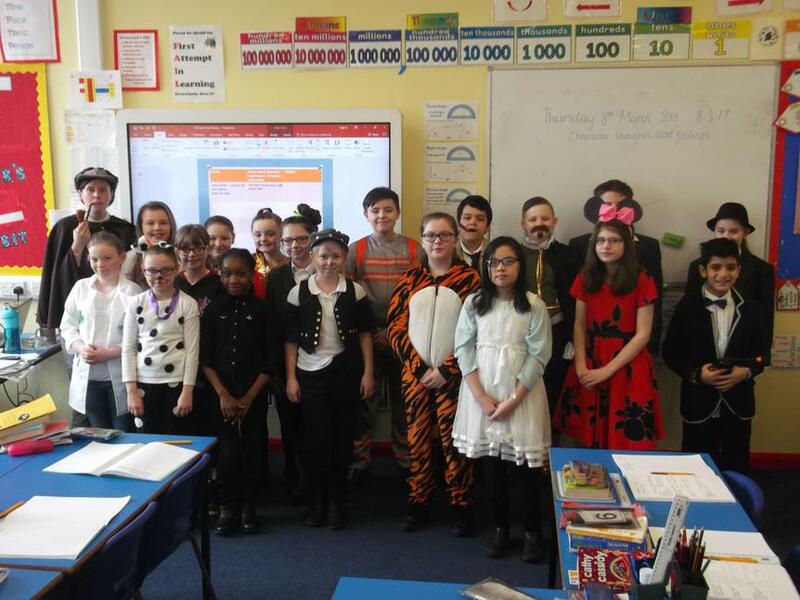 Our science dress-up day was a huge success. 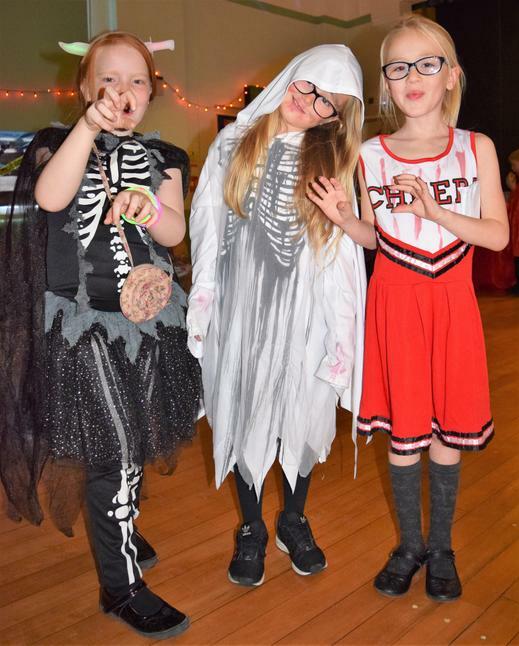 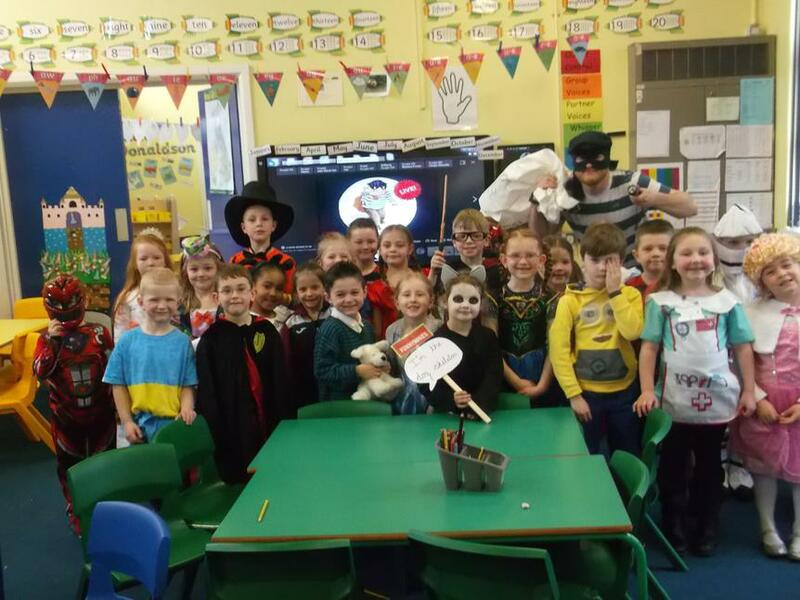 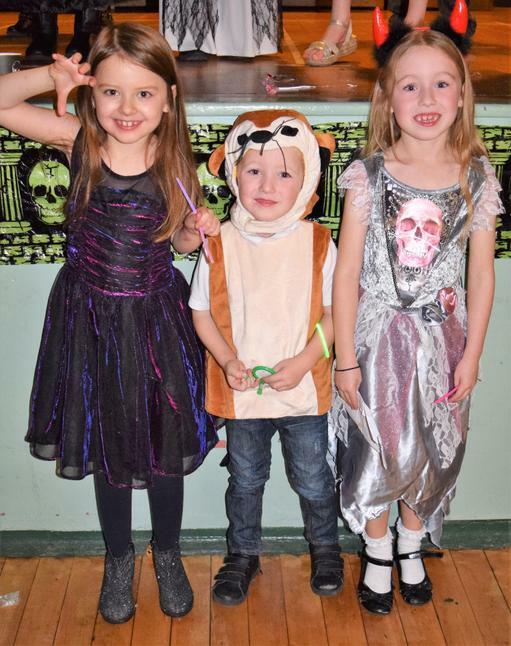 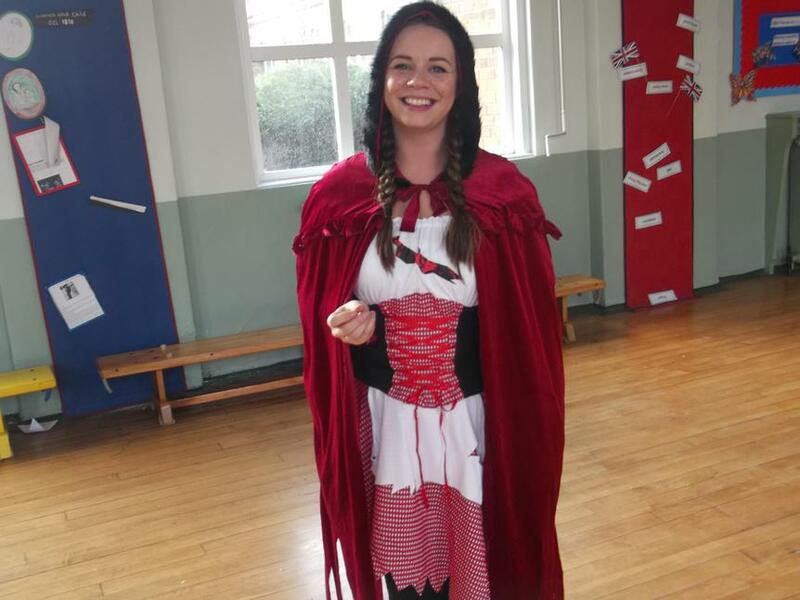 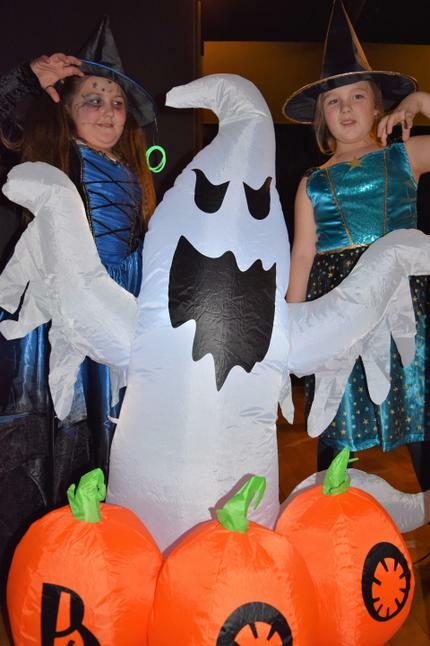 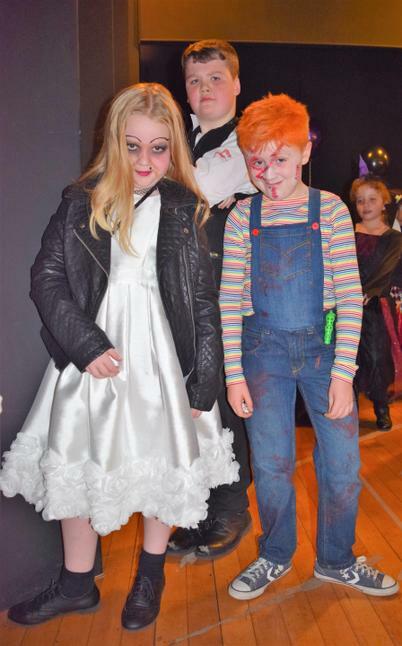 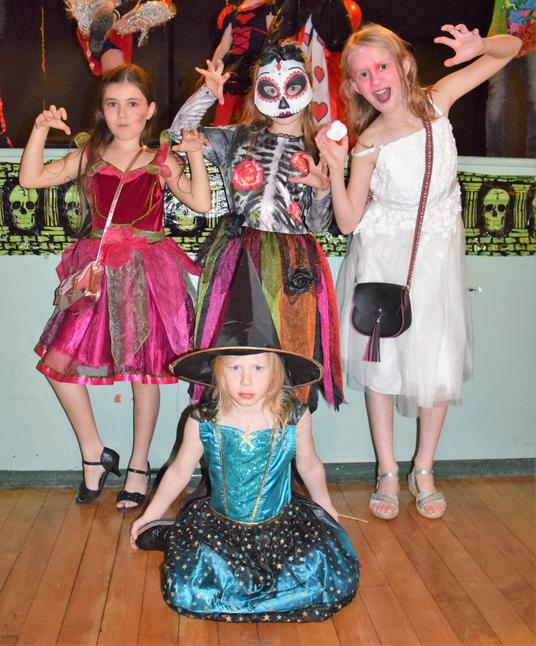 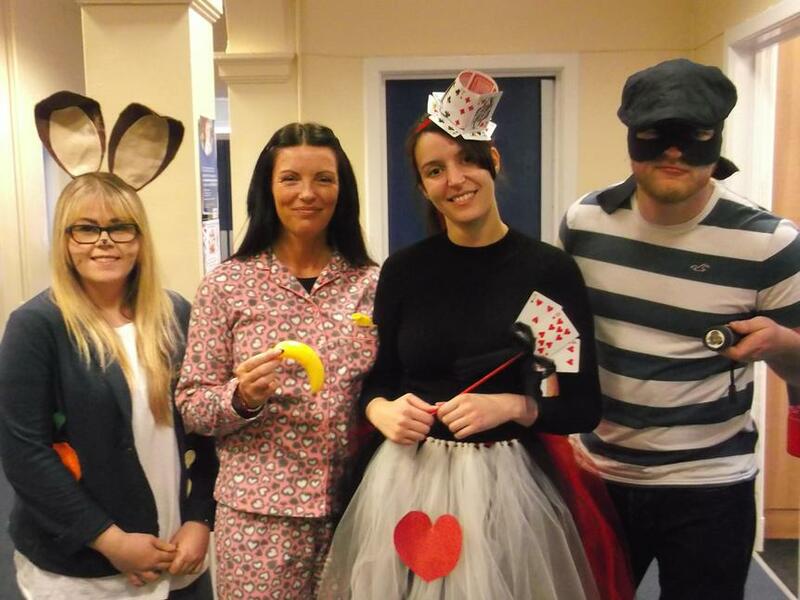 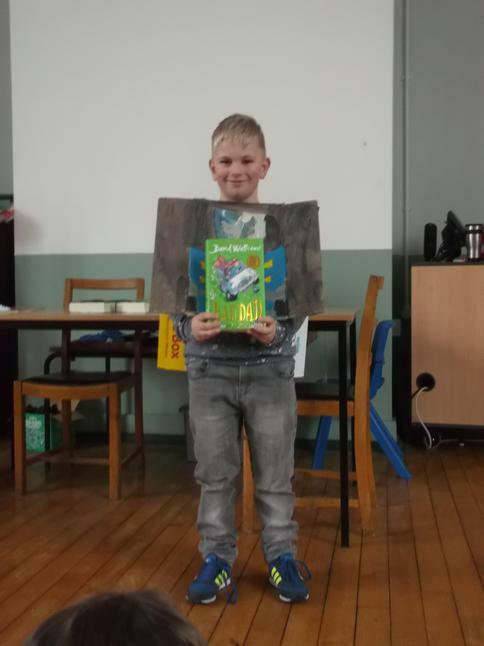 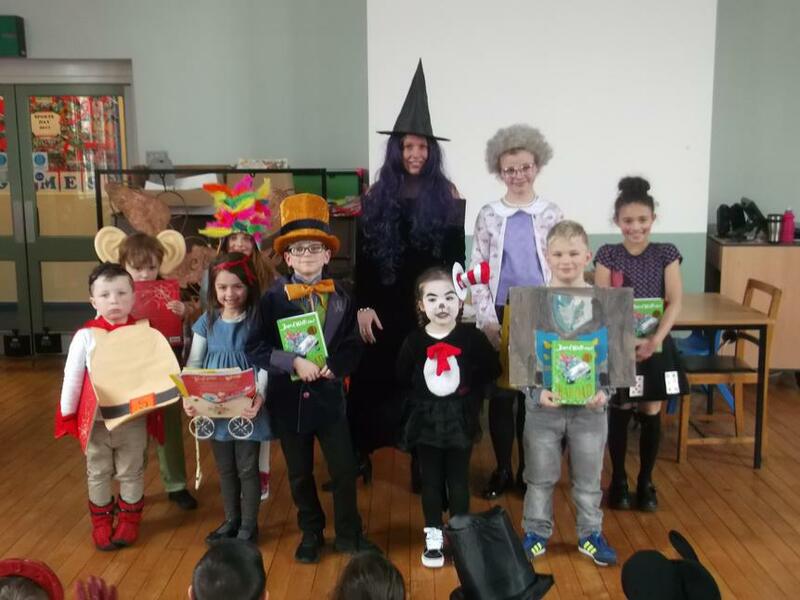 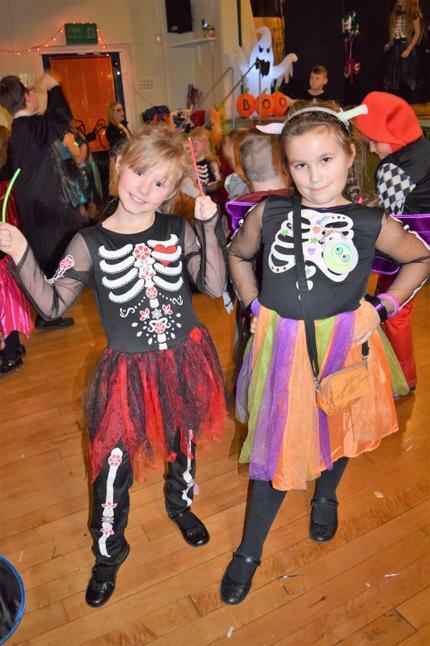 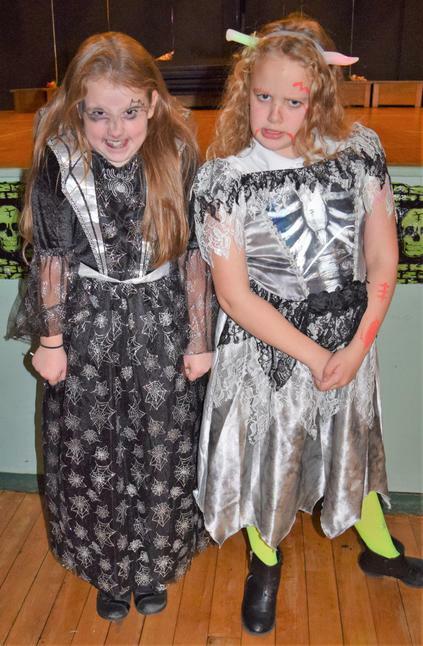 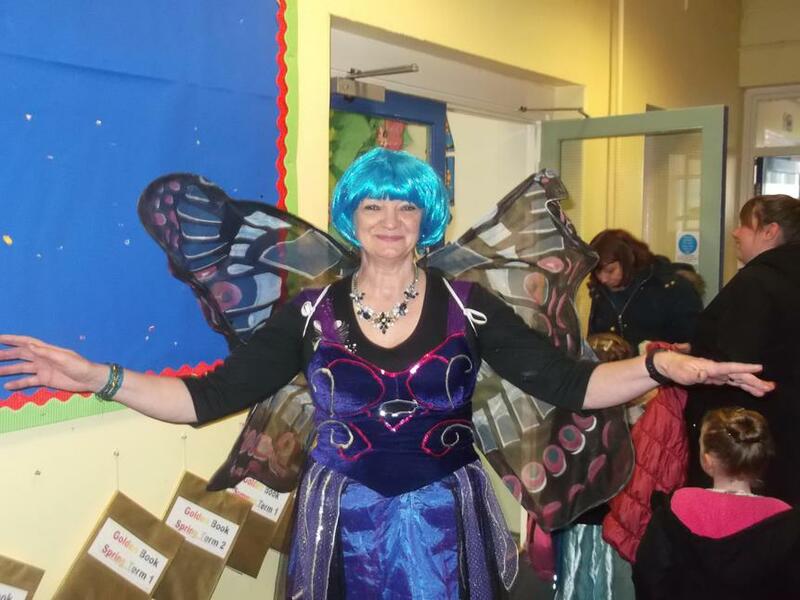 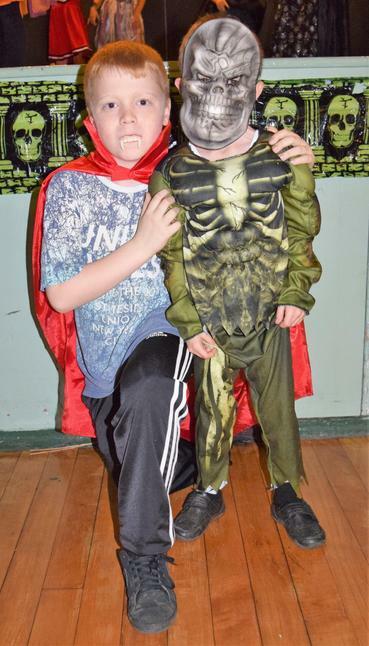 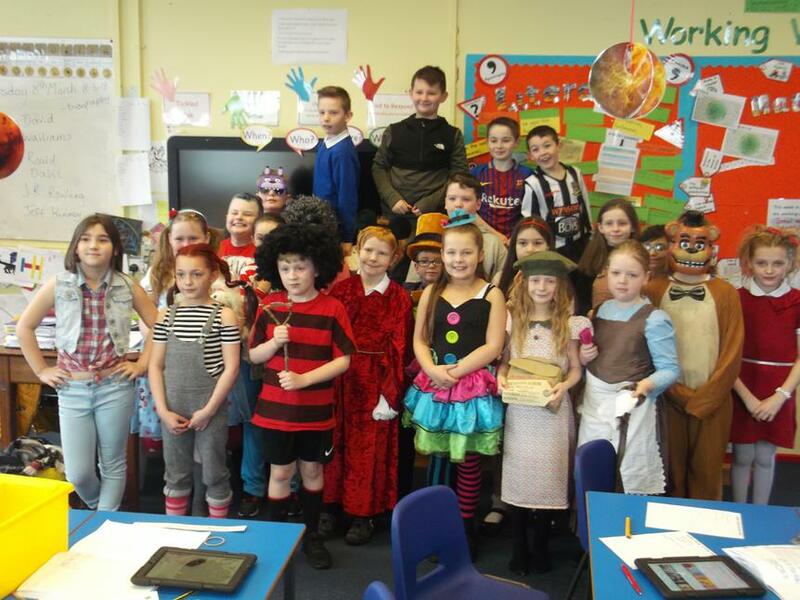 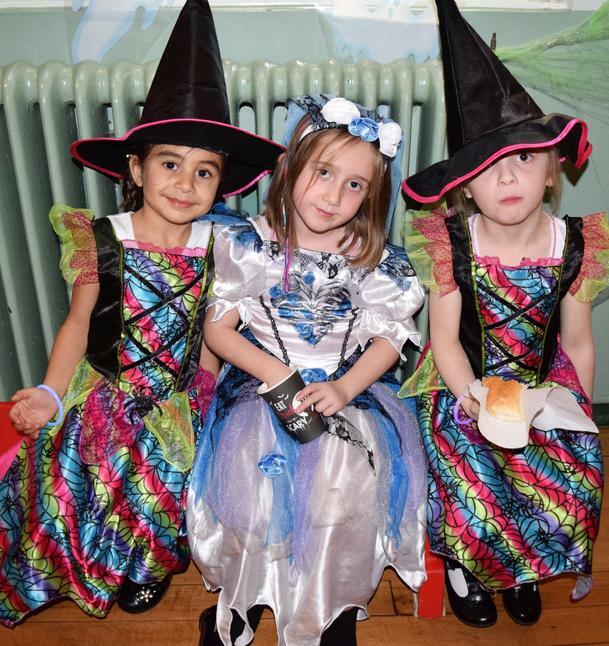 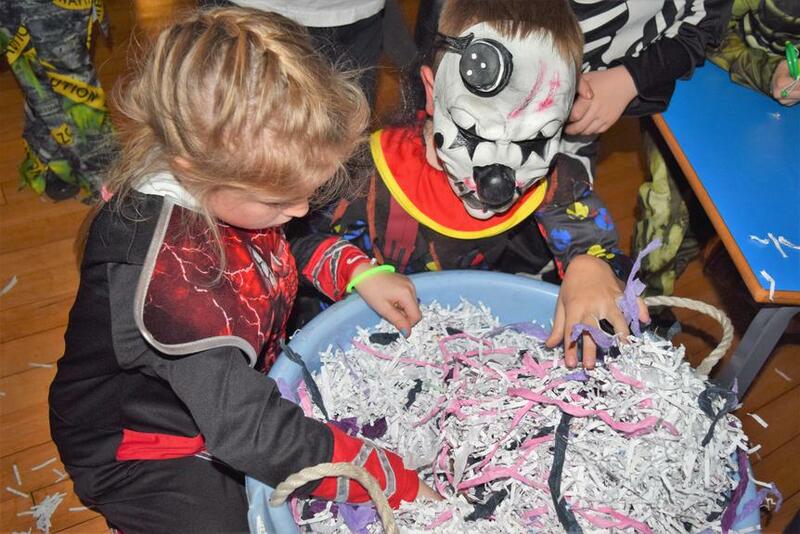 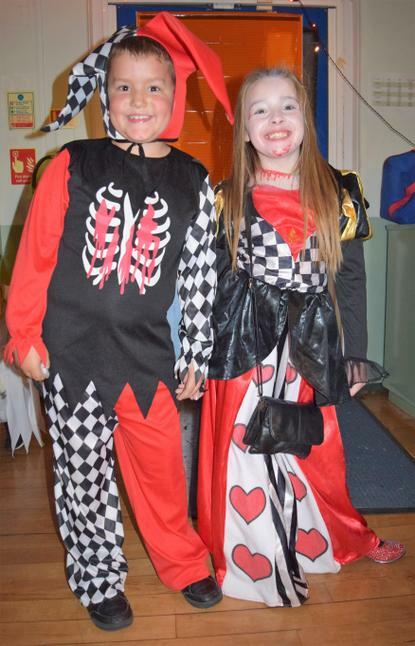 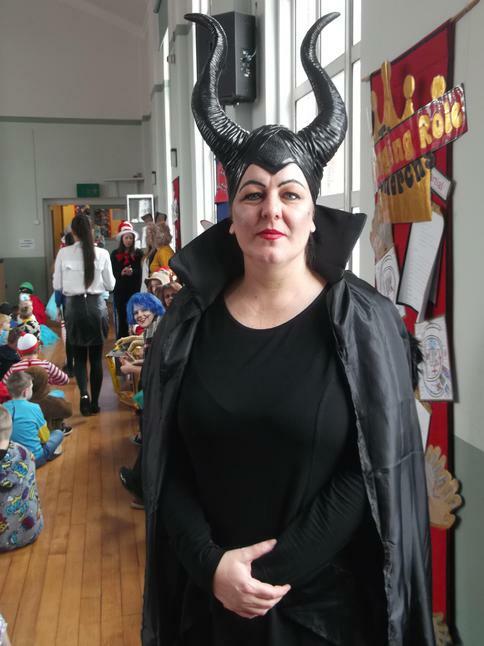 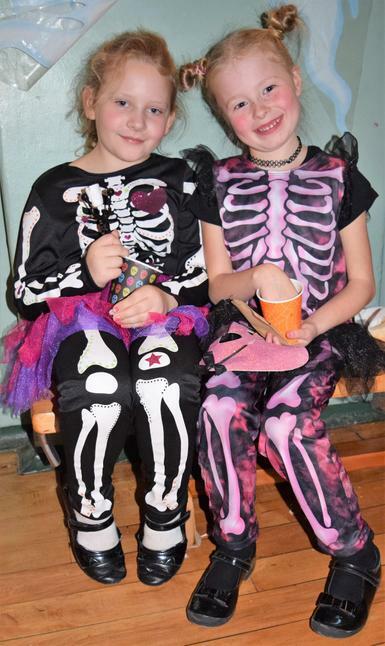 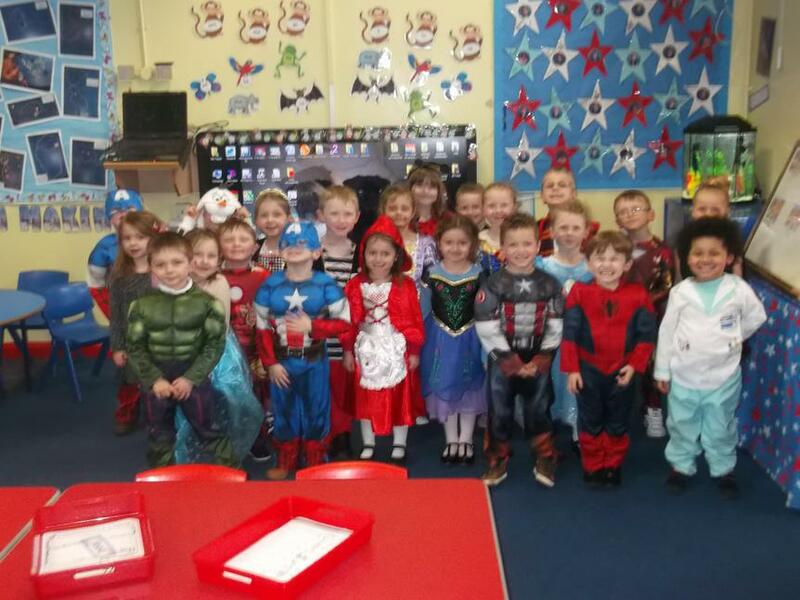 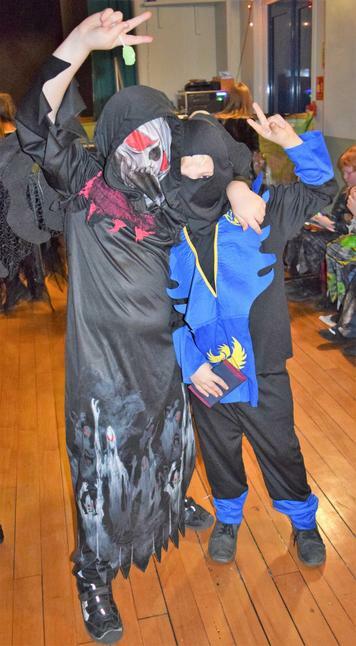 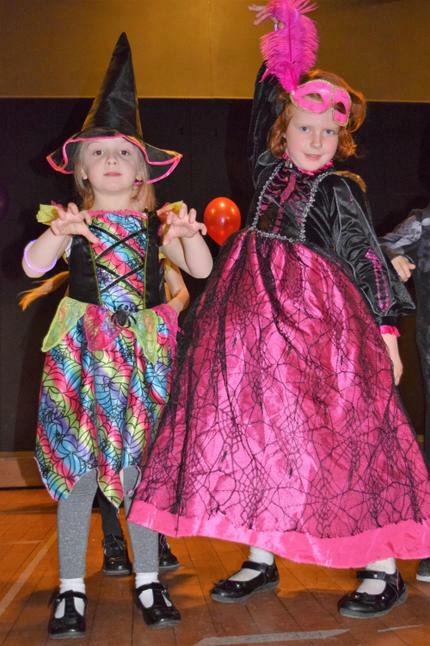 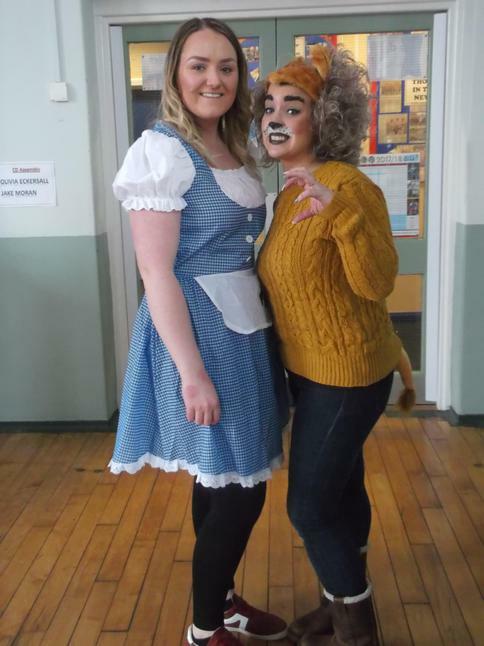 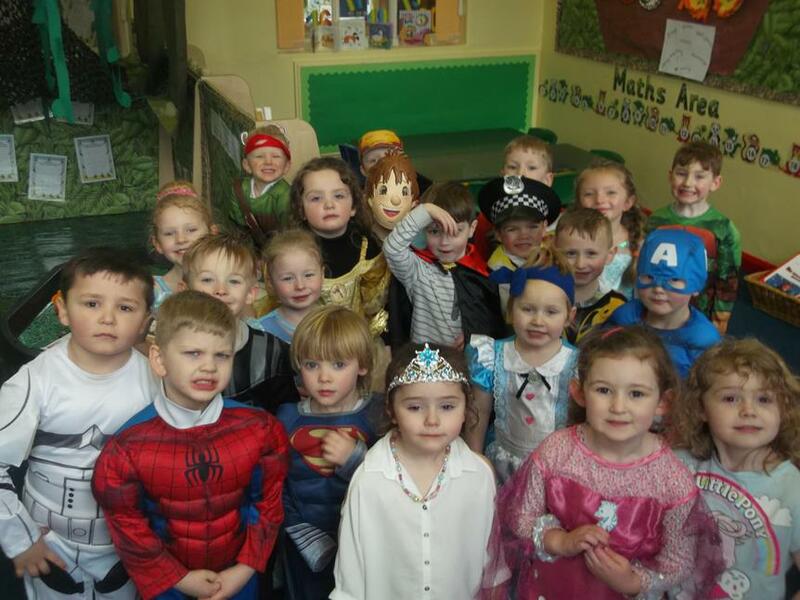 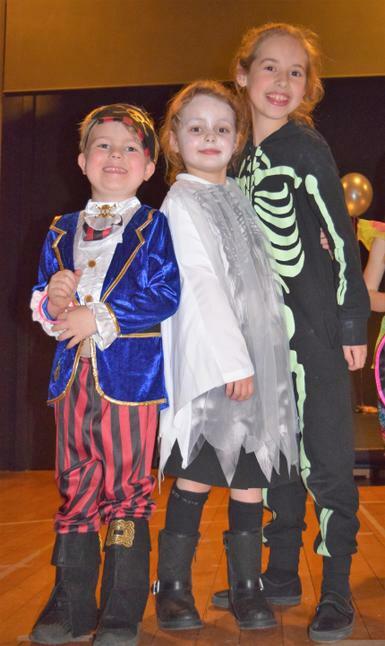 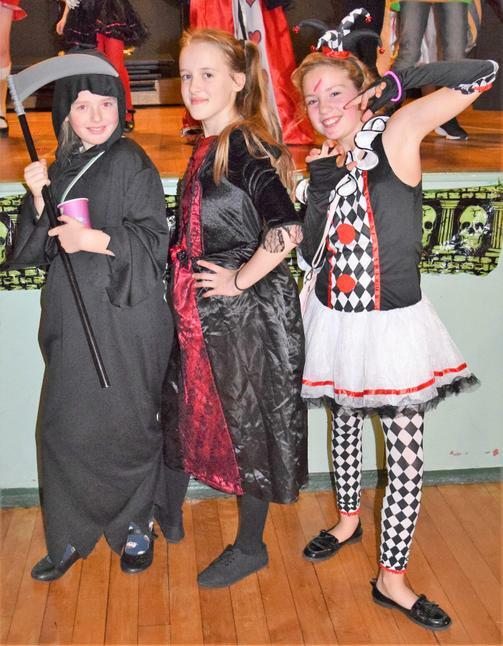 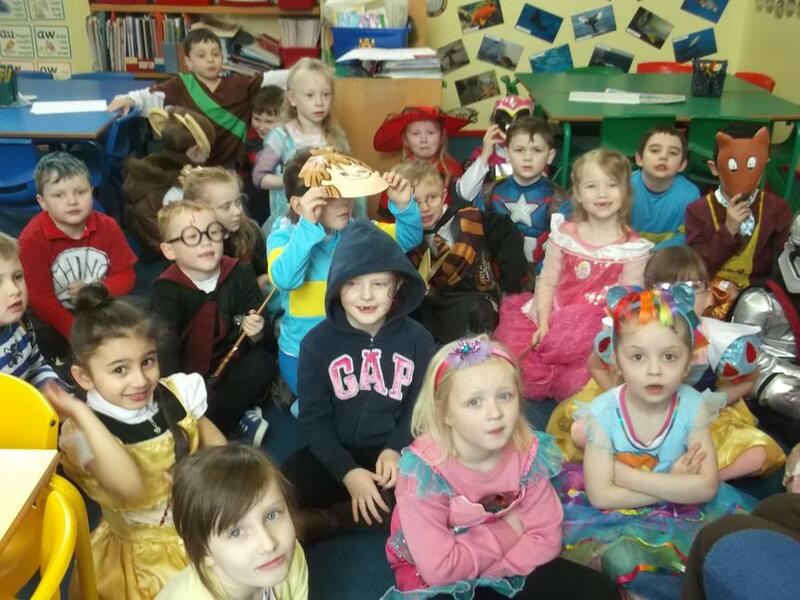 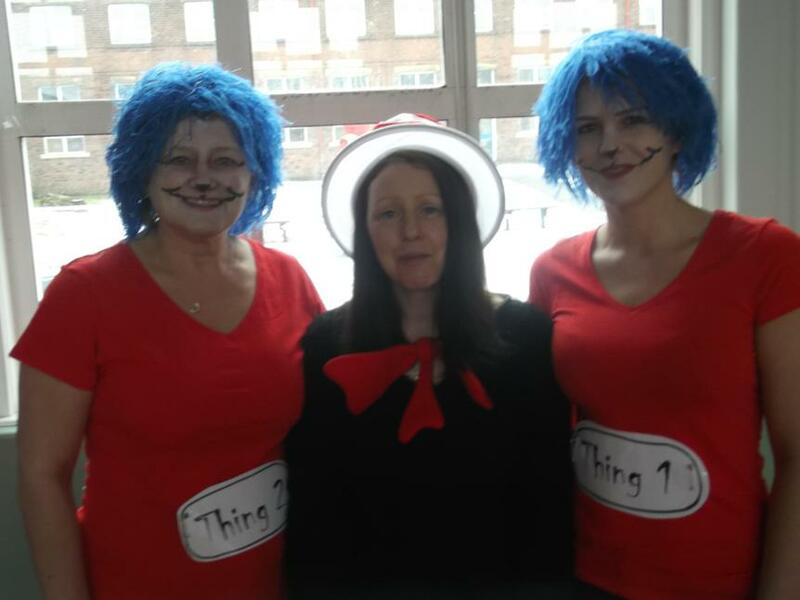 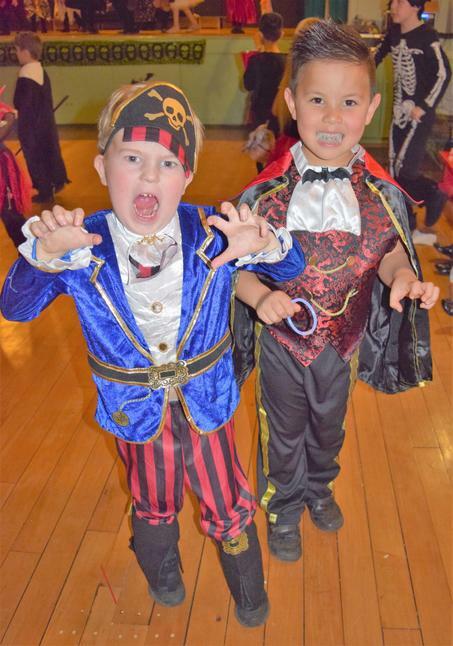 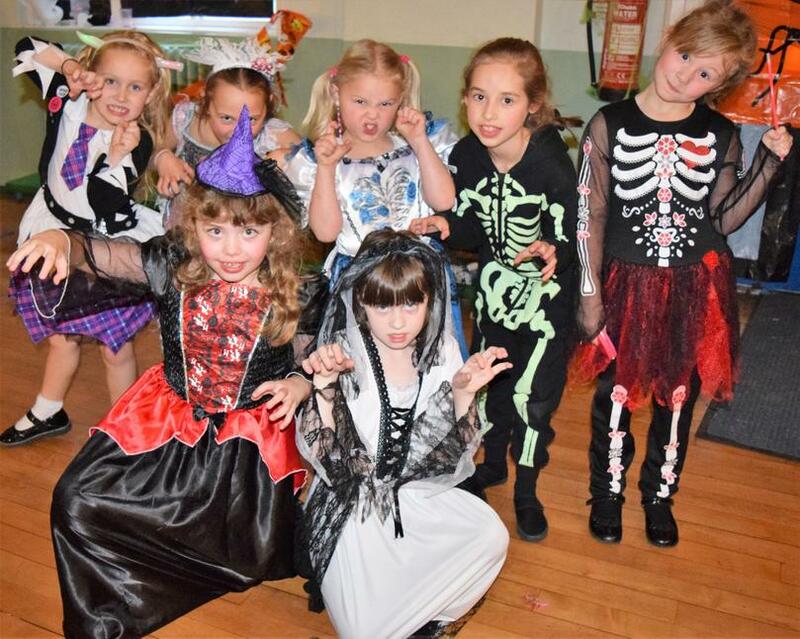 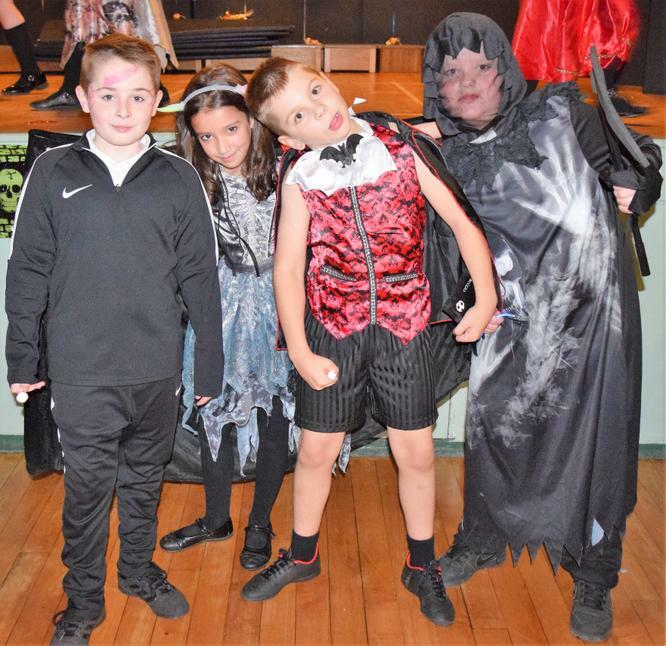 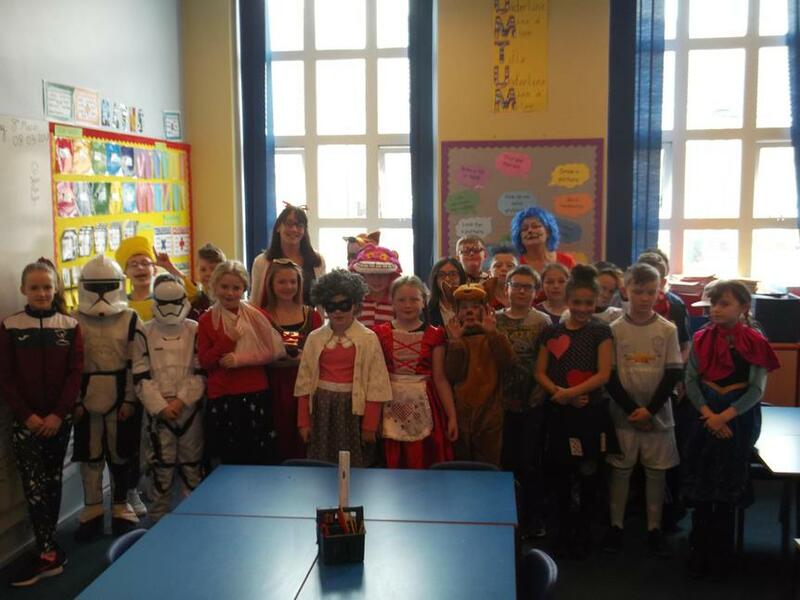 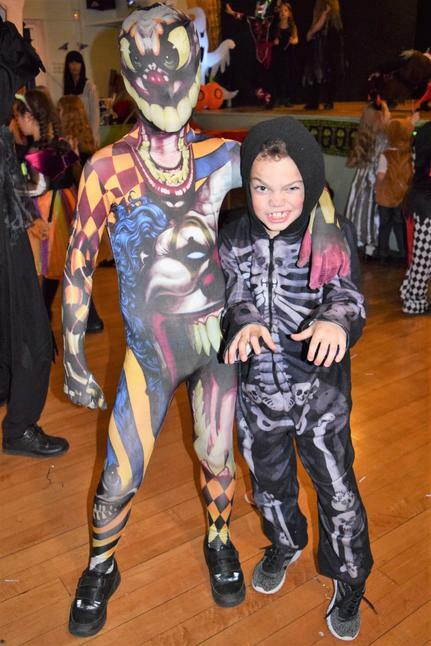 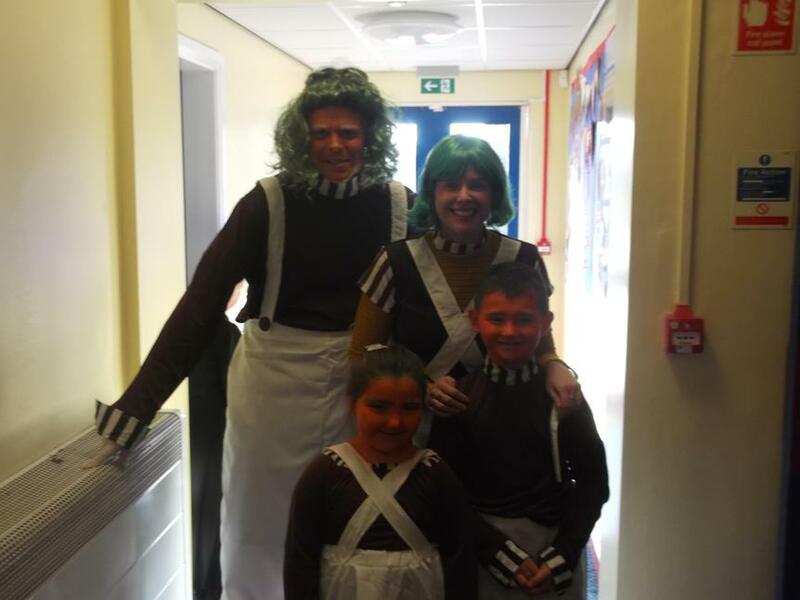 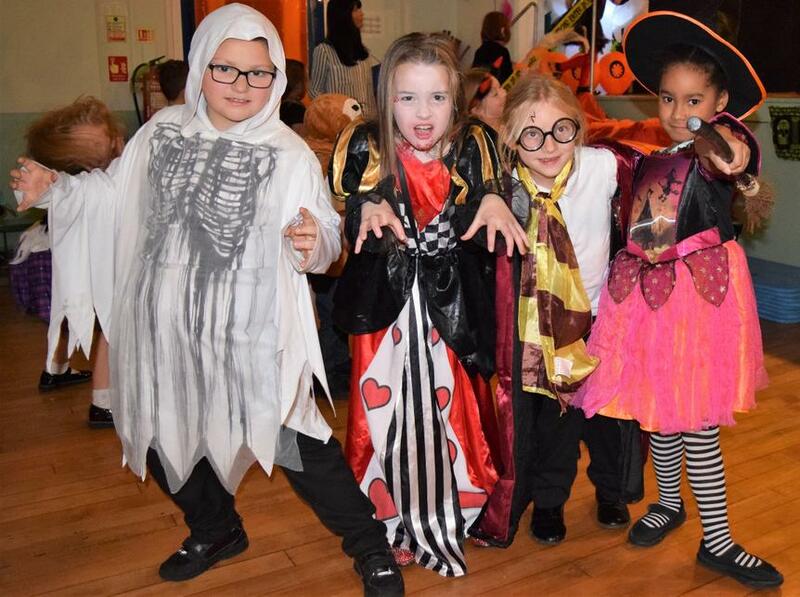 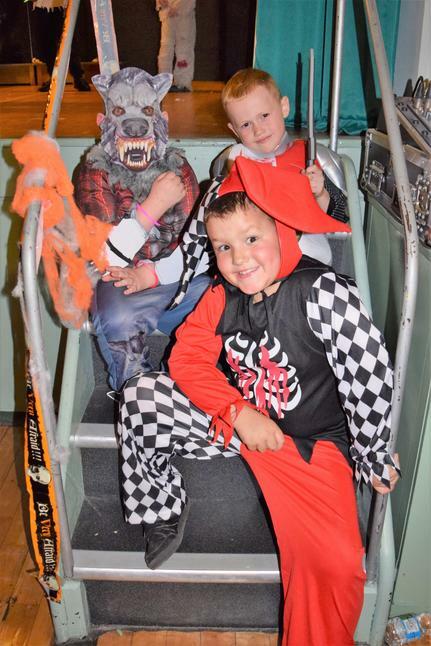 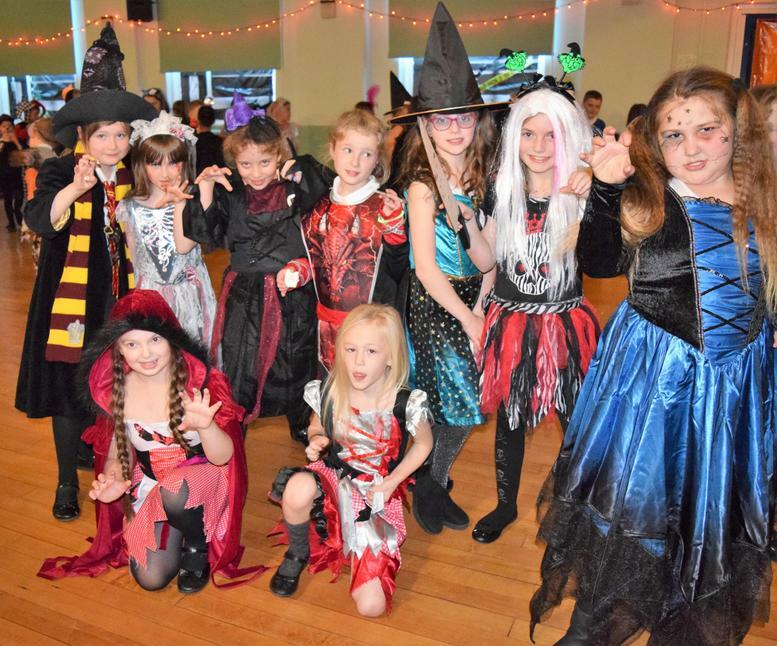 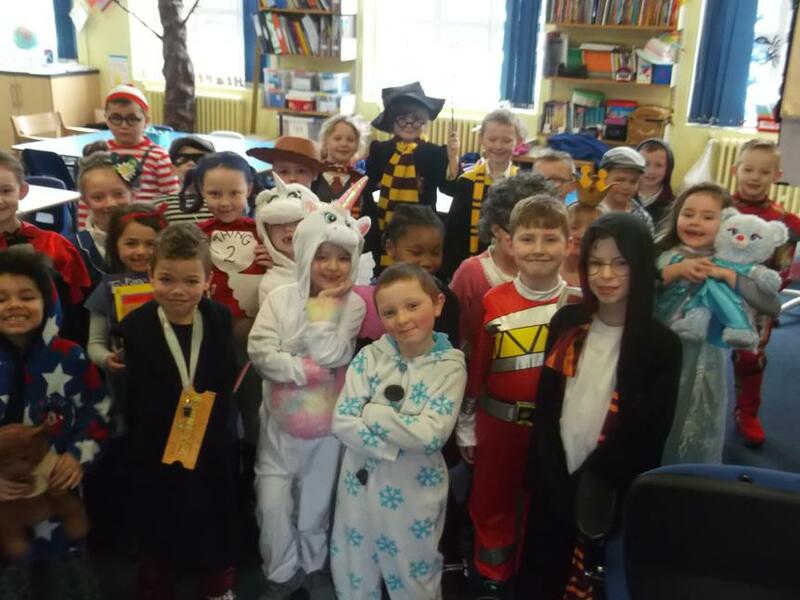 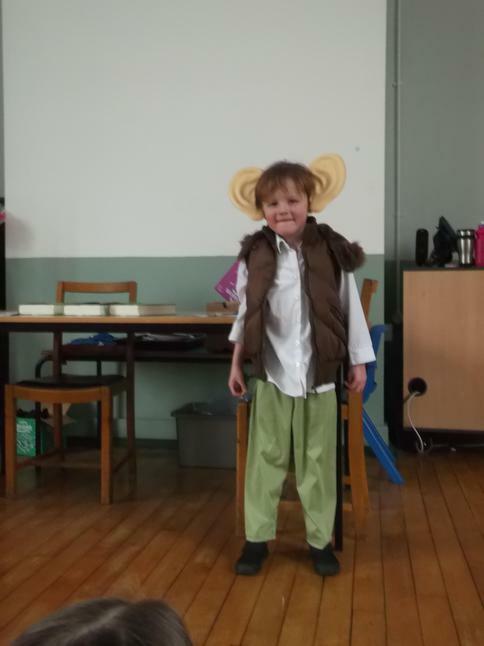 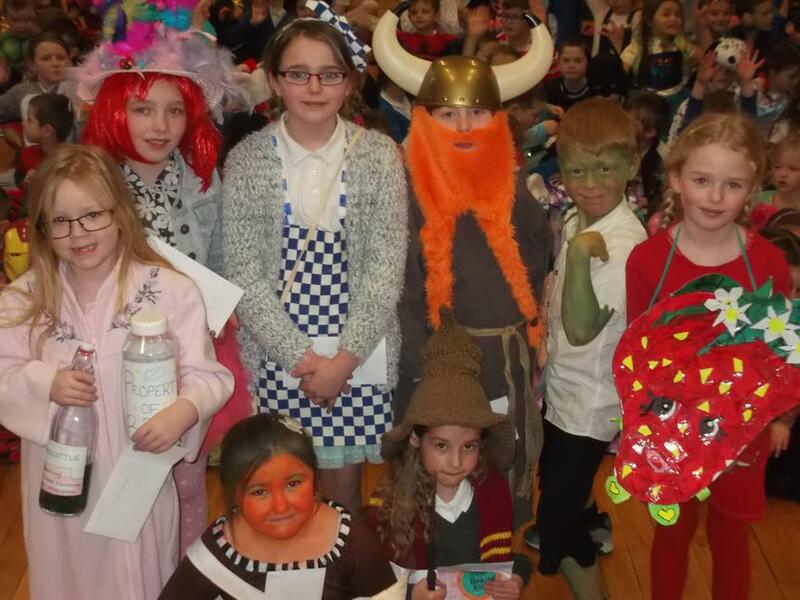 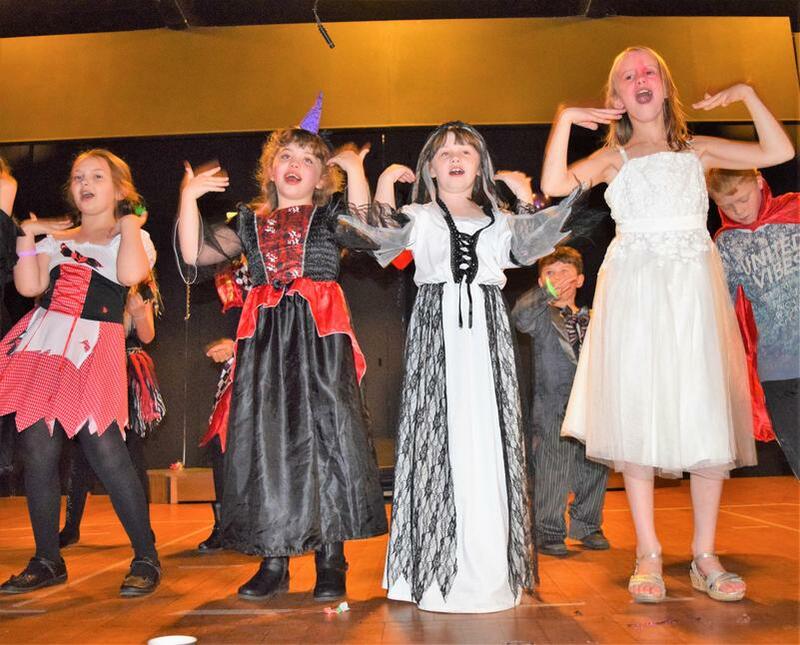 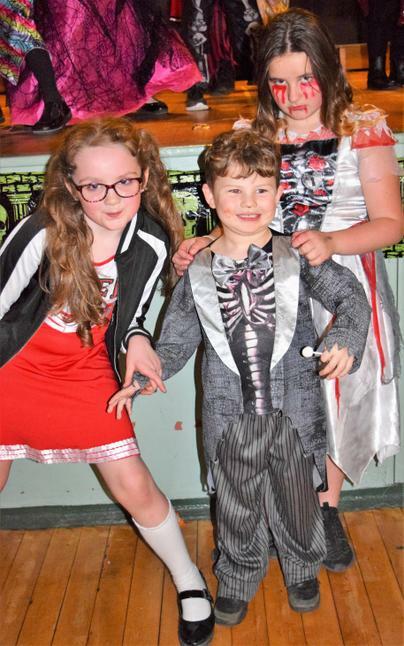 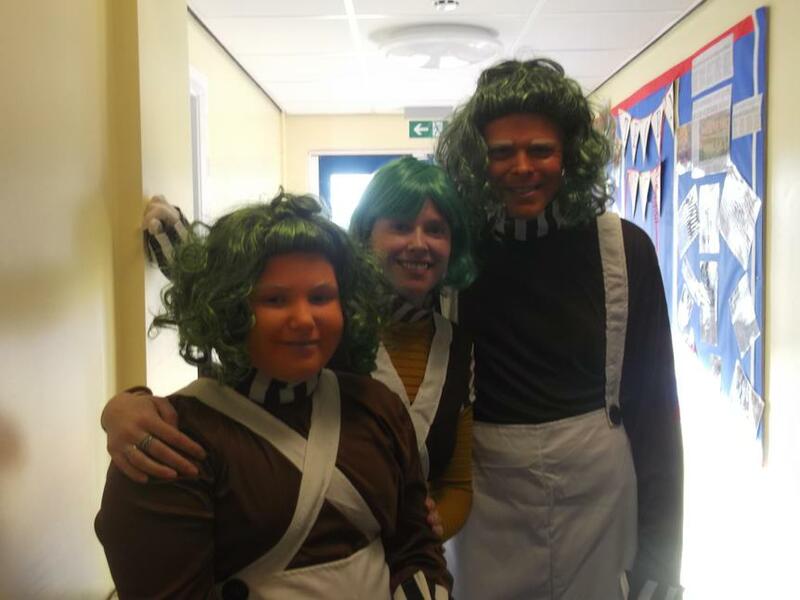 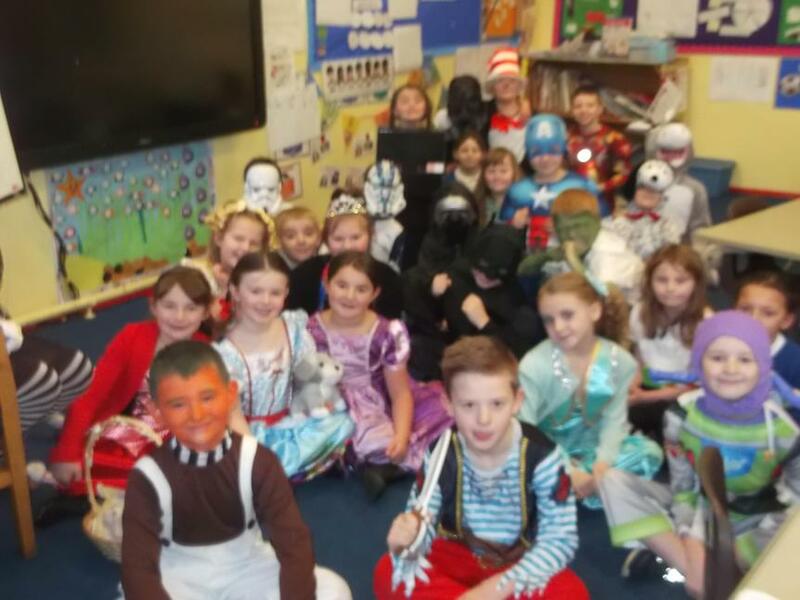 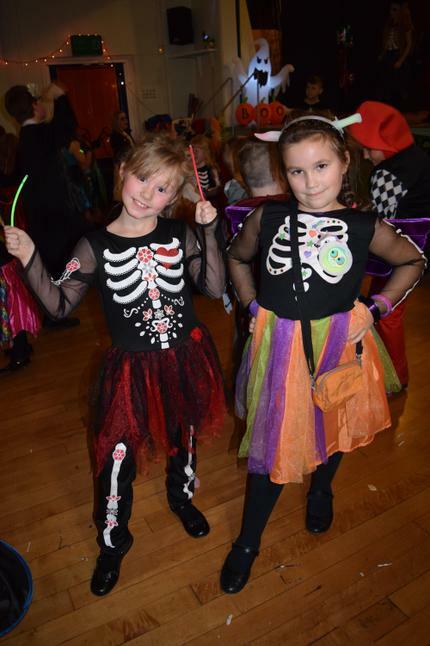 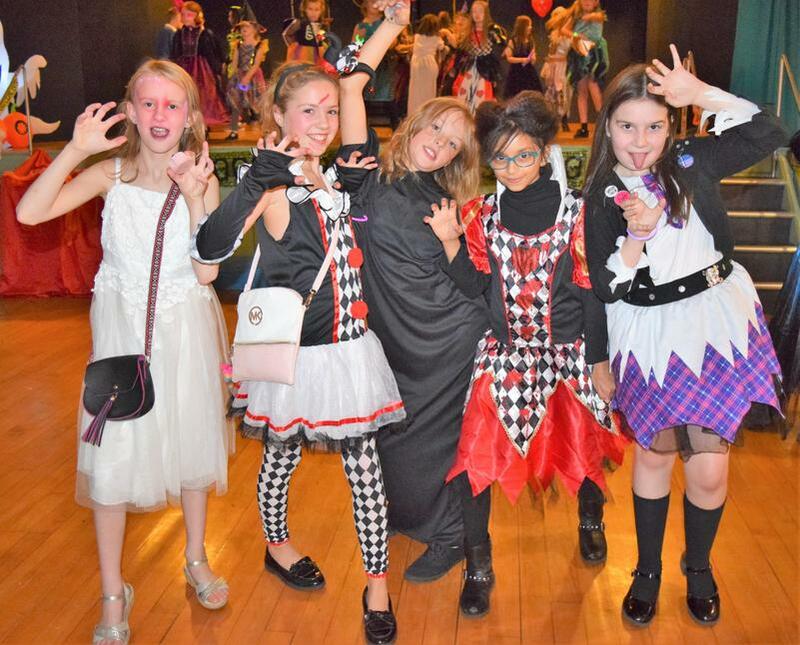 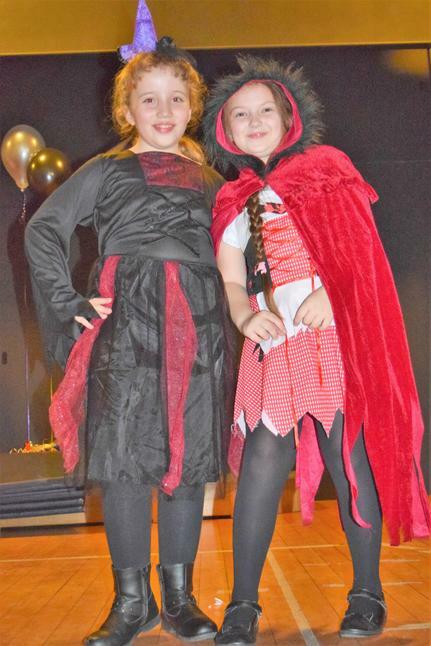 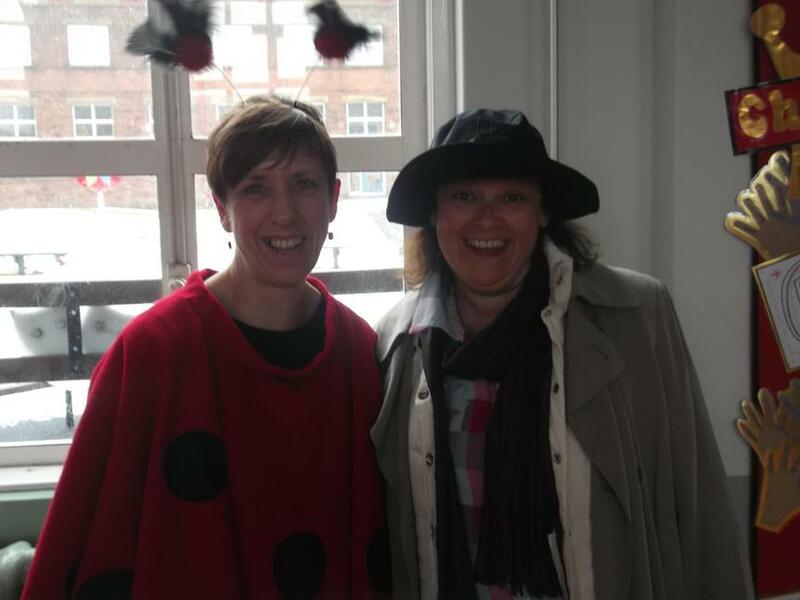 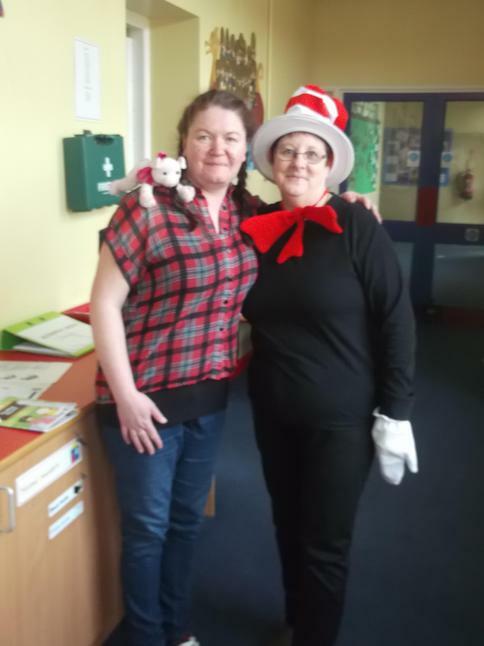 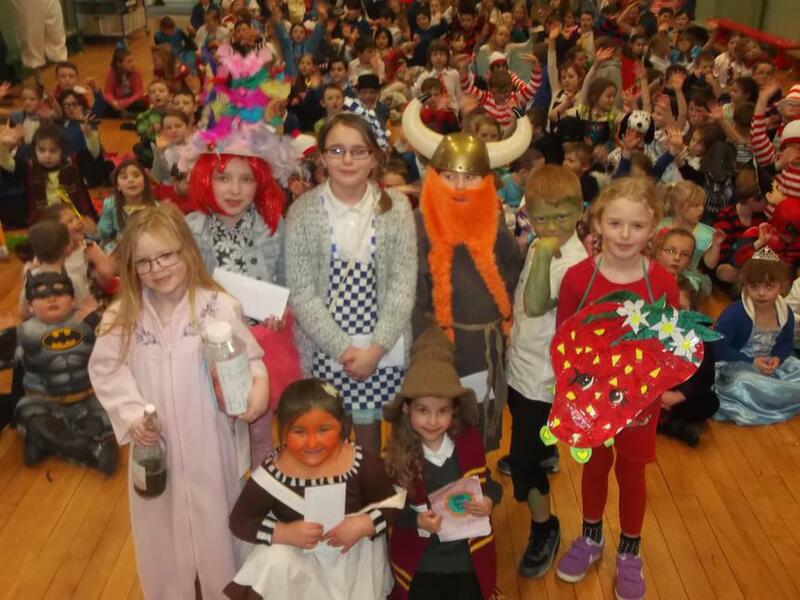 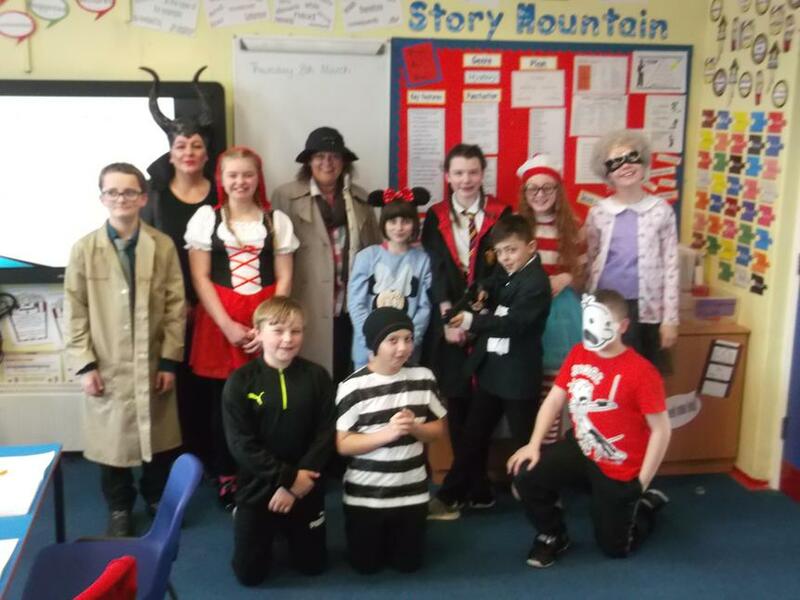 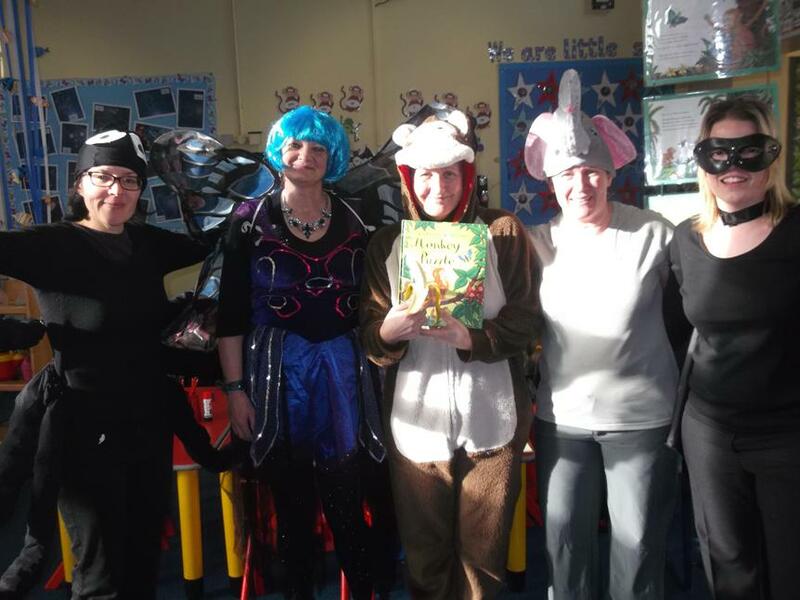 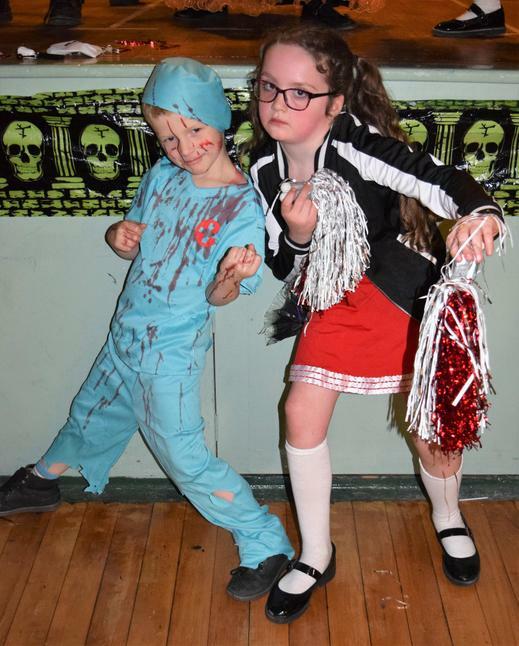 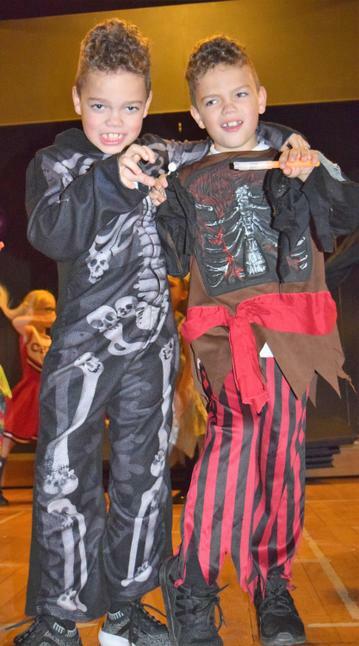 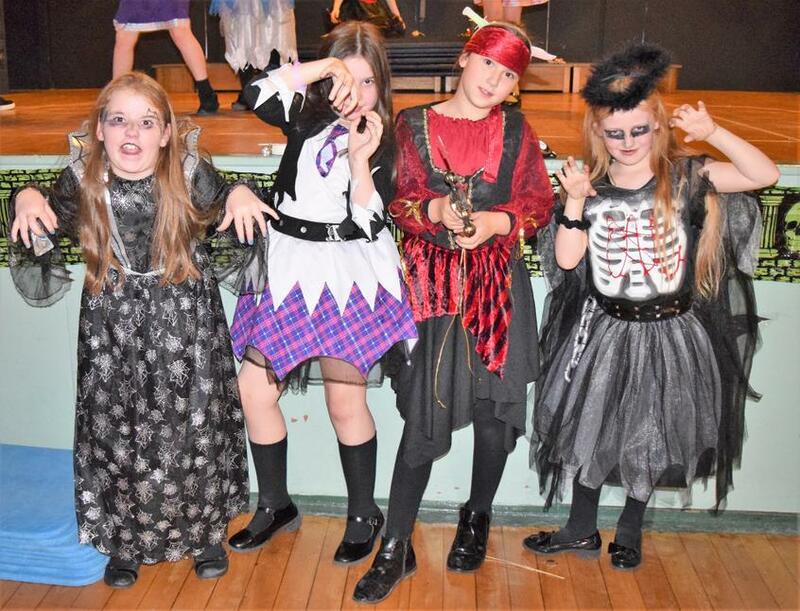 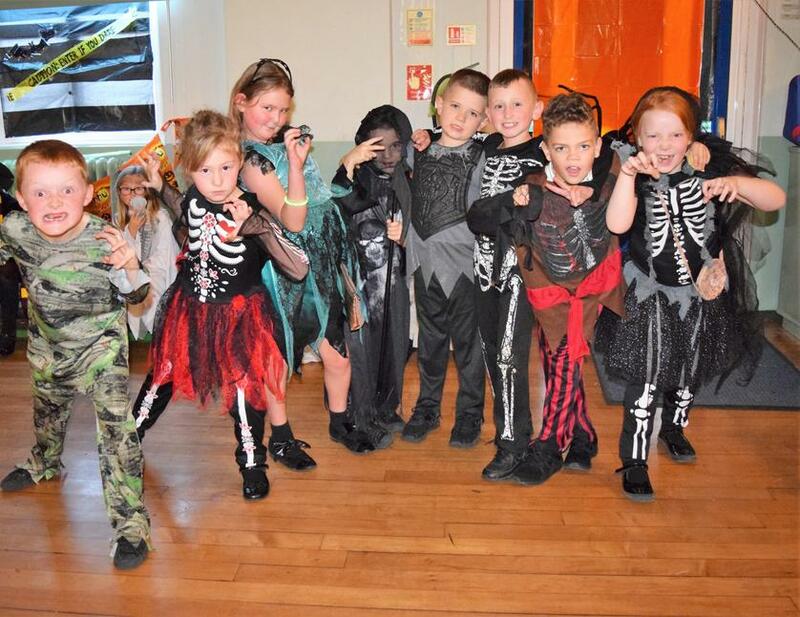 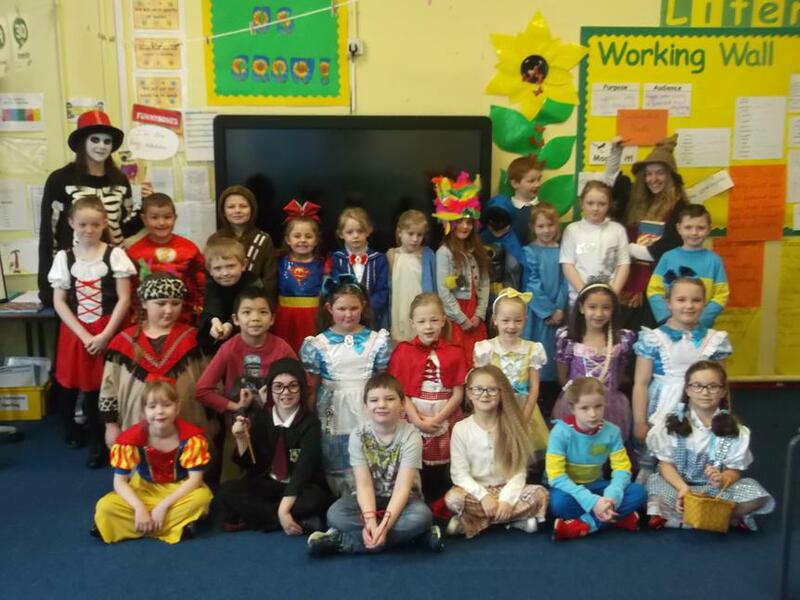 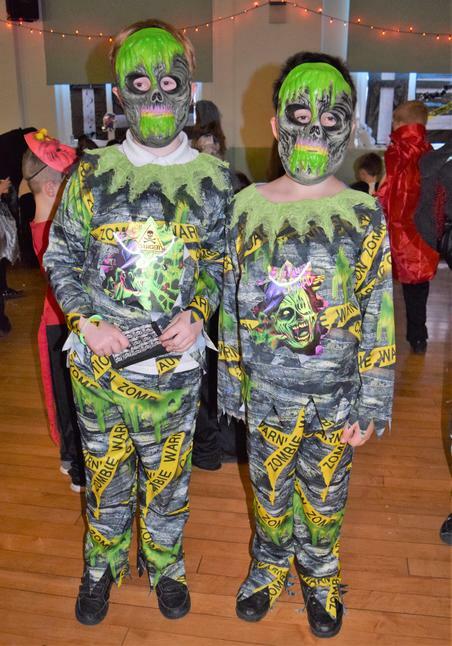 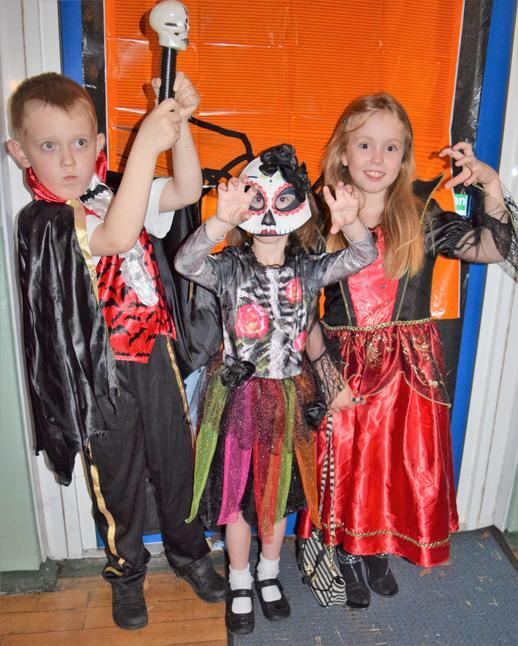 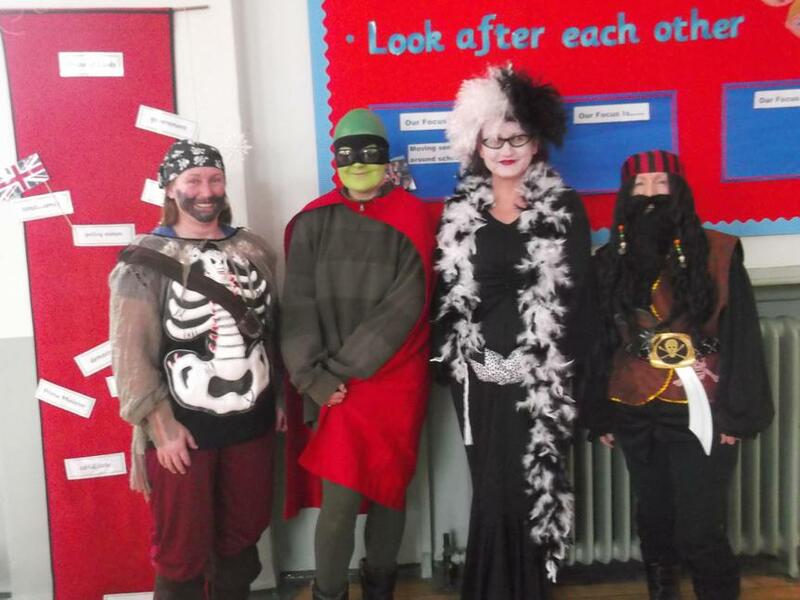 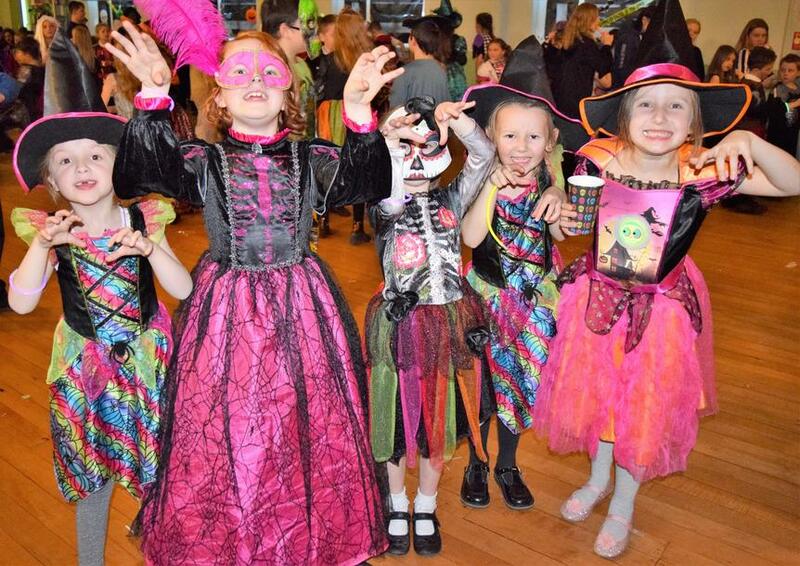 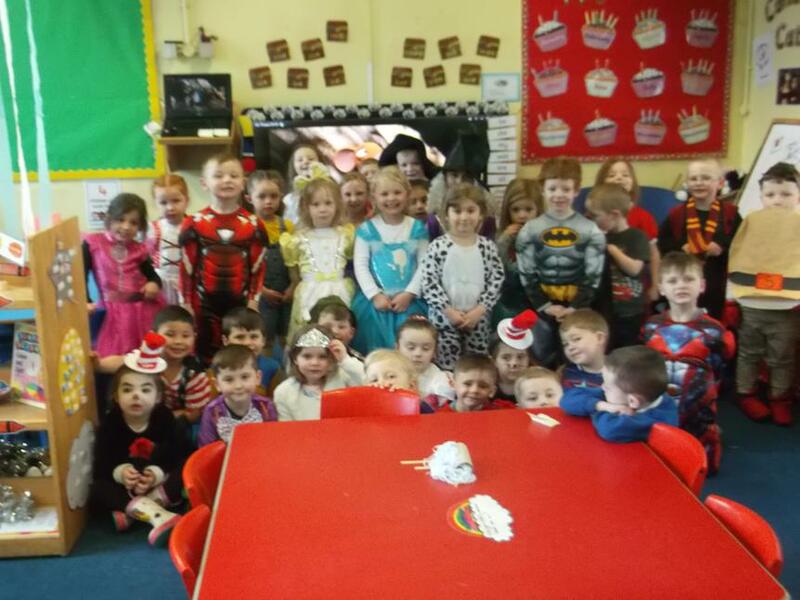 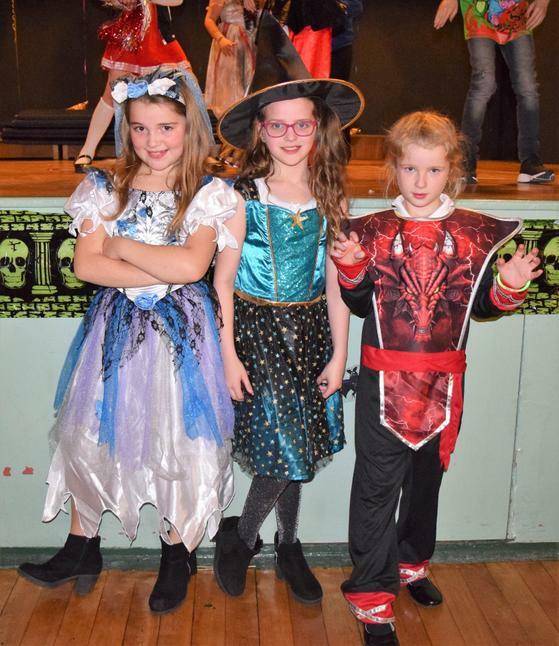 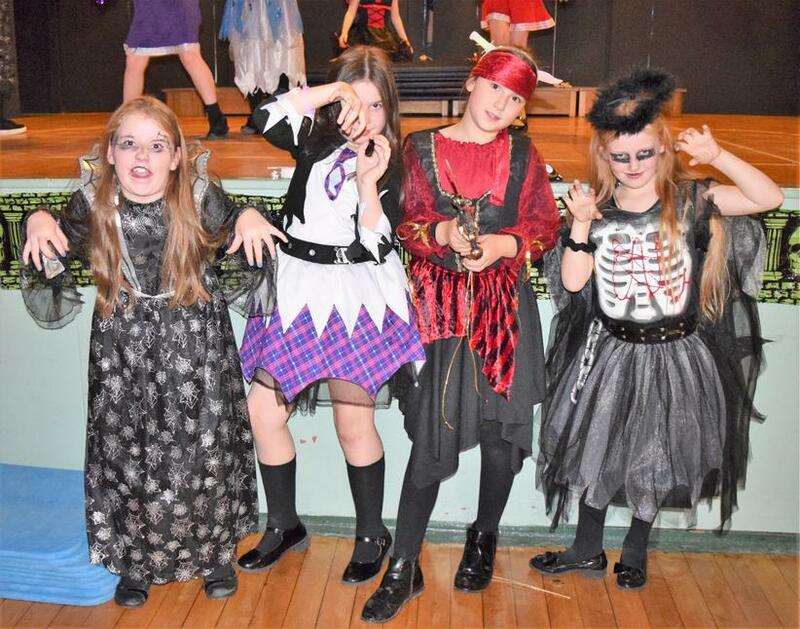 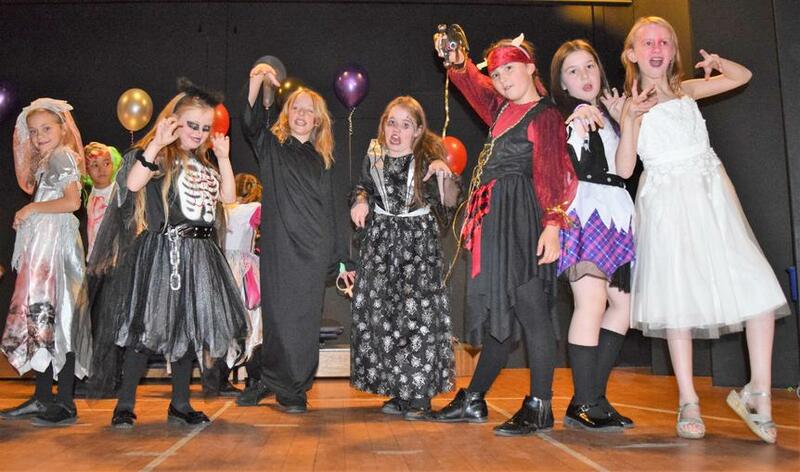 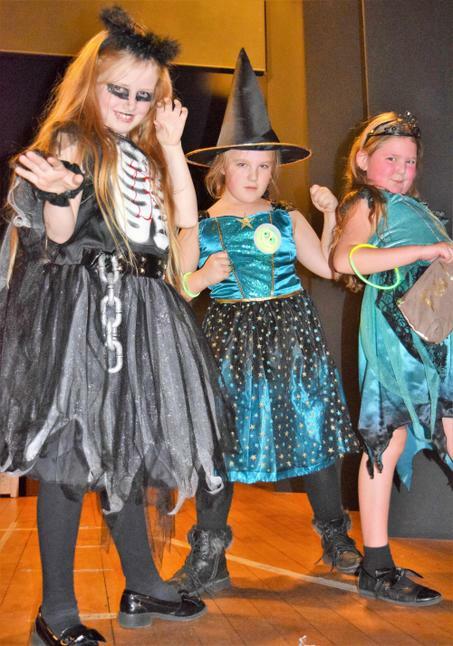 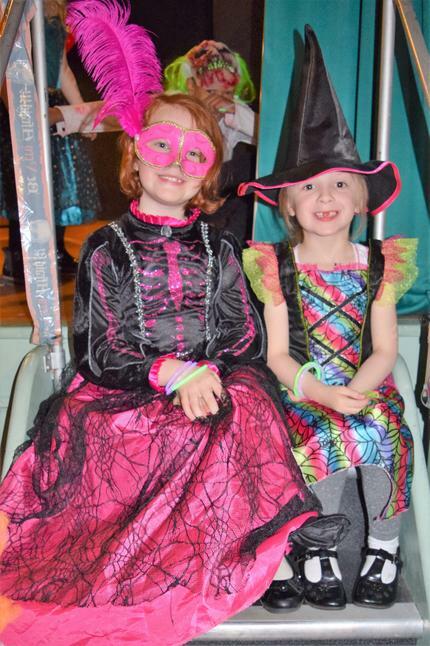 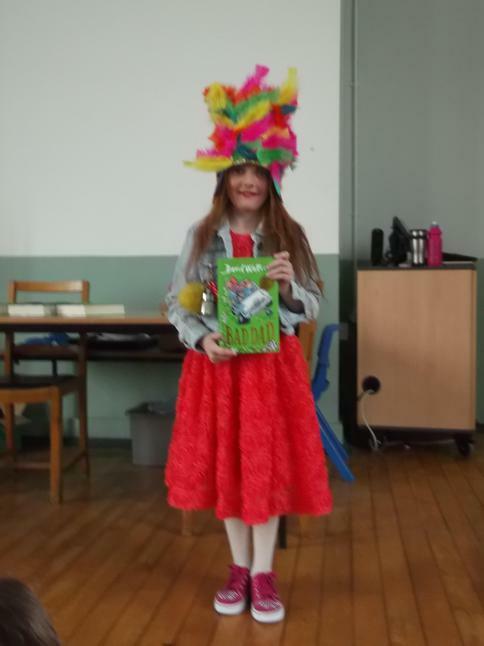 The children, with help from parents, showed their creativity with fantastic costumes. 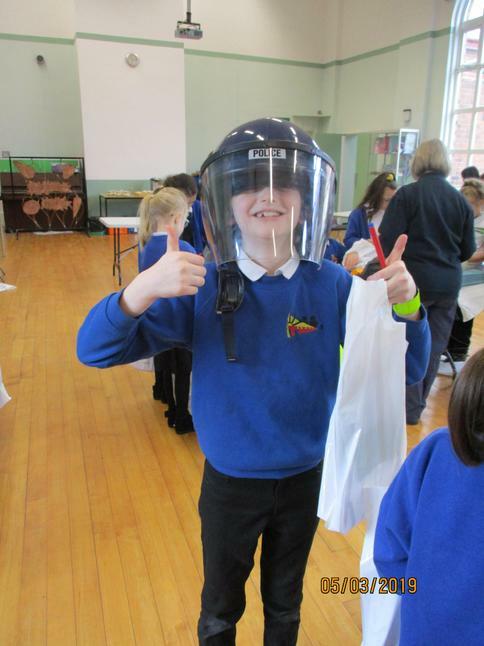 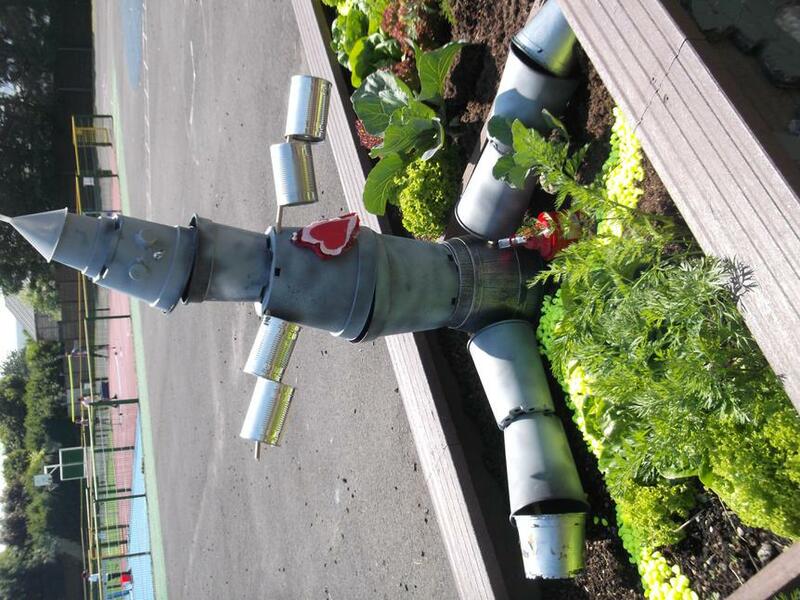 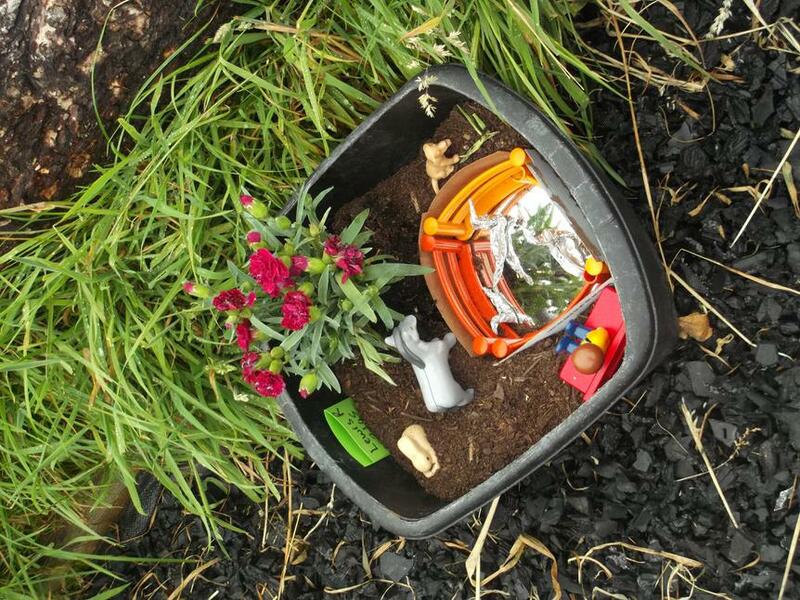 We had astronauts, explorers, botanists, robots, surgeons, nurses, vets and many more. 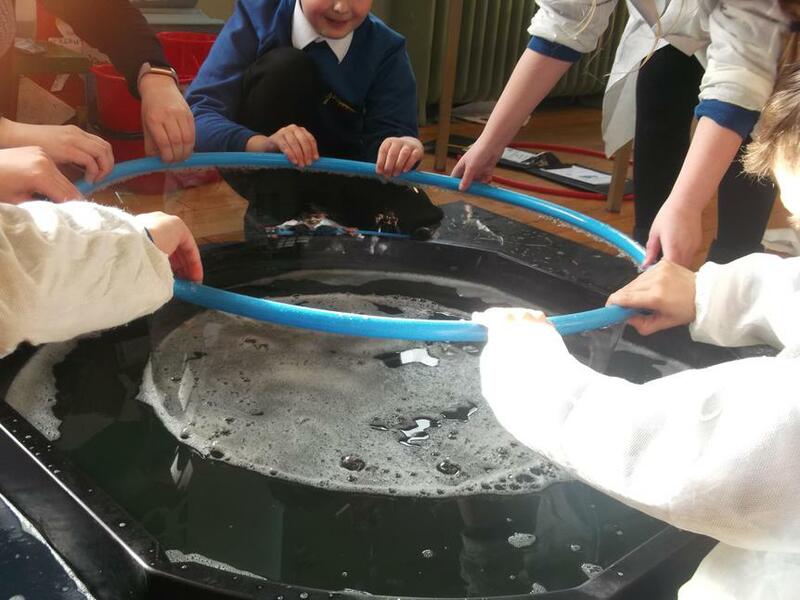 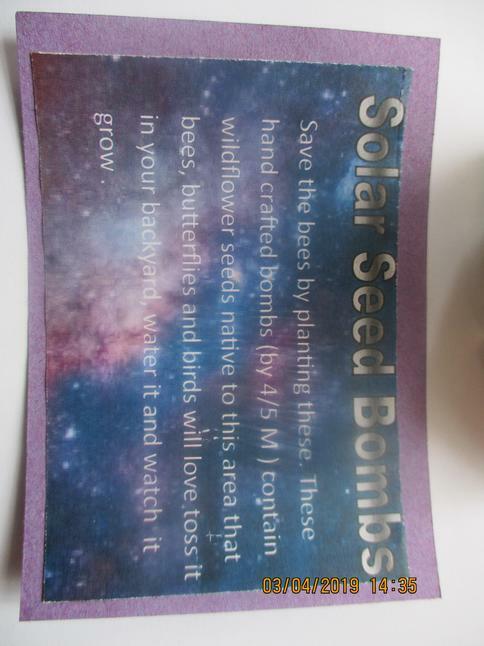 This really helped the children to see the impact of science all around them. 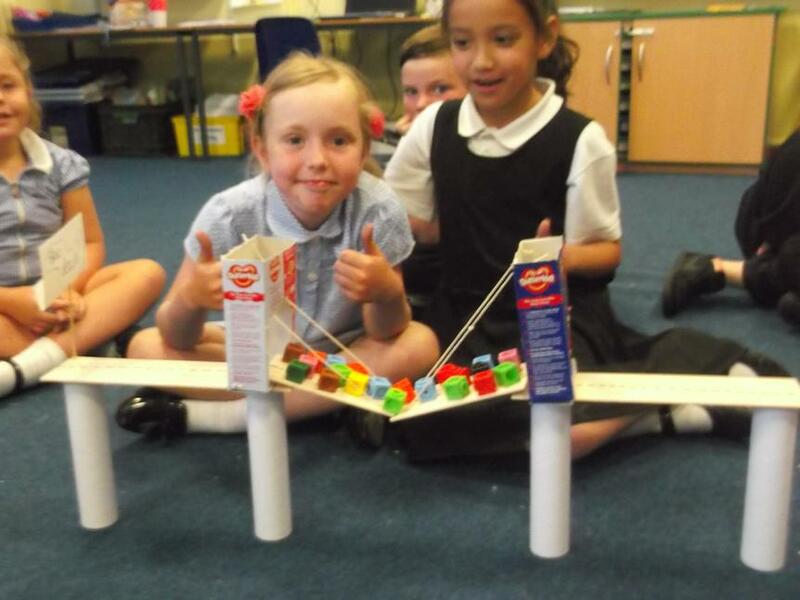 "This is like actual engineering!" 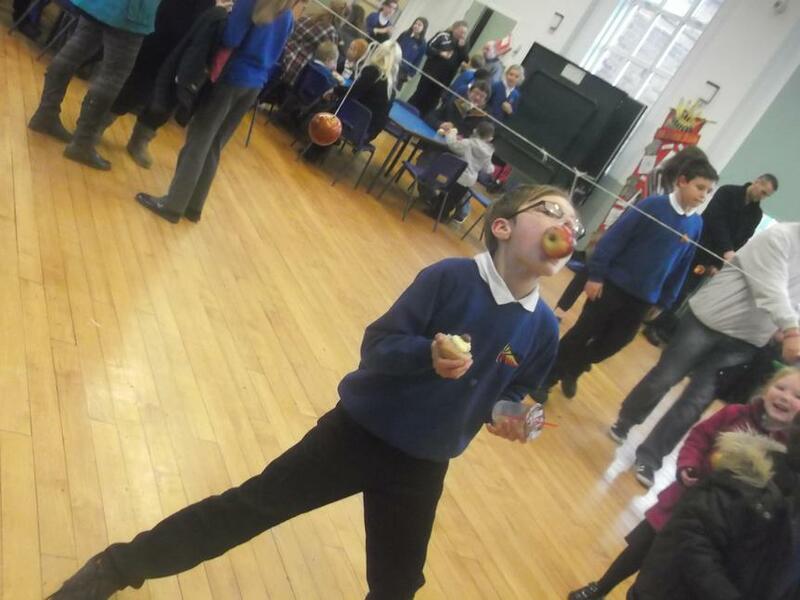 "I've got it! 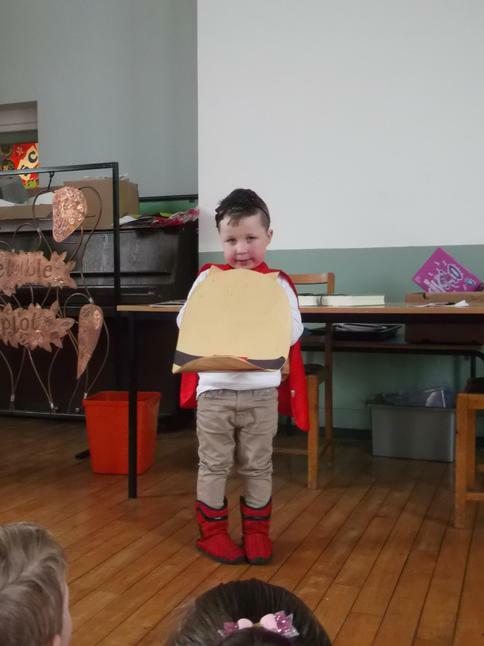 I can do it by myself!" 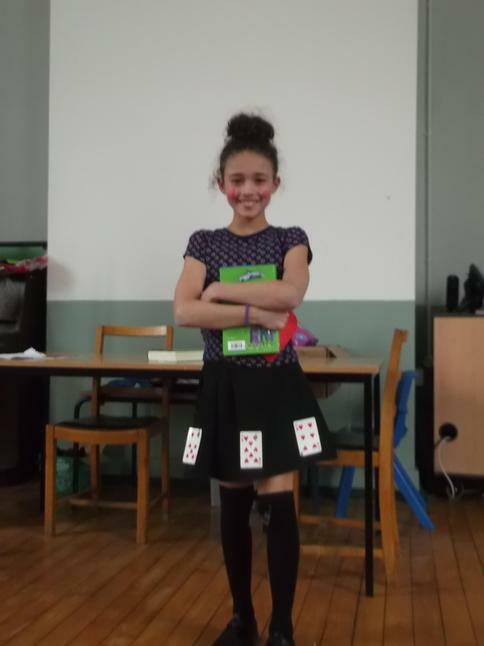 "I can;t believe I actually made it move!" 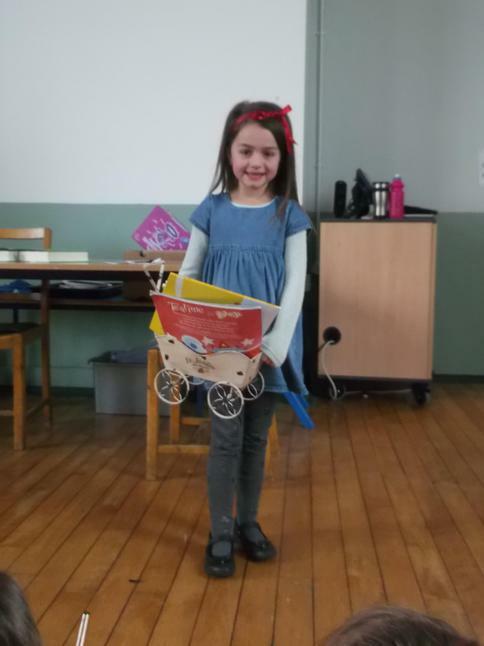 "I'm putting this on my Christmas list!" 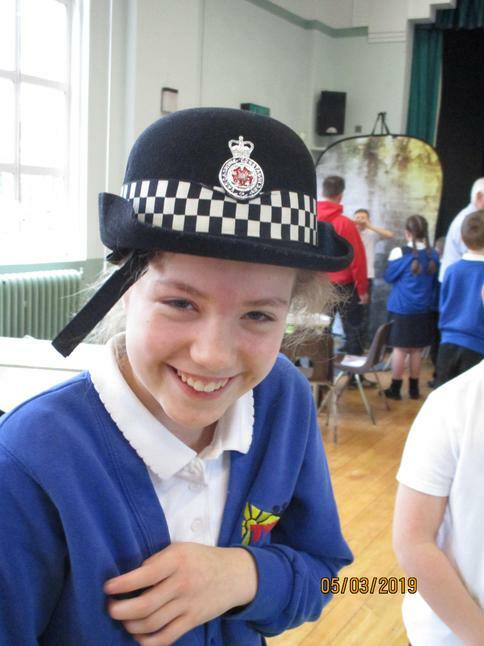 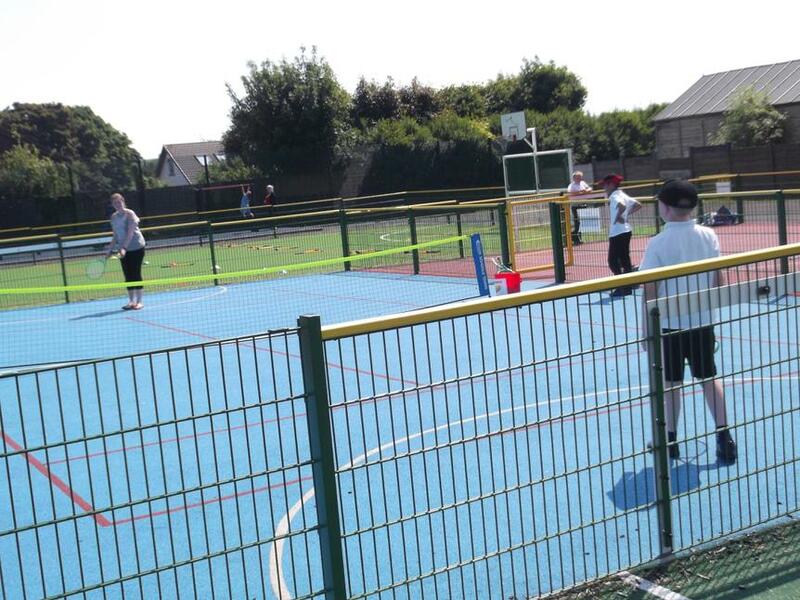 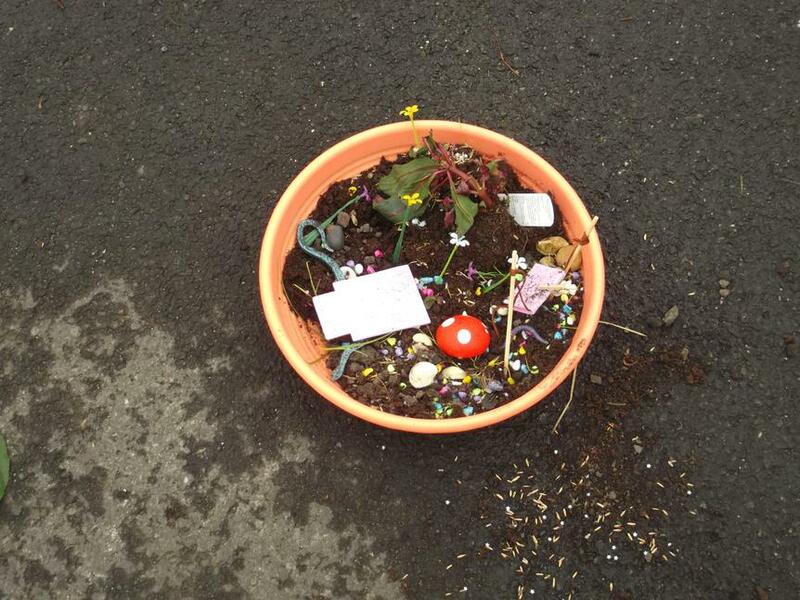 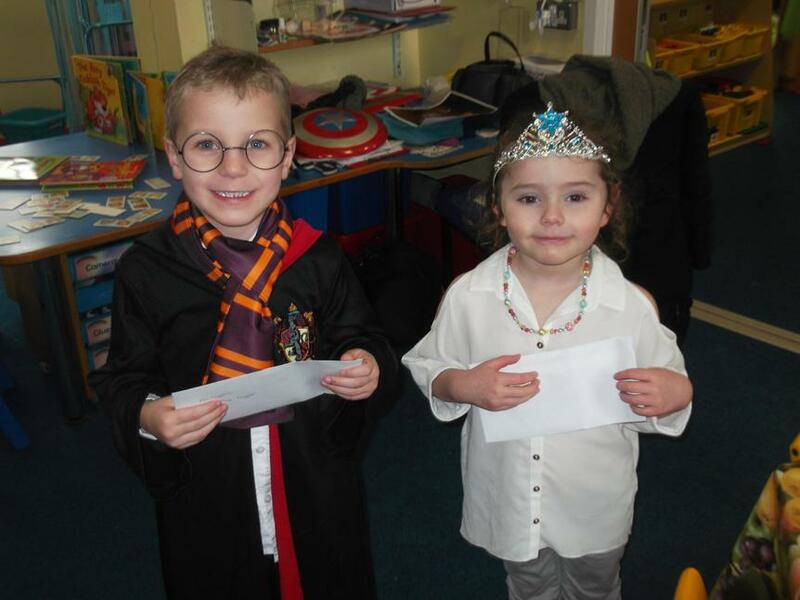 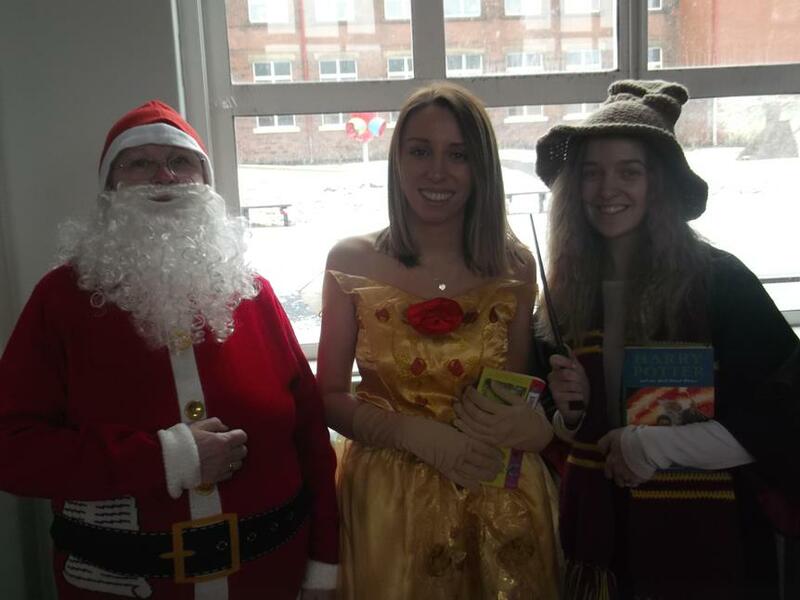 from each class received a prize, see them below and lots of other photographs from the day. 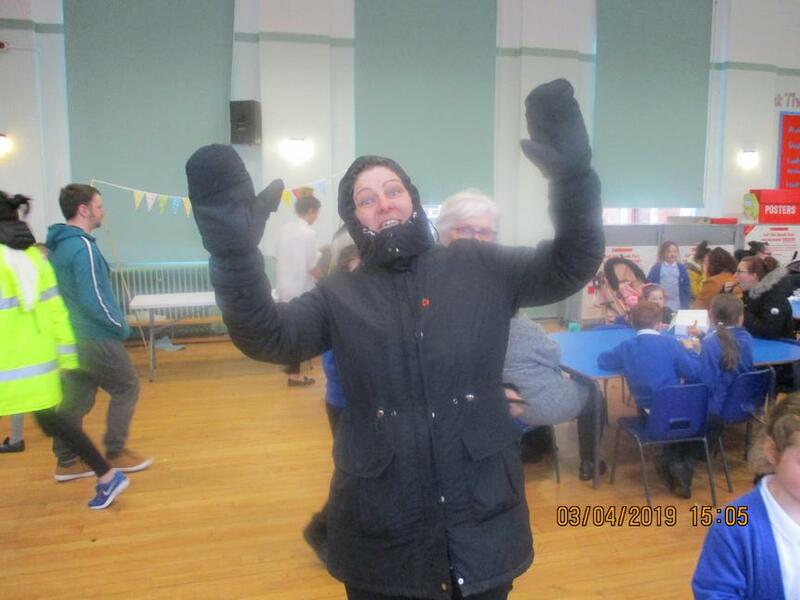 The snow may have nearly gone but we have lots of memories of the fun we had! 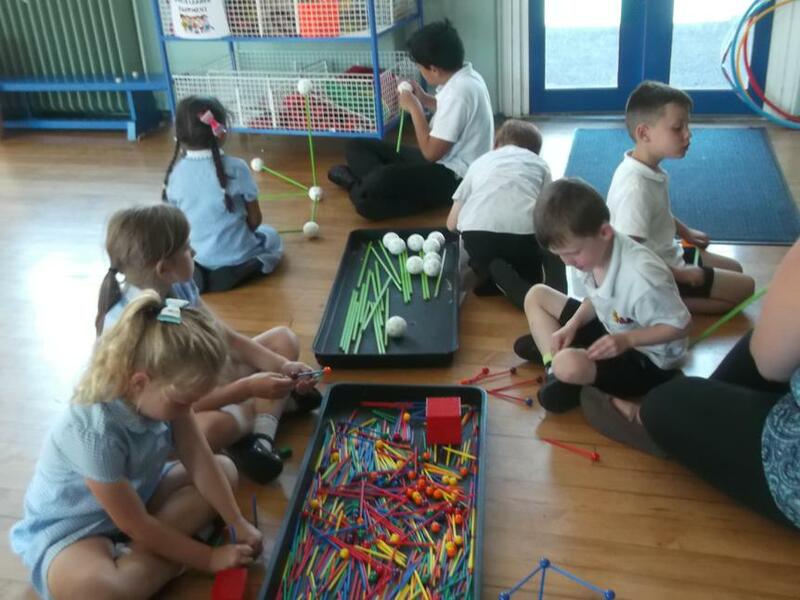 We thoroughly enjoyed building snowmen, dens, igloos, snow sculptures and even snow trolls! 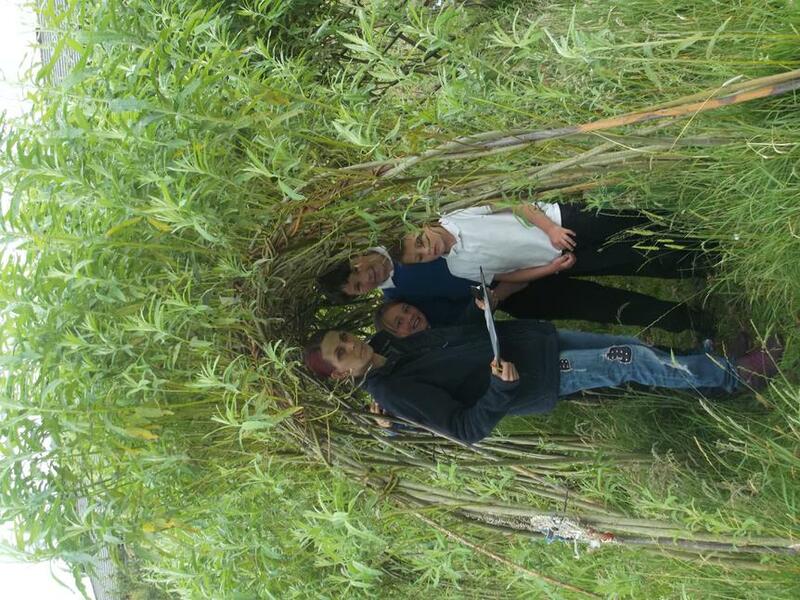 Each class designed their own den or igloo. 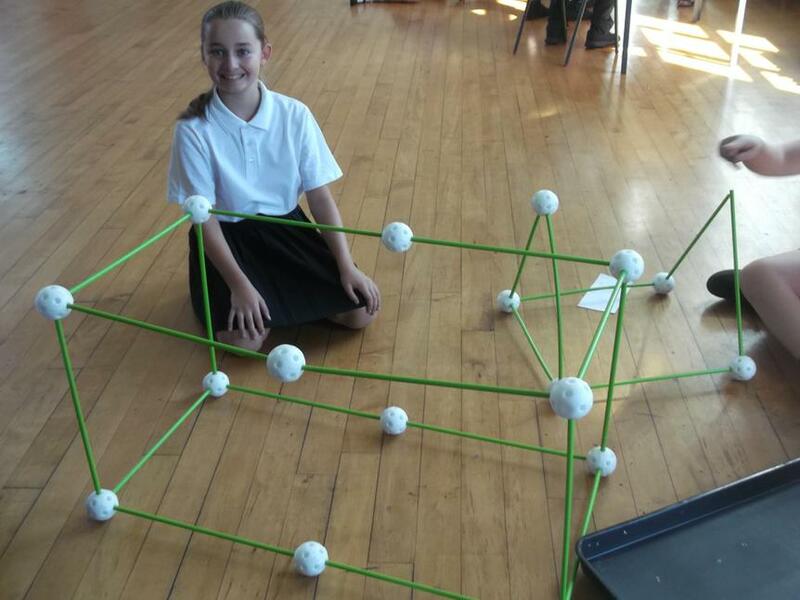 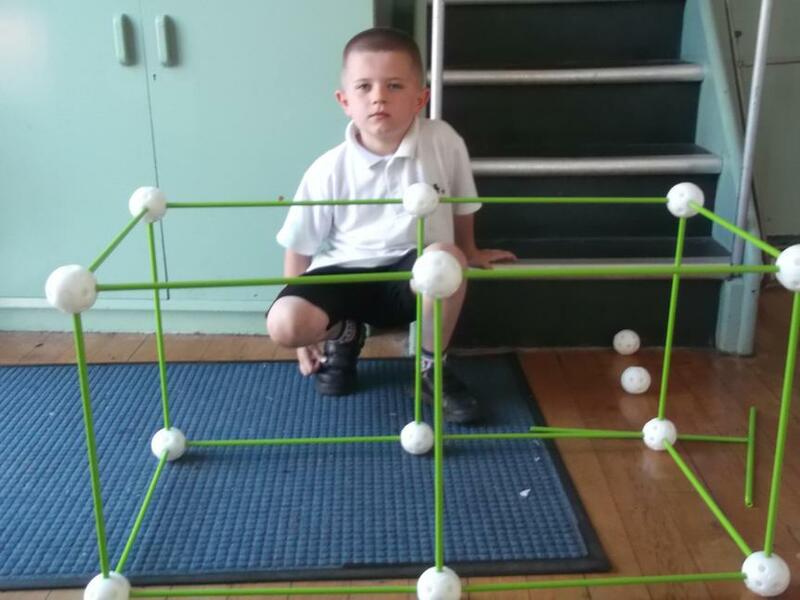 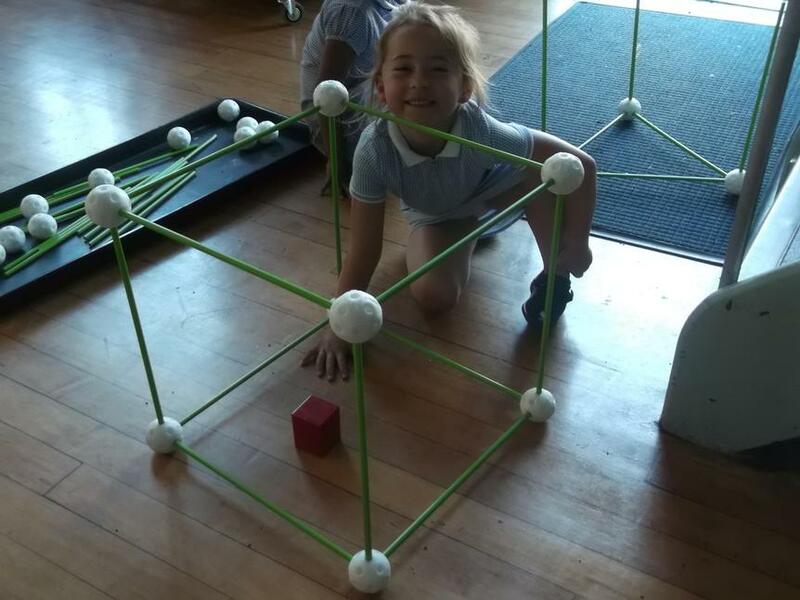 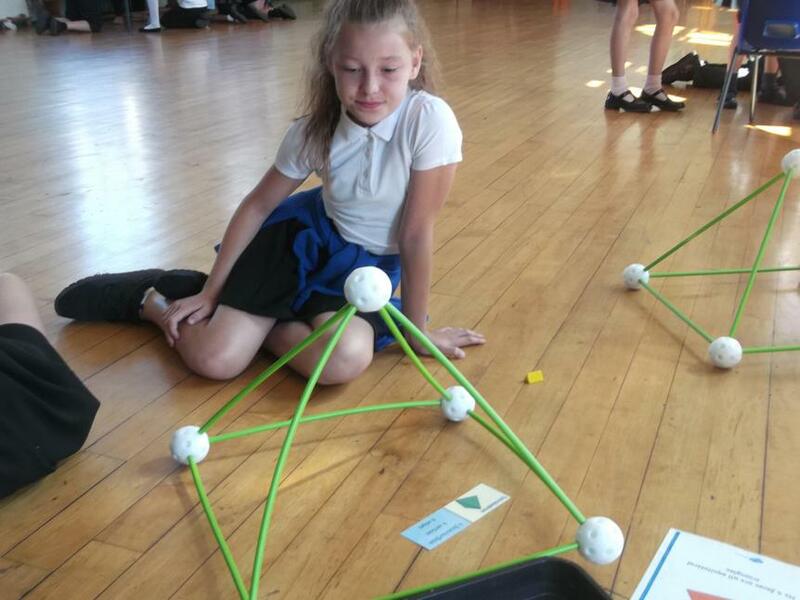 Miss Riding and her class had an ambitious design for their igloo which was large enough to hold the whole class! 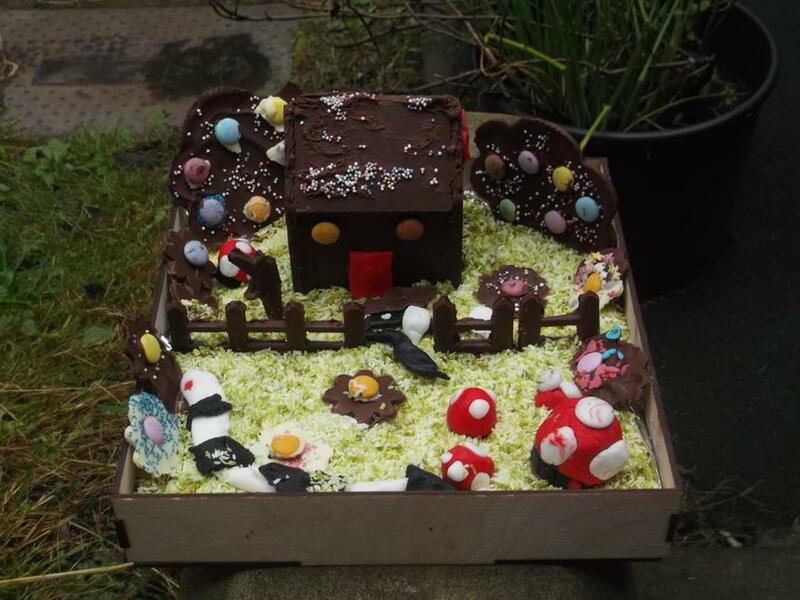 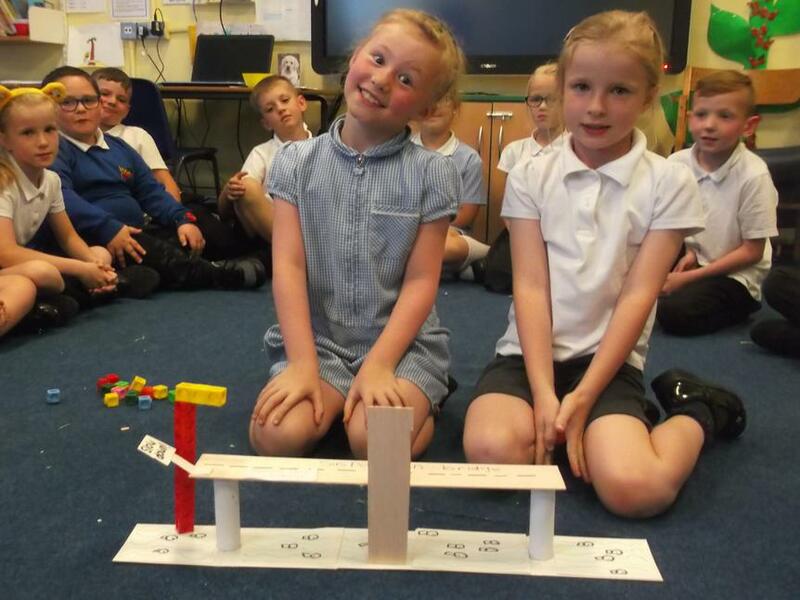 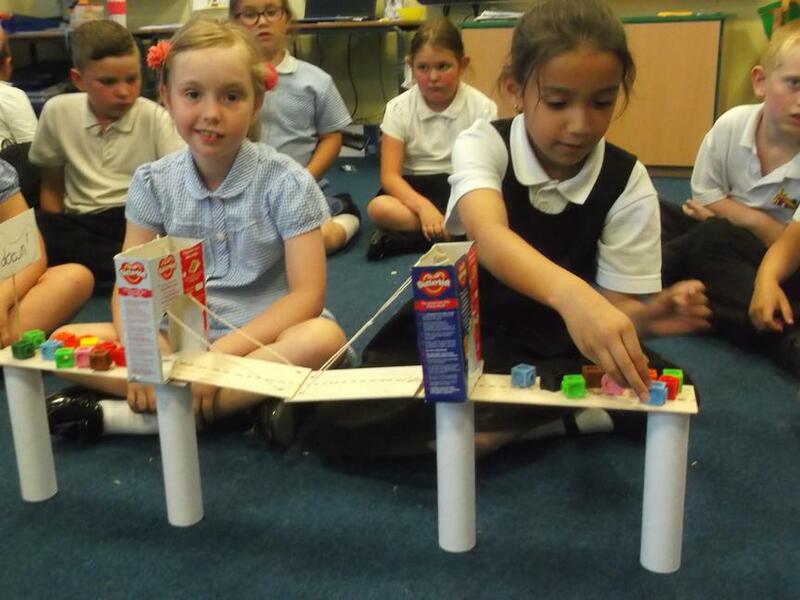 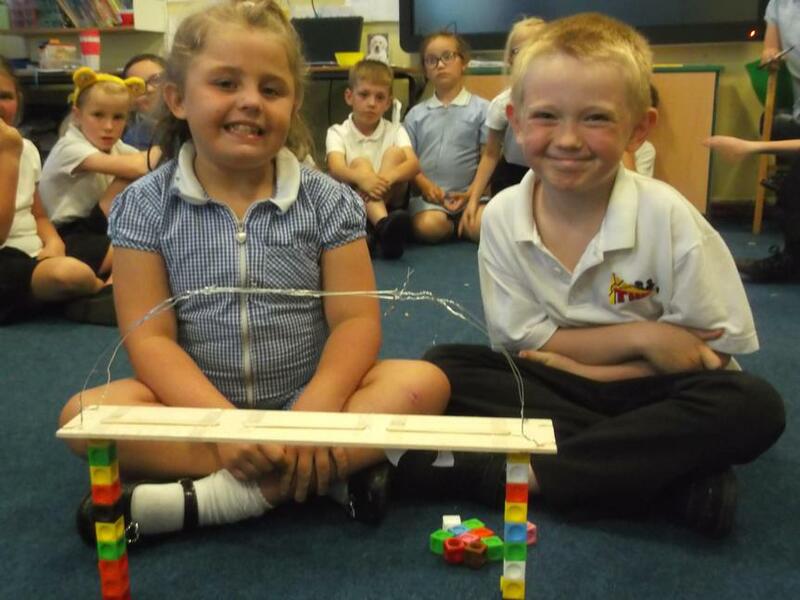 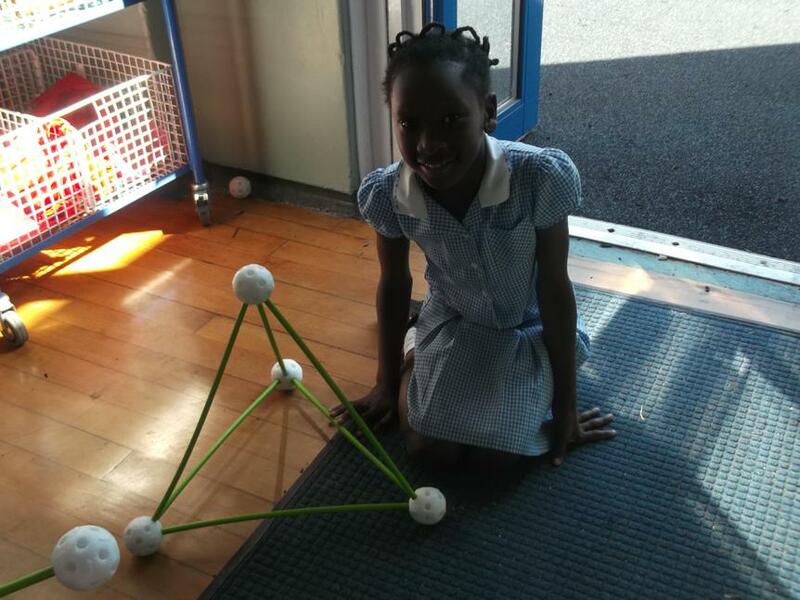 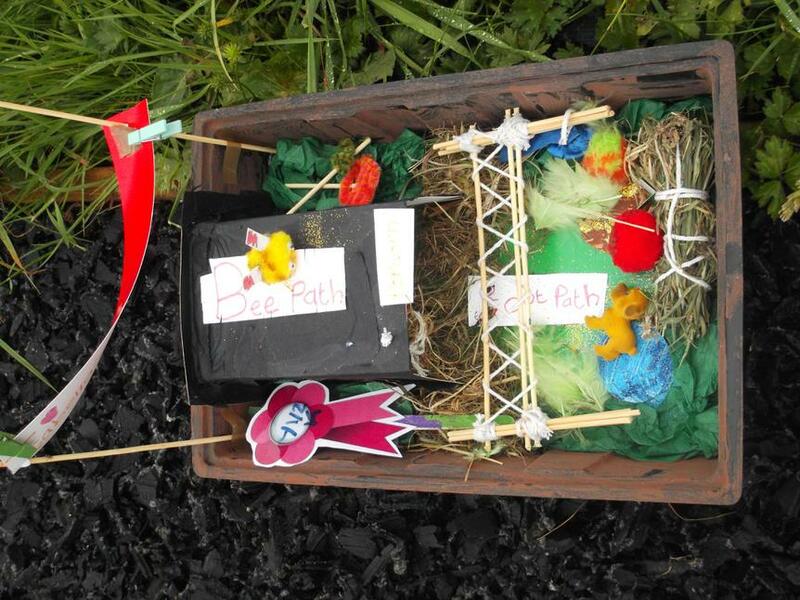 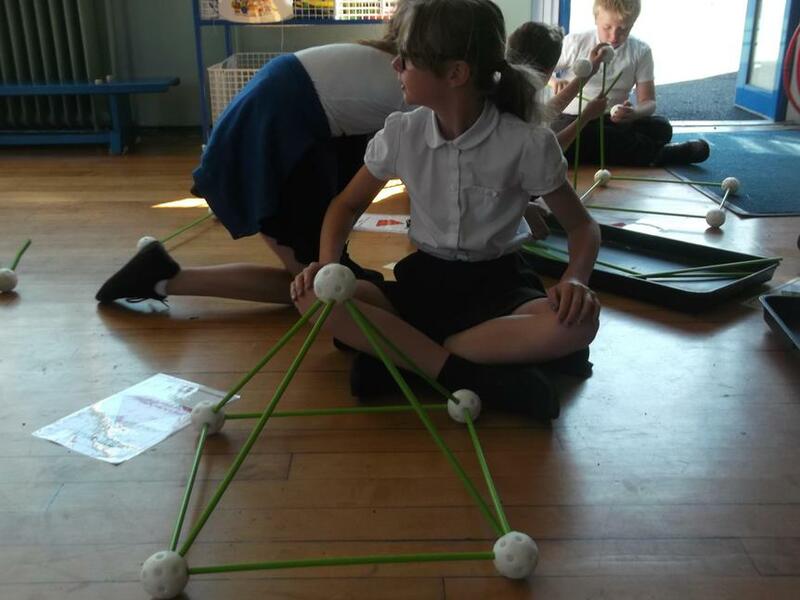 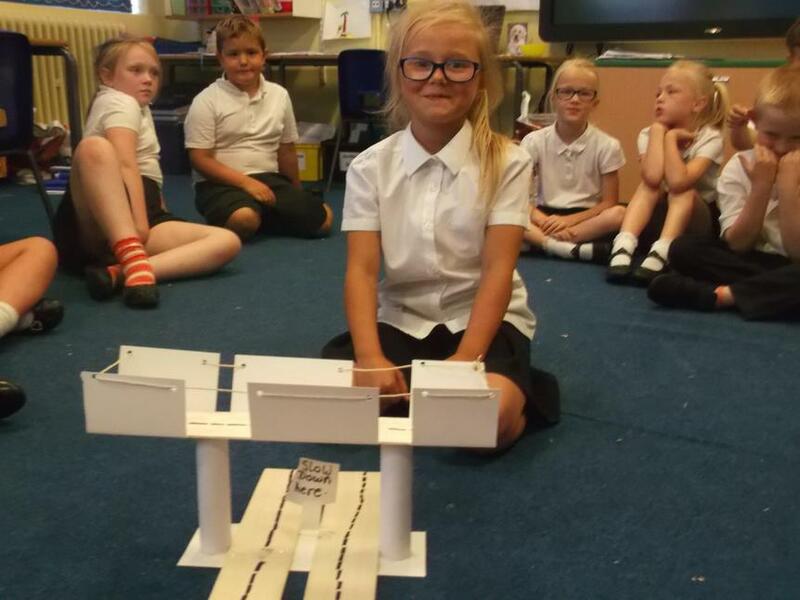 Miss Tierney's class did really well and nearly managed to complete their roof. 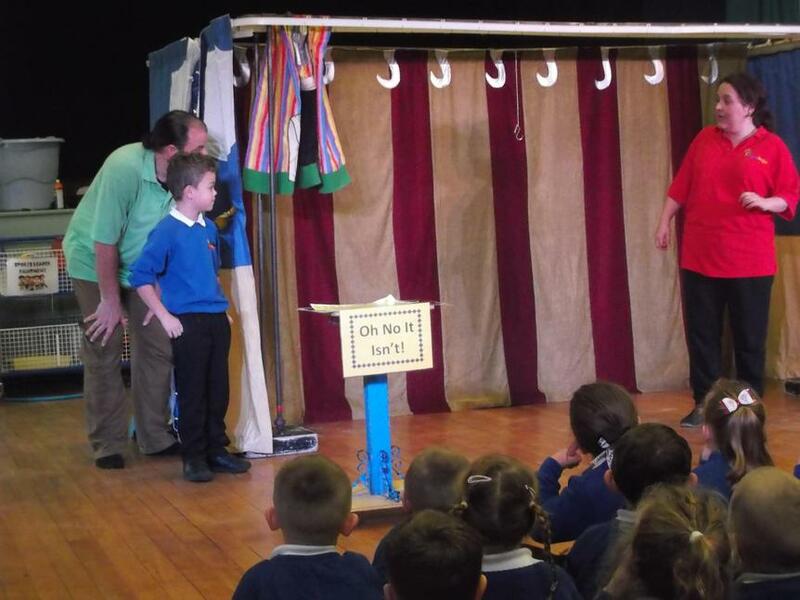 It's all been very exciting! 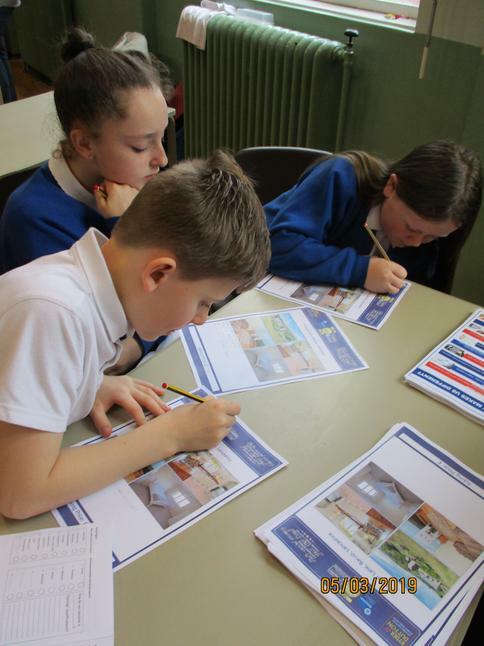 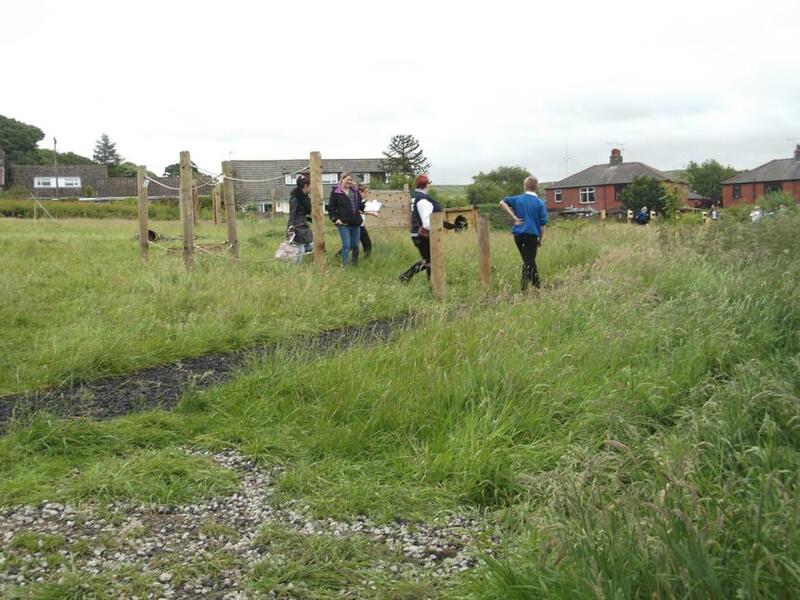 As you can see from the photos... We worked really hard and the results were fantastic! 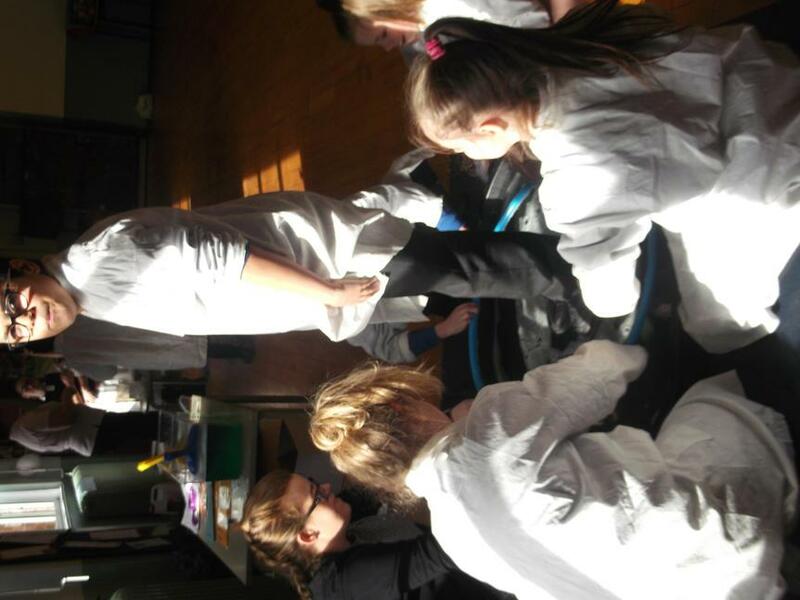 See if you can work out which teacher is making a Snow Angel!